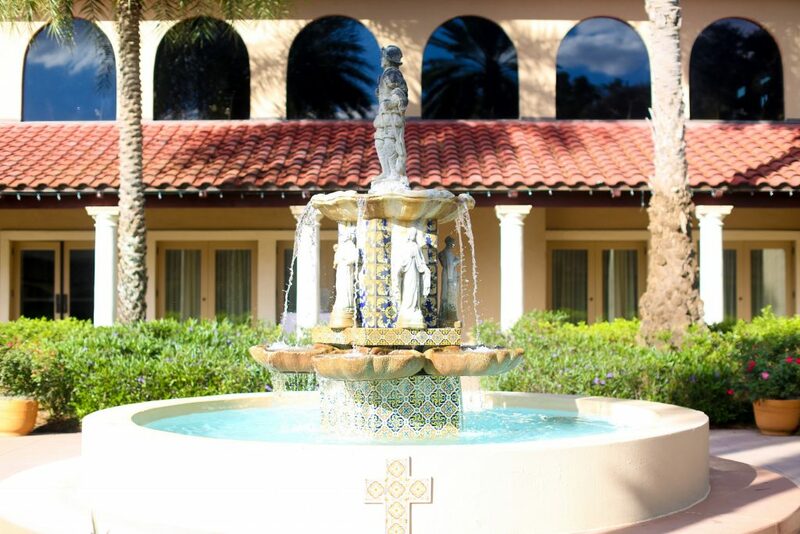 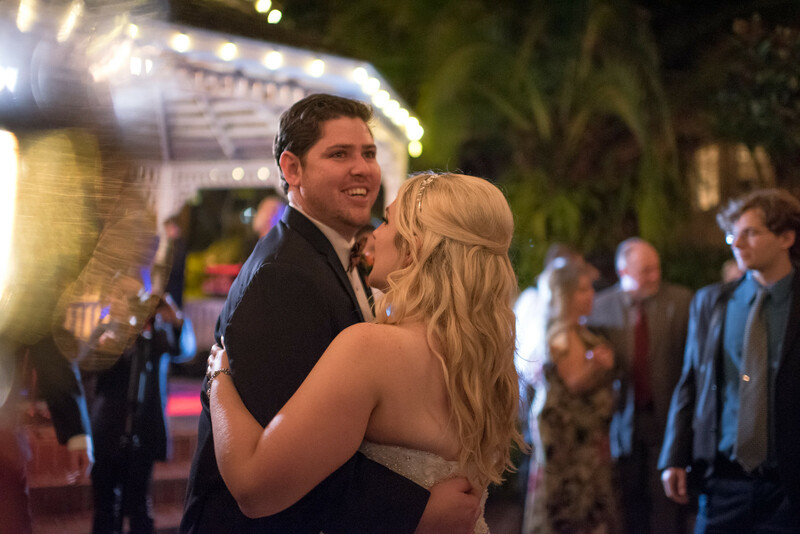 Today’s blog post brings us to January of 2016, with the wedding of Kimberly and Ryan at Mission Inn Resort. 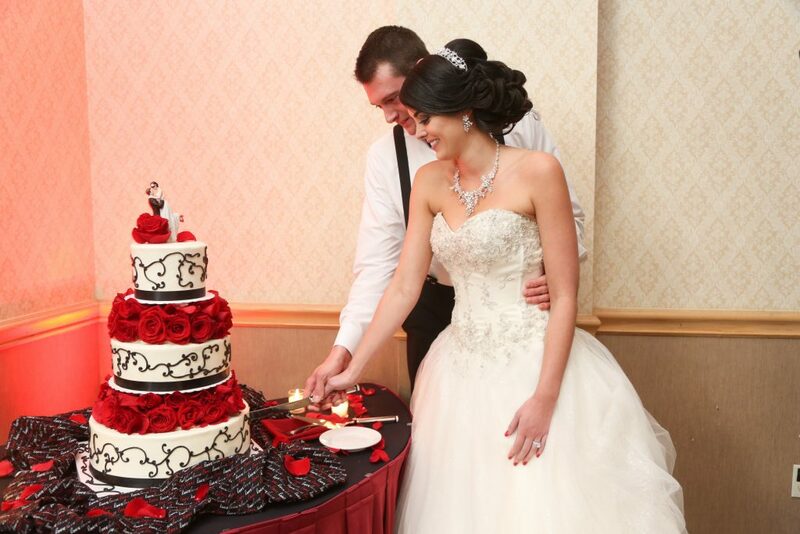 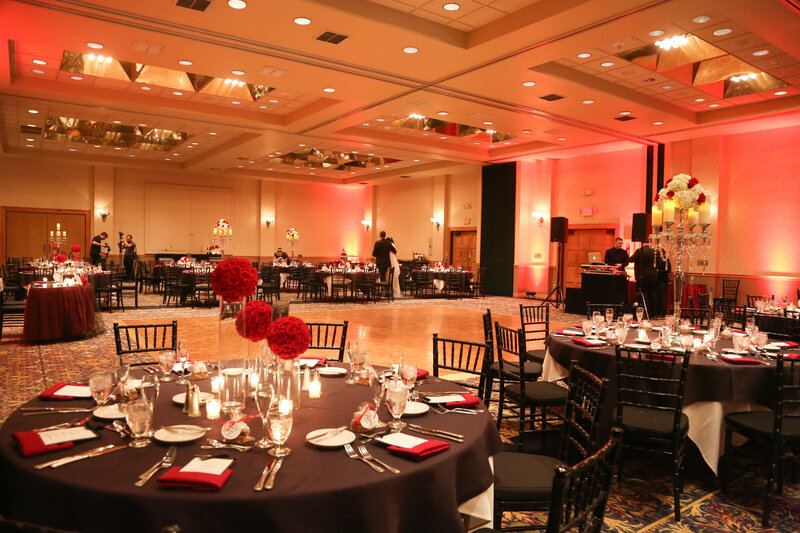 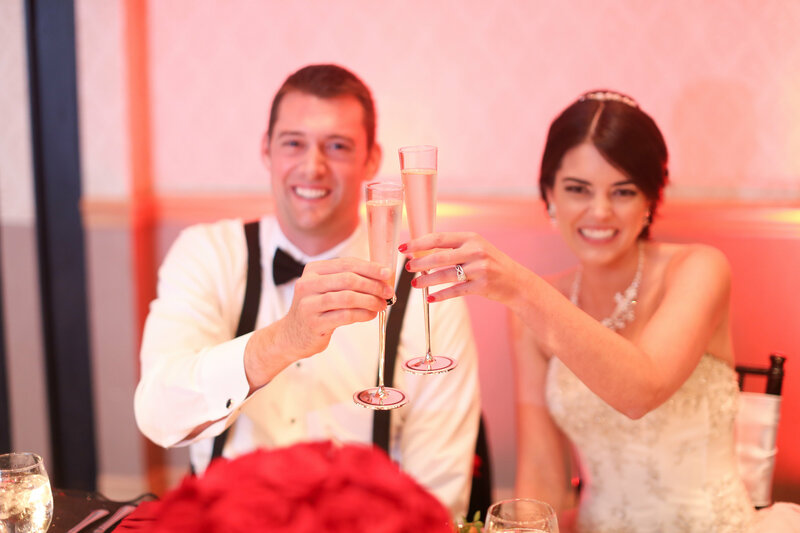 This couple chose a black & red color scheme, in a classic wedding style. 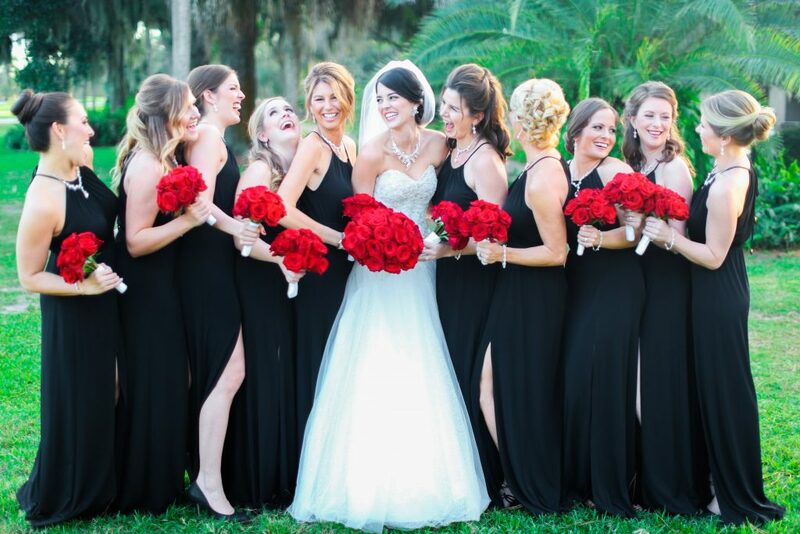 Red roses abounded at both the ceremony and reception, and the bride mixed things up with black bridesmaid dresses. 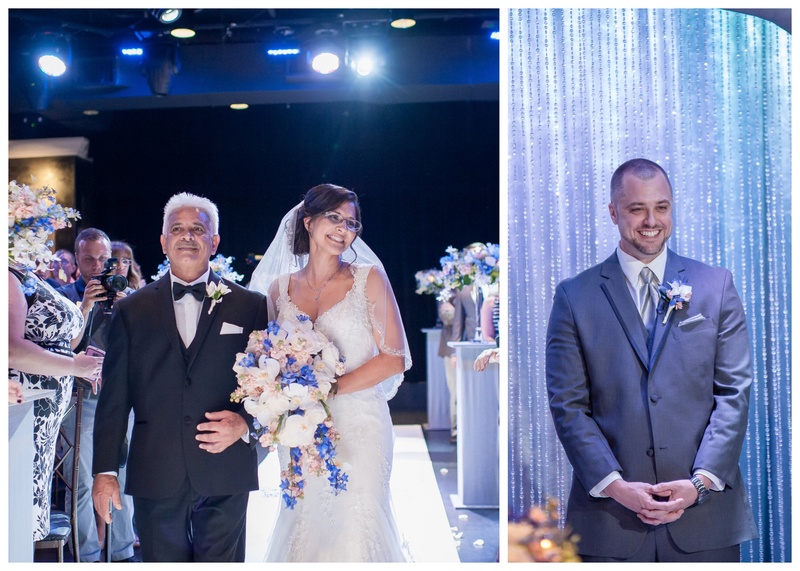 We had a wonderful time bringing their vision to life, and thanks to Wings of Glory Photography, would love to share their special day with you. 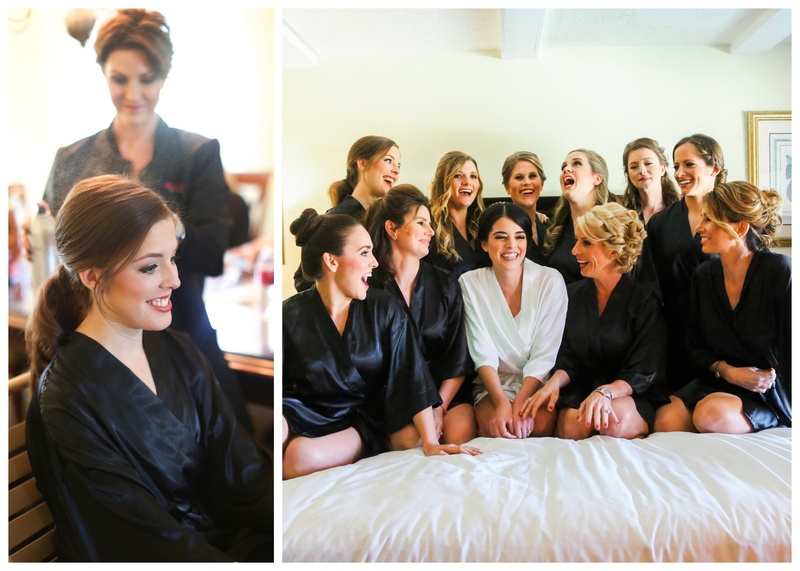 The bride and her bridesmaids got ready together with the help of hair and make-up artists from About Face Design Team. 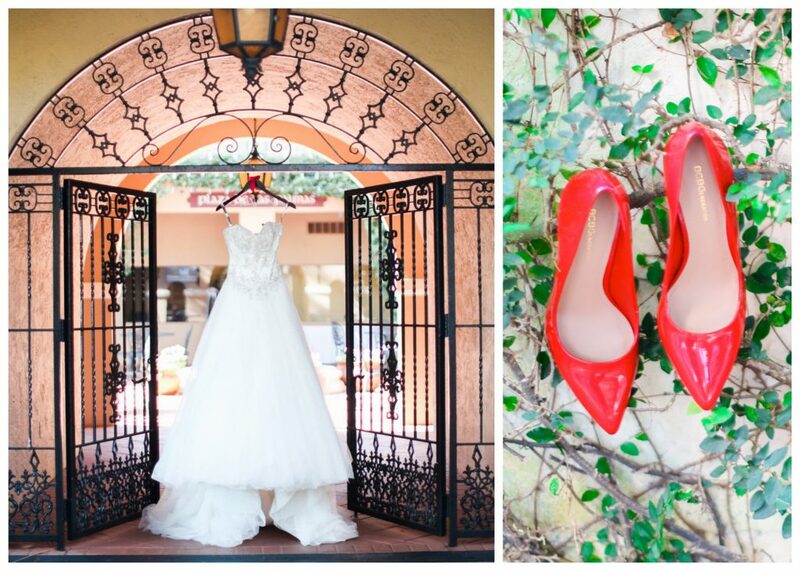 Kimberly paired a gorgeous white gown with a pair of vibrant red shoes from BCBGMaxAzria. 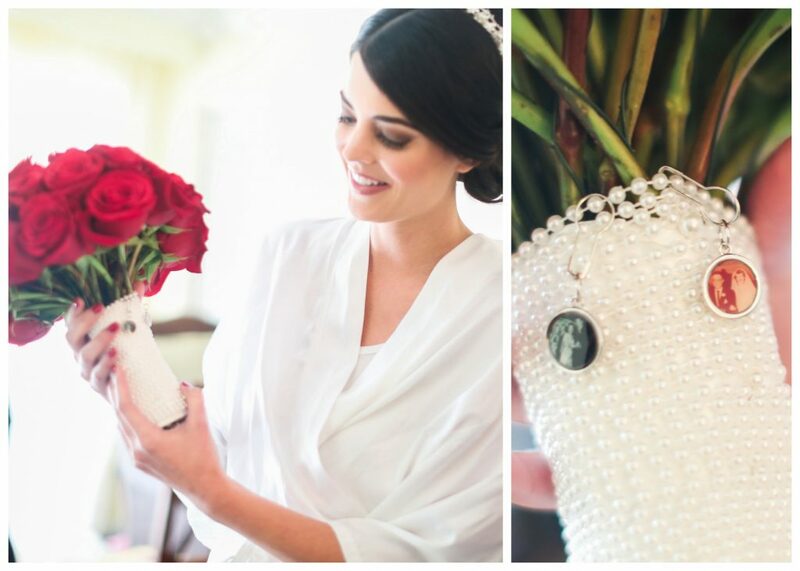 Her lovely bouquet of red roses, designed by Lee Forrest Design, featured pinned-on charms with pictures of her grandparents, a beautiful touch. 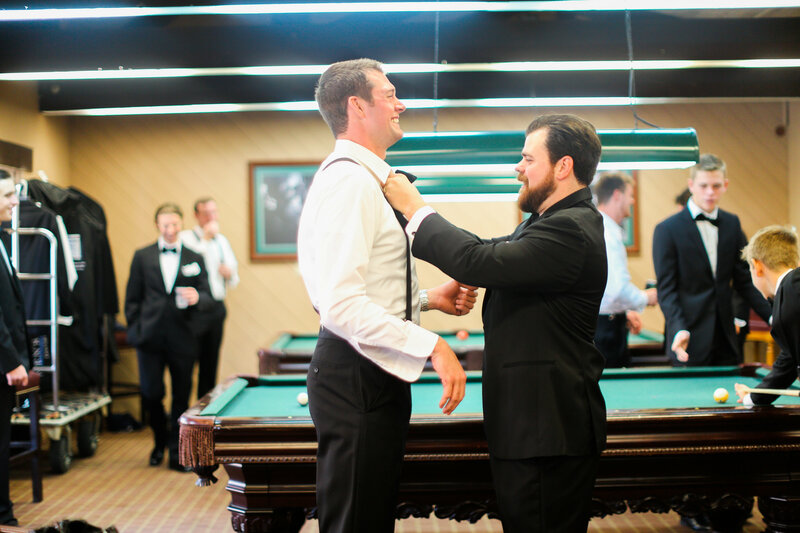 As the ladies continued to help Kimberly into her dress and veil, the gentlemen got ready for the big day in a pool hall. 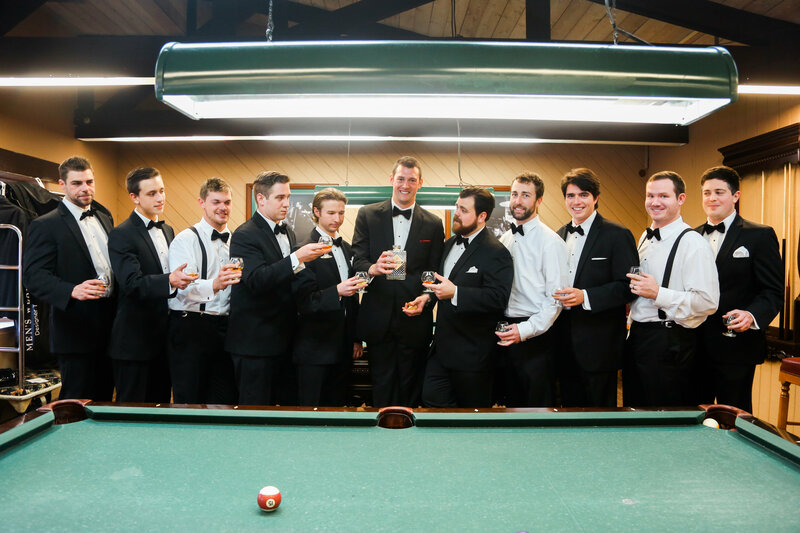 The gentlemen got ready together surrounded by pool tables and bourbon whiskey. 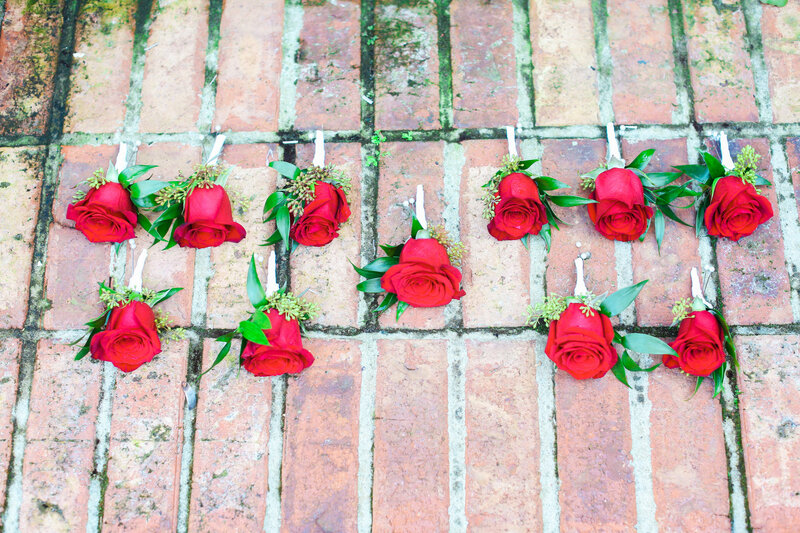 They each wore red rose boutonnieres, designed by Lee Forest Design. 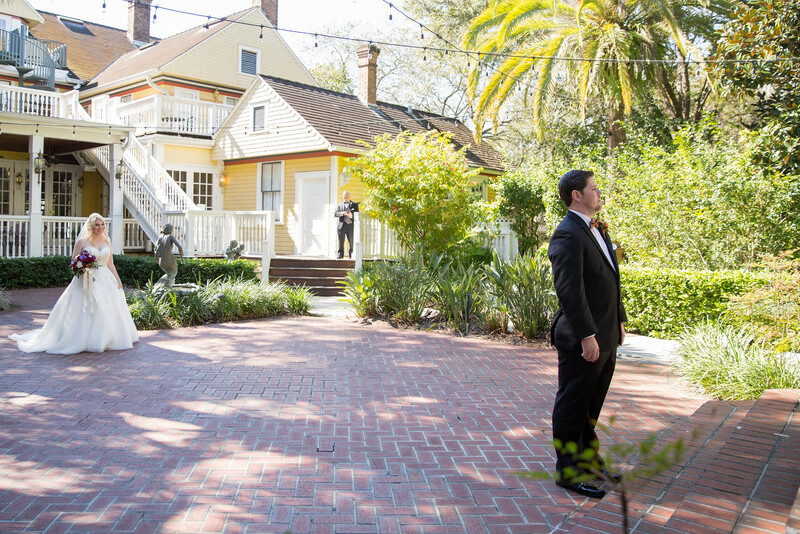 A very fun idea came in the form of the ringer bearer’s outfit – the bride and groom had him dress as a secret agent, with a metal box for the ring and even an FBI-style earpiece. 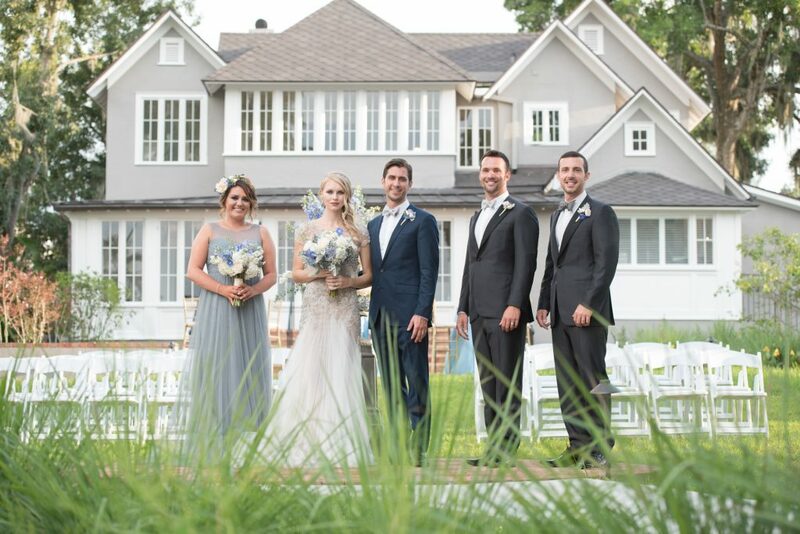 All dressed up and ready to go, the wedding party made their way to the outdoor ceremony area. 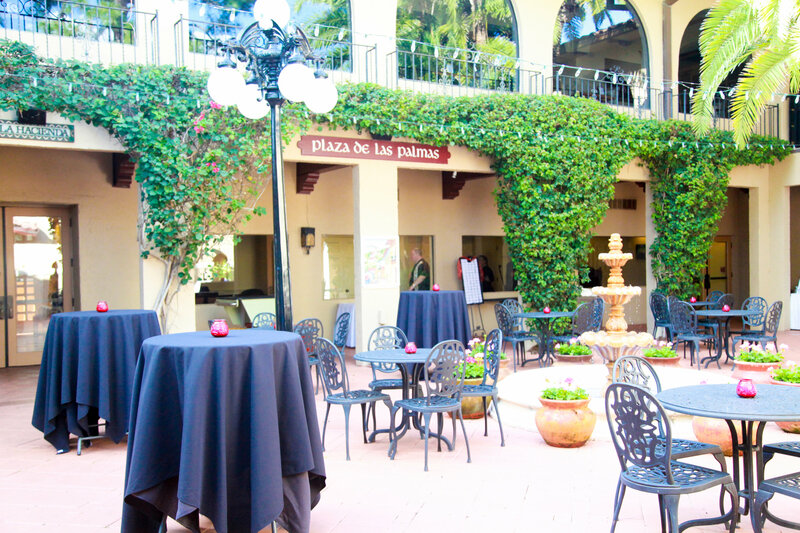 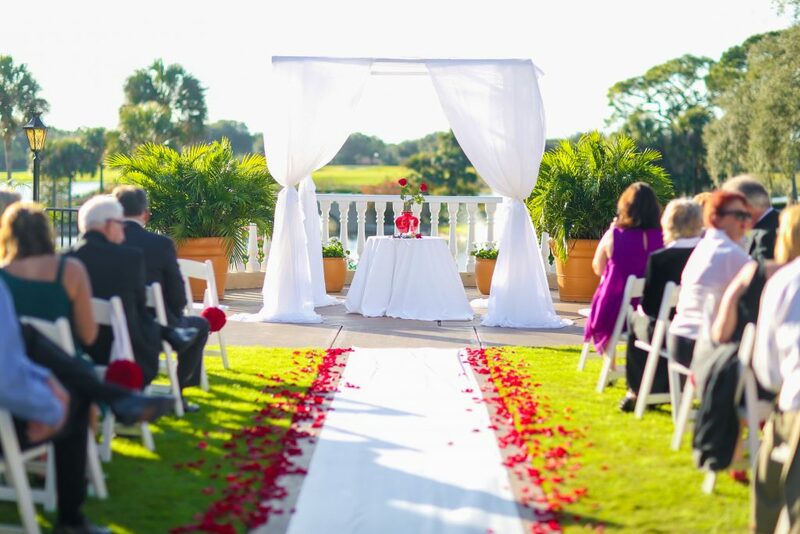 The beautiful outdoor patio at Mission Inn Resort was decorated for a classic ceremony – the aisle runner was white, with red rose petals scattered along the edges. 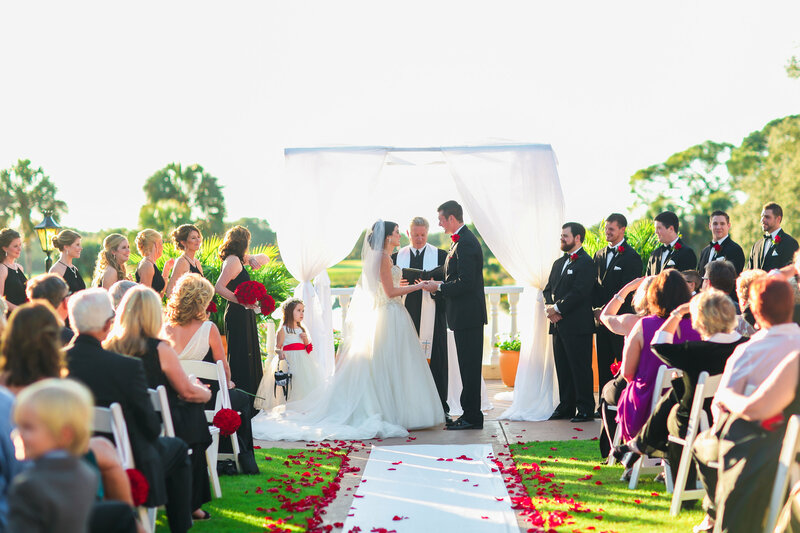 The wedding arbor was draped in white fabric, with a table featuring a vase of red roses underneath. 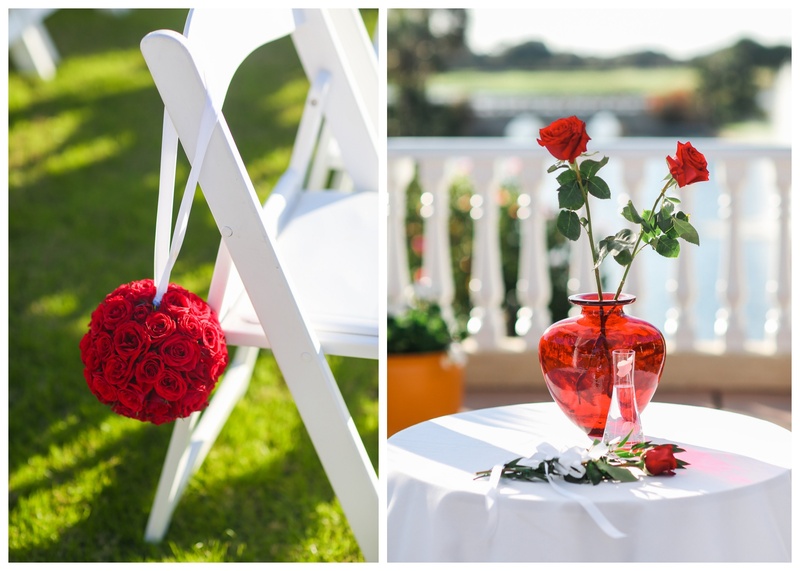 Balls made of red roses were also hung from some of the chairs on the aisle. 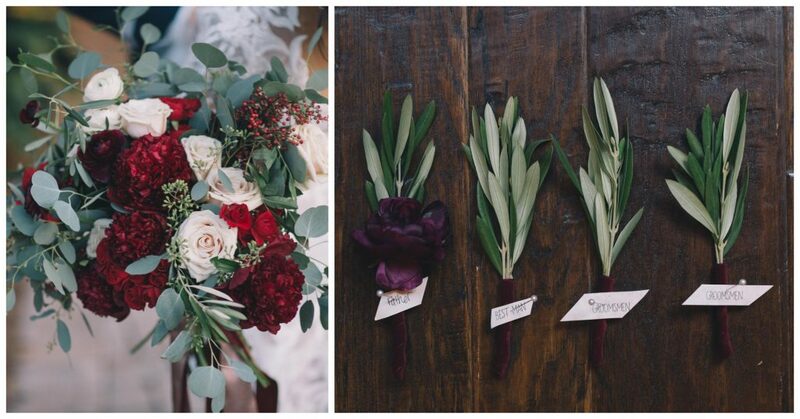 Everywhere you looked, there were accents of red roses. 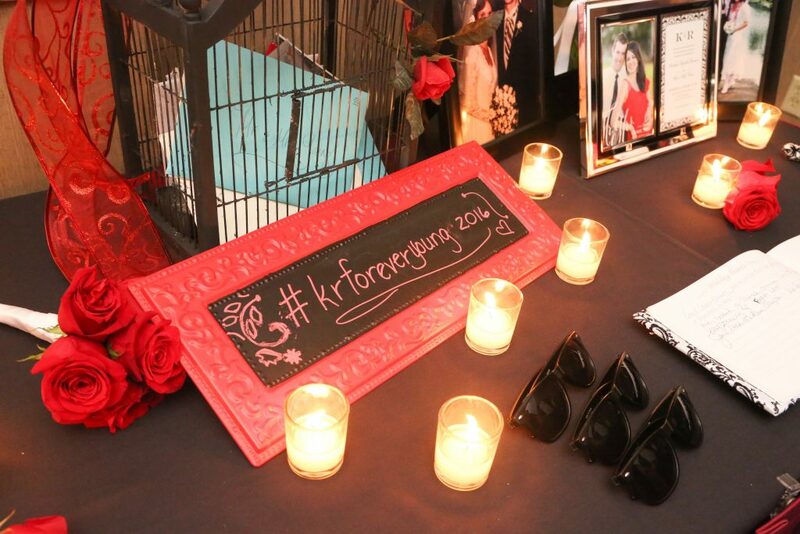 As guests entered, a table held programs and sunglasses for each of them, to help with the abundant sunlight outside. 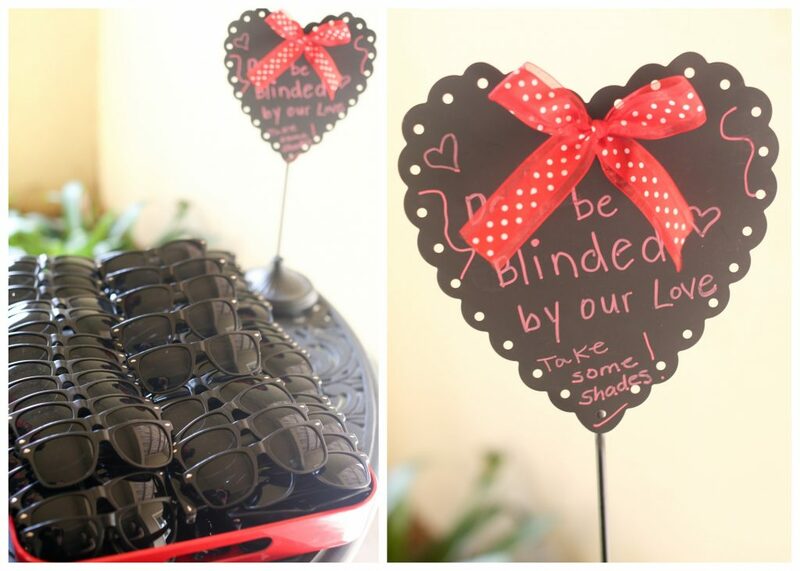 In a cute touch, a sign read “Don’t get blinded by our love”. 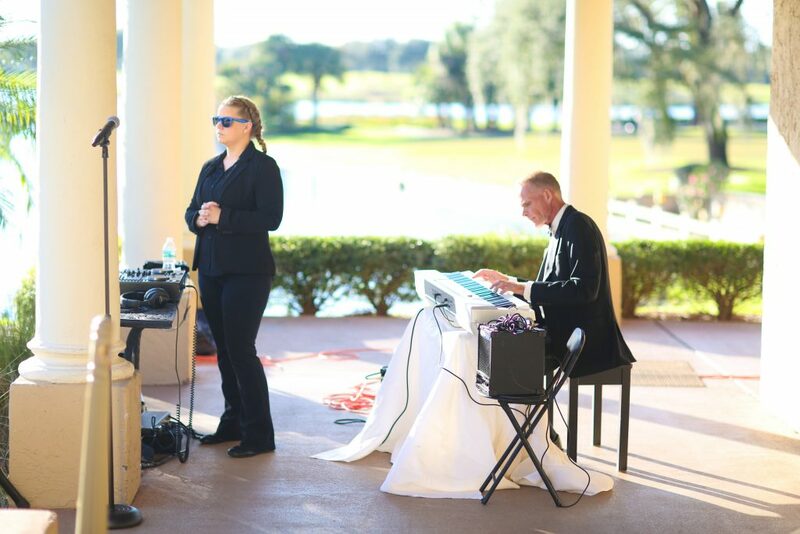 At last, the ceremony began, with piano played by Spess Neblett. 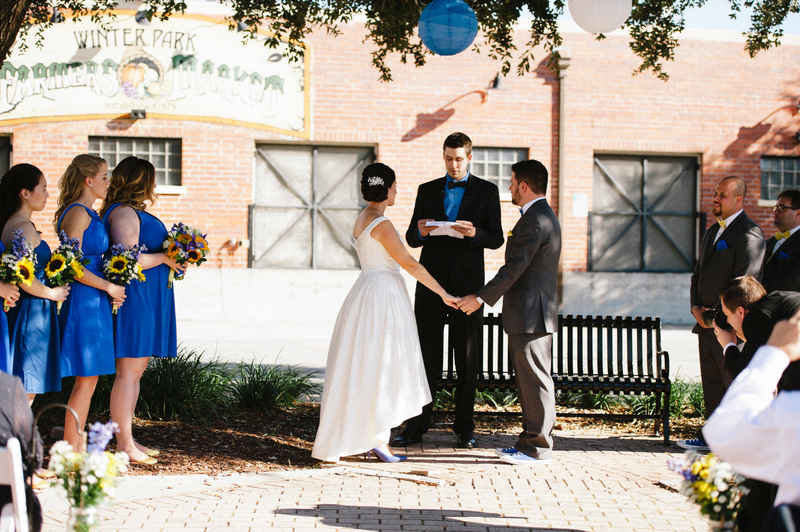 The ceremony began at 4:30pm. 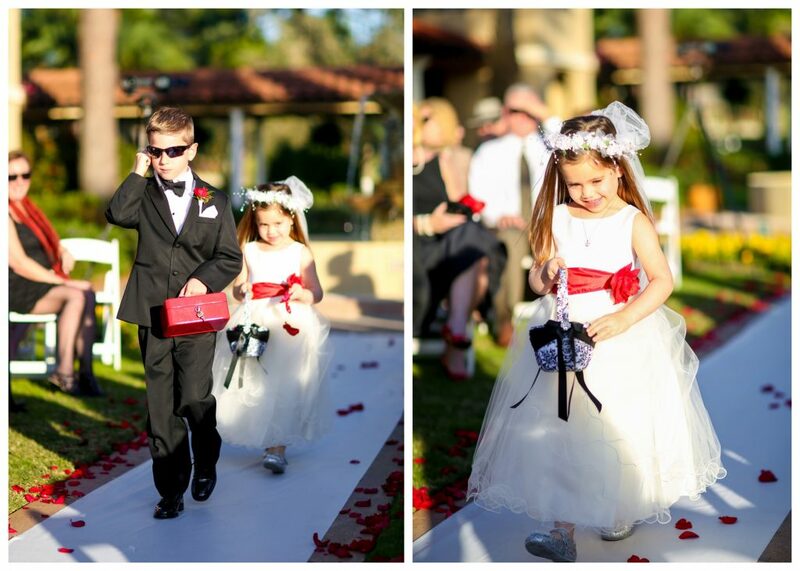 The wedding party made their way down the aisle, including the secret agent-style ring bearer and flower girl. Kimberly then made her grand debut as the bride, and anyone could see the immense amount of love in Ryan’s eyes. 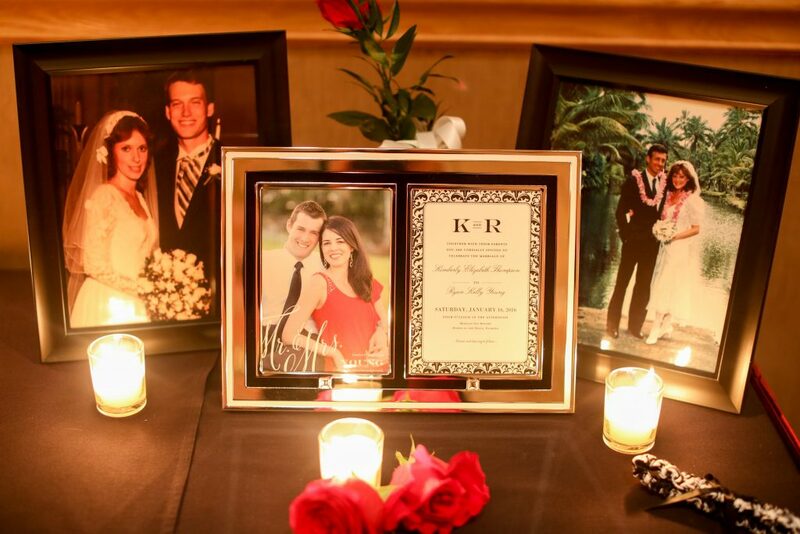 The two decided to include a rose ceremony, on theme with their wedding, in which they exchanged roses as their first gifts to one another. At last, the two were pronounced man and wife! 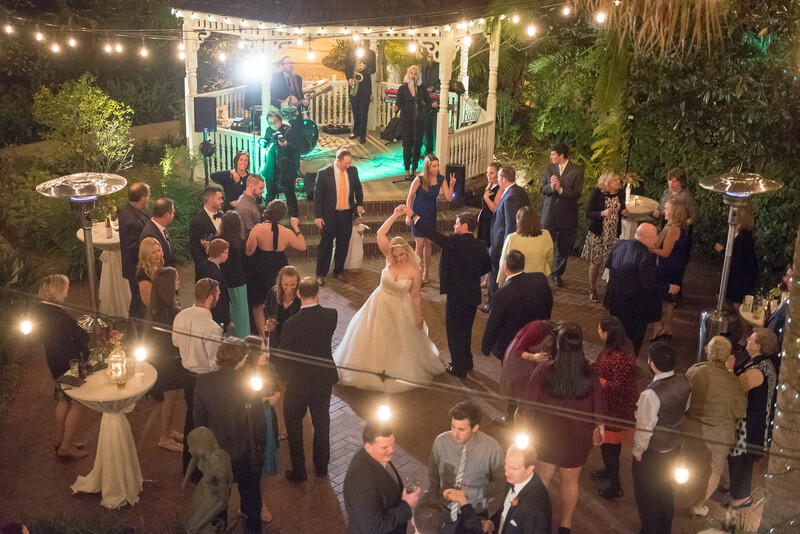 Following the ceremony, the majority of the guests proceeded to the Plaza de las Palmas for cocktail hour while the wedding party joined Kimberly and Ryan for a brief photo shoot. 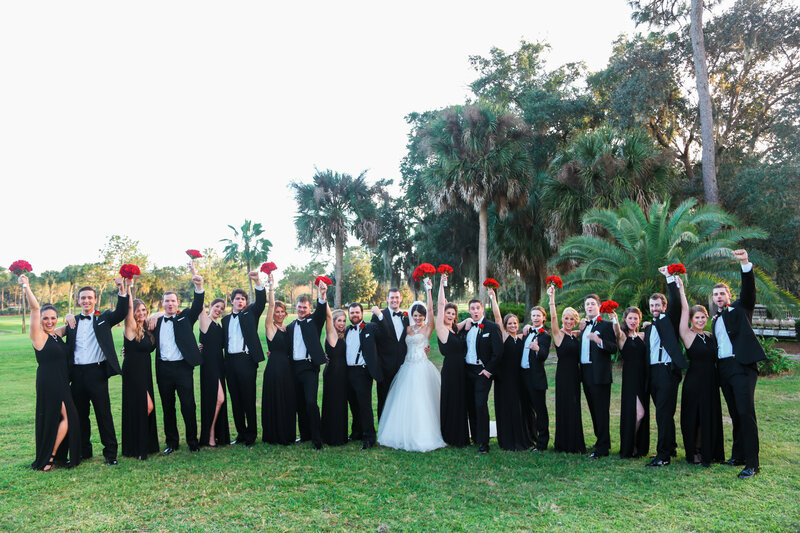 The photo shoot featured their color scheme, contrasting their black dresses and suits with the vibrant red rose bouquets and boutonnieres. 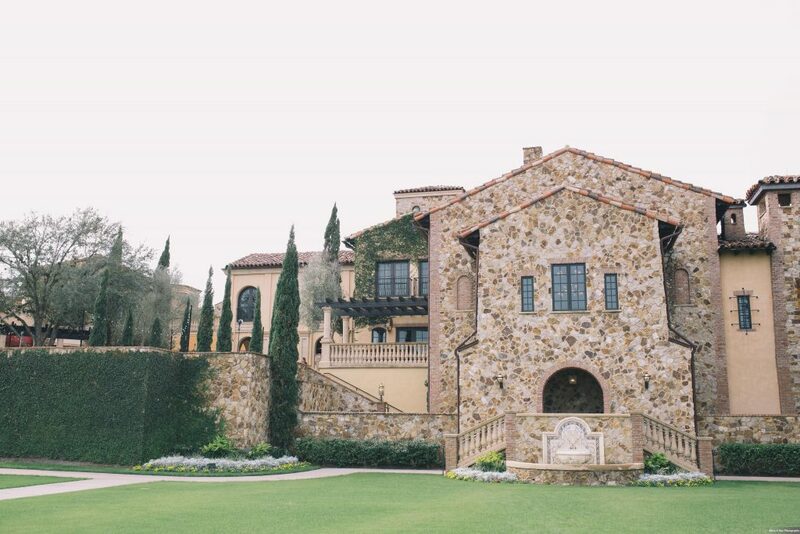 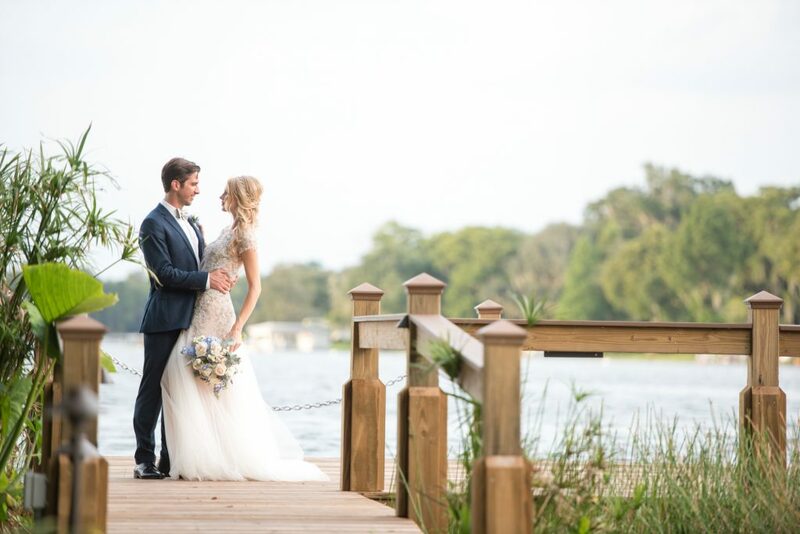 The bride and groom then took a few pictures around the expansive venue, finding locations such as a pillared hallway, a walkway along the water, and a stone bridge. 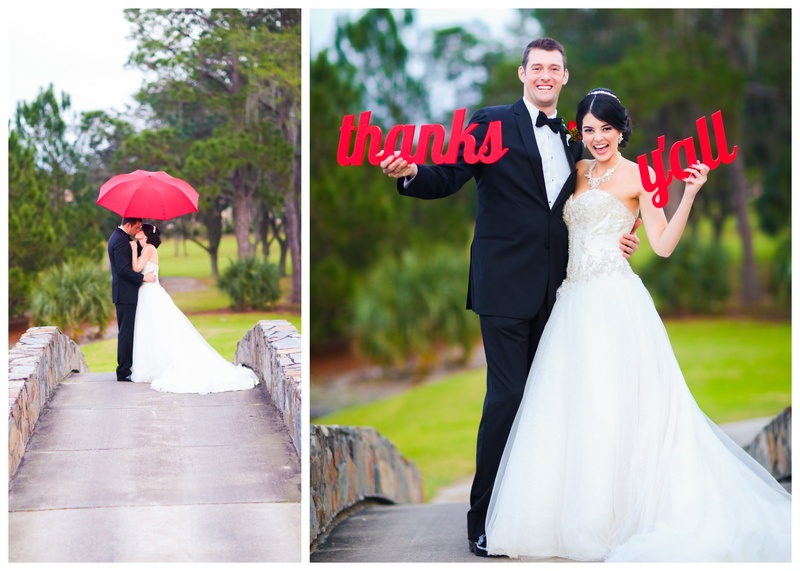 At the bridge, the couple utilized props for some creative and fun photos: a red umbrella and signs that said “Thanks Y’all”. 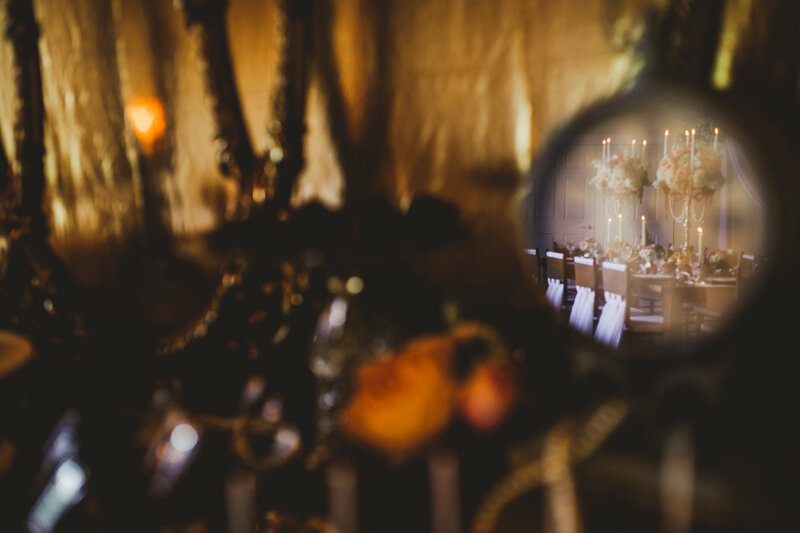 The reception space was set gorgeously, lit by candelabras and individual candles everywhere you looked. 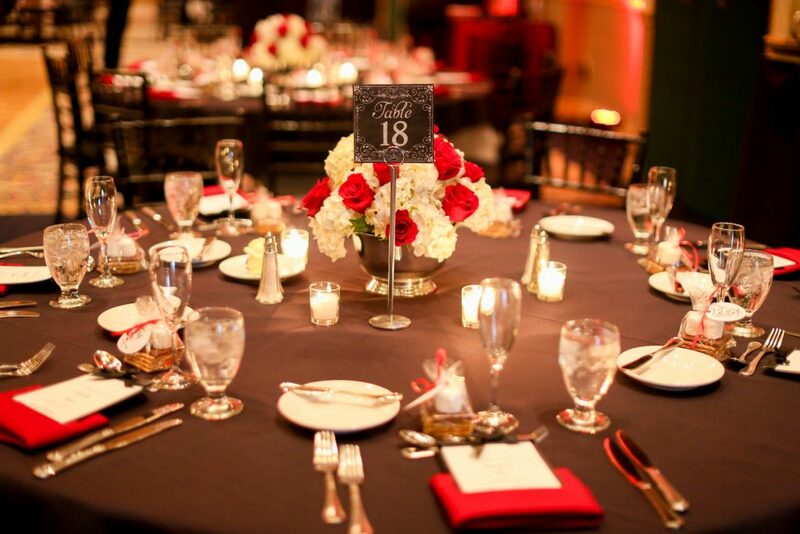 The table linens were black, with centerpieces of different styles arranged by Lee Forrest Design, all featuring red roses. 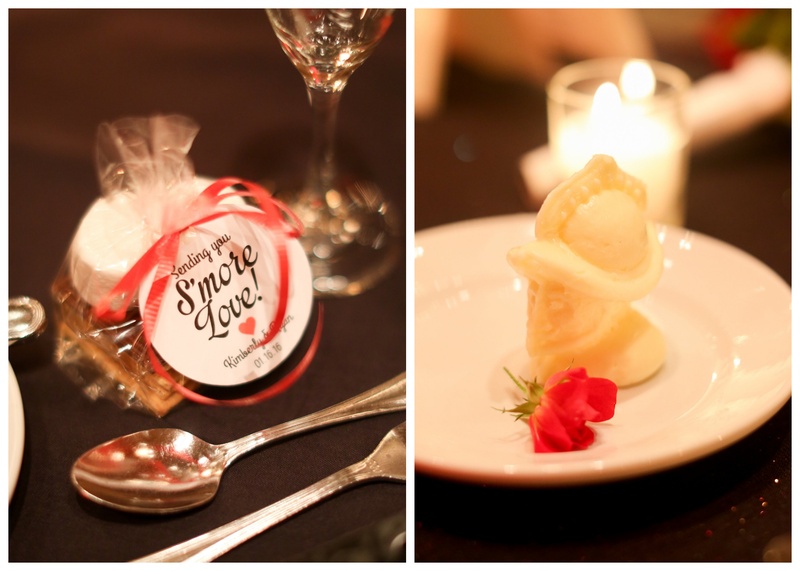 Two very fun details were the butter dishes on each table, on which the butter was sculpted into a knight, and the favors at each place, which were little s’mores kits. 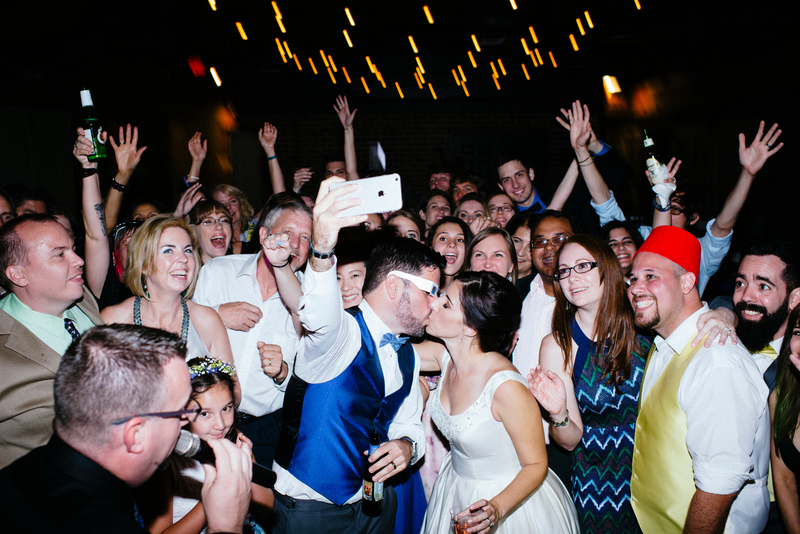 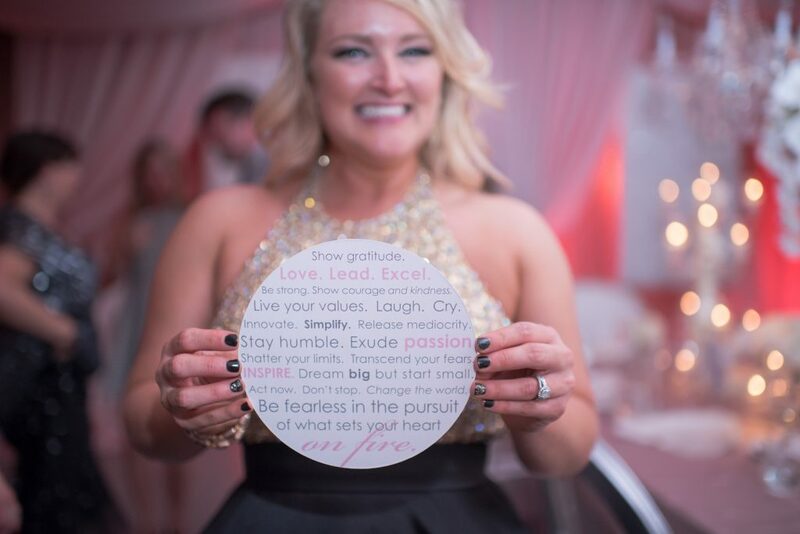 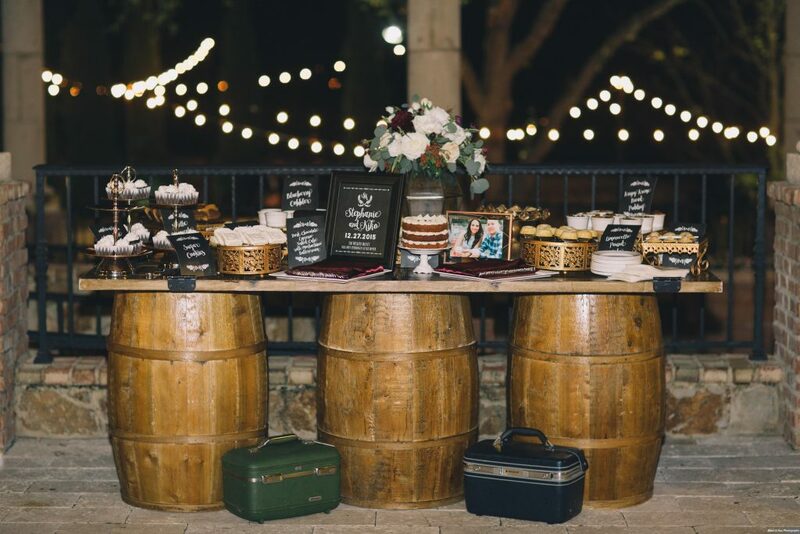 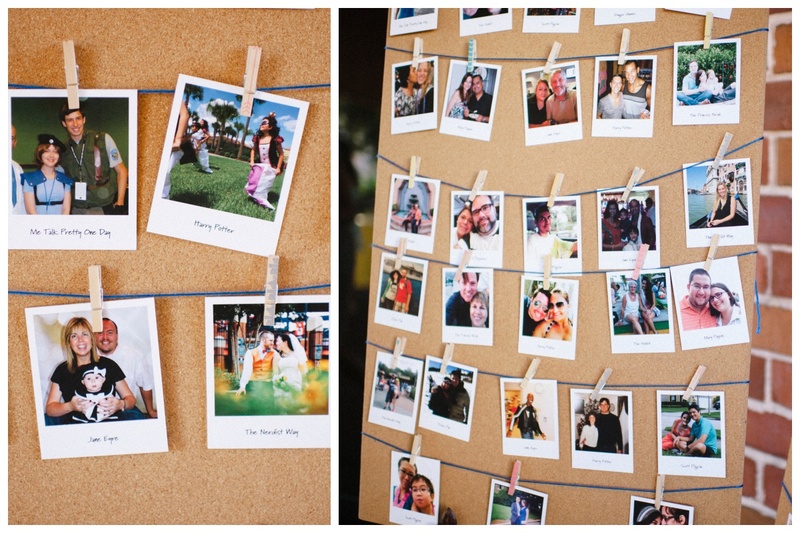 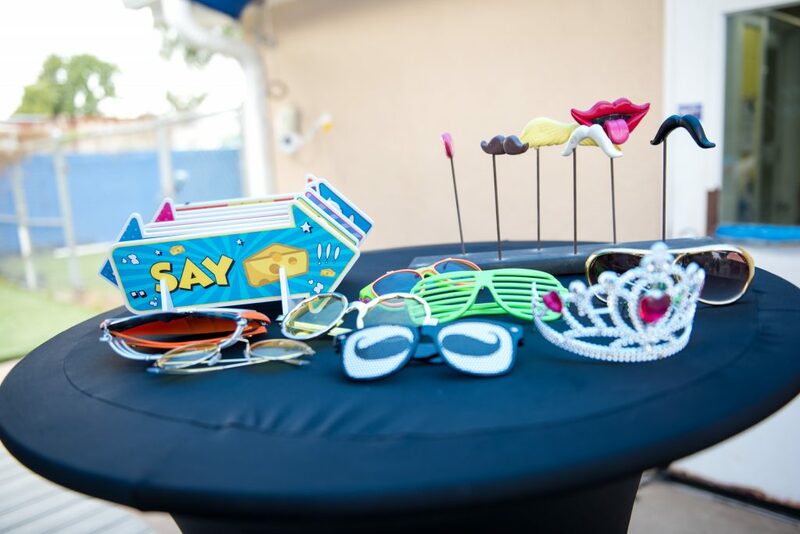 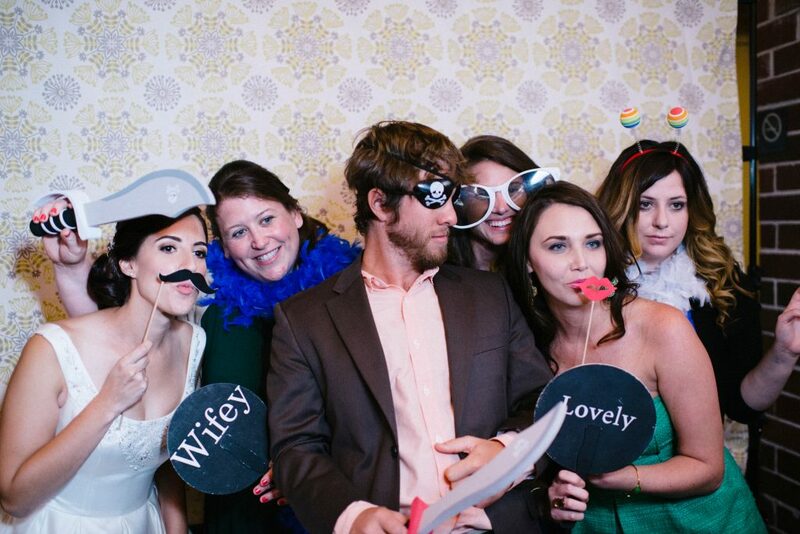 The photo booth, set up by Party Shots Orlando, offered a variety of props, and in the corner, the card and gift table featured the couple’s custom hashtag on a chalkboard, as well as framed photos of the happy couple and their parents’ wedding photos. 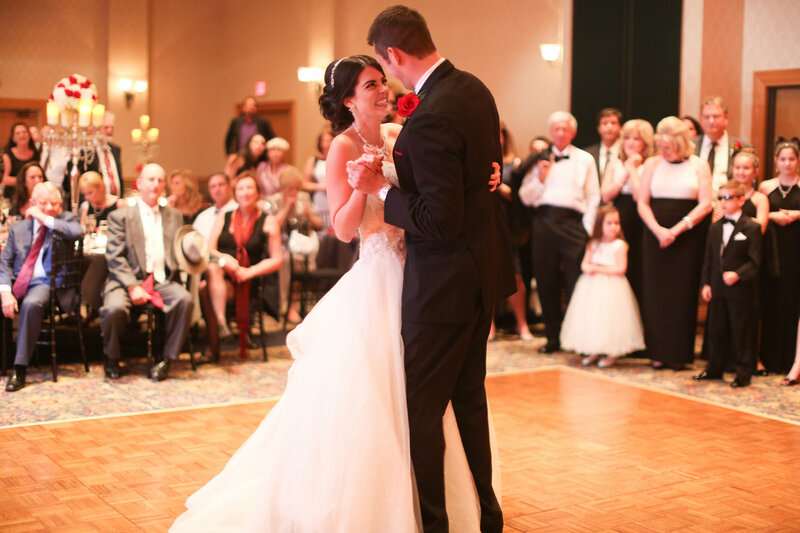 Once all the guests were seated, the bride and groom made their grand debut into the reception hall, followed by their first dance together as husband and wife. 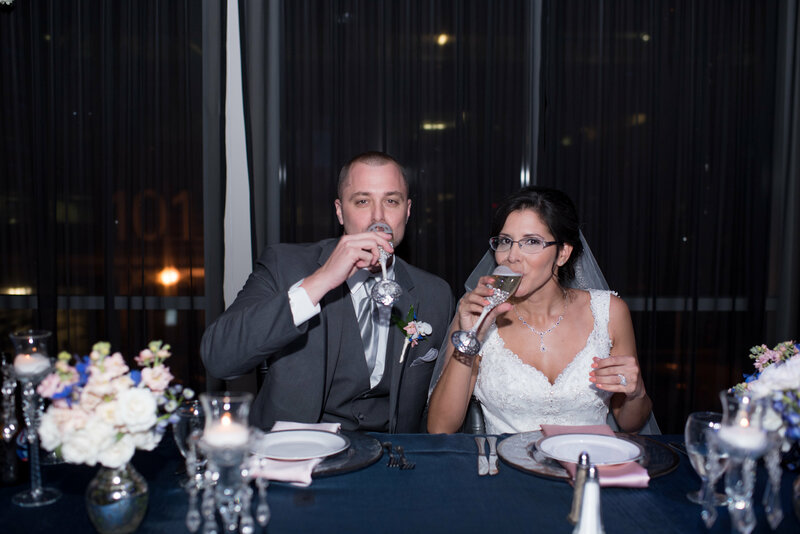 After a welcome toast by the father of the bride and a blessing, the dinner began. 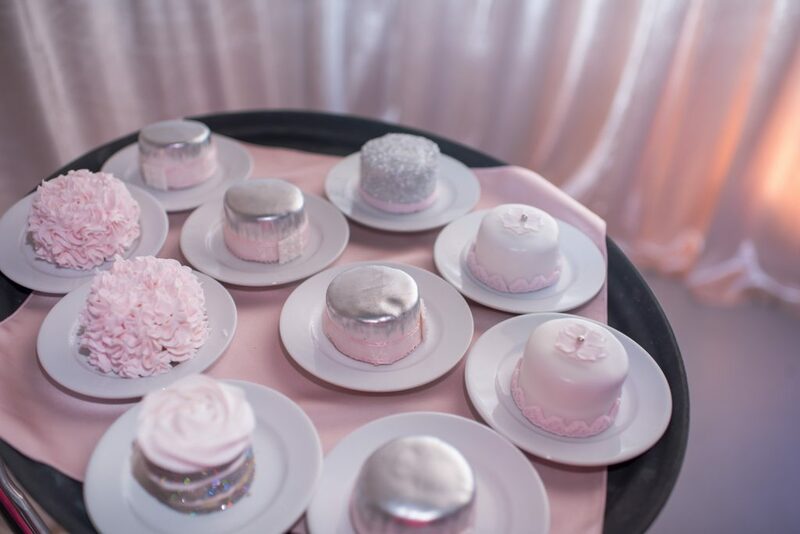 In short time it was time to cut the cakes, made by Incredible Edible Cakes. 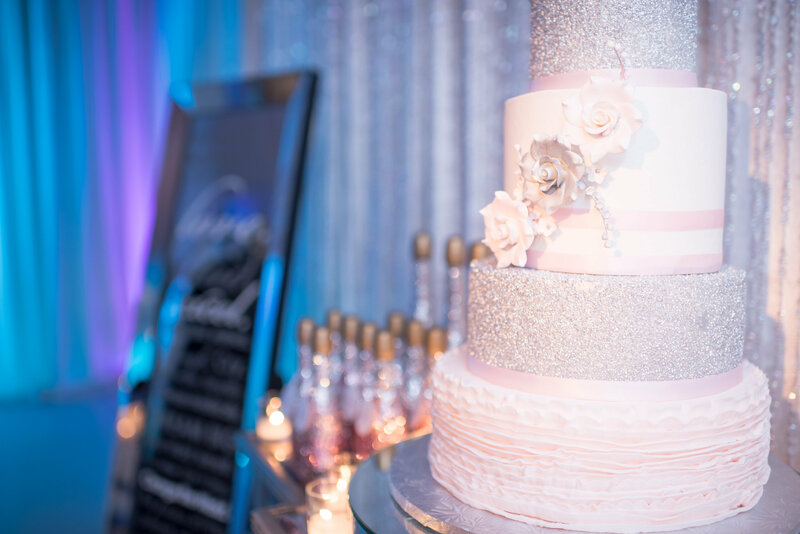 Kimberly and Ryan opted to have both a bride’s cake and groom’s cake – the bride’s cake was multi-tiered with swirls and red roses on every tier, as well as a cake topper. 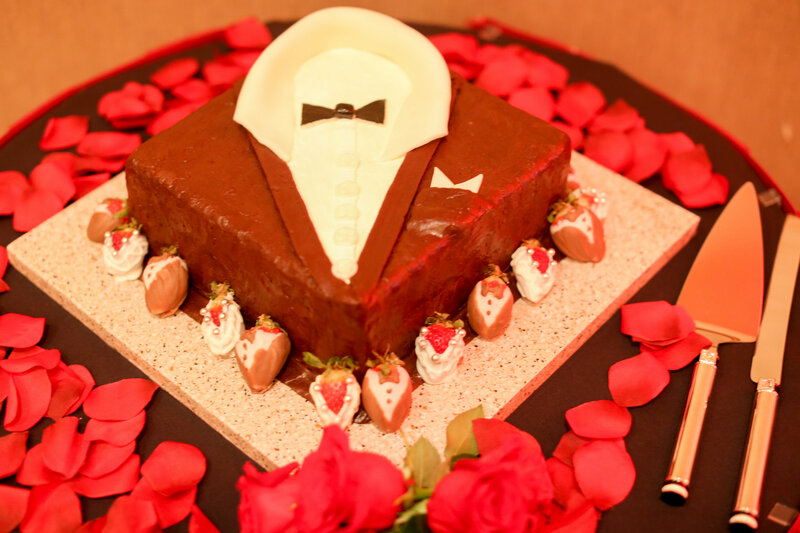 The groom’s cake was one tier but a very fun design, made to look like a groom’s tux. 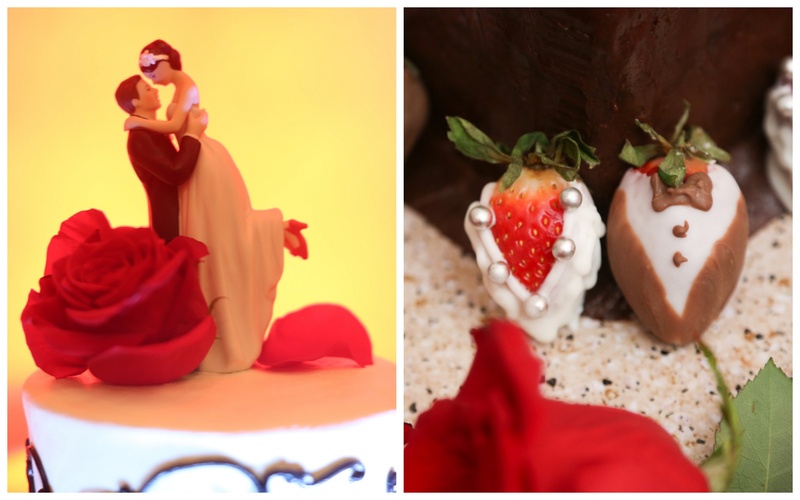 Our favorite detail was the surrounding chocolate-dipped strawberries, which were decorated to look like a bride and groom. 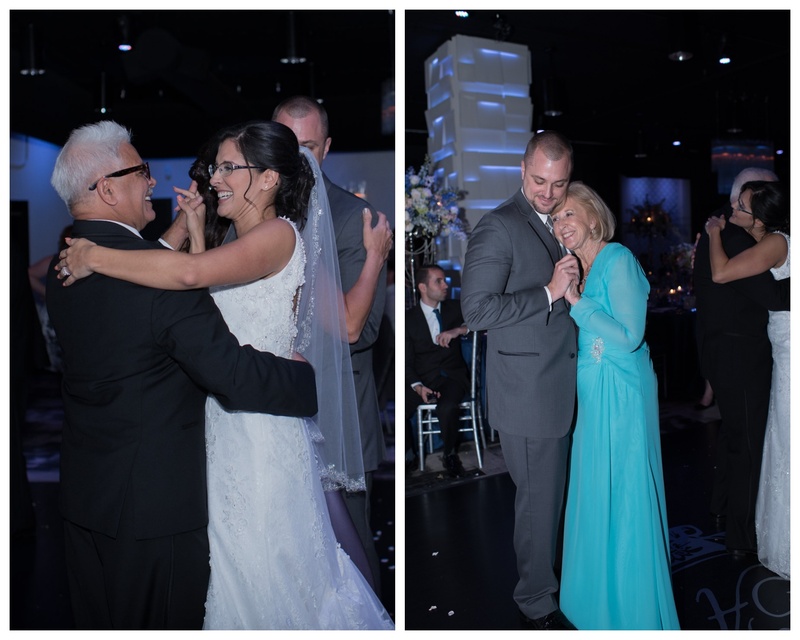 The cake cutting was followed by the father-daughter and mother-son dances, which led immediately into open dancing! 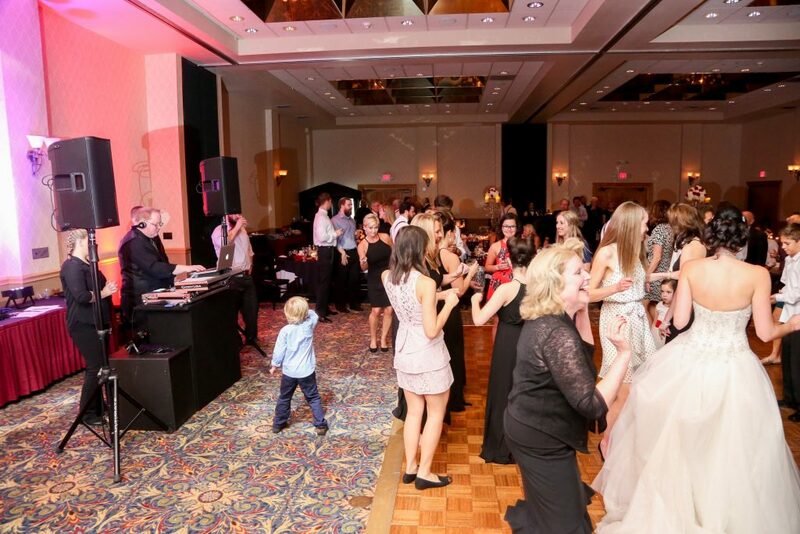 Fun was had by all, led by the DJ from White Rose Entertainment. 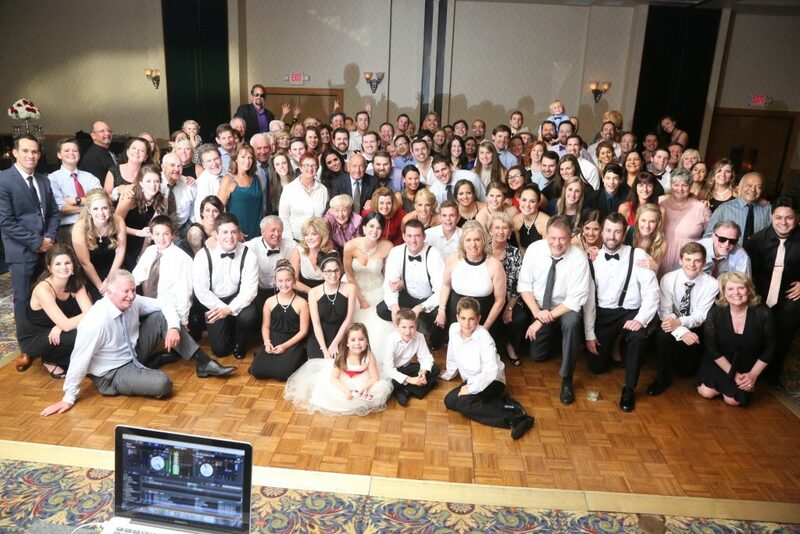 There was a short break for the bouquet and garter toss, and the evening drew to an end with a huge group shot of all the guests together on the dance floor. 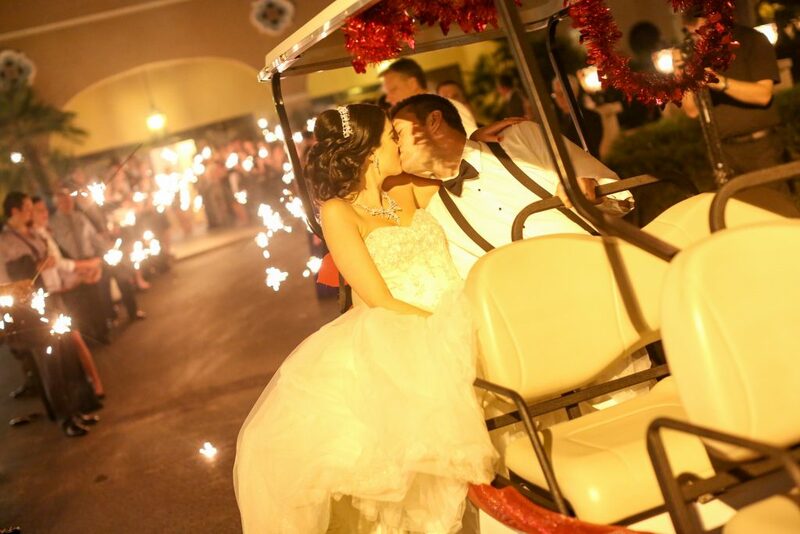 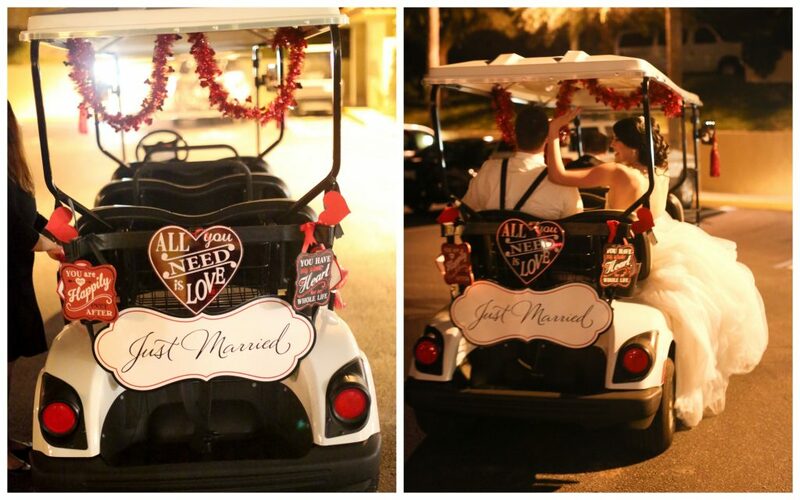 In a beautiful finish, the bride and groom chose to have a sparkler exit into their getaway vehicle – a golf cart with a “Just Married” sign. Kimberly and Ryan rode away into the night, sparklers shining behind them, and we celebrated the end of a wonderful night, and the beginning of an exciting new journey for the two of them. 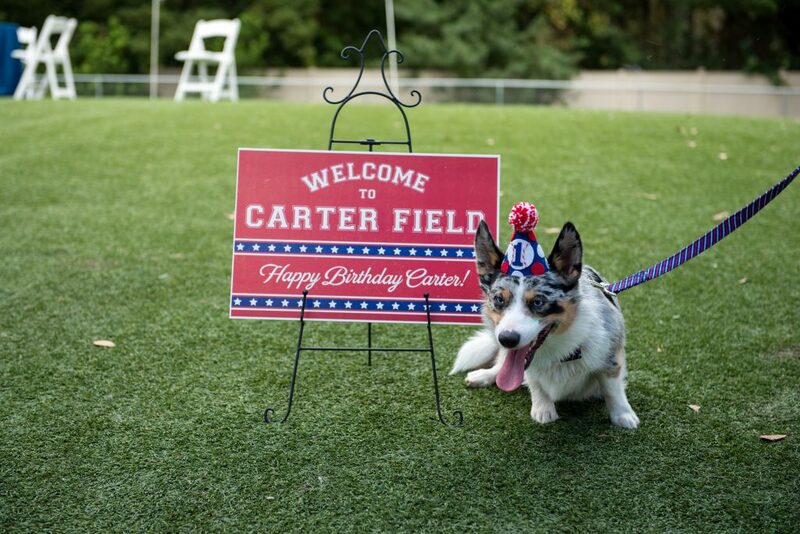 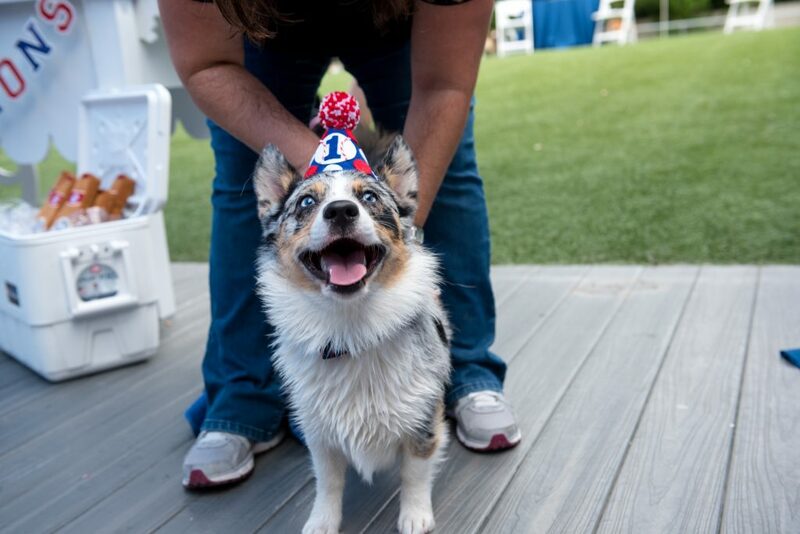 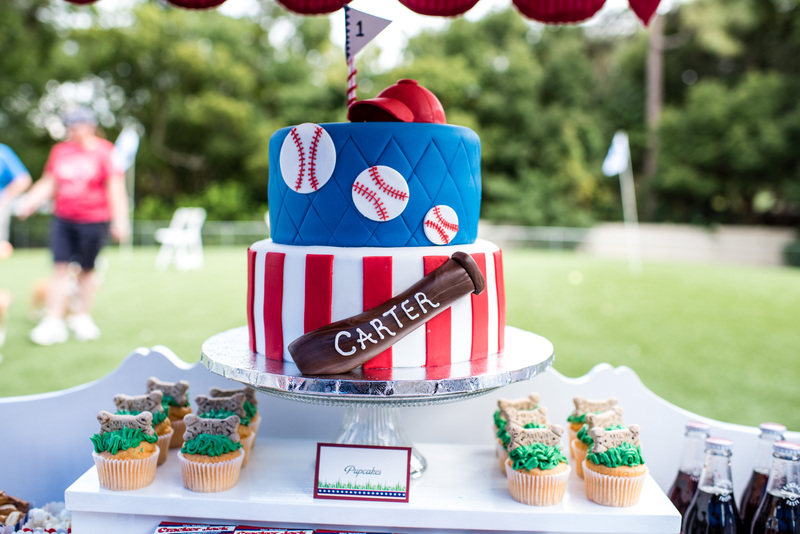 Now that baseball season has started we can’t help but remember a baseball-themed party we threw back in 2015 for the biggest baseball fan around – Christy’s Corgi, Carter! 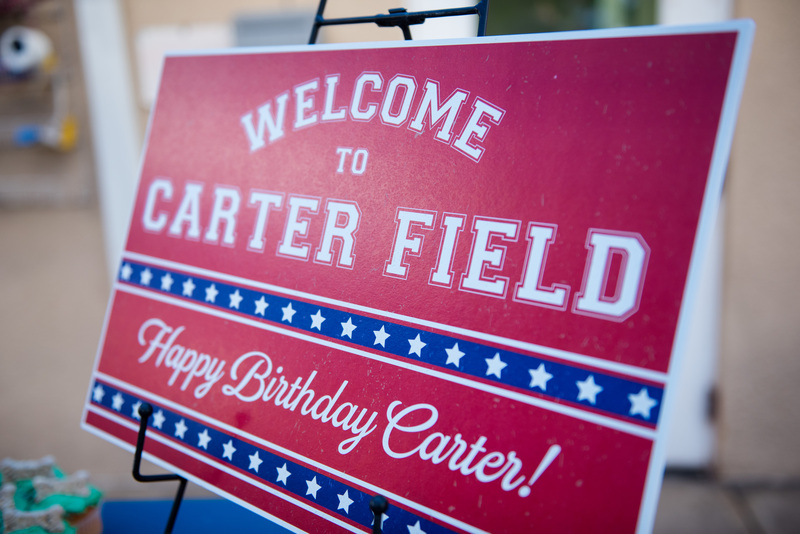 Carter had garnered quite a following on Instagram, and we thought it would be a fun idea to bring together some of his local friends to celebrate his first birthday. 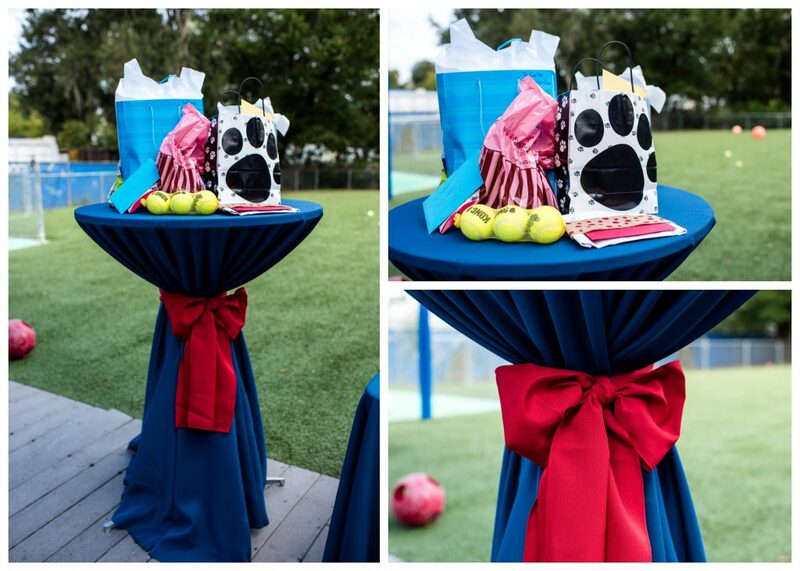 It was a blast to plan for Christy, most definitely the cutest party ever thrown, and a great time for all those who got to attend, furry or human! 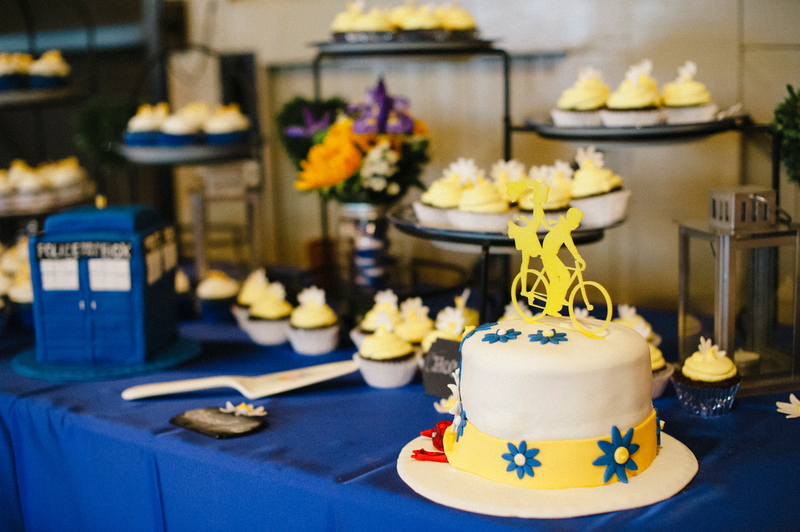 It even got a feature on the blog for The Celebration Society and in their printed magazine! 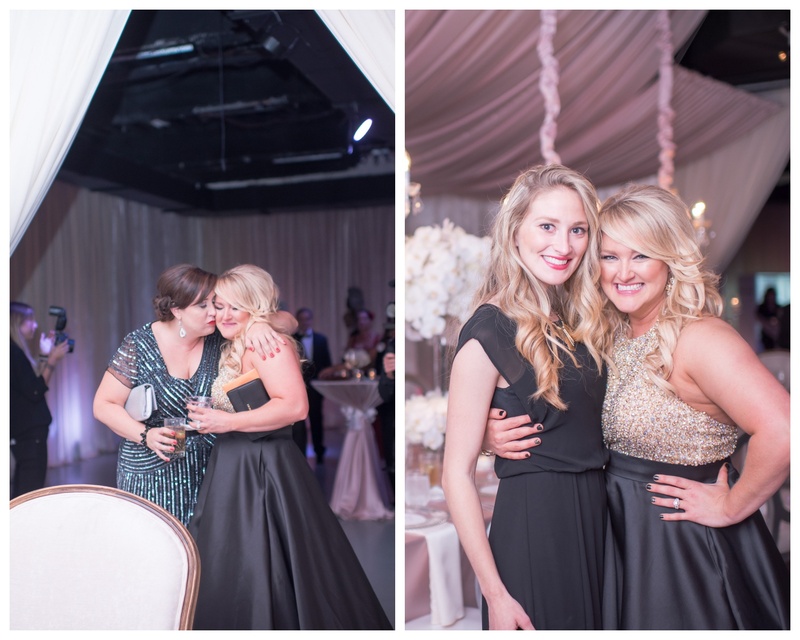 Much thanks to Kathy Thomas Photography for sharing these wonderful photos with us. 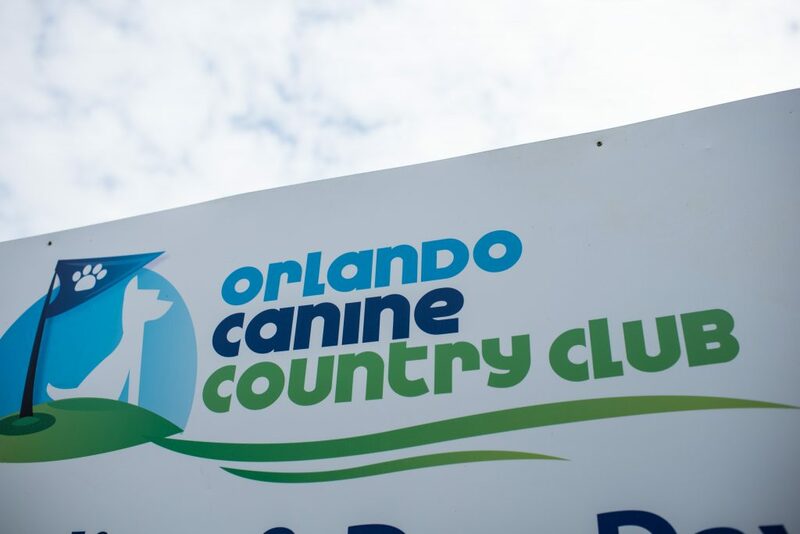 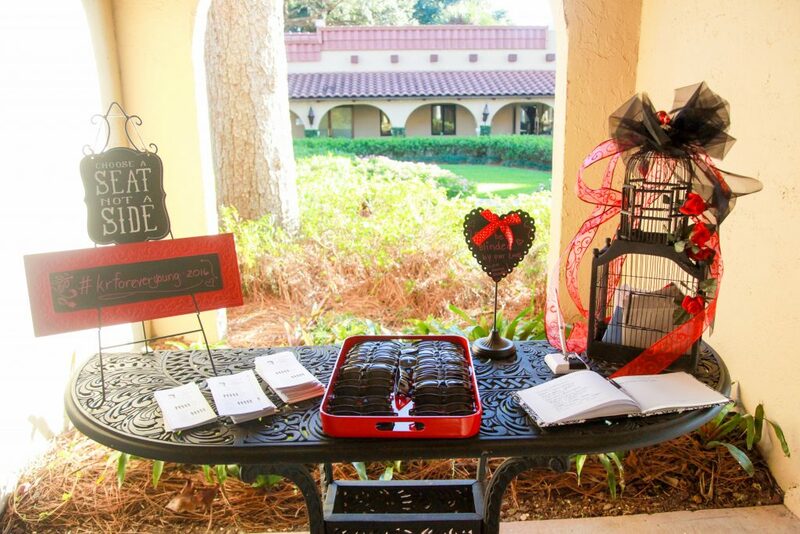 We set up the charming party at the Orlando Canine Country Club, a perfect setting for a dog’s day out. 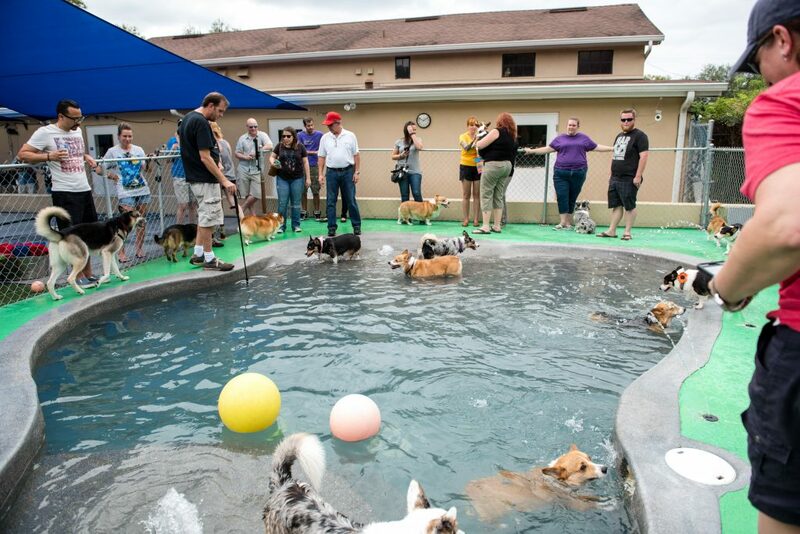 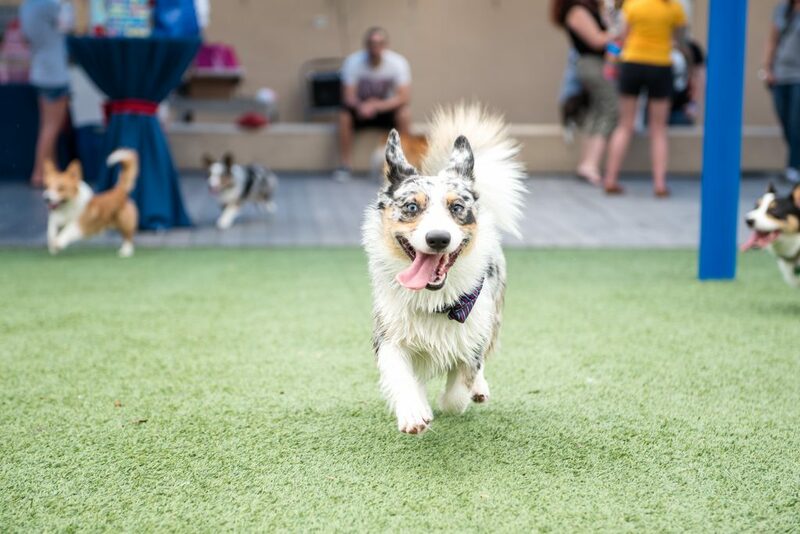 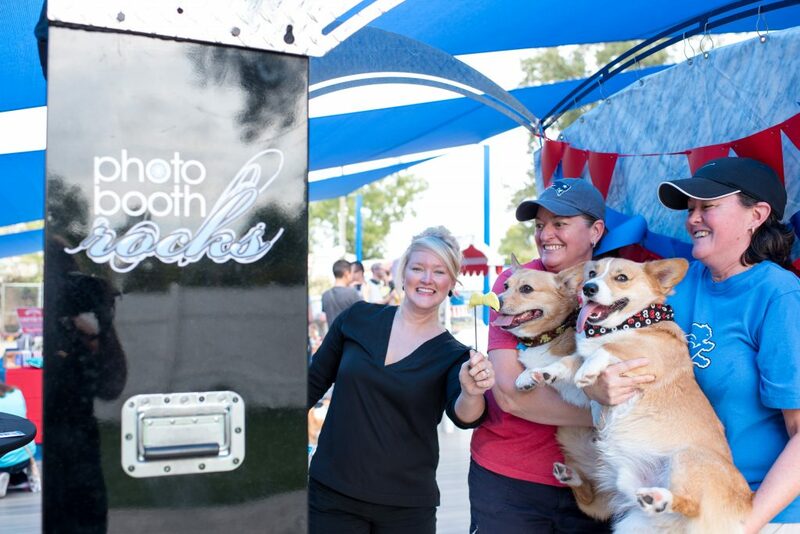 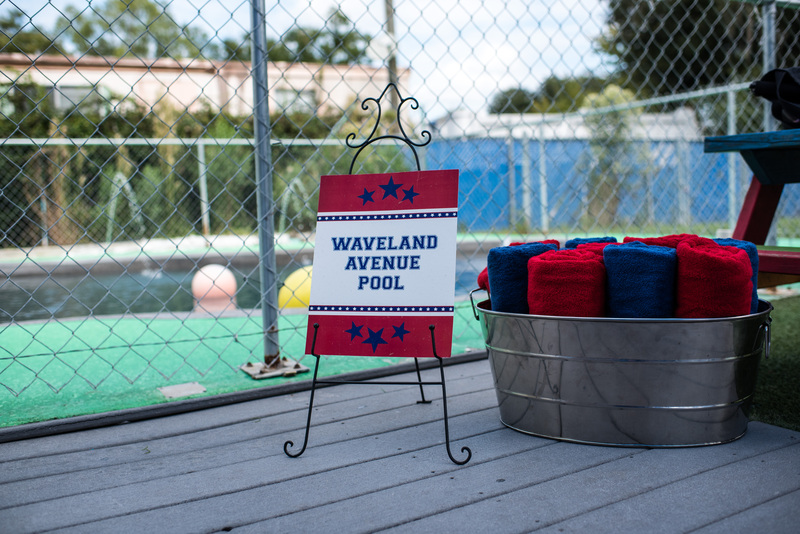 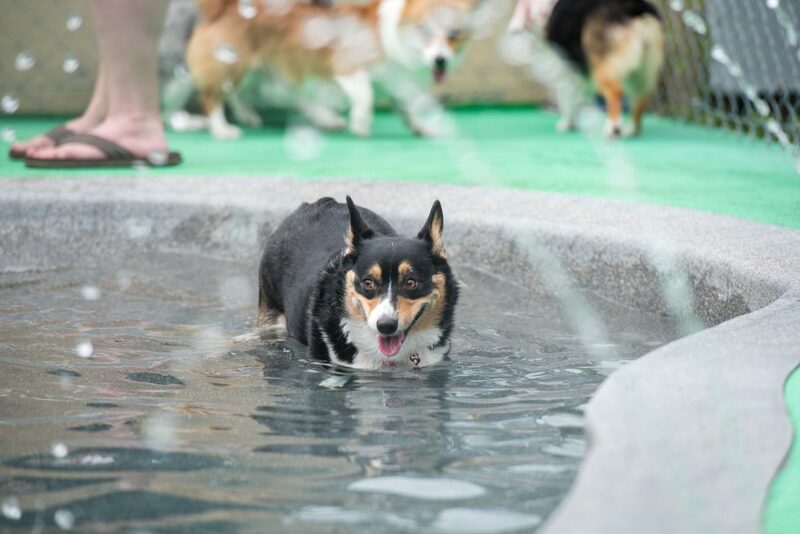 Normally a site for dog boarding and doggy day care, it was just right for our party, with a shallow pool for our furry friends to frolic in and lots of open grass to run around in. 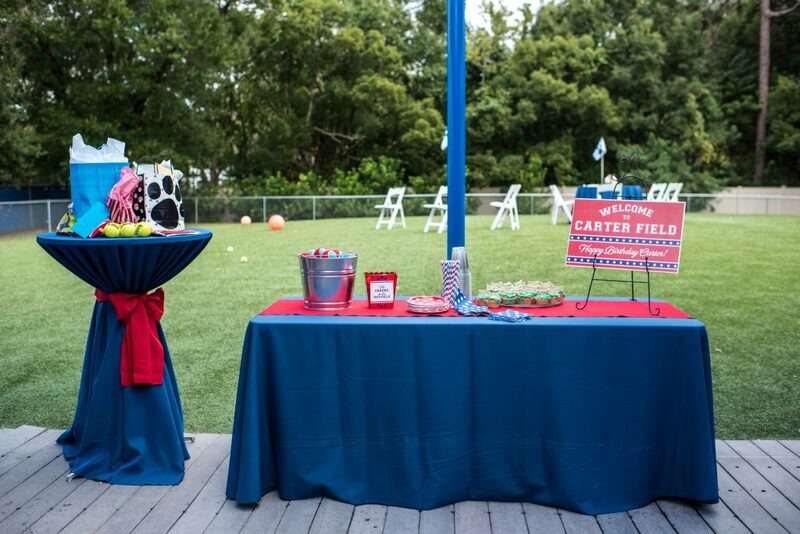 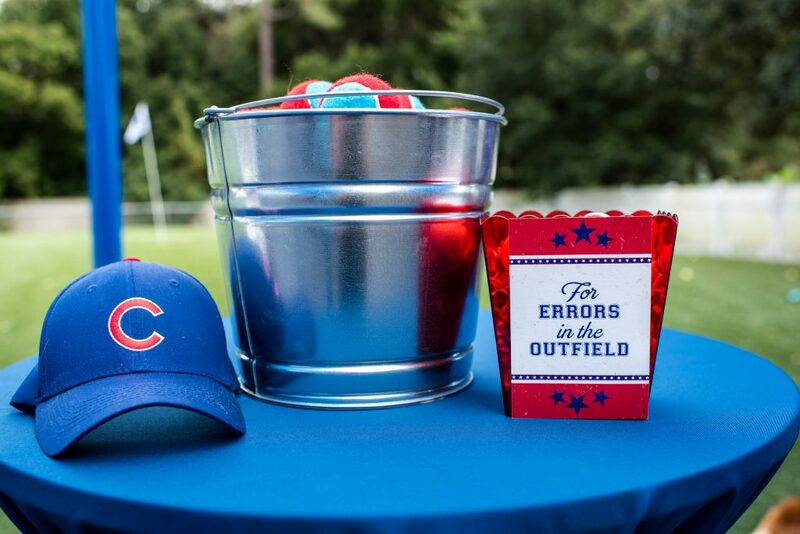 We chose a red, white, and blue color scheme as a nod to Carter’s human-dad’s favorite team, the Chicago Cubs, and provided multiple favors to ensure fun for the guests: balls to play fetch with, towels to dry off after the pool, and even little bags to pick up any “accidents” or “errors in the outfield”. 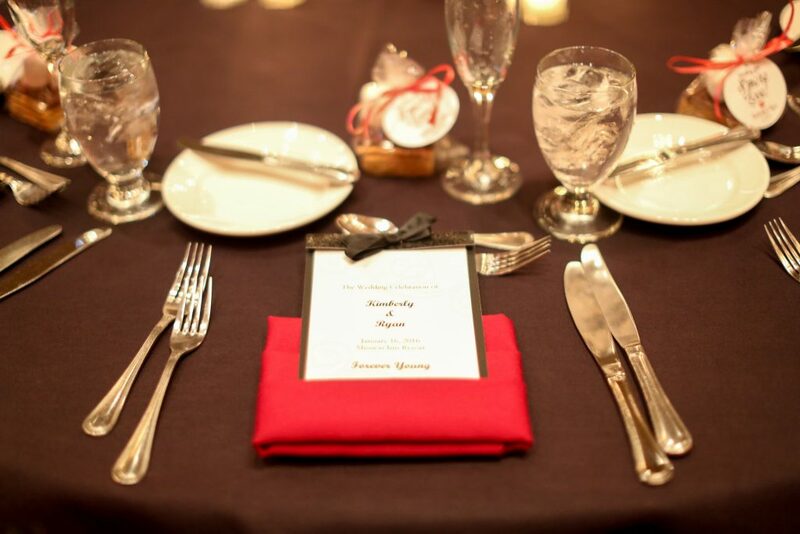 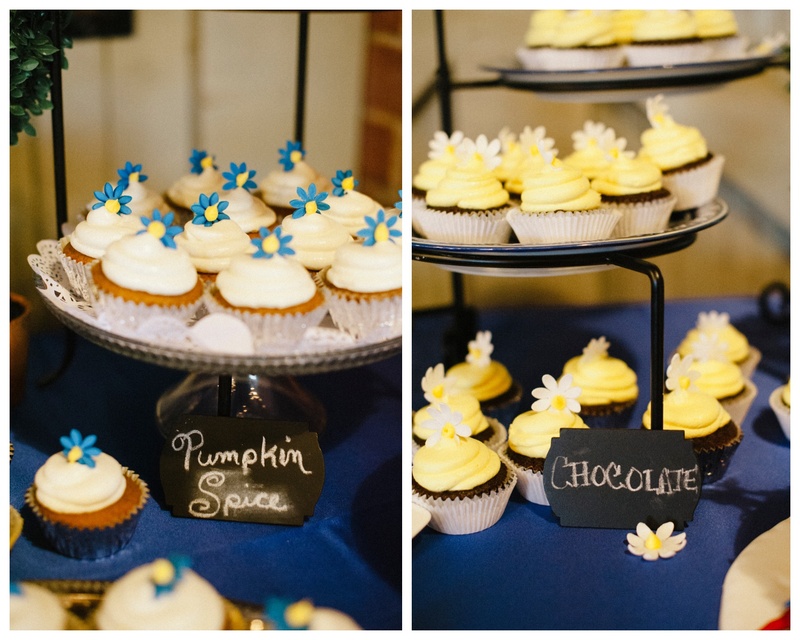 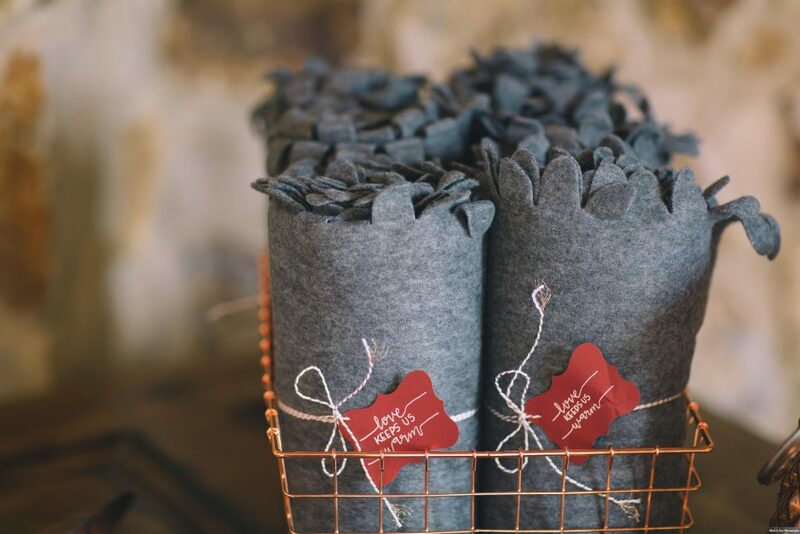 The linens pictured were provided by Kirby Rentals and adorable paper goods were made by Dogwood Blossom Stationery. 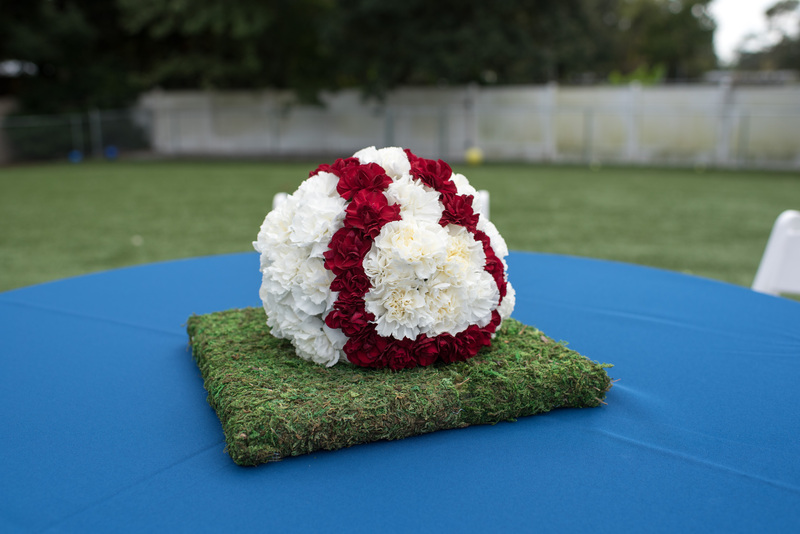 The tables were set with floral arrangements of red and white, arranged into the design of a baseball. 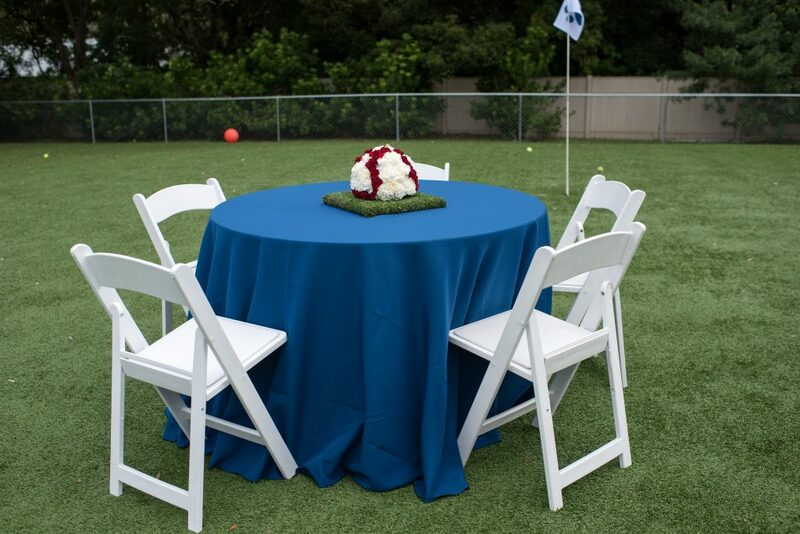 These were set on a square of turf, both really evoking the baseball field feeling. 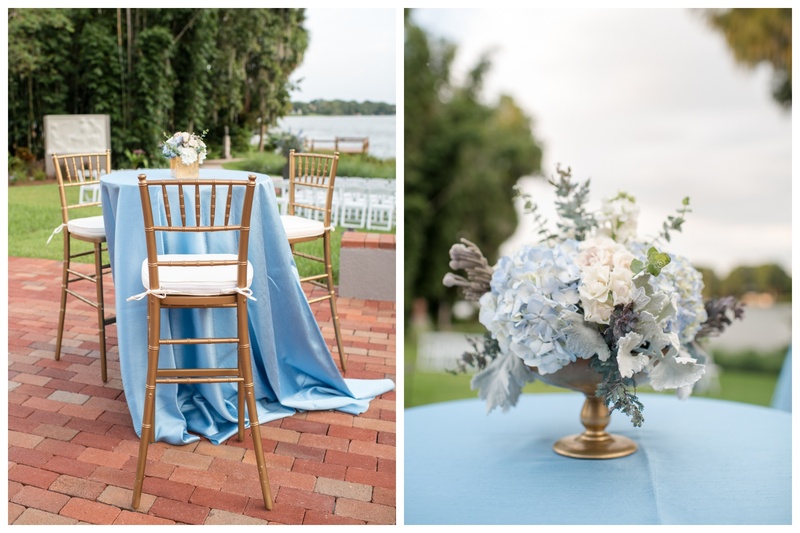 Seating was provided by A Chair Affair, and florals were arranged by Flowers by Lesley. 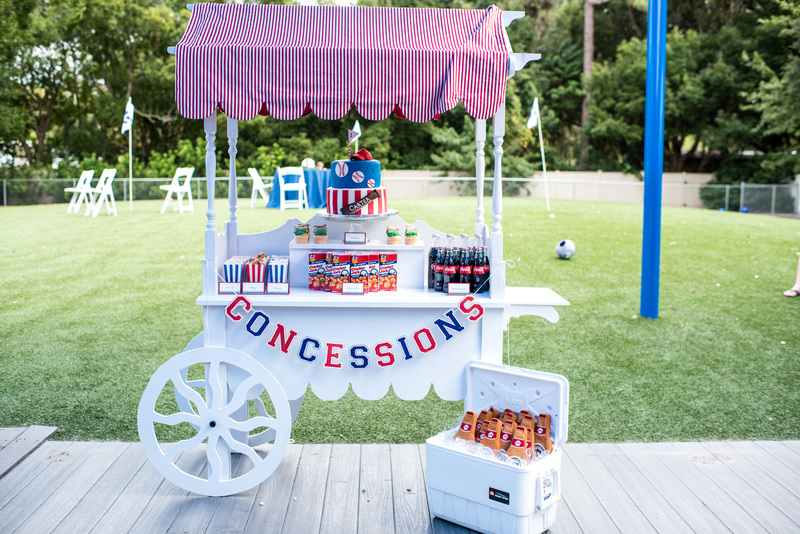 One of the areas with the most creativity was the concession stand of snacks, set up by Florida Candy Buffets. 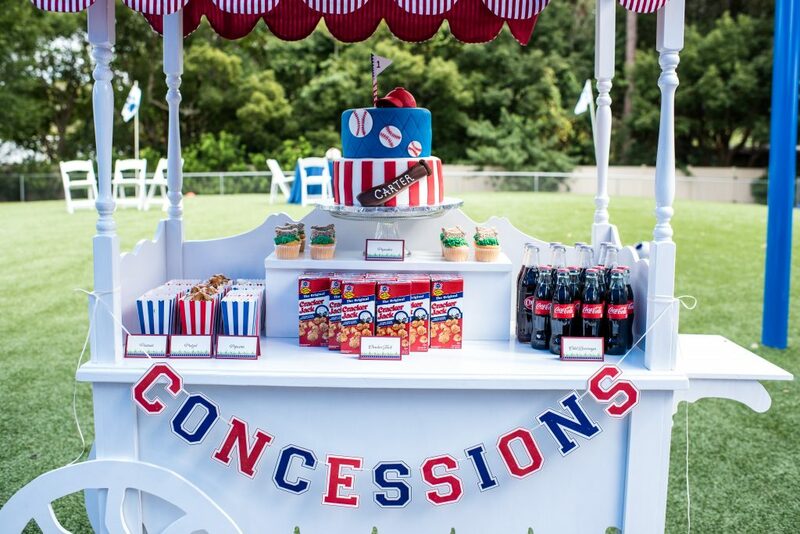 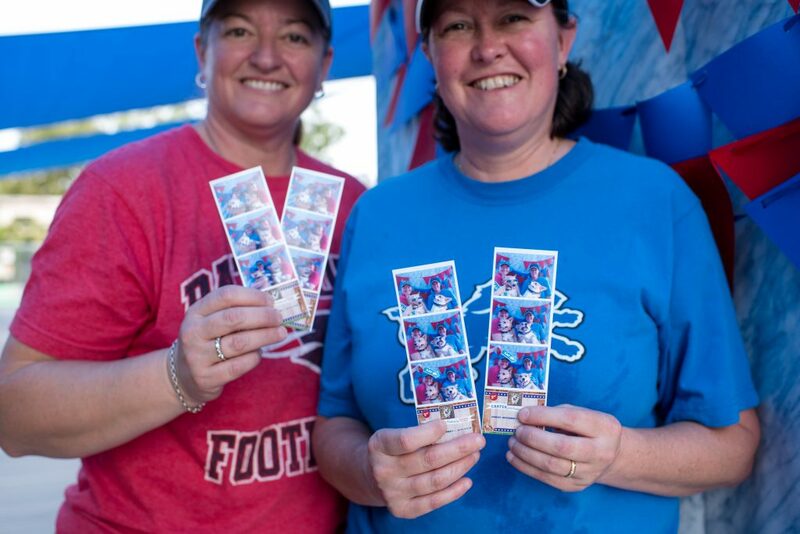 There were lots of human snacks in traditional ballgame fashion – pretzels, popcorn, peanuts and cracker jacks. 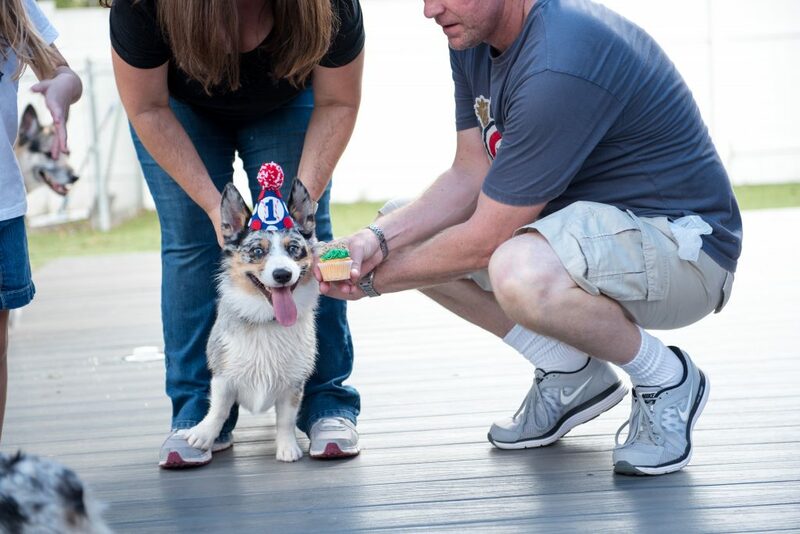 But definitely the highlight were the dog-friendly cupcakes, or “pupcakes”, and cake made by Cut the Cake. 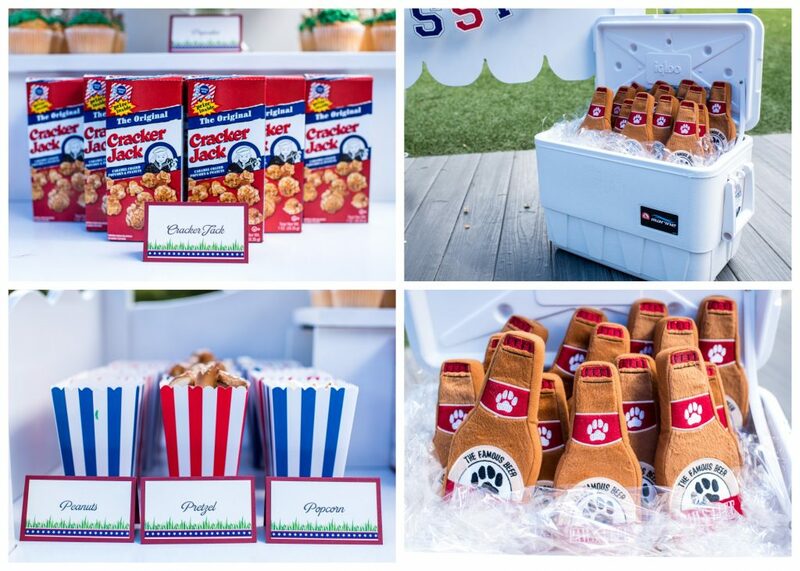 Beneath the snack table was a cooler full of the party favors – beer bottle chew toys for every guest, made by PrideBites. 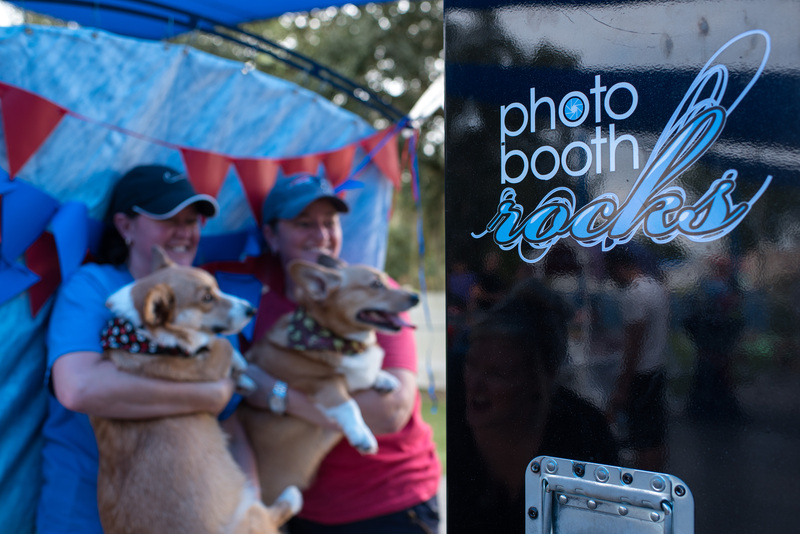 As guests began to arrive, they discovered one of the most adorable features of the party: a photo booth set up by Photo Booth Rocks, with lots of props for humans and pups alike to enjoy! 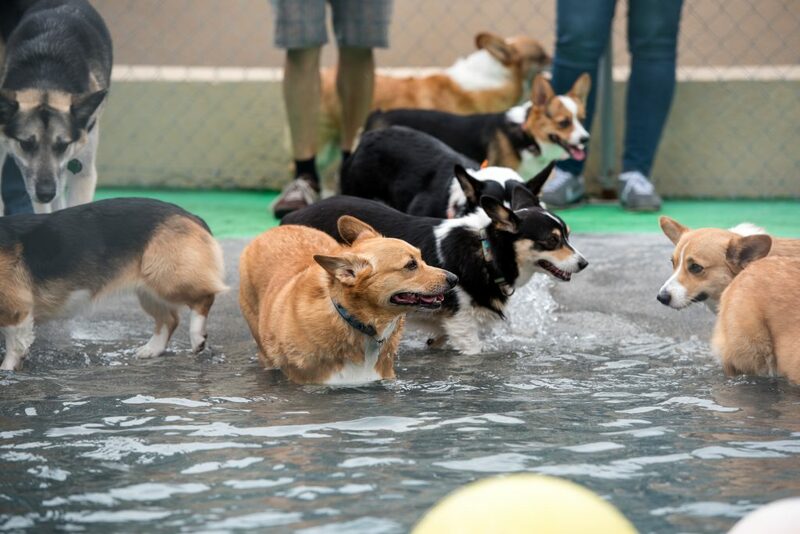 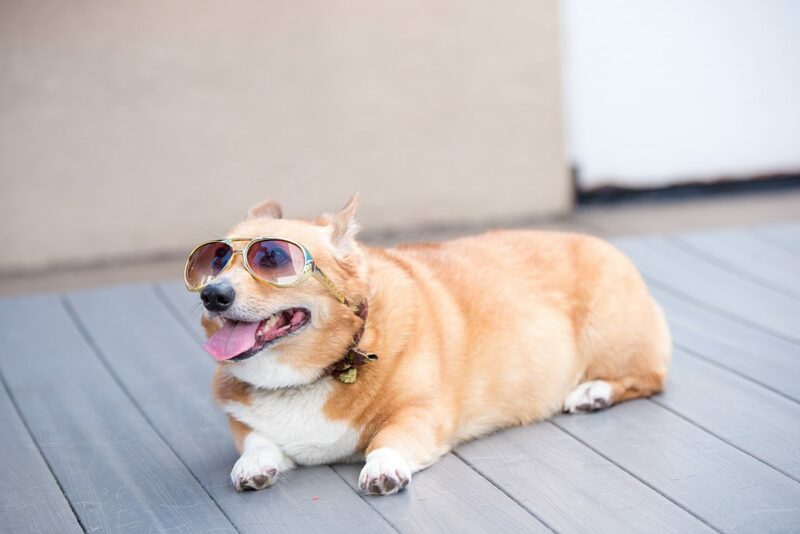 Of course, the main attraction of this party was the immeasurable amount of cuteness provided by all the lovable Corgis. 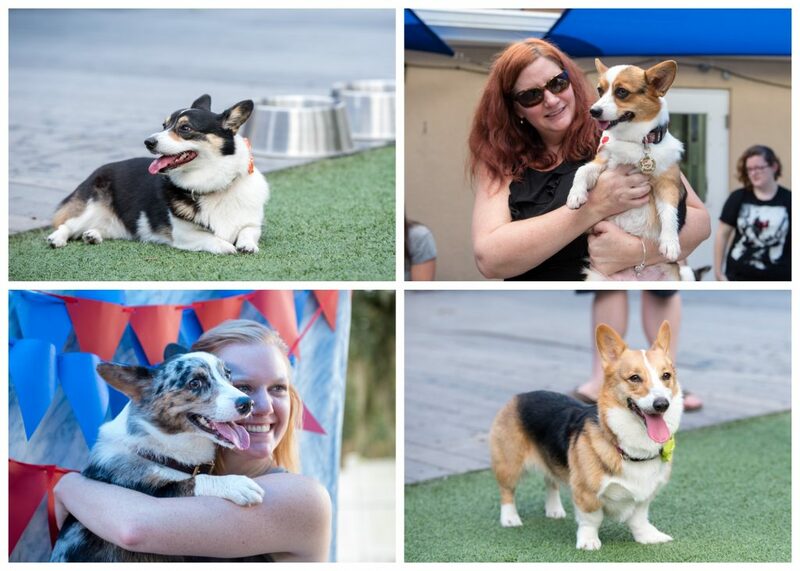 A wonderful time was had by all, humans and pups alike! 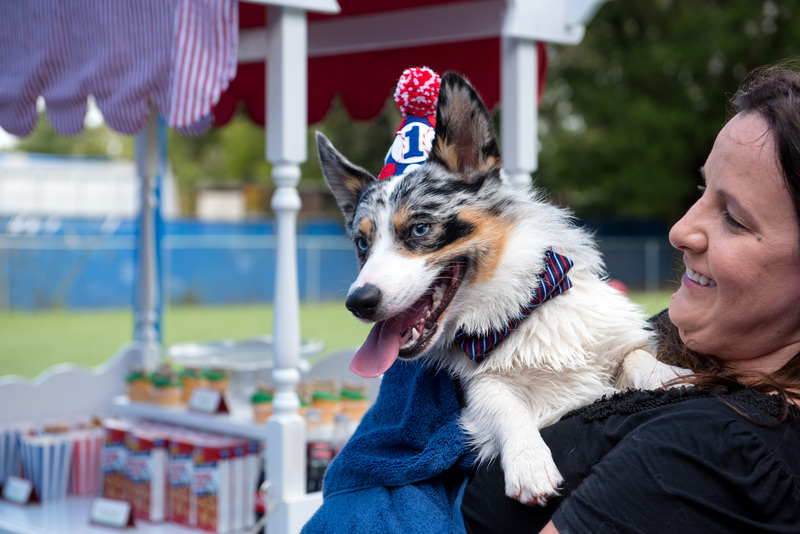 But none had as good a time as the guest of honor, Carter, sporting a custom dog collar with bowtie made by Puppy Pawz Boutique. 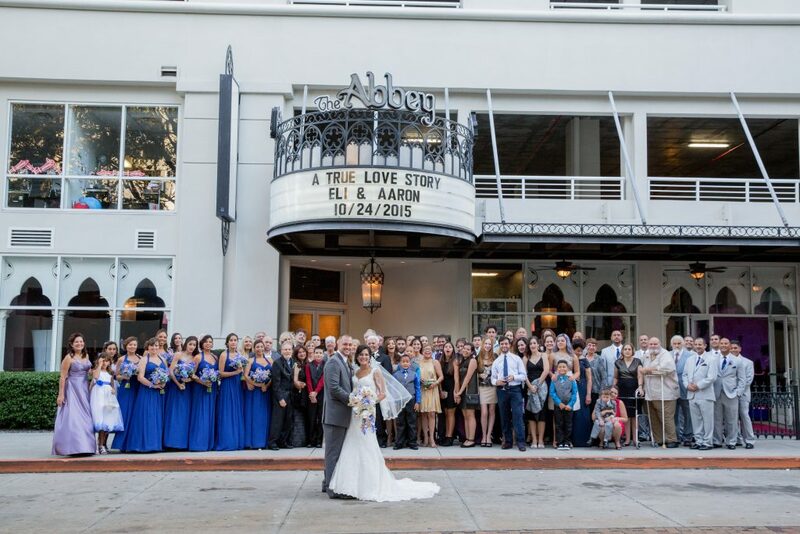 Much thanks to everyone who made this day possible, from guests to venue to vendors! 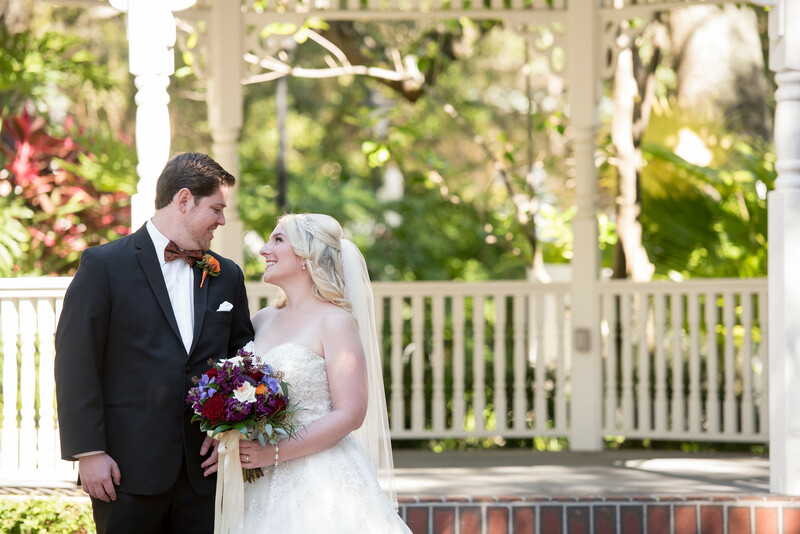 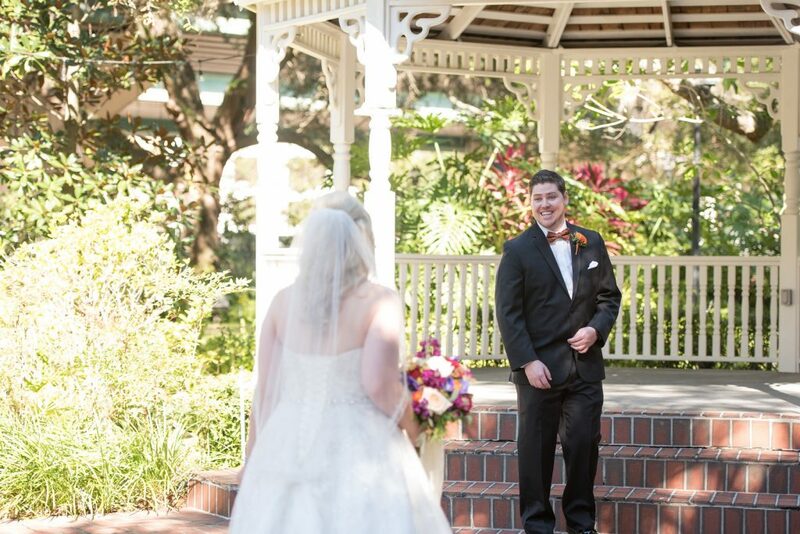 Our next wedding took place in February of 2016, in the gorgeous Harry P. Leu Gardens. 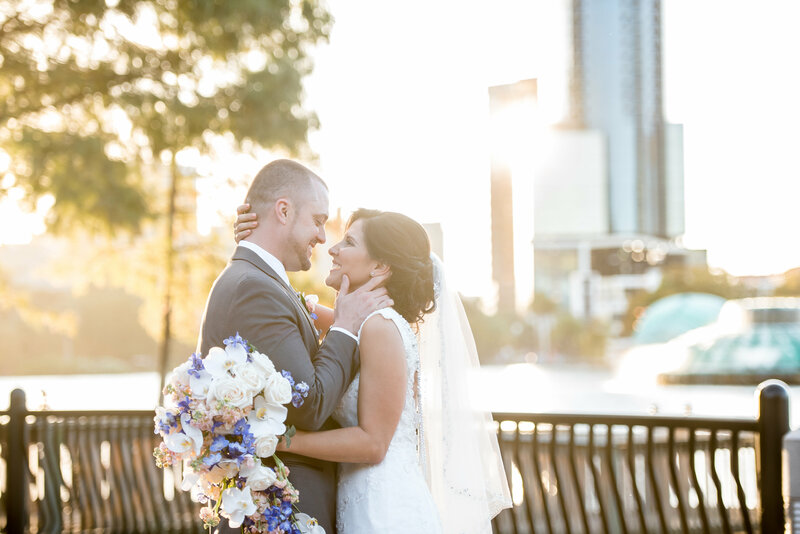 We joined Ashley and Jason for their outdoor wedding, with a color scheme of pink, gold, and blue. 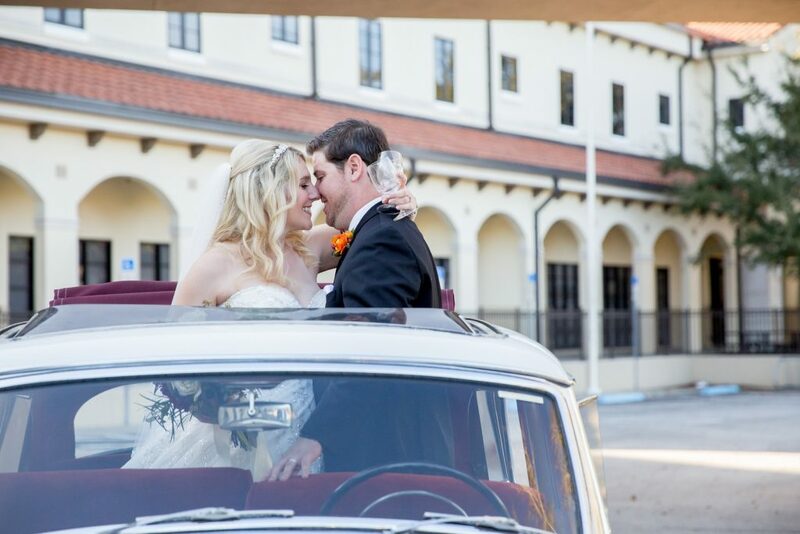 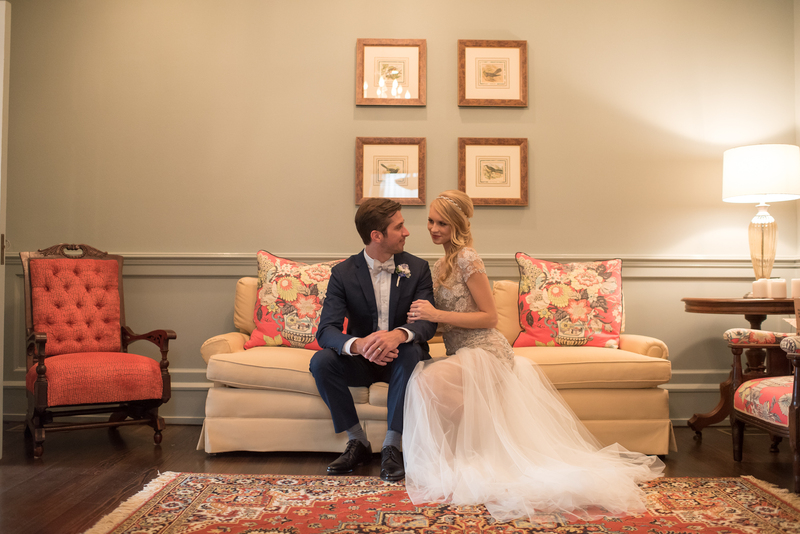 They decided to theme it with the phrase “Best Day Ever”, and they weren’t the only ones who thought it was the best – their wedding got a feature on Orange Blossom Bride! 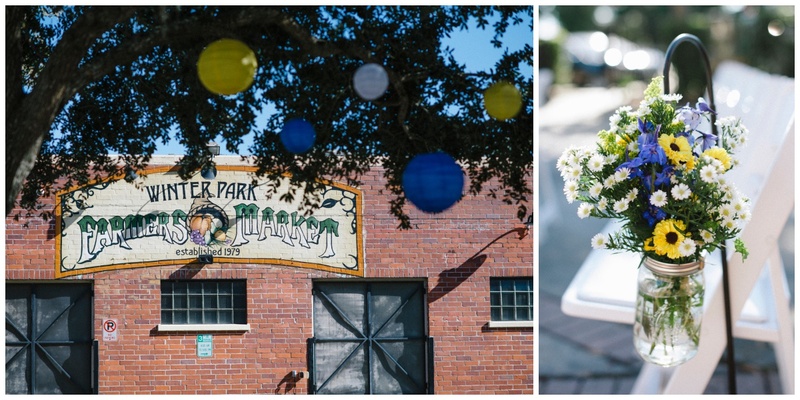 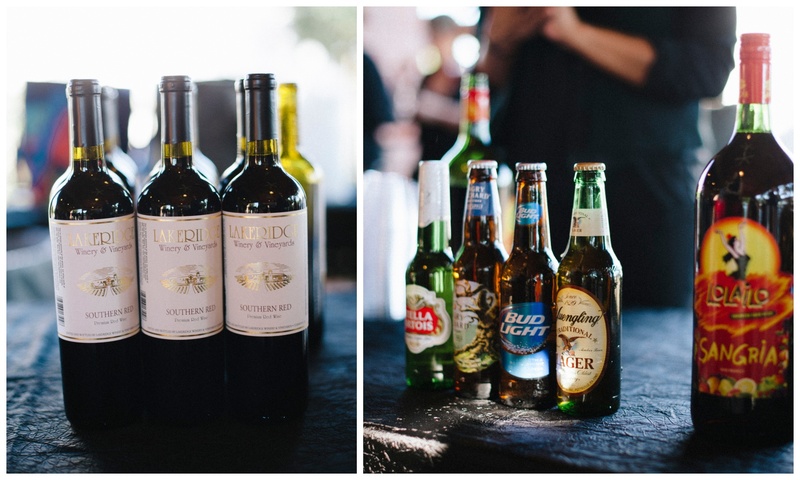 It was a day full of fun, ending in a rustic barn reception at the Winter Park Farmers Market. 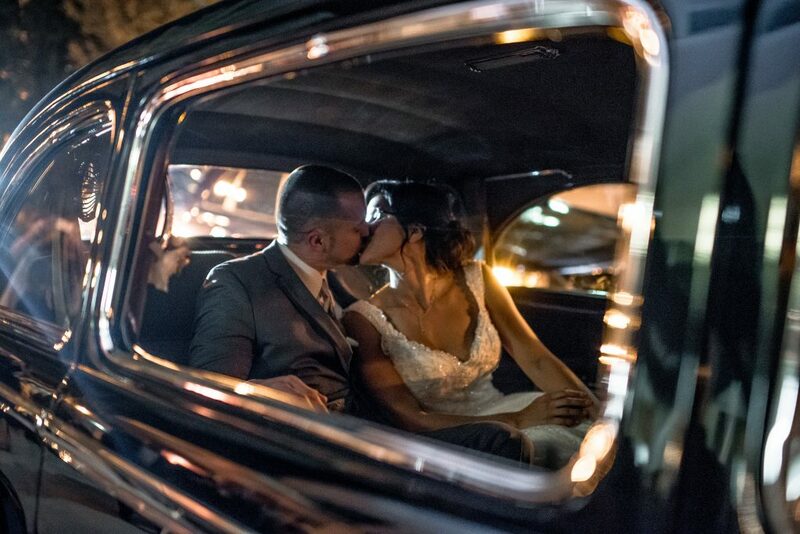 Thanks to the very talented Rudy & Marta Photography, we are able to share the beautiful pictures from their day with you! 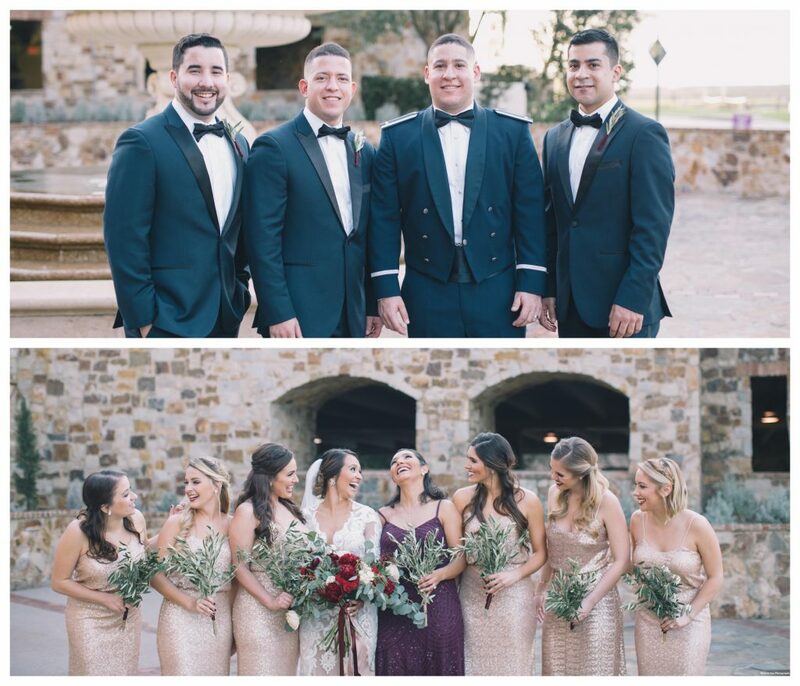 As the groom got ready with his groomsmen, the bridesmaids helped Ashley into her gorgeous flowy white dress, themselves in lovely off-the-shoulder pink flowy gowns. 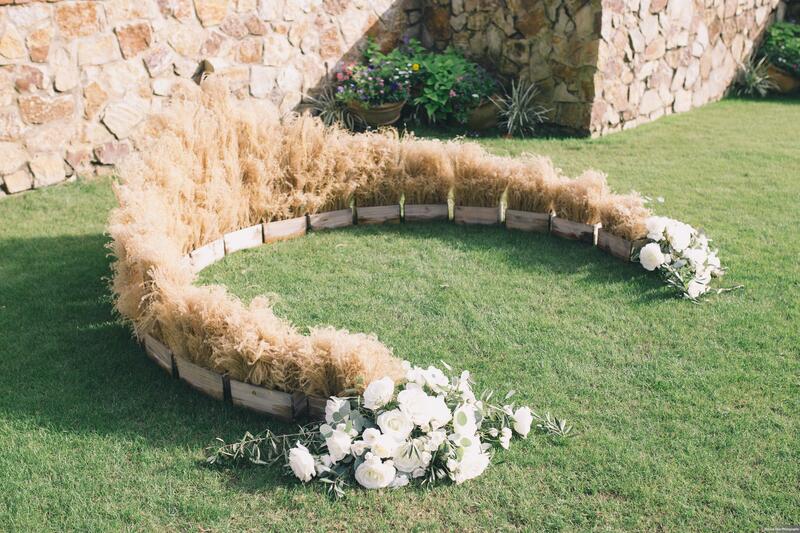 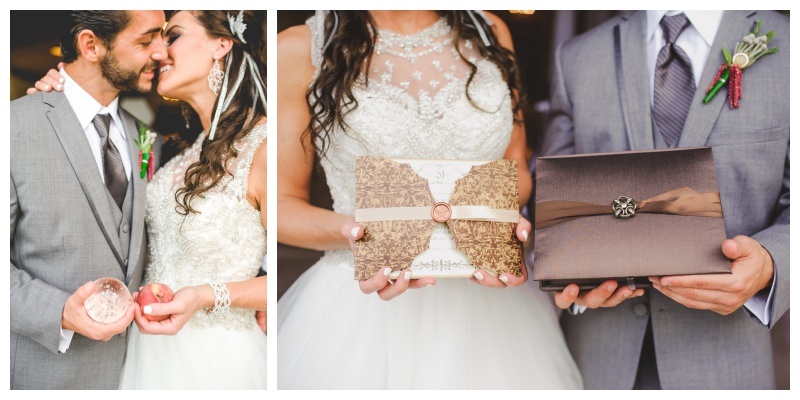 The bride wore beautiful jewelry as well, and the bride & groom rings were held in customized rustic wooden boxes. 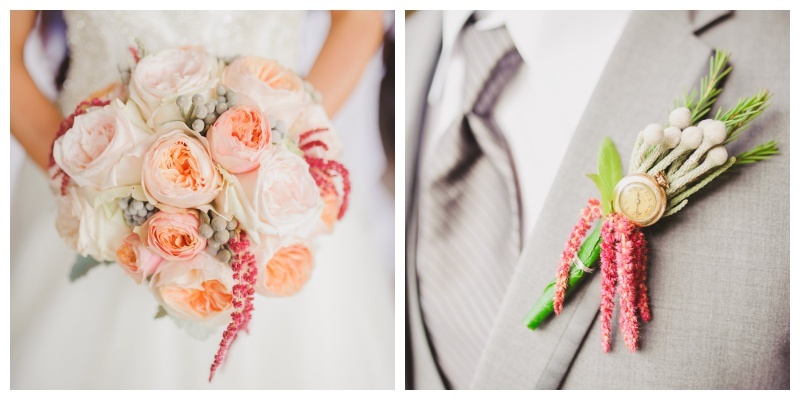 The bouquet and boutonnieres were arranged by Flowers by Lesley, mainly shades of pink with some white accents. 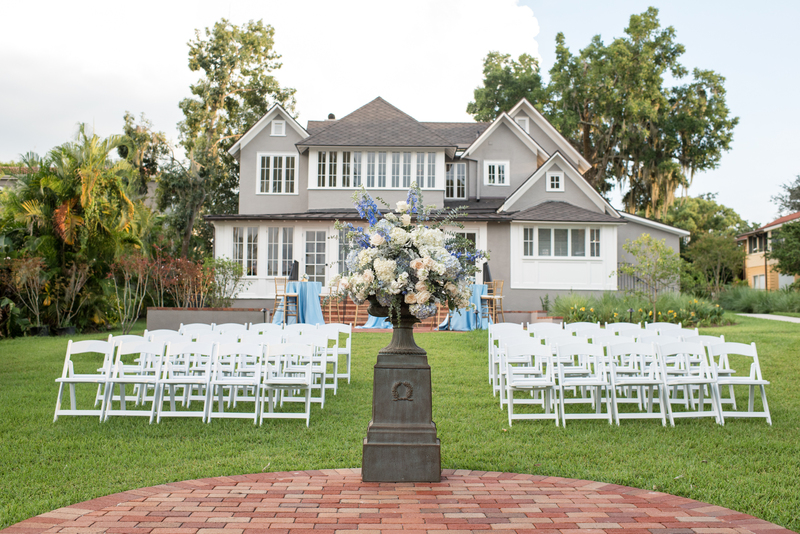 The ceremony venue at Leu Gardens was gorgeous, with rose bushes in the background and flowers all around. 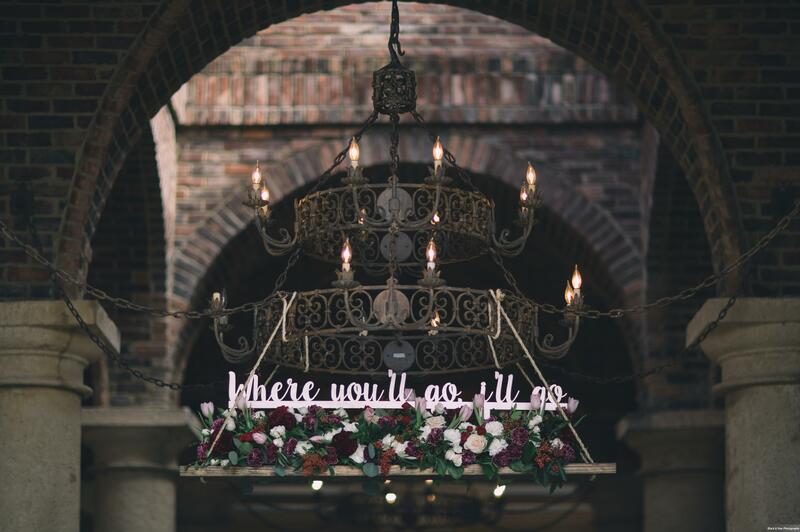 Ashley and Jason set up a wooden “Best Day Ever” sign to welcome guests to the venue, and down the aisle there were birdcages full of flowers set upon squares of turf to highlight the garden atmosphere. The ceremony was just as beautiful as the garden it was held in. 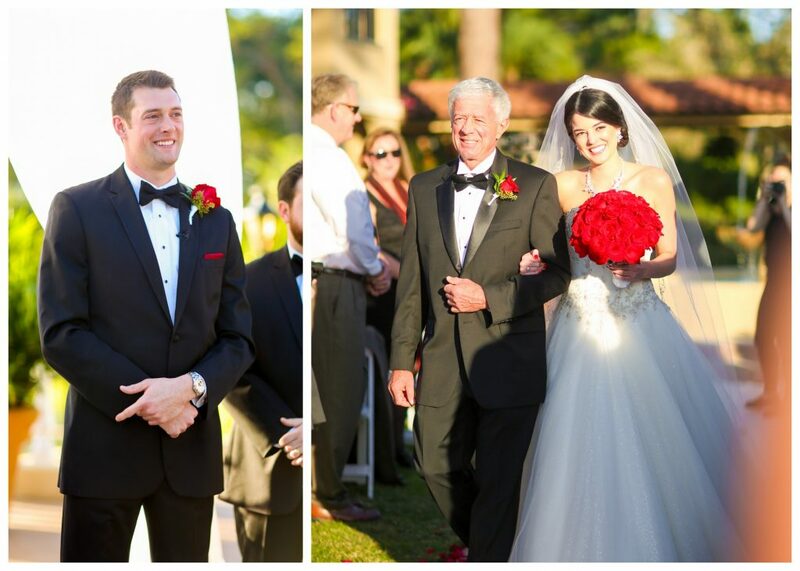 Ashley was walked down the aisle by her brother to her waiting groom. 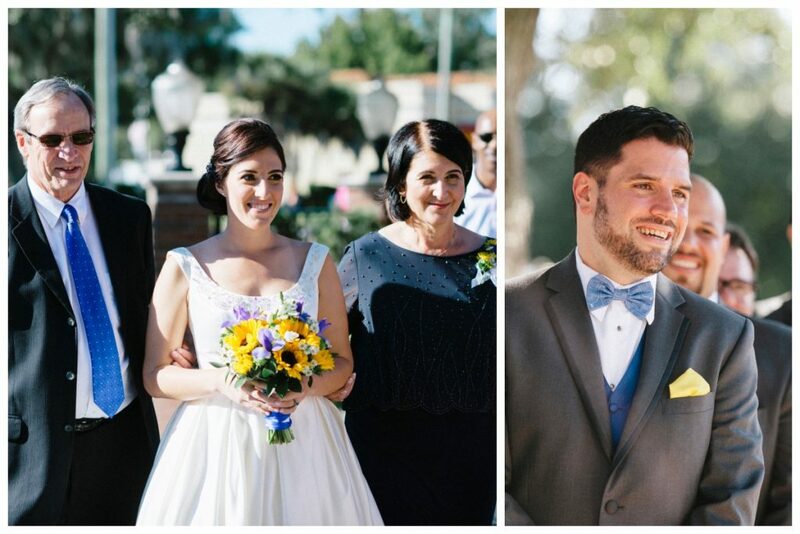 Every one of them was visibly elated and full of love. 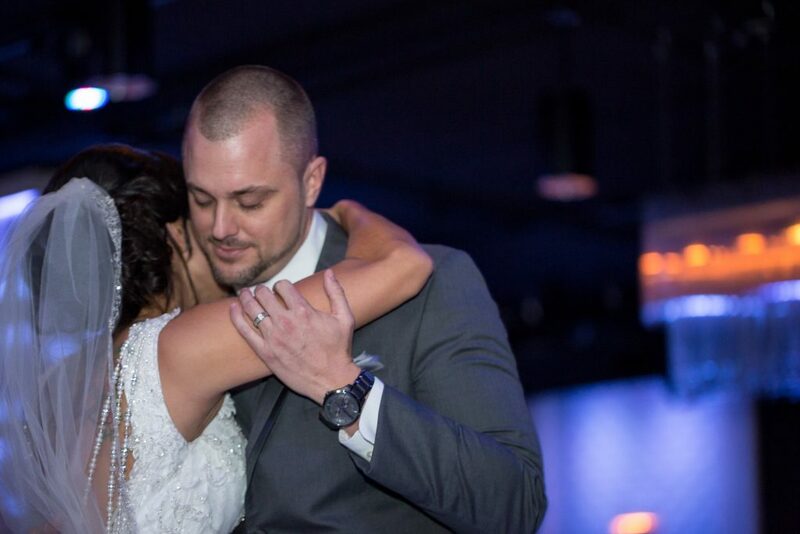 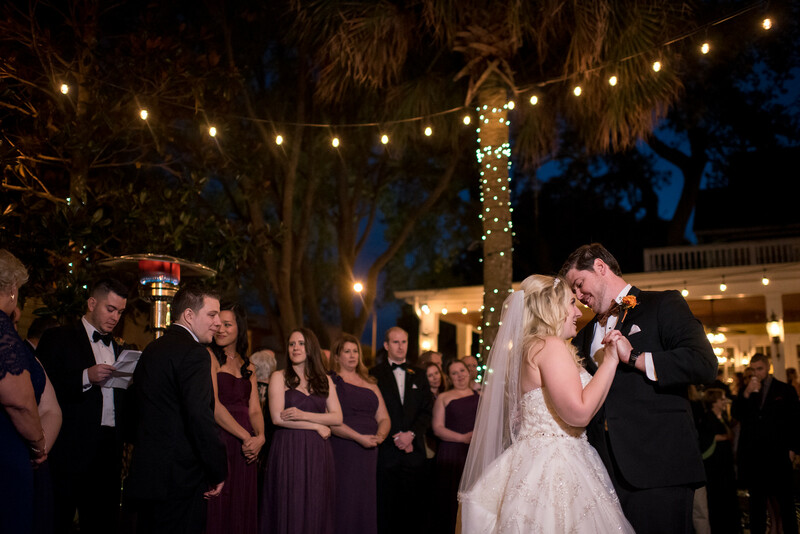 Before we knew it, Ashley and Jason were pronounced man and wife, and they kissed for the first time as a married couple! 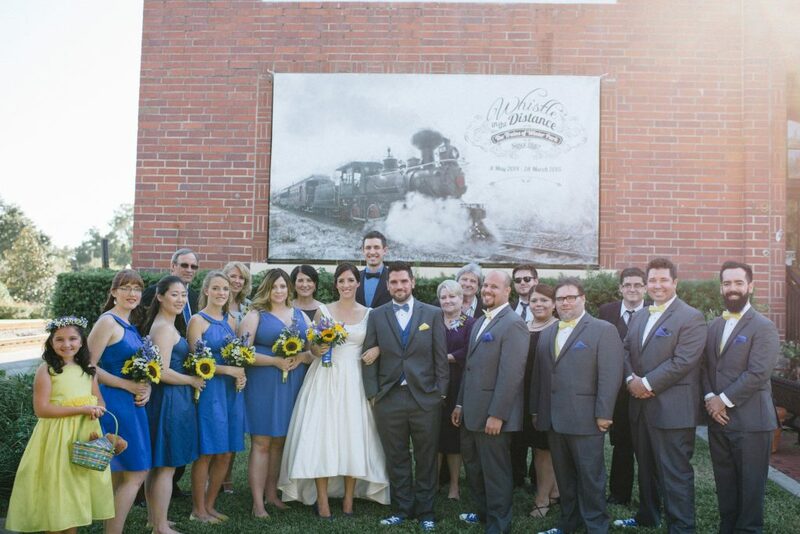 Following the ceremony, the wedding party met with Ashley and Jason for a quick photo shoot. 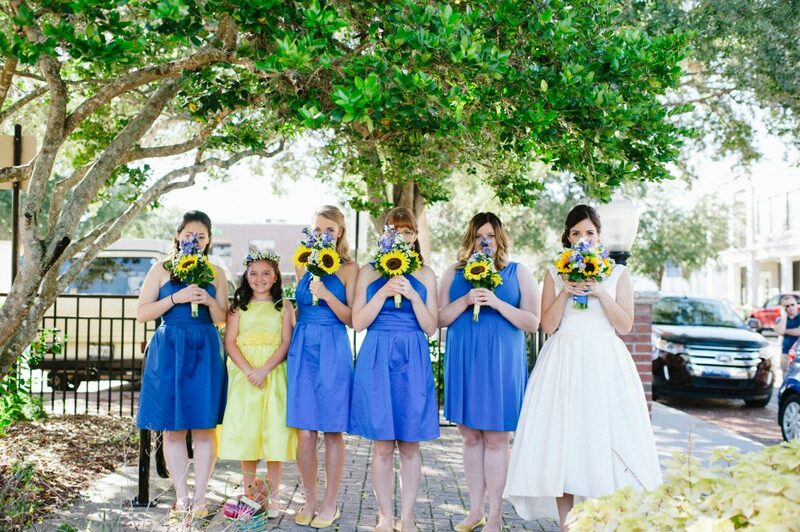 The ladies showcased their beautiful bouquets by Flowers by Lesley, and the happy couple took photos with their custom-made parasol that was painted to say “Best Day Ever”. 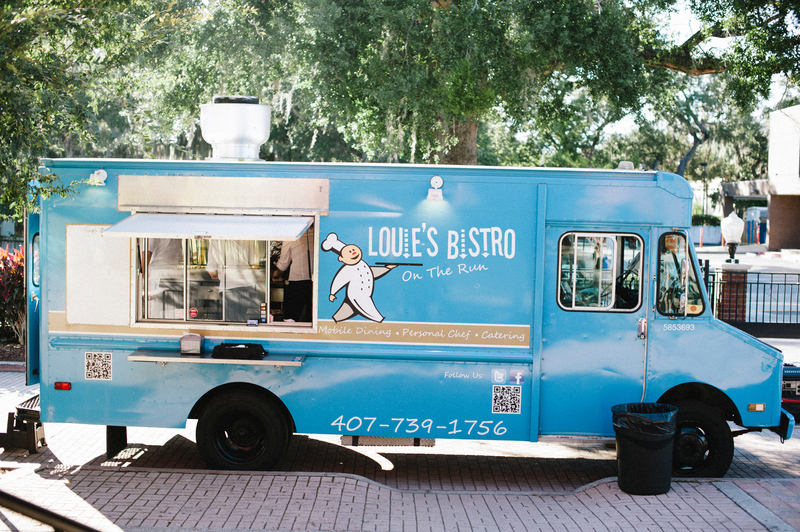 The guests moved from Leu Gardens to the reception venue, Winter Park Farmers Market. 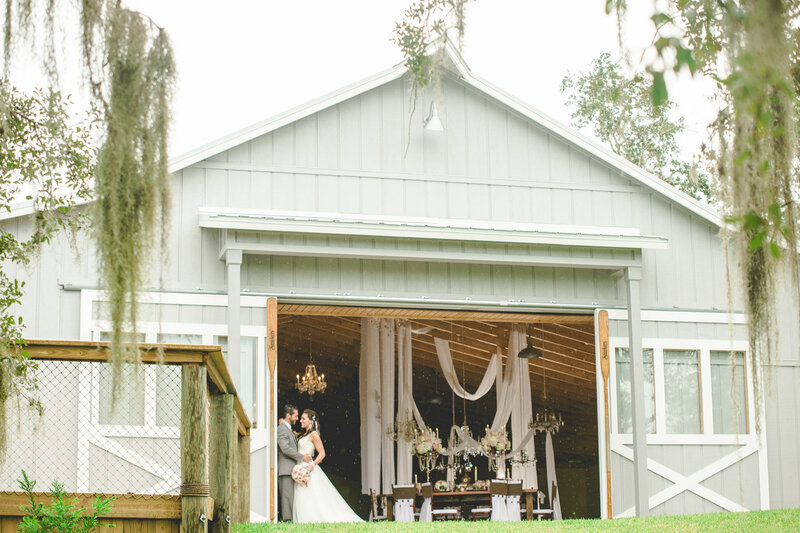 With a rustic barn feel, it was the perfect setting for Ashley and Jason’s wedding to continue. 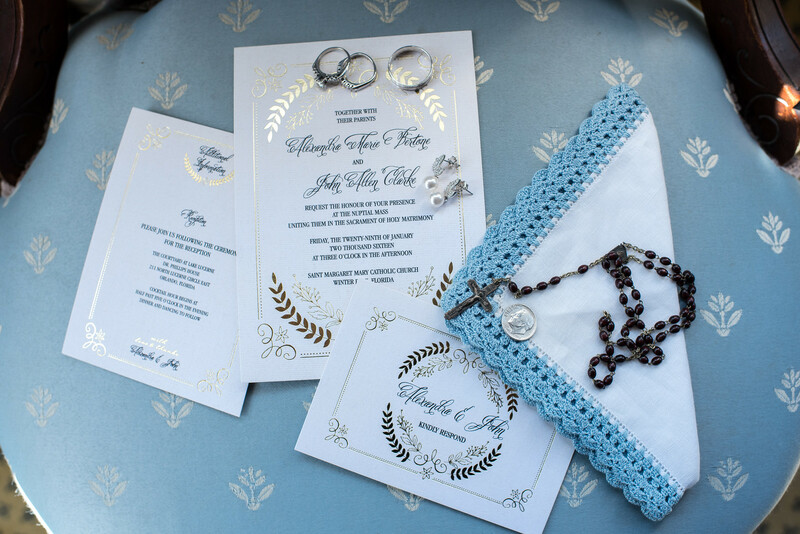 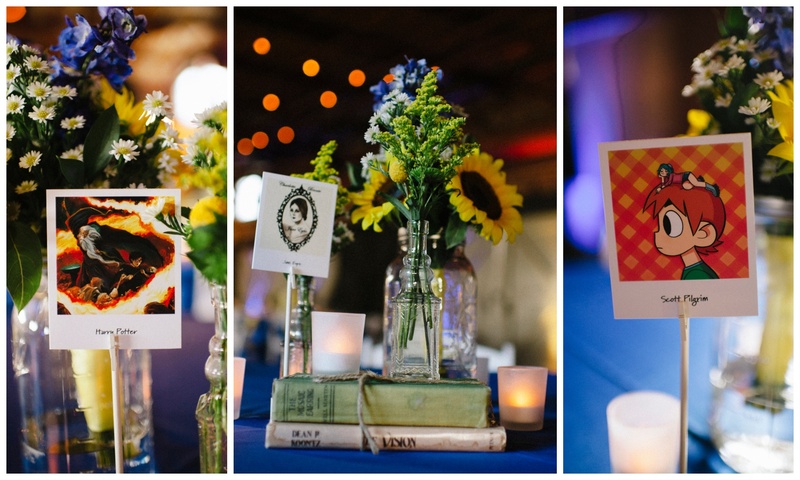 As they entered, the guests were greeted with the guestbook and card box, a “Forever & Always” tribute to lost loved ones, and a very creative form of seating assignments – tags made like bookmarks sticking out of folded-up book pages. 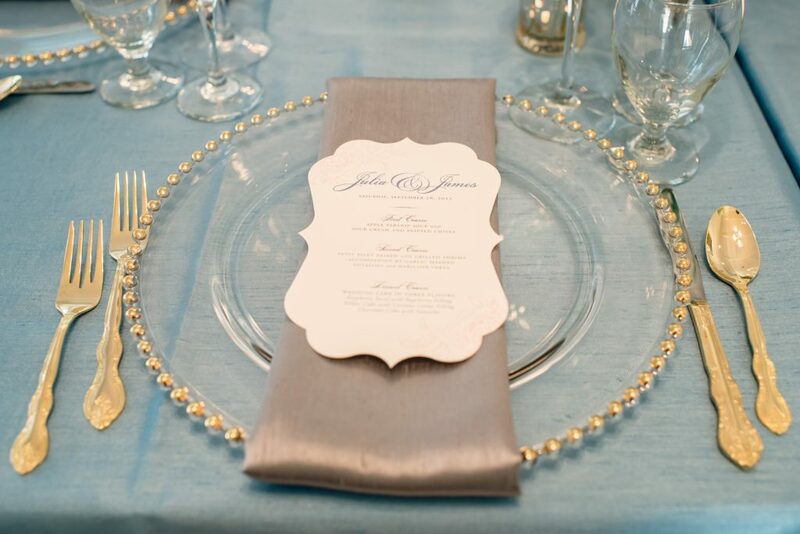 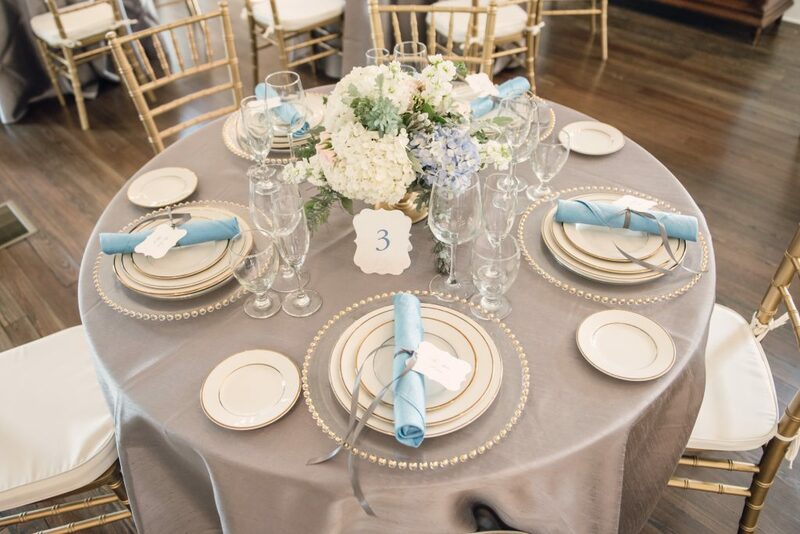 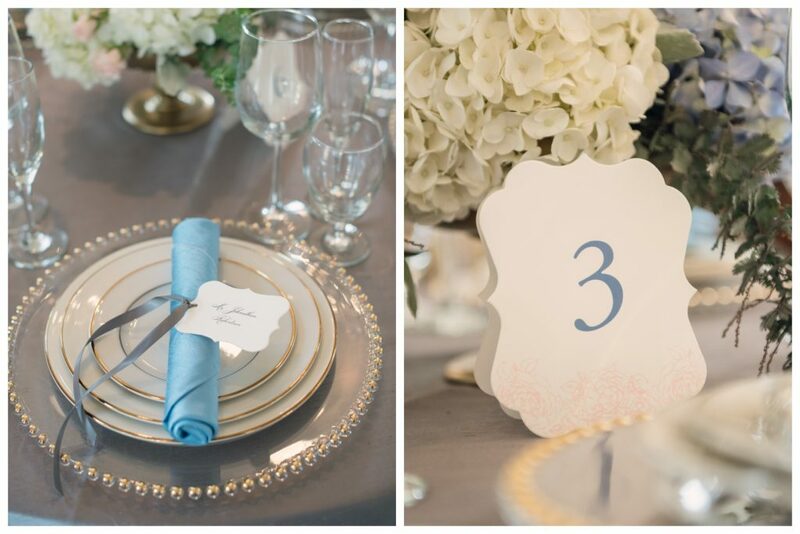 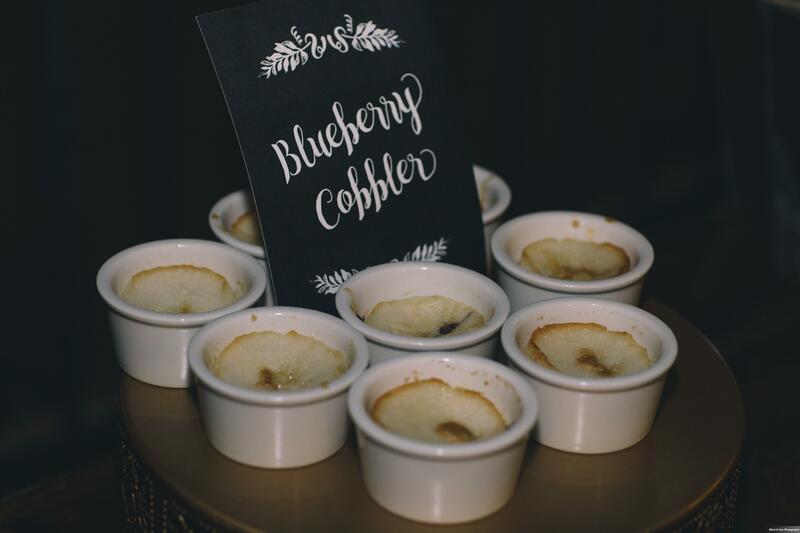 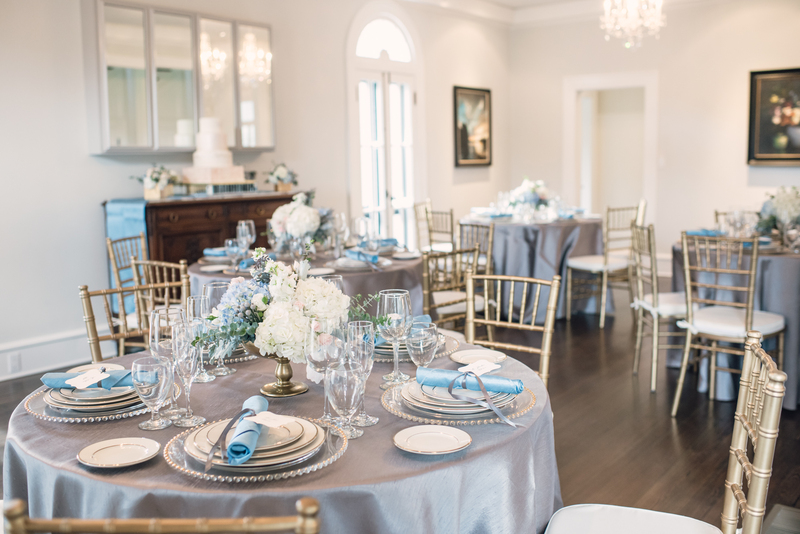 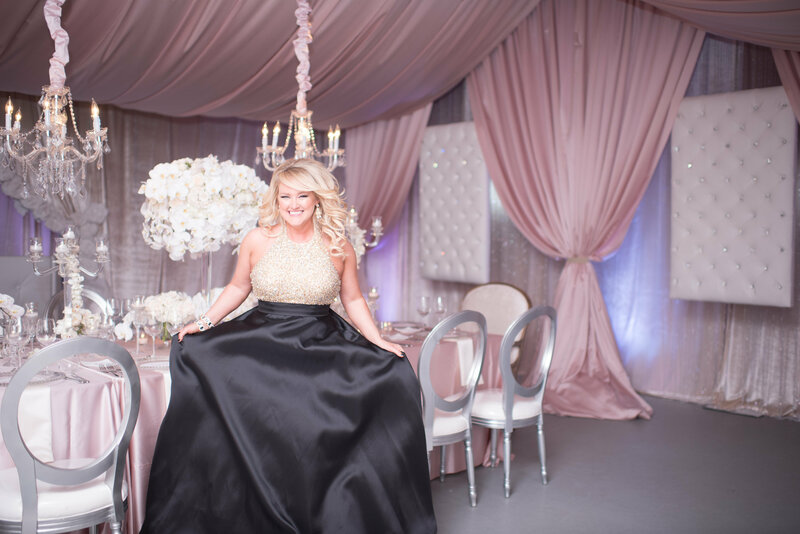 The tables featured blue linens and birdcage centerpieces like those at the ceremony, and the sweetheart table featured many accents of gold, such as the “Mr & Mrs” cut-outs. 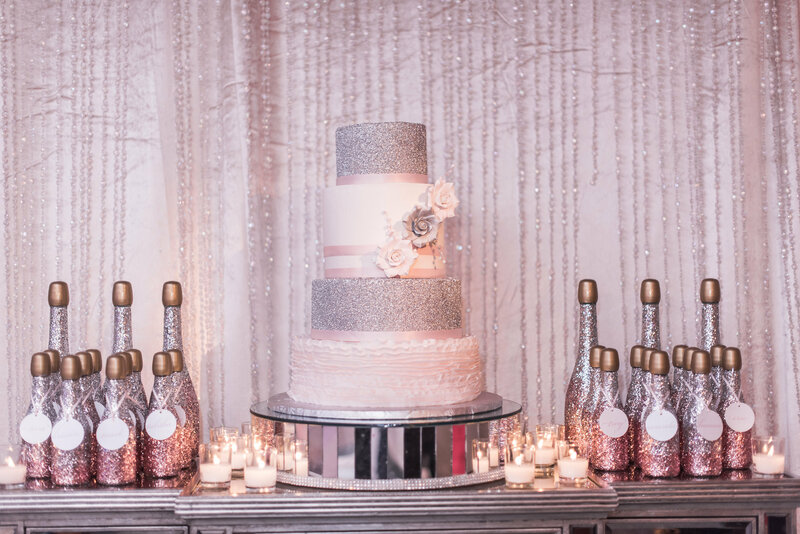 At last, the cake from Cakes by Rian, gorgeous and covered in pink flowers and bedazzles, was topped with a “Best Day Ever” cake topper. 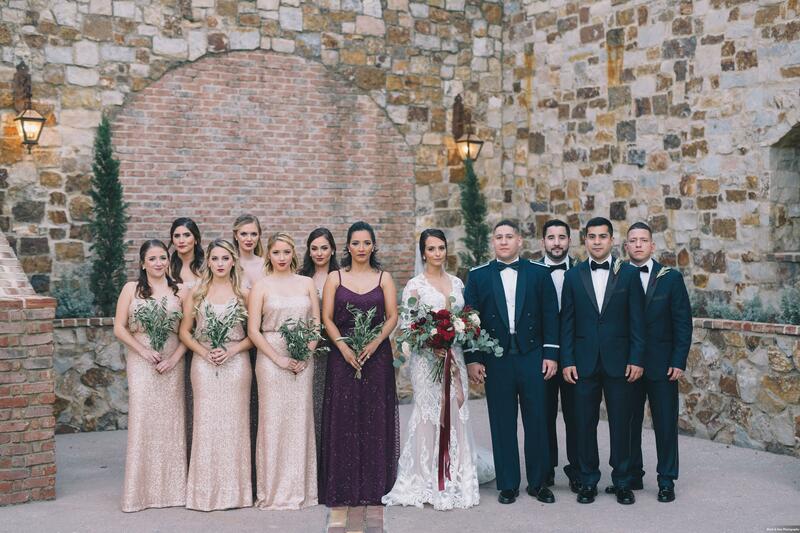 The reception began with the bride and groom’s arrival, revealing that the bride had changed into a gorgeous sparkly gold dress! 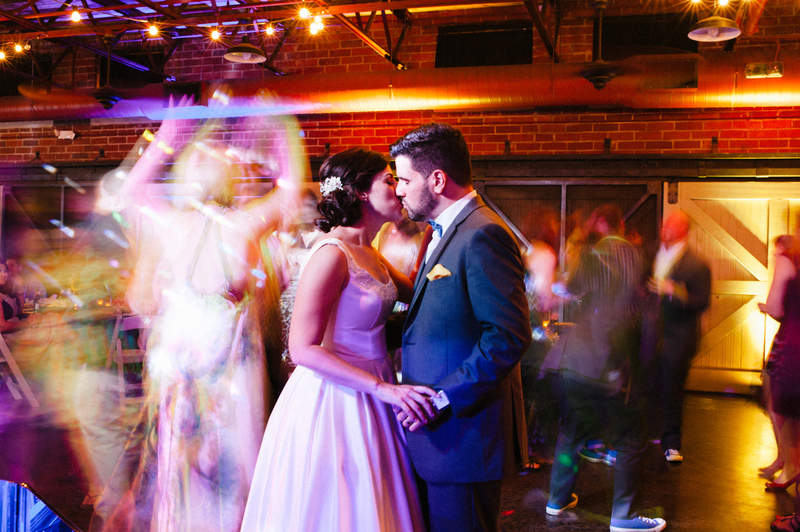 The happy couple had their first dance in the glowing barn lights, which made for some stunning pictures. 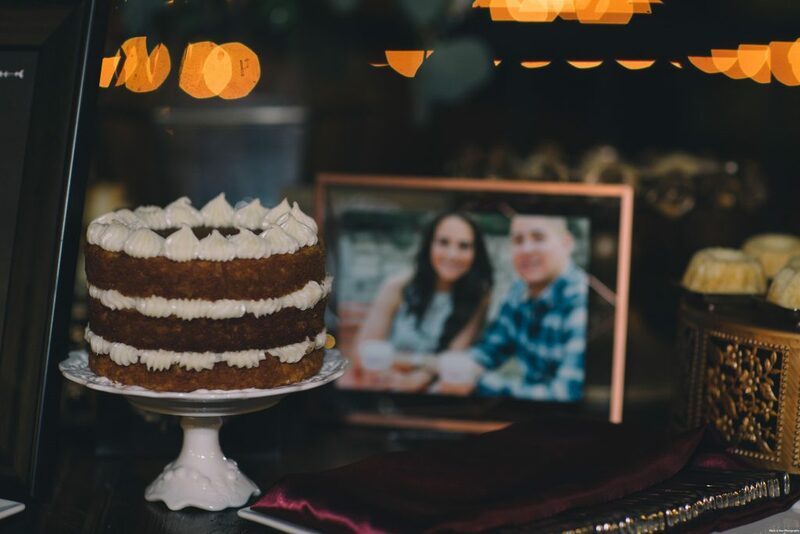 After a delicious dinner made by Pig Floyds Urban Barbakoa, the bride and groom cut their cake, tossed the bouquet, and tossed the garter, leading to many thumbs up from the bride. 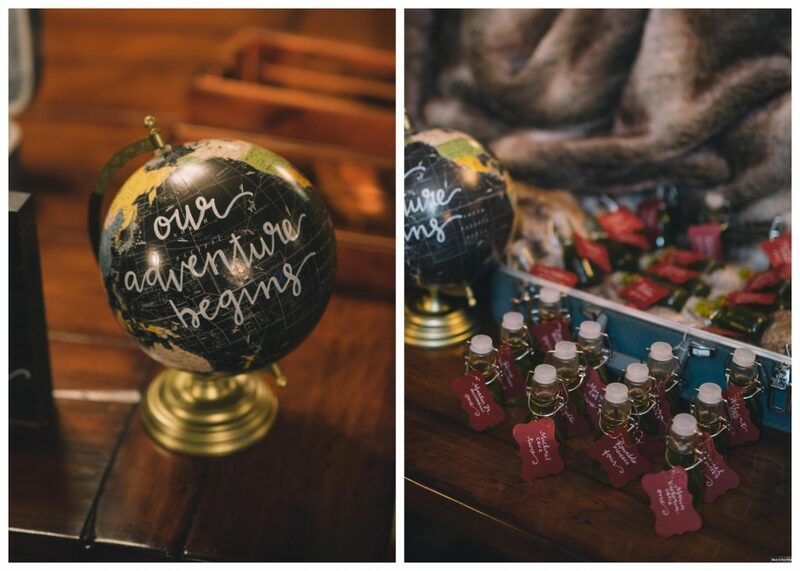 Our favorite touch of the reception was their idea to hand out boxes of Krispy Kreme donuts towards the end, each one of with a sticker that read “A sweet ending to a new beginning”. 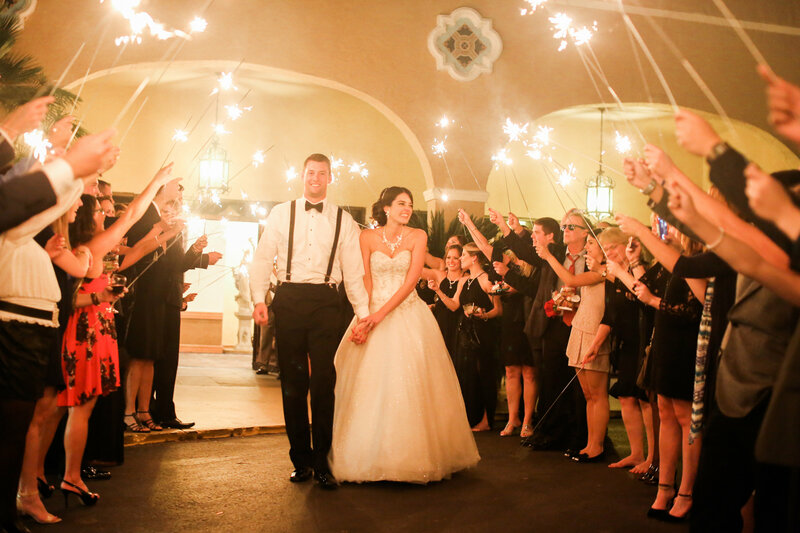 The night flew by, and before you could say “best day ever” it was already time for the grand exit through sparklers. 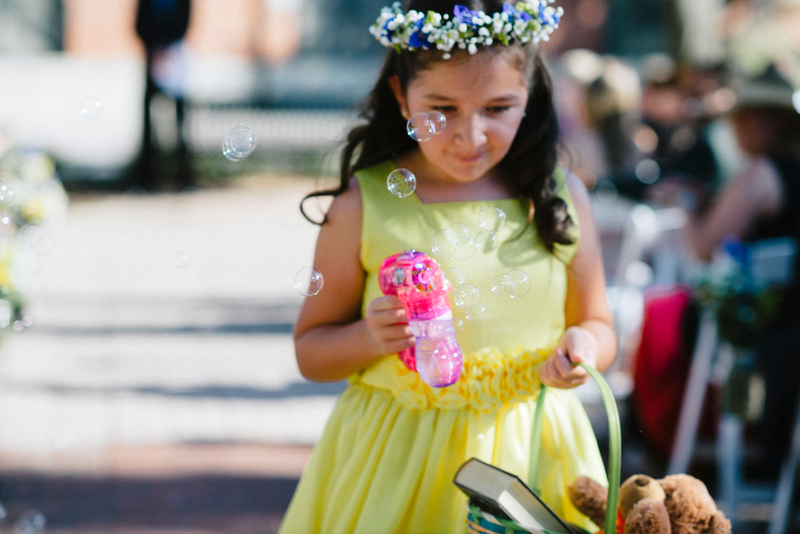 We handed out sparklers, each one with a little note that read “Let Love Sparkle!”. 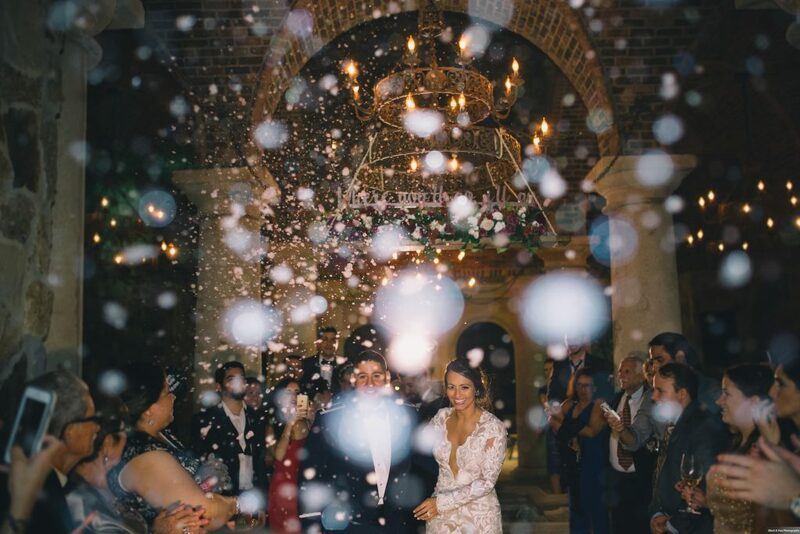 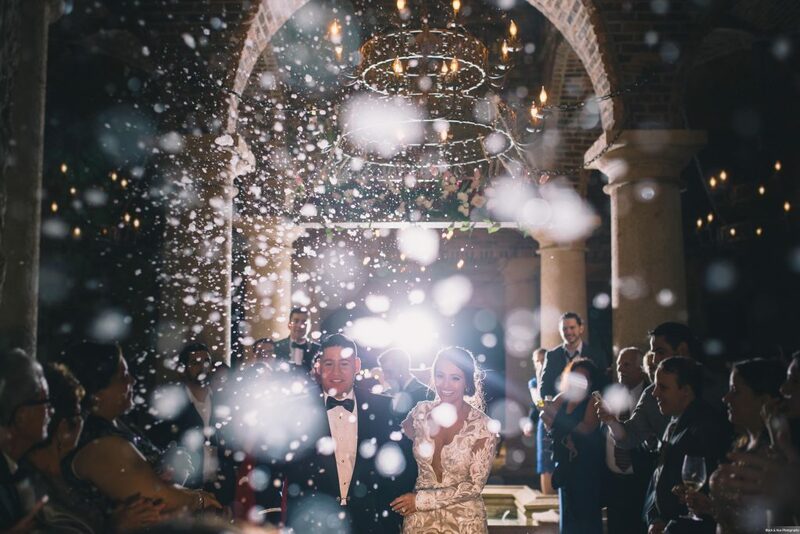 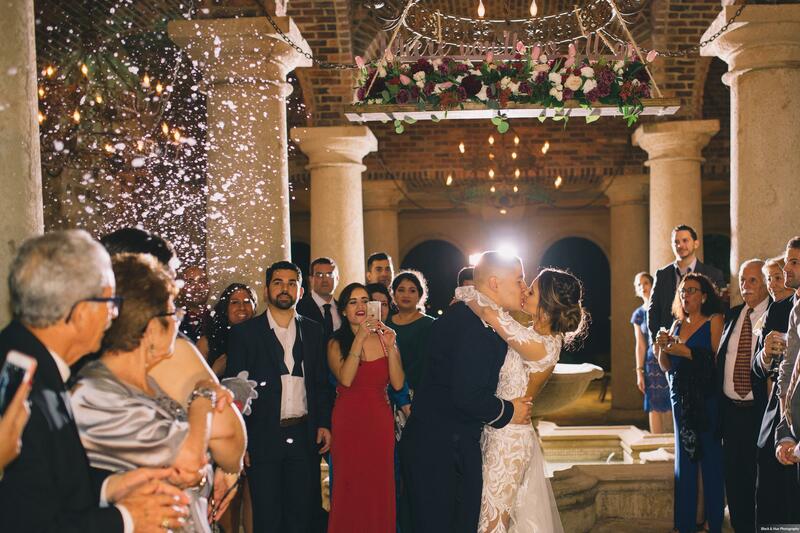 Ashley and Jason then walked through an archway of sparkles and stars, a perfect ending to their fairytale night – the Best Day Ever. 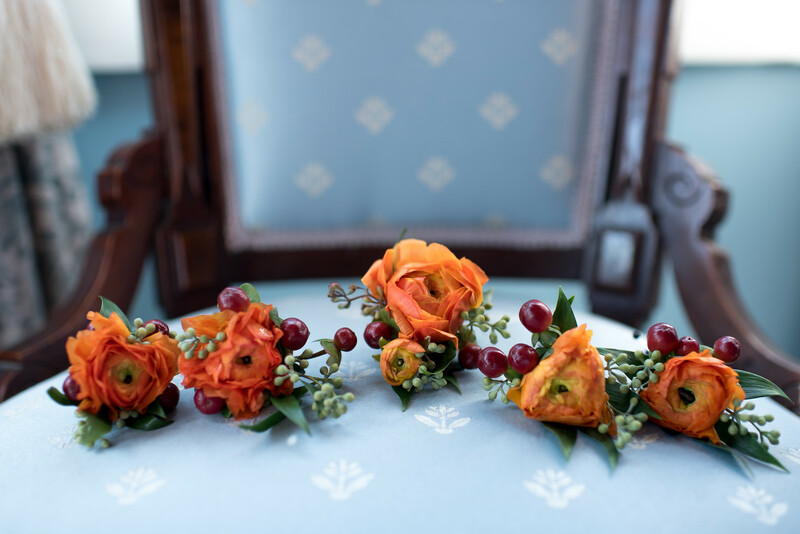 Our next blog post brings us to the end of January 2016, when we joined Alexandra and John for their classic plum & orange wedding. 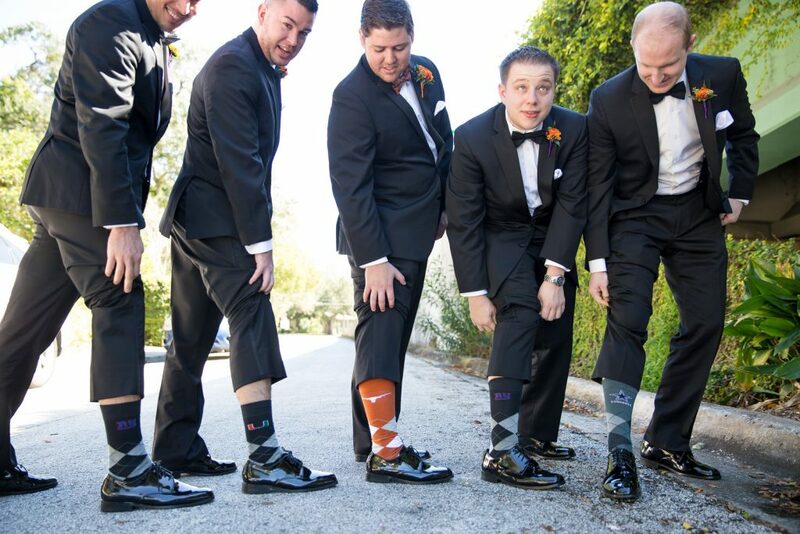 While most elements of the wedding were traditional, they added lots of personalized details based on their love for the football team, the Texas Longhorns – the groom’s cake featured a football, the guestbook was a jersey for guests to sign, and the groom wore logo-branded socks. 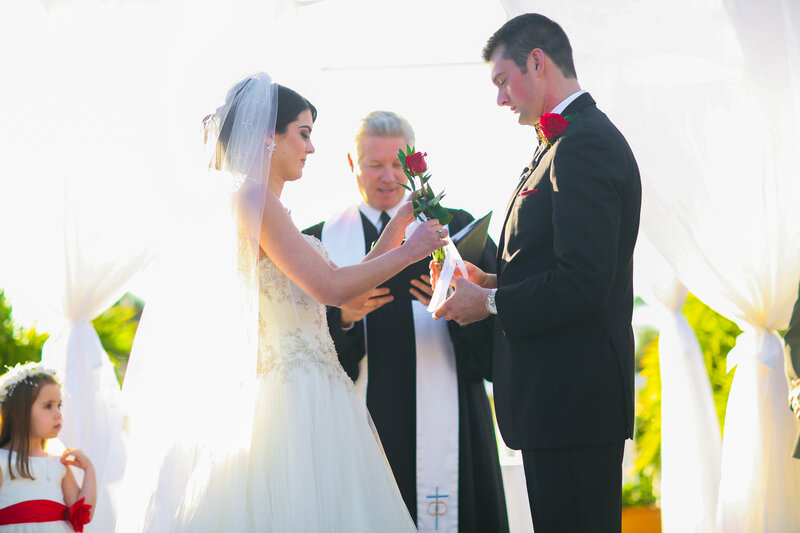 The ceremony was held at St. Margaret Mary Catholic Church, and the reception was held at The Courtyard at Lake Lucerne. 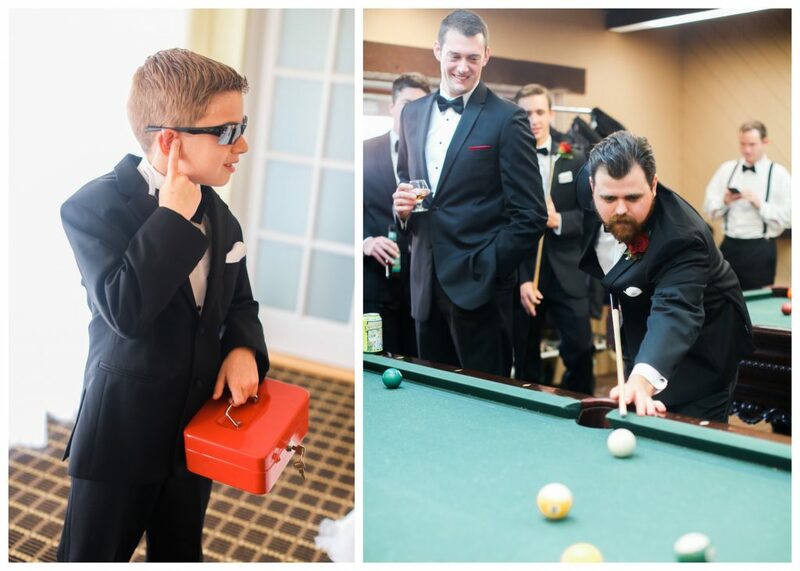 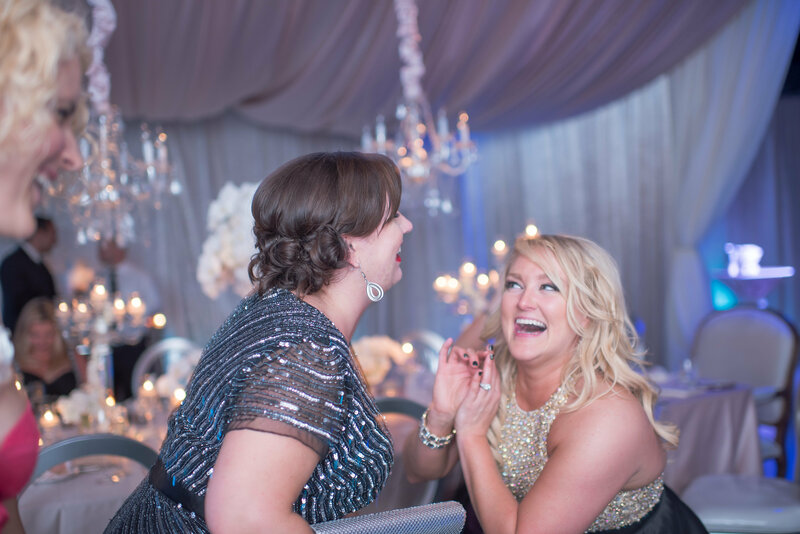 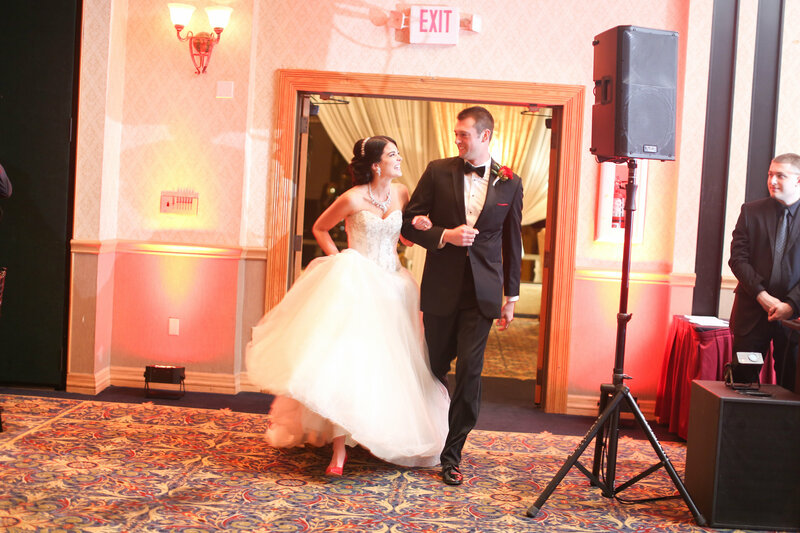 We had a wonderful time bringing this fun and classic wedding to life, and are happy to share the photos of their day with you thanks to Kathy Thomas Photography. 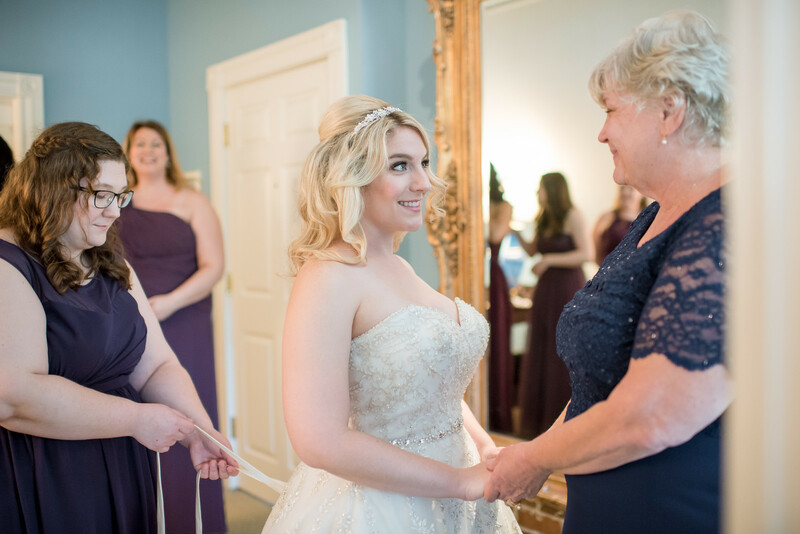 Alexandra got ready with her bridesmaids and mother at The Courtyard at Lake Lucerne. 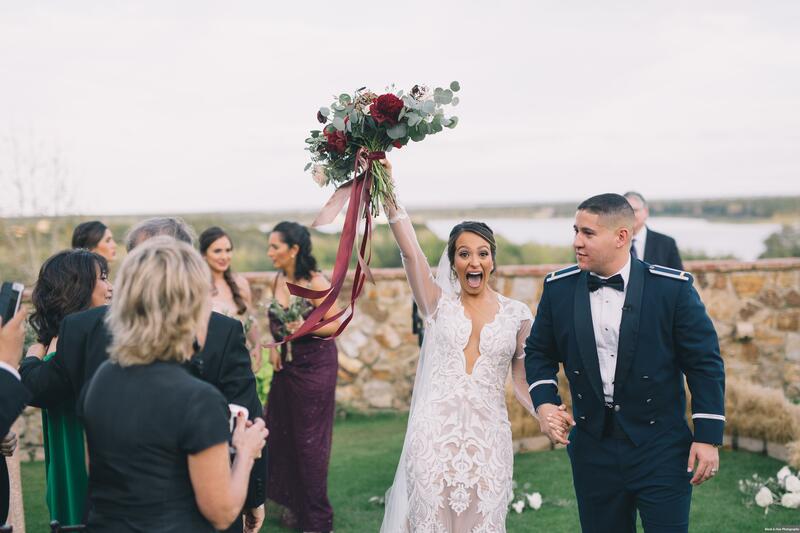 Her hair and make-up was done beautifully by Allie Workman and Jess Hasara, and her beautiful bouquet of purple, red, white, and orange was arranged by Flowers by Lesley. 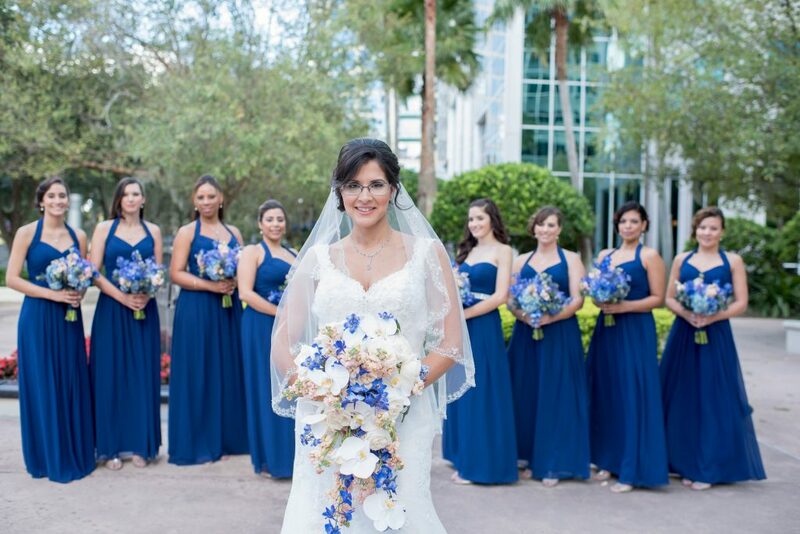 The bouquet featured a rosary, a personal touch for the bride. 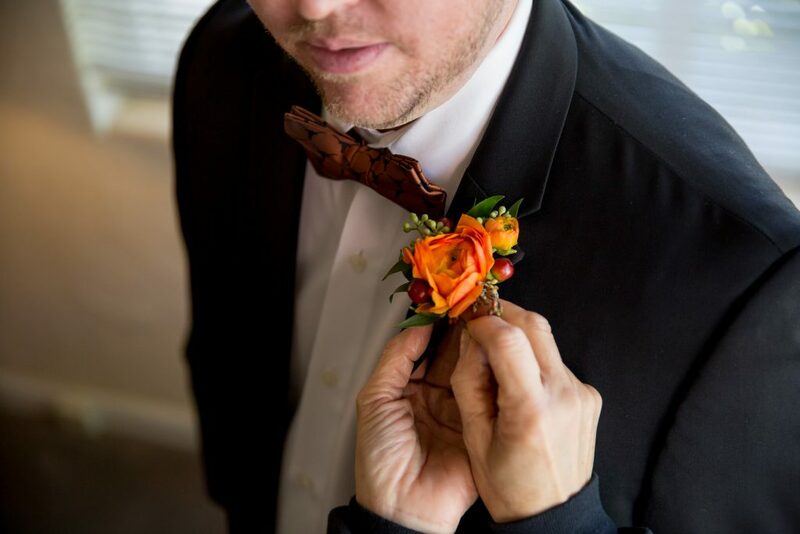 Meanwhile, John got ready with his groomsmen, pinning on their orange boutonnieres, also done by Flowers by Lesley. 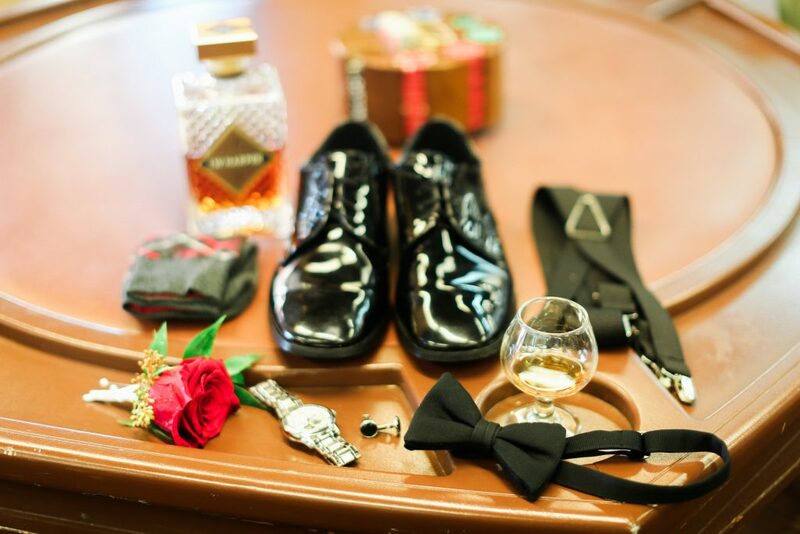 The gentlemen’s preparations were all about football: Besides their matching argyle socks featuring the logos of their favorite football teams, they also had a correlating logo-branded flasks. 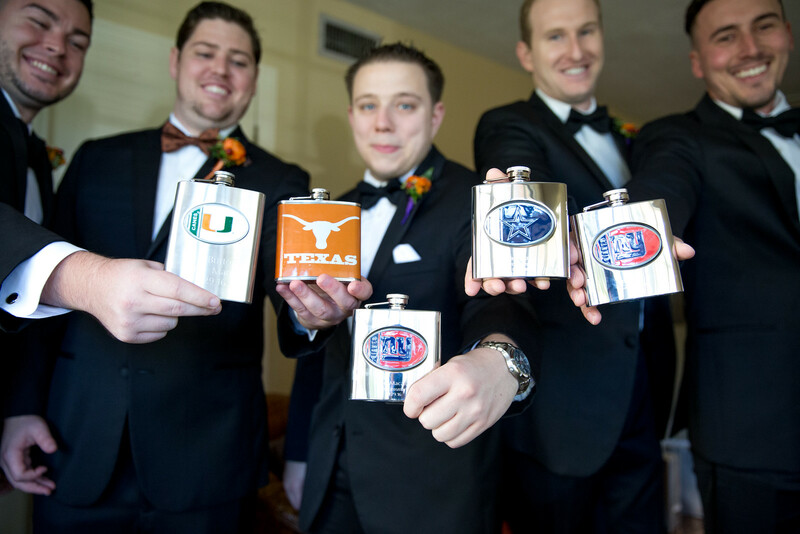 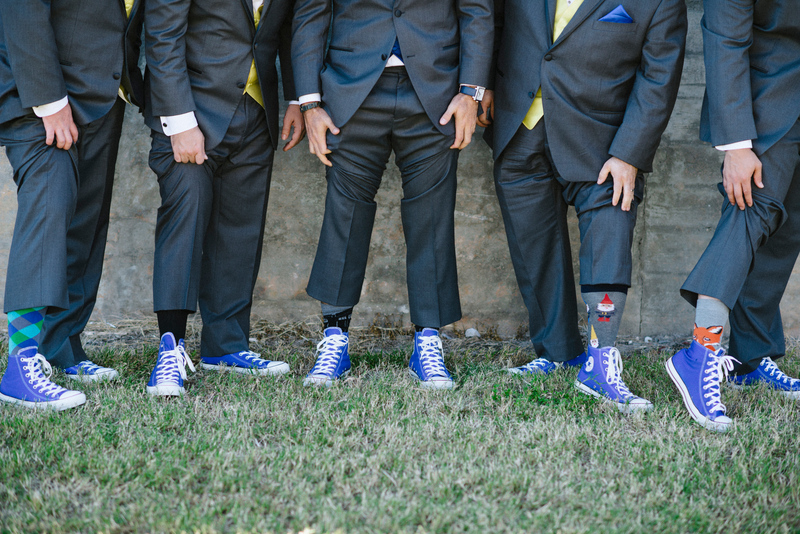 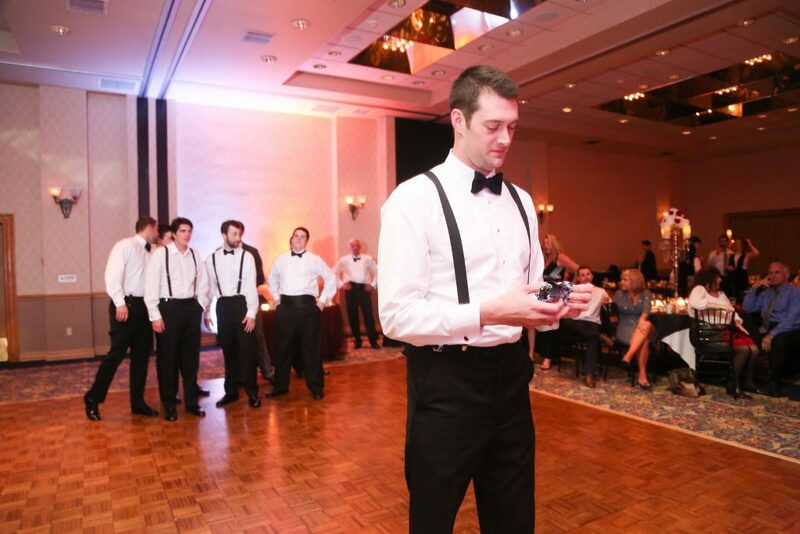 We thought it was such a fun idea to reflect the groom and groomsmen’s love of their teams. 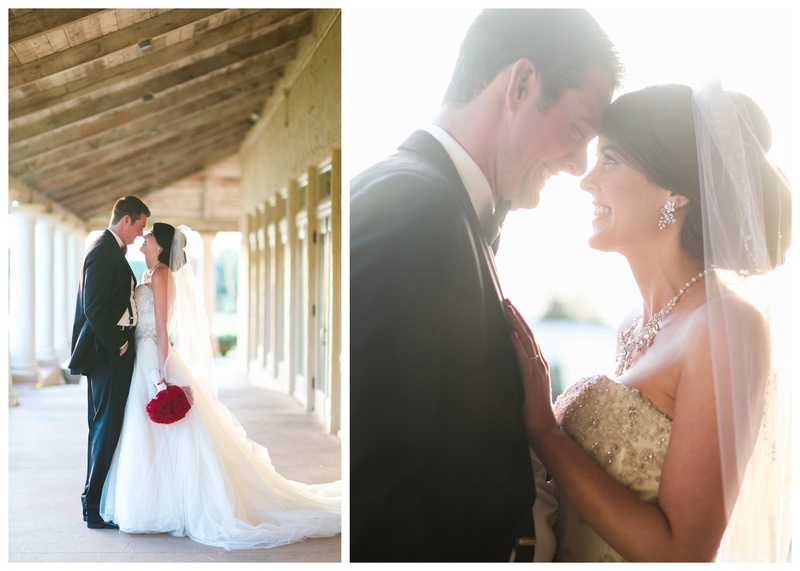 After getting ready, Alexandra and John decided to do a first look photo shoot before the ceremony. They met in the courtyard, and you could see the joy and love in both of their eyes when they first saw each other. 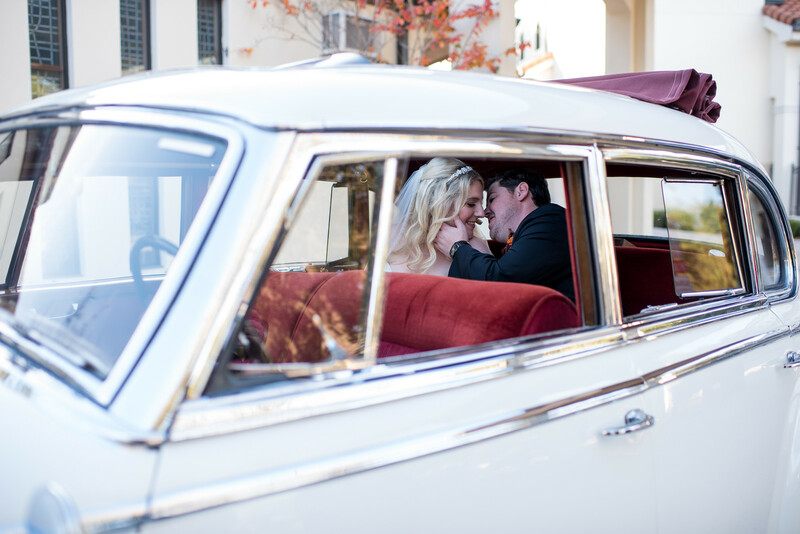 It was then time to make their way to the ceremony venue at St. Margaret Mary Catholic Church, and so the two took a ride in a classic Mercedes from Classic Cars Dave. 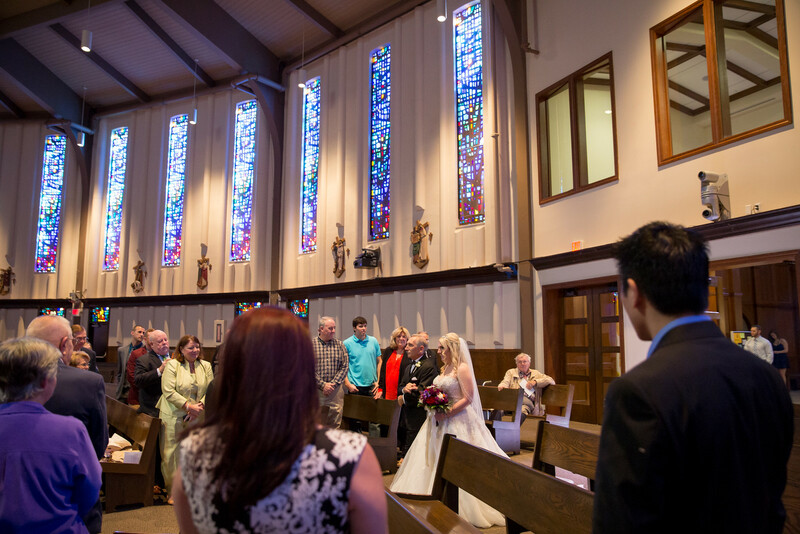 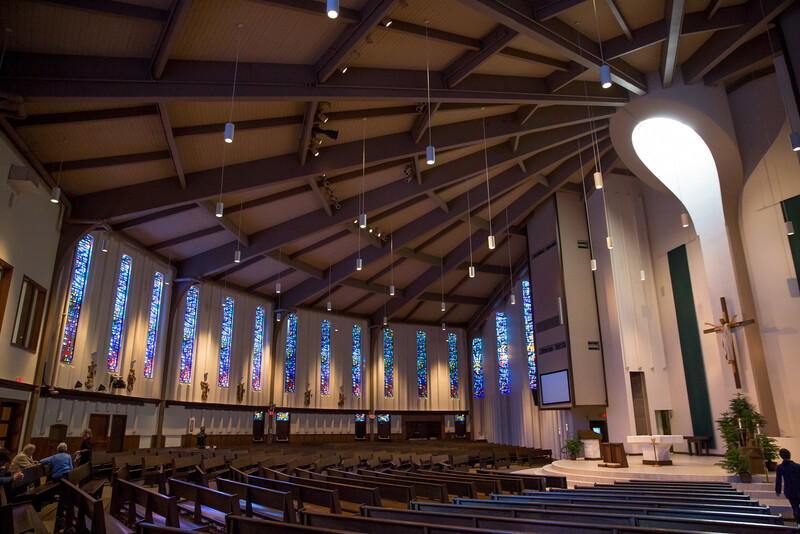 The ceremony venue, St. Margaret Mary Catholic Church, was gorgeous, and required no additional decorations. 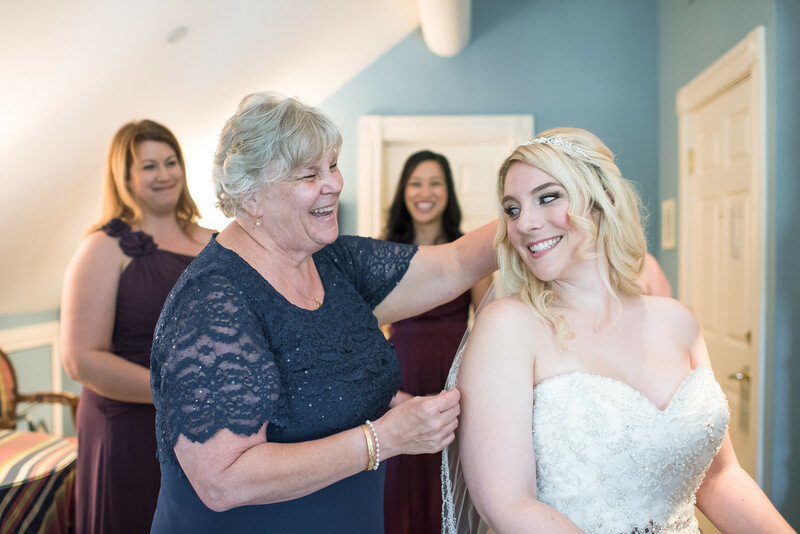 We merely added a few floral “Reserved” signs, and our hair & make-up team gave Alexandra a few last minute touches before she made her grand entrance. 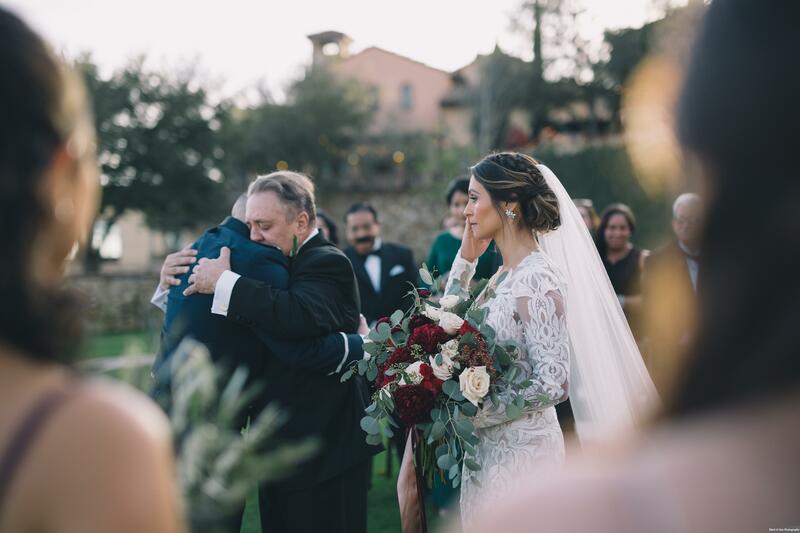 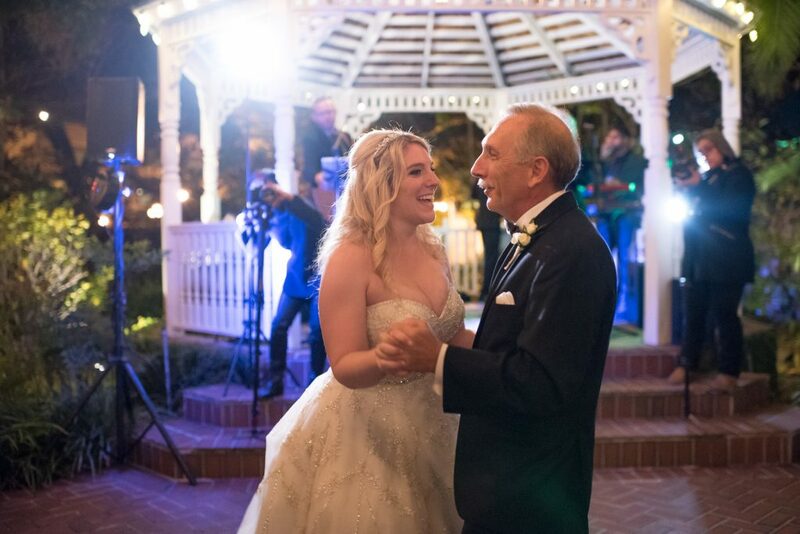 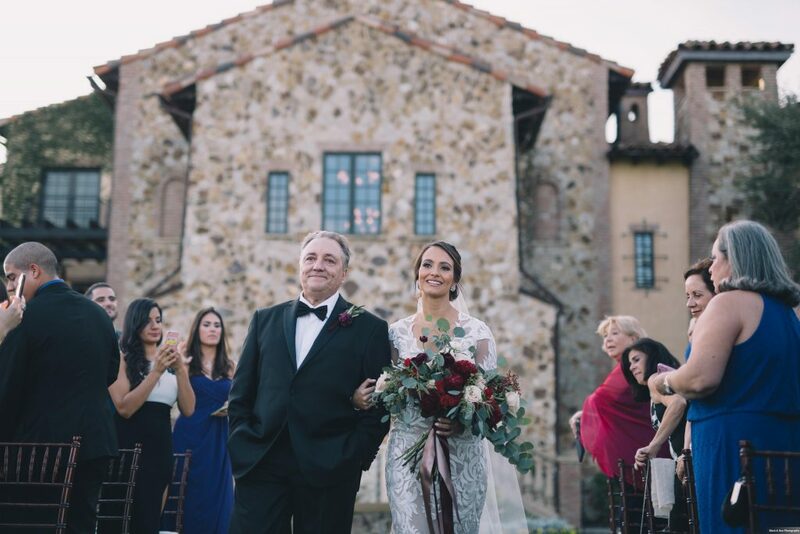 Alexandra was walked down the aisle by her father to her loving groom. 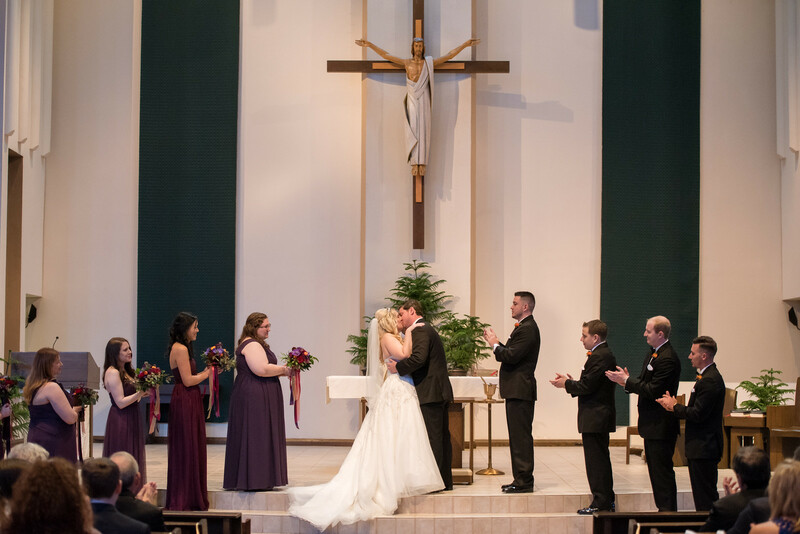 The high ceilings of the expansive church provided for an incredible background as Alexandra and John were pronounced man and wife, and kissed in front of their guests. 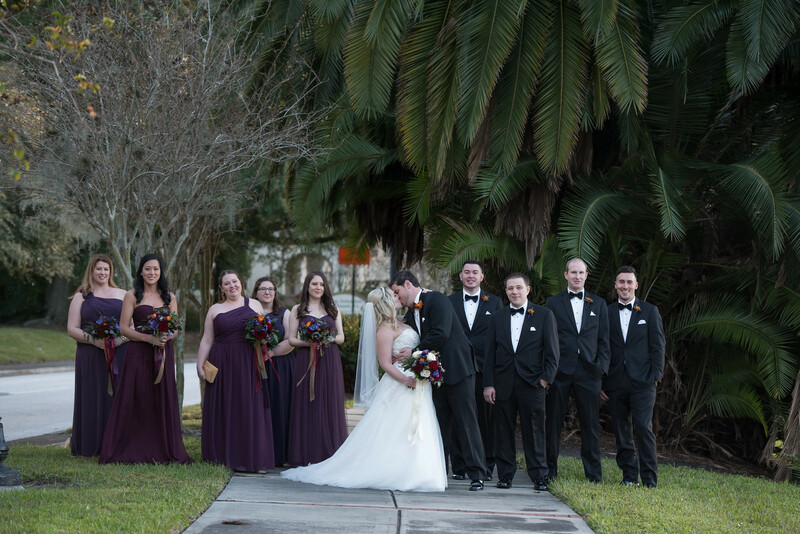 The wedding party then met for a quick photo shoot outside the church, and in no time it was time to return to The Courtyard at Lake Lucerne for the cocktail hour and reception! The guests went straight from the ceremony to The Courtyard at Lake Lucerne, where an outdoor cocktail hour was awaiting them. 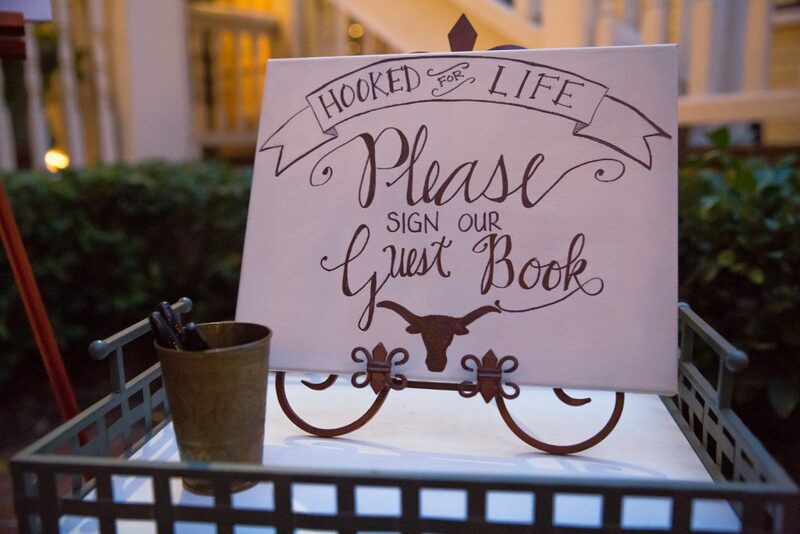 While waiting for the wedding party to arrive, they were able to sign the guestbook. 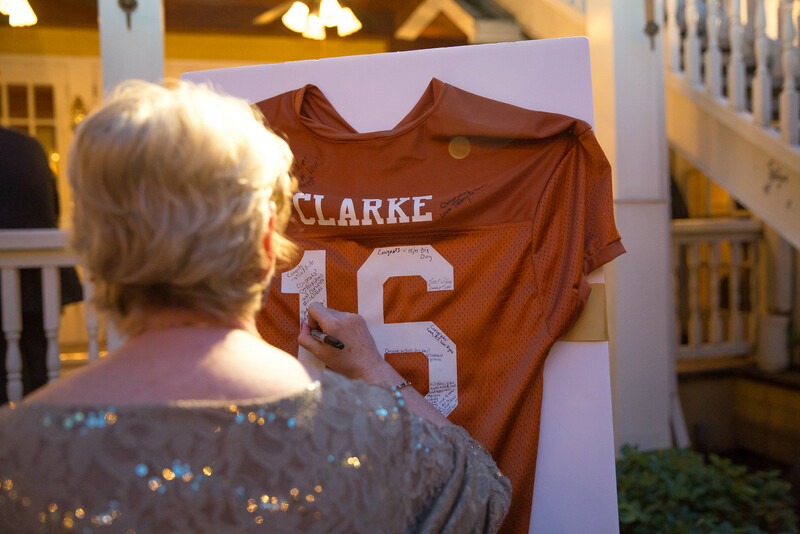 This was one of our favorite touches: rather than a book, the bride and groom made a Longhorns jersey that featured their now-shared last name “Clarke”, and had their guests sign that instead. What a fun idea! At last the bride and groom arrived, and had their first dance in the courtyard. 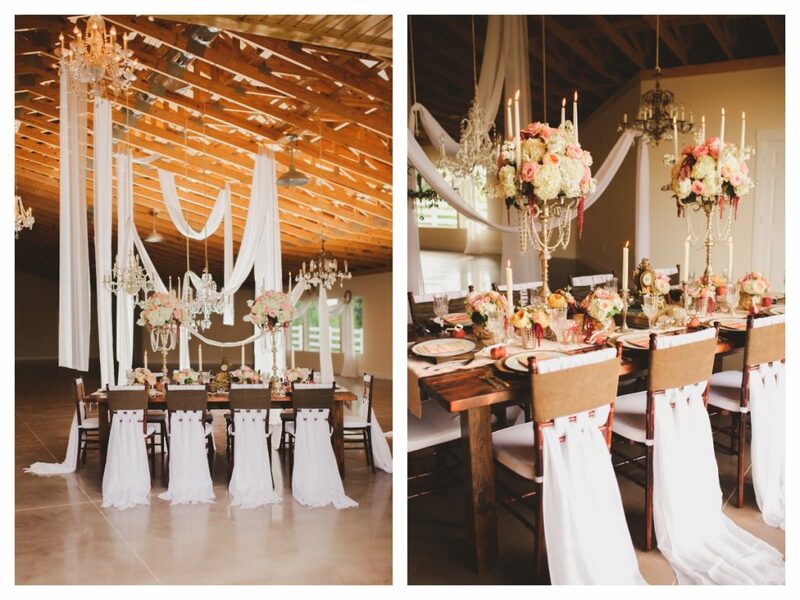 Then it was time to enter the beautiful dining room! 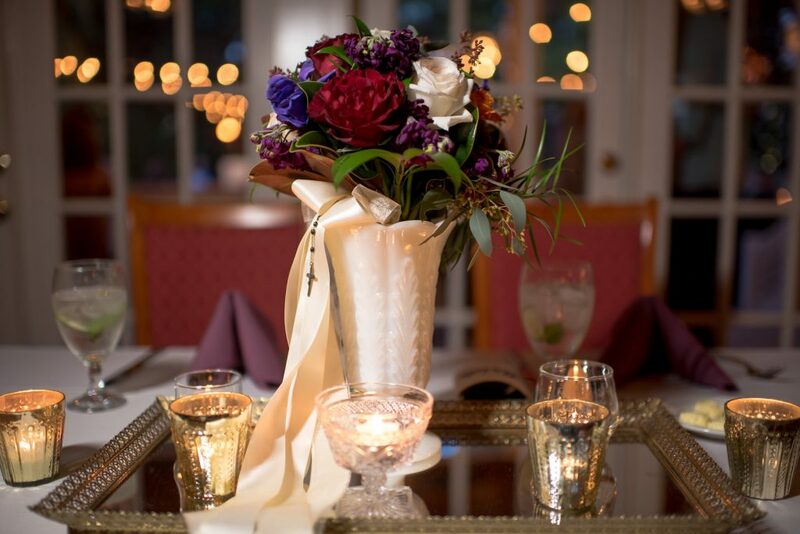 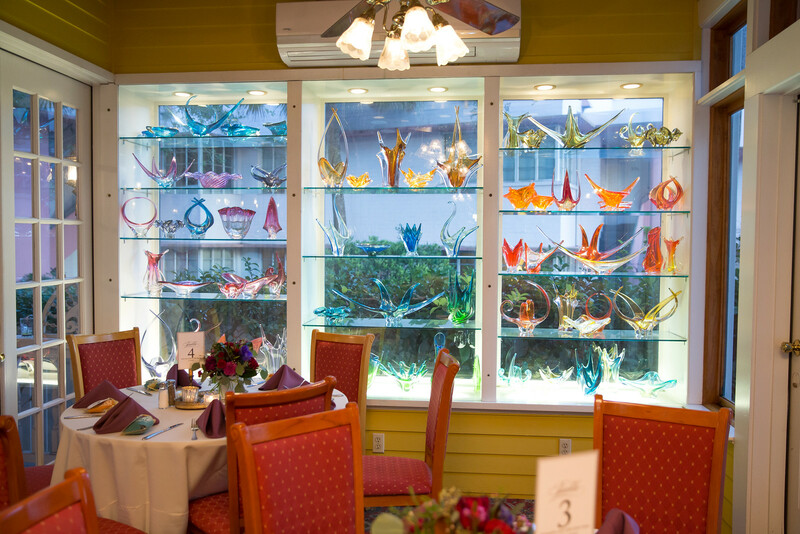 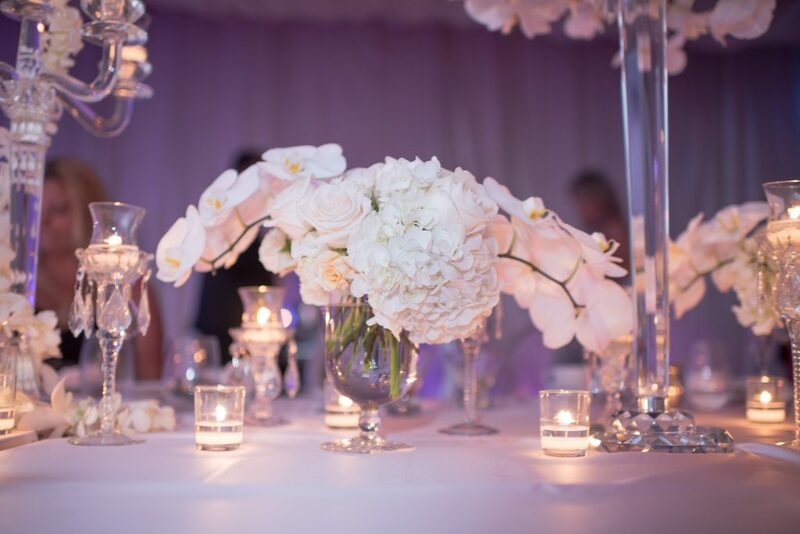 The reception dining room was gorgeously set – one window was filled with glass sculptures which caught the light, the tables were set with white linens and purple napkins, and the centerpieces were beautiful floral arrangements by Flowers by Lesley surrounded by candles. 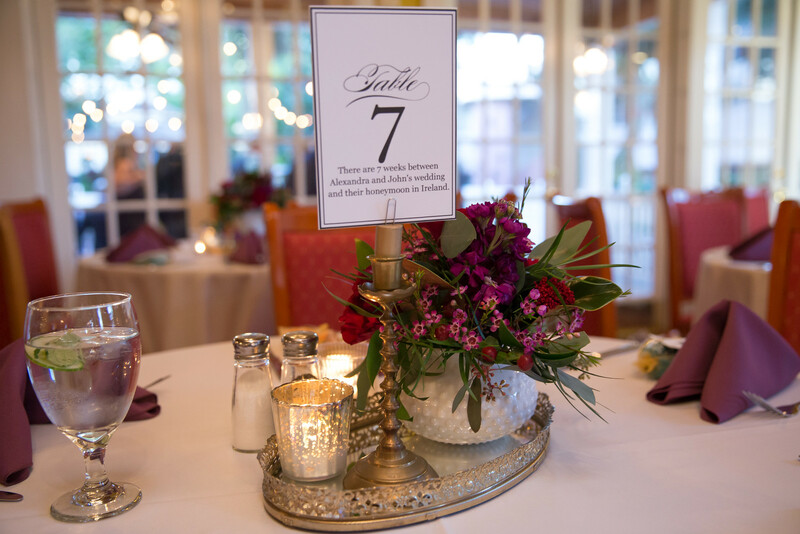 The table numbers were a fun touch – the bride and groom included a detail or memory from their relationship that correlated with each number (for example, for Table 7, the card said that there would be 7 weeks between their wedding and their honeymoon). 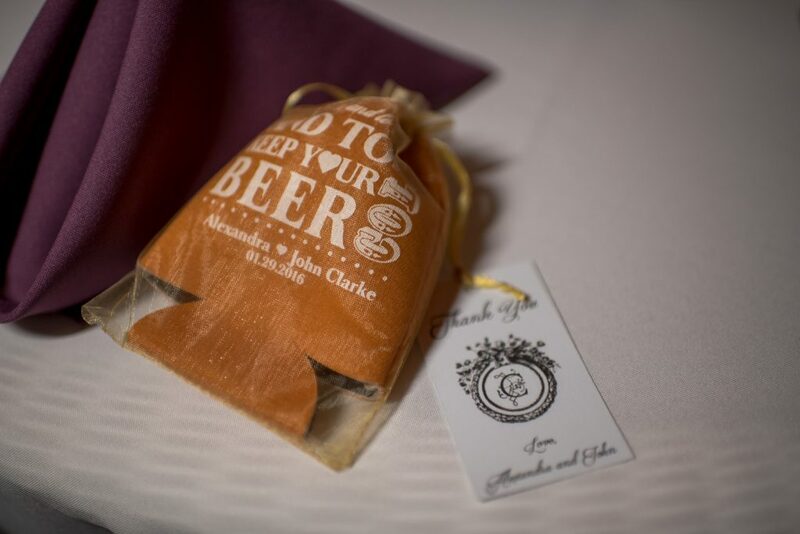 Another personal touch was their favors – each place setting was given a drink koozie in memory of the wedding. Finally, the card box was made to look like a mailbox for their “Wedding Post”, to be opened after the reception. 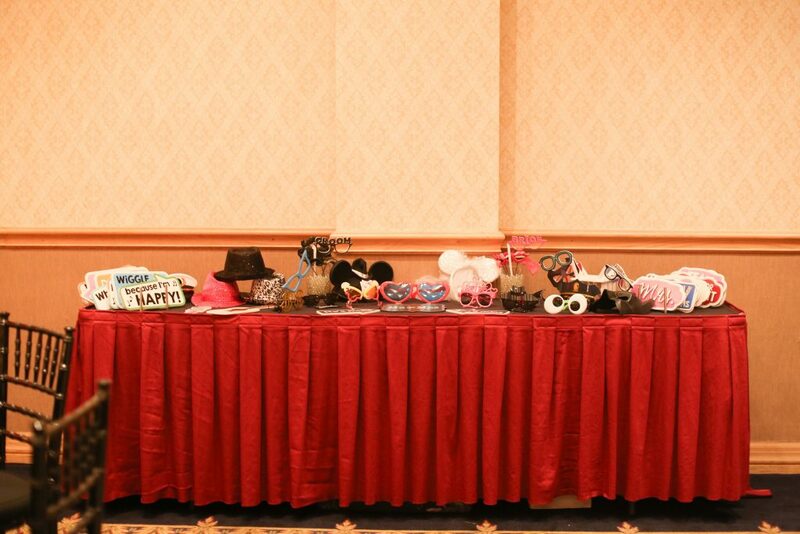 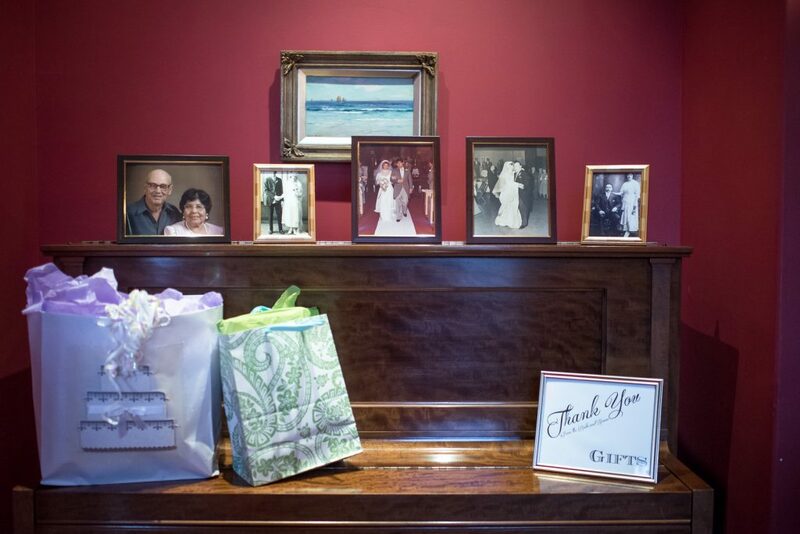 The mantle that held the card box and the piano that was used as a gift table also held photos for their “In Loving Memory” display. 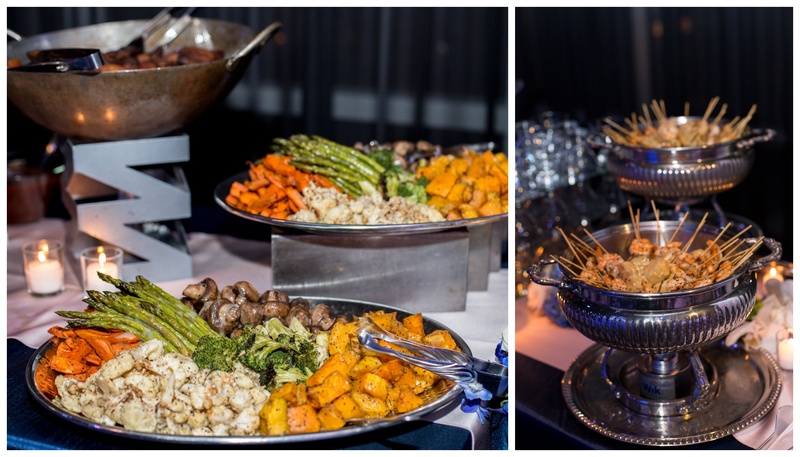 The guests made their way inside and helped themselves to a delicious buffet created by John Michaels Catering. 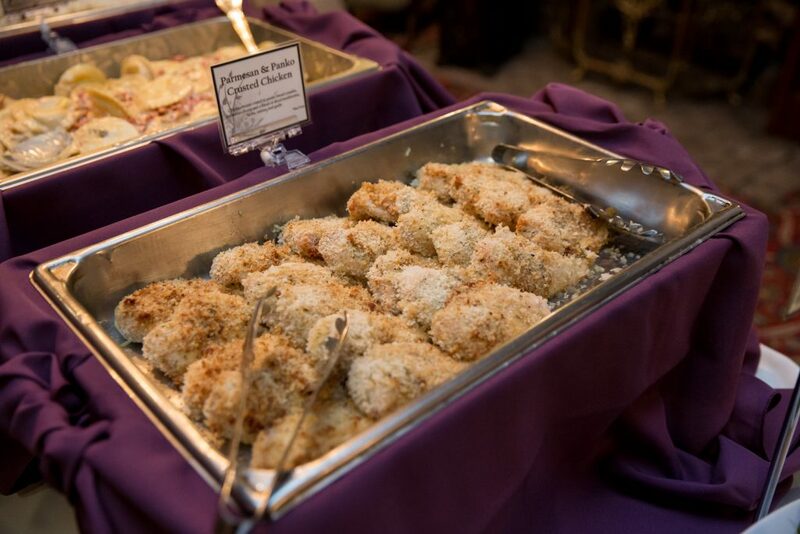 The food was a mix of classy and classic Southern food, from panko-crusted chicken garlic mashed potatoes. 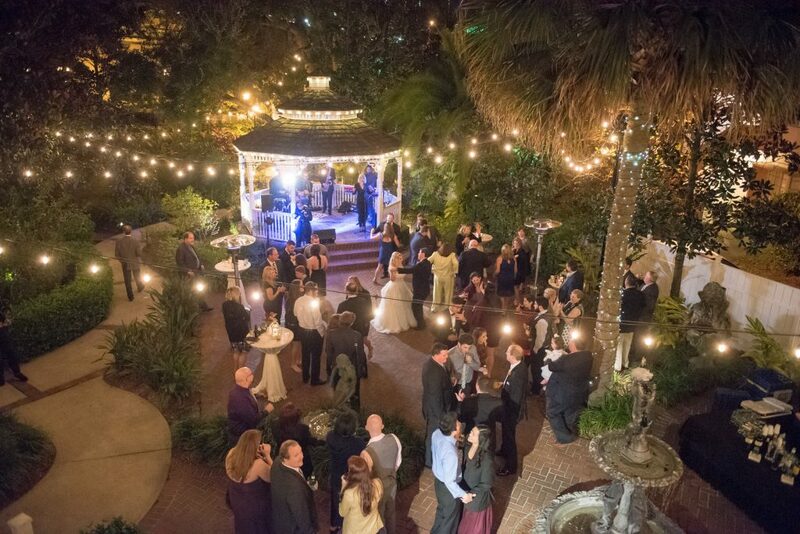 After eating their fill, the party returned outside to the courtyard. 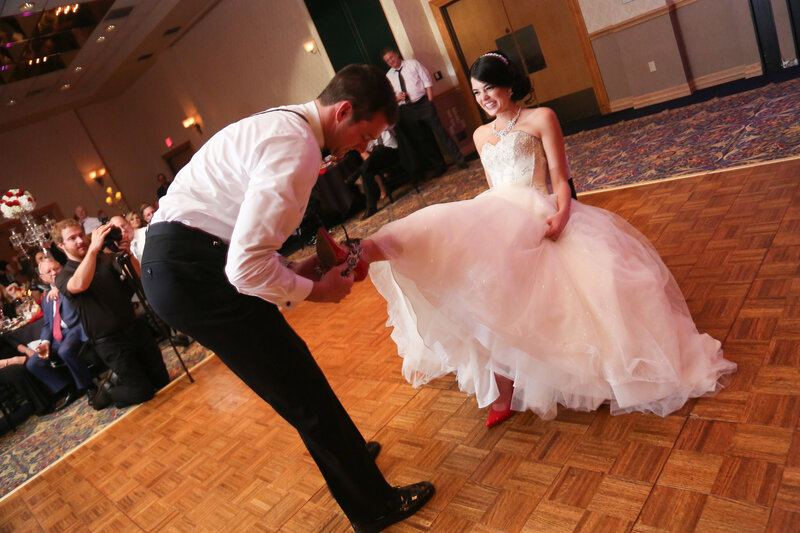 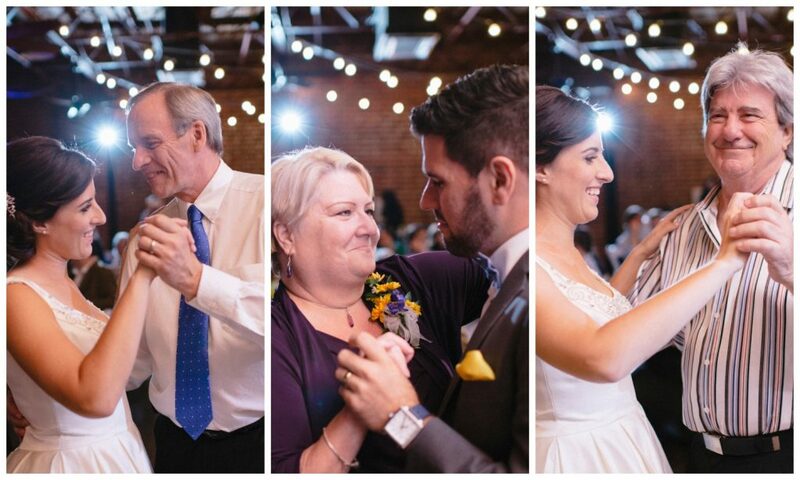 The bride and groom had their mother-son and father-daughter dances, and then open dancing began. 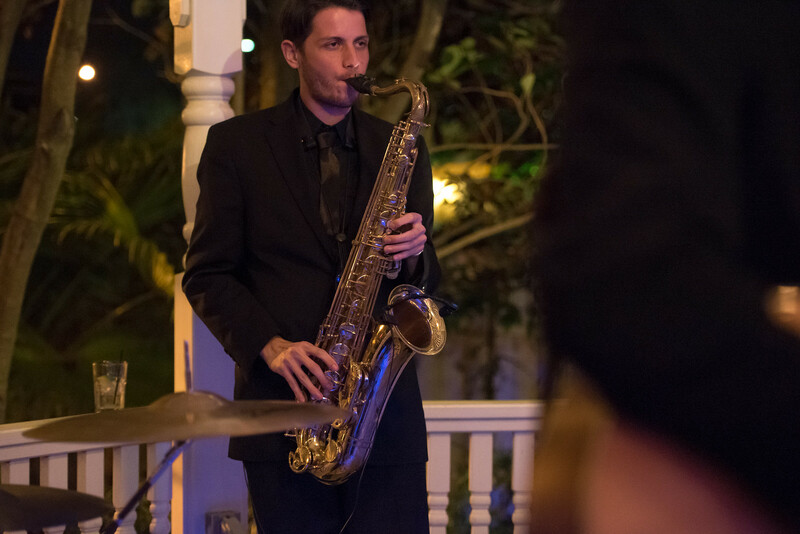 The party was led by the live band, The Bay Kings Band, featuring a number of talented musicians. 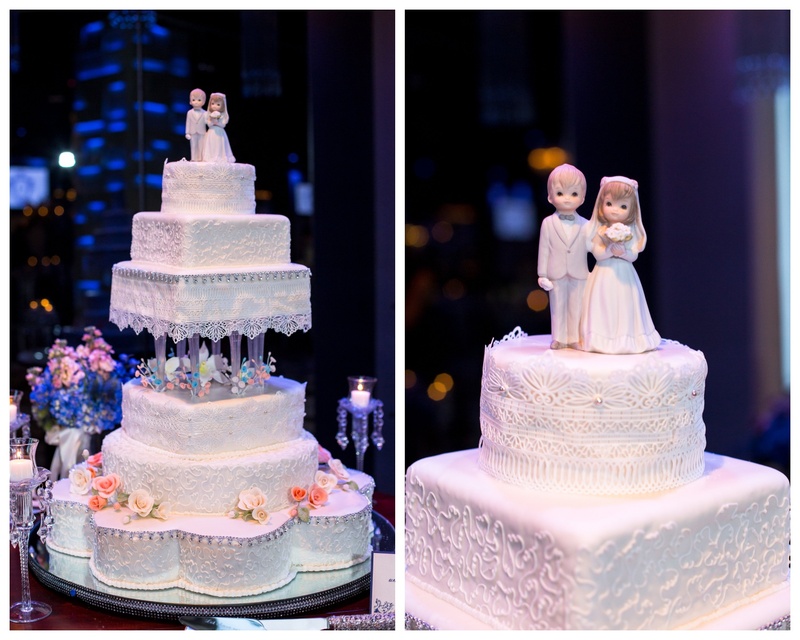 In no time the night was drawing to a close, and it was time to cut the cakes! 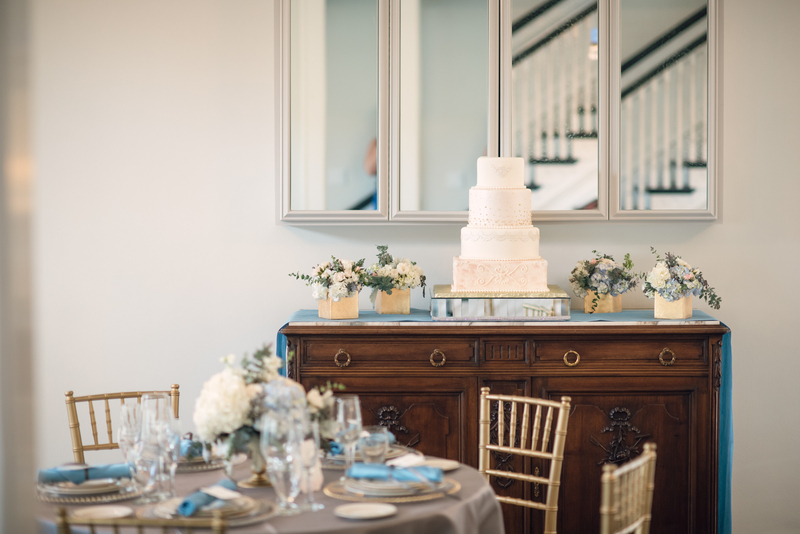 Alexandra and John chose to have a bride’s cake and a groom’s cake. 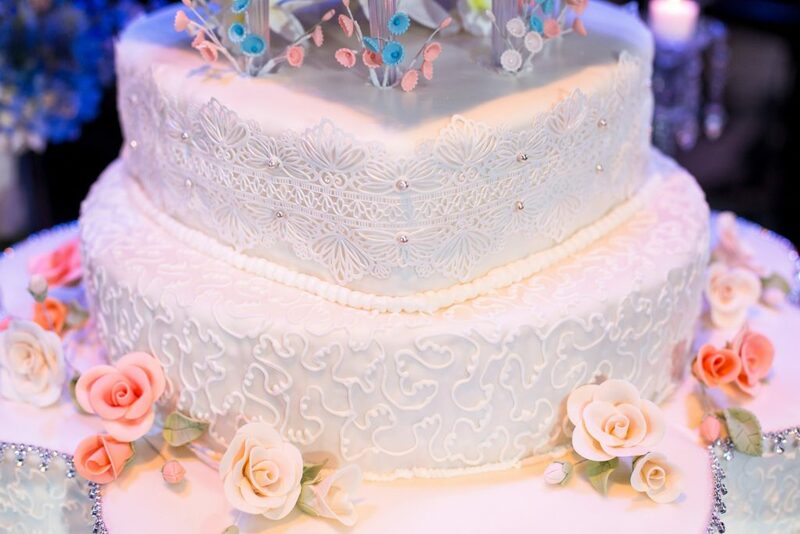 The bride’s cake was gorgeous and white, with textured frosting and floral decorations. 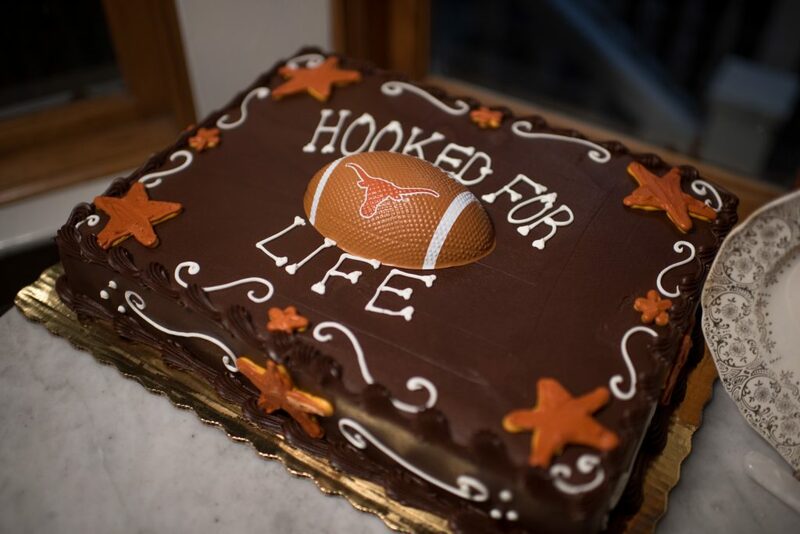 Meanwhile, the groom’s cake reflected their love for the Longhorns one last time, with a football in the center with the Longhorns logo, and the phrase of their wedding: “Hooked for life”. 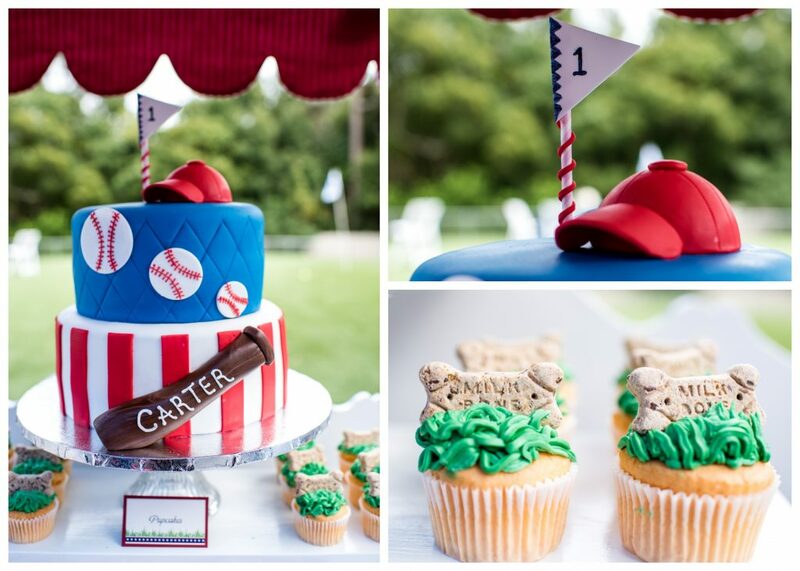 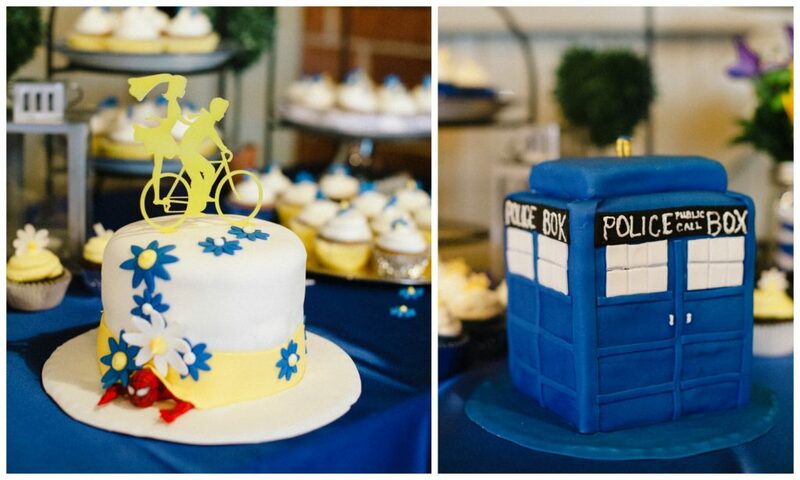 Both cakes were masterfully made by Publix Bakery. 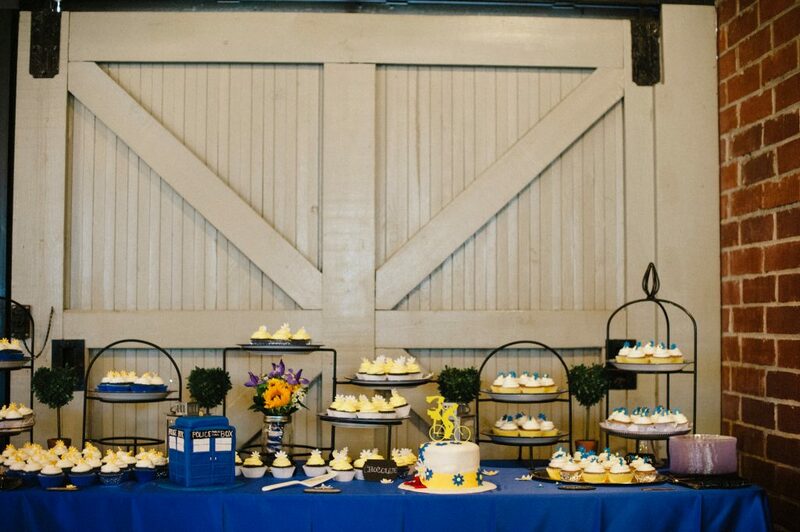 After enjoying the delicious cakes, the guests returned to dancing, and the night all too quickly came to a close. 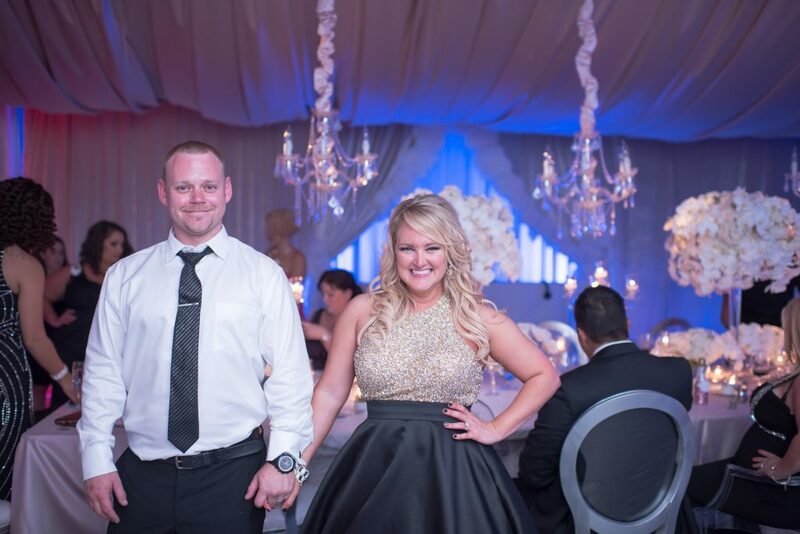 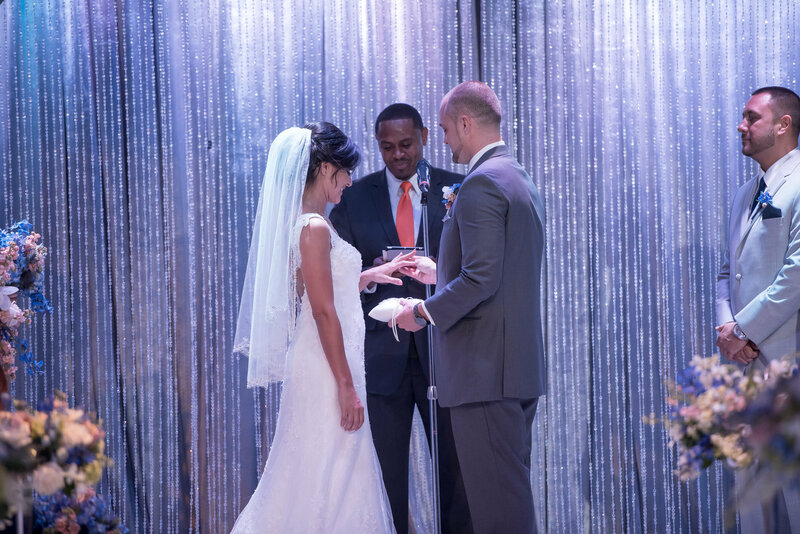 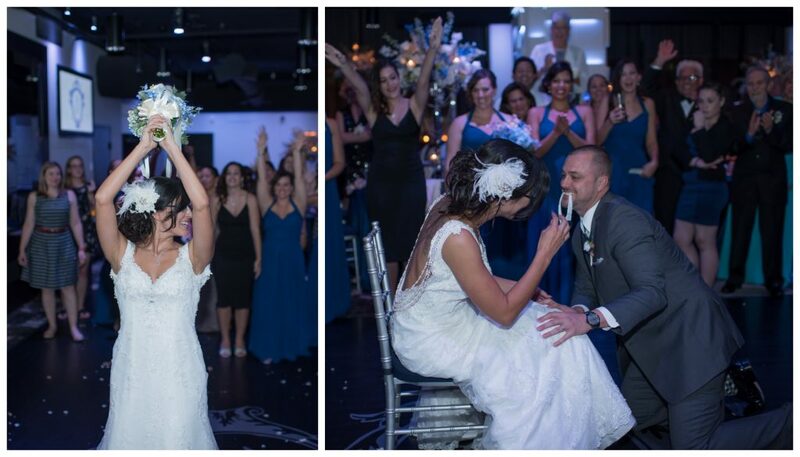 In October of 2015, we had the pleasure of joining Eli and Aaron on their glamorous wedding day! 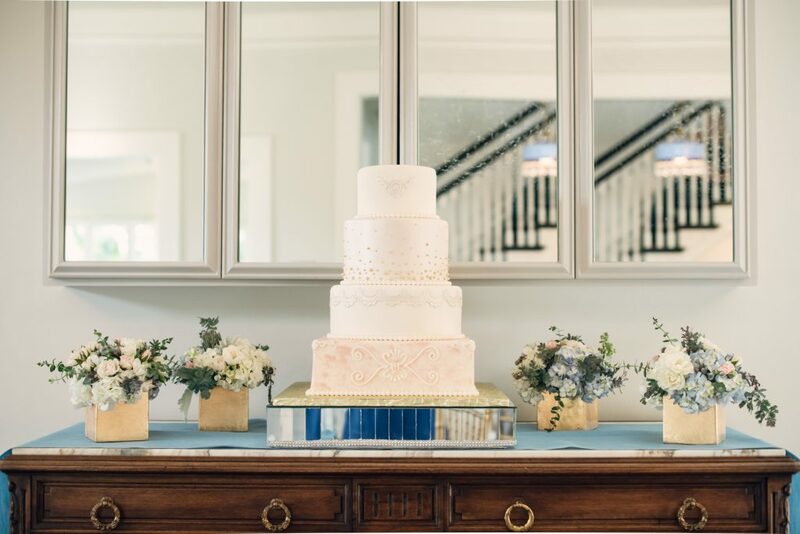 Their color scheme was blue and white with accents of pink. 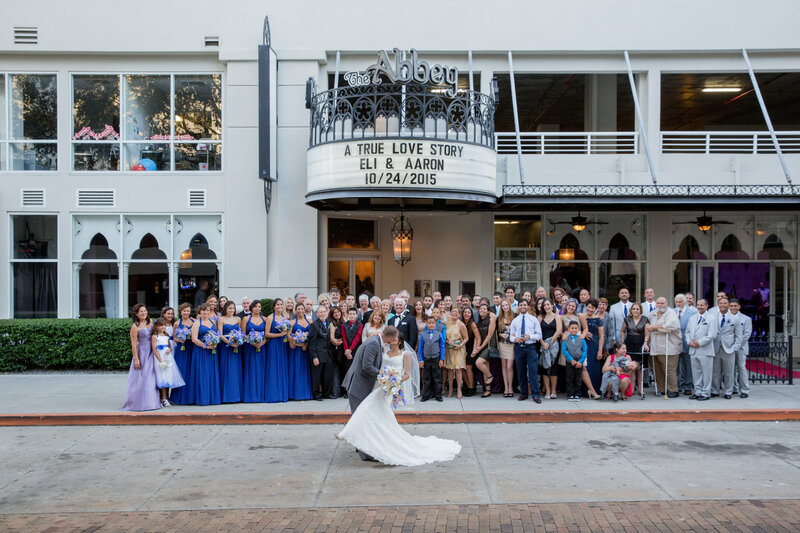 The beautiful ceremony was held at The Abbey, and the lively reception was held right next door at The Mezz. 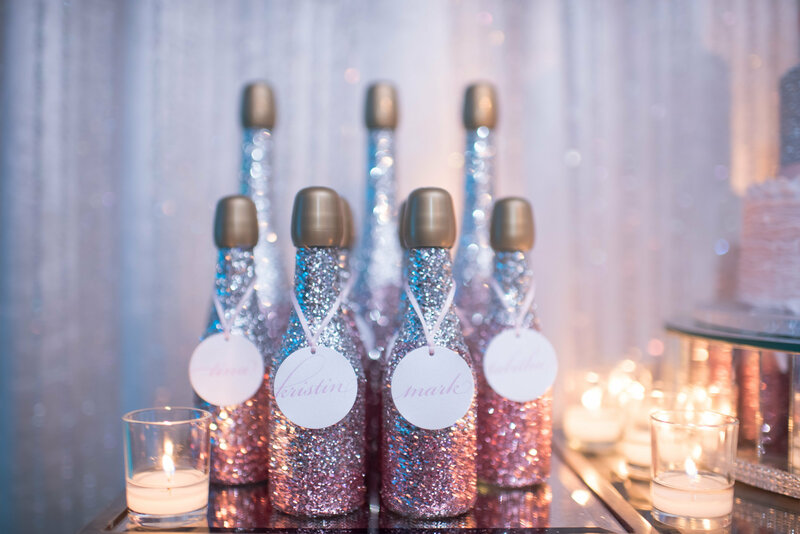 From tiny details such as the happy couple’s names on champagne glasses, to personal touches such as the gorgeous wedding cake created by the bride’s mother and grandmother, to fun additions such as the “Date Night Jar” in which guests could write down suggestions for date nights, every piece of this wedding was personal and uniquely represented the love these two shared. 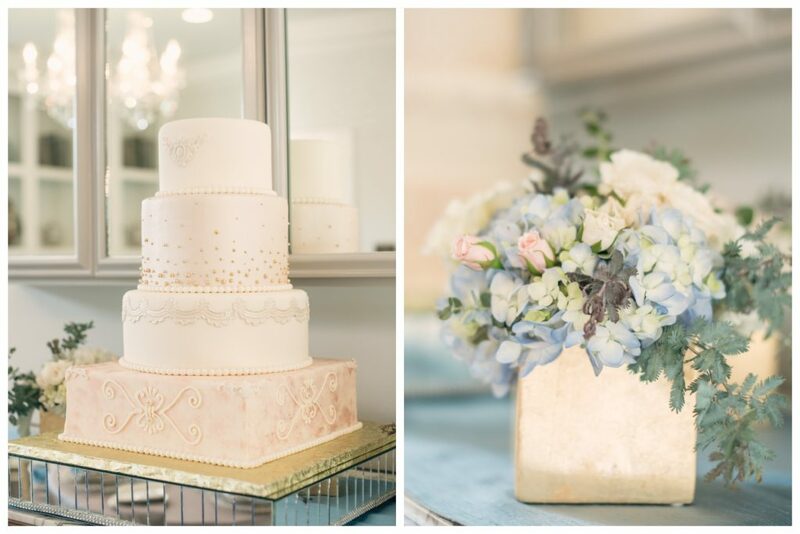 Thank you so much to Kathy Thomas Photography for sharing these lovely photos with us, so that we can share them with you! 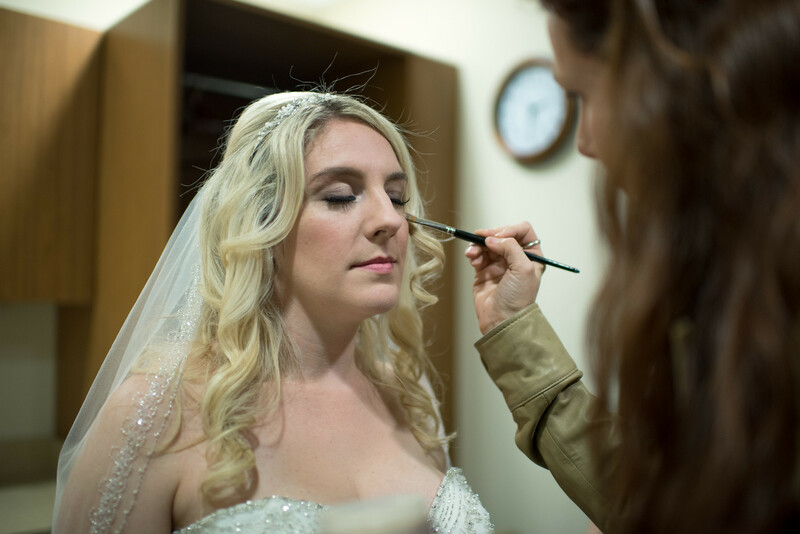 The day began with the ladies getting ready, with hair and make-up done by the masterful stylists at Beauty and a Bowtie. 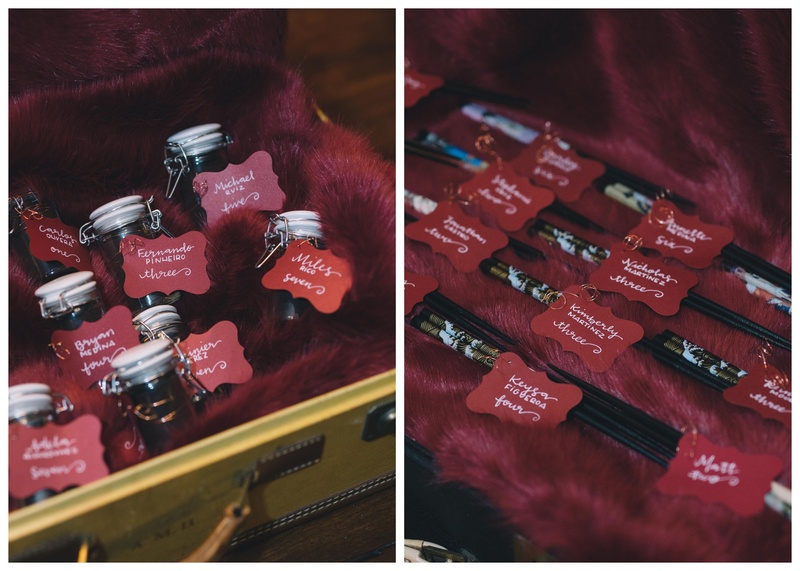 Eli gave each of her bridesmaids a cute personalized make-up tote and getting-ready shirts with their names embroidered on, as seen in their photo together. 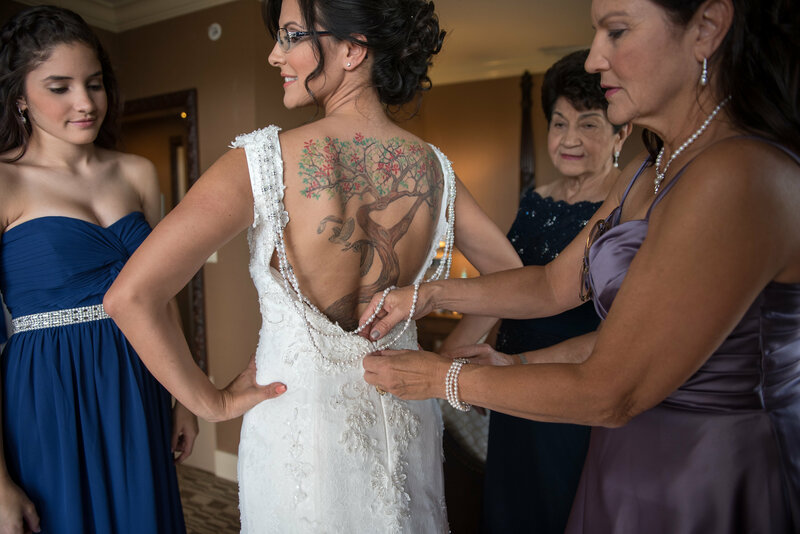 The gorgeous gown in the final picture was draped in white beads, and displayed her back tattoo of a tree. 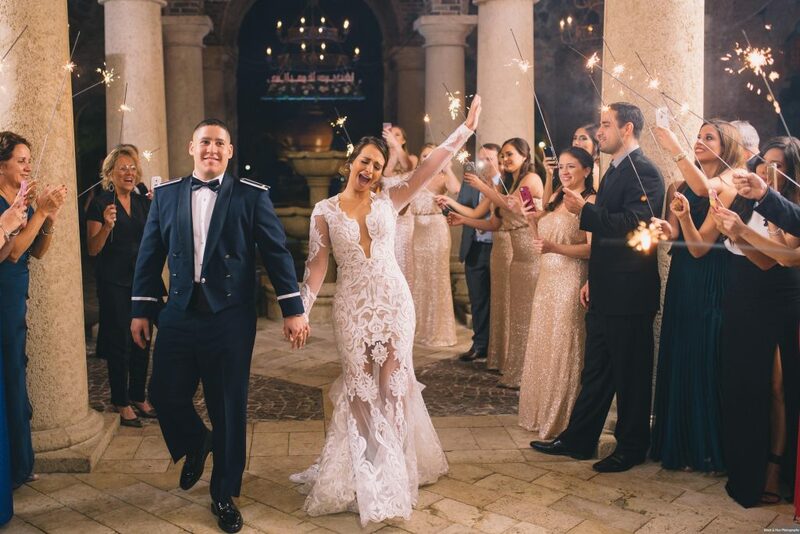 We loved that Eli chose a dress that highlighted something so personal and unique to herself. 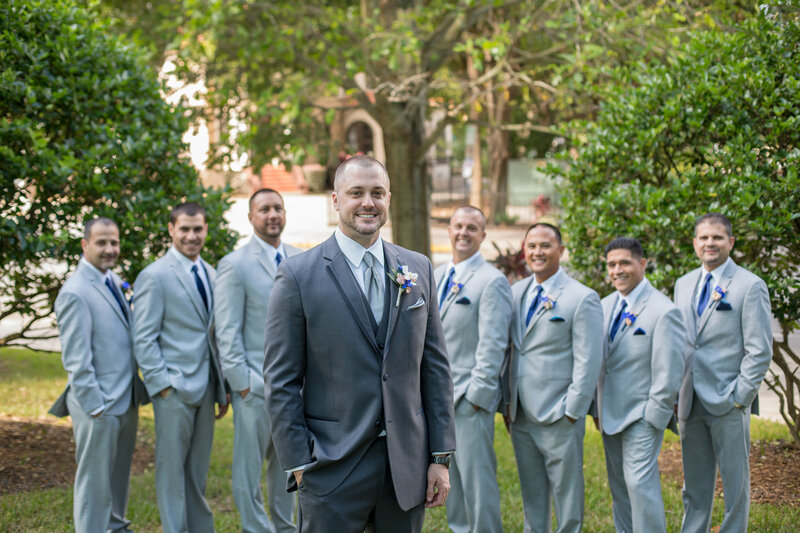 Aaron and his groomsmen gathered outside for a photo, with the groom in a dark grey suit and groomsmen in light grey. 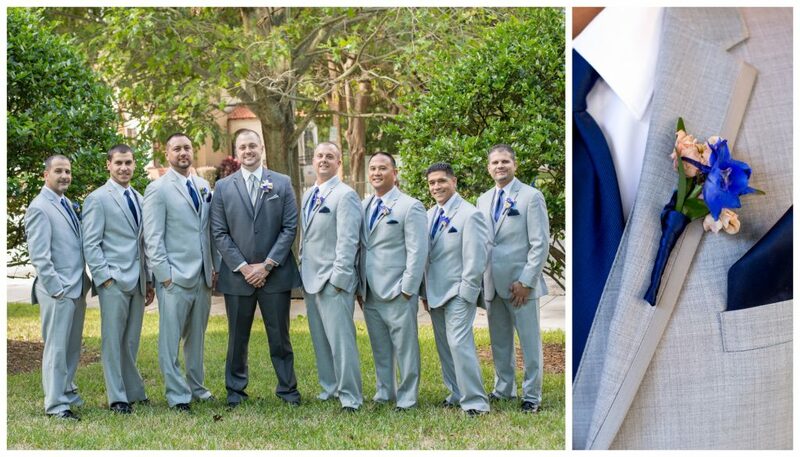 Each sported a boutonniere with blue and pink flowers. 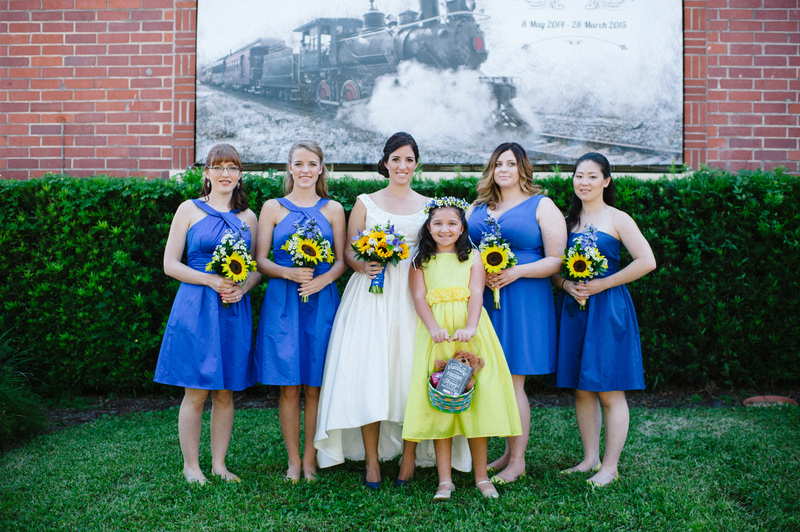 Meanwhile, Eli and her bridesmaids met elsewhere outdoors, with each of the bridesmaids in a gorgeous blue gown and bearing a beautiful bouquet. 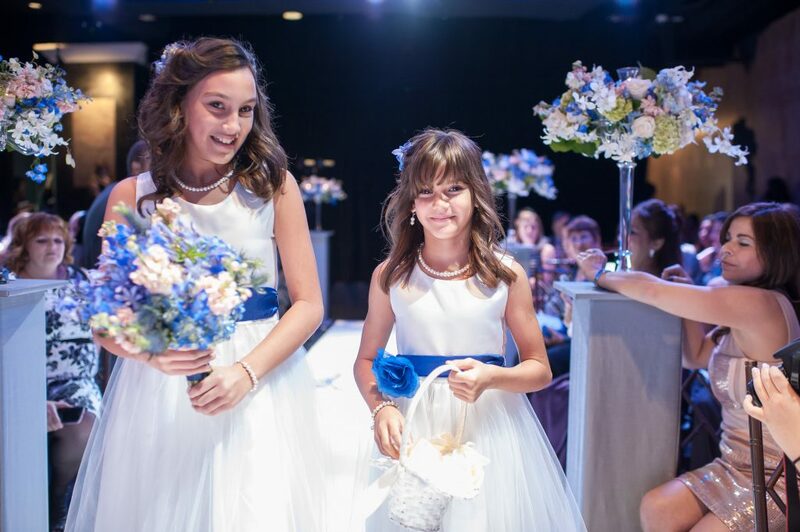 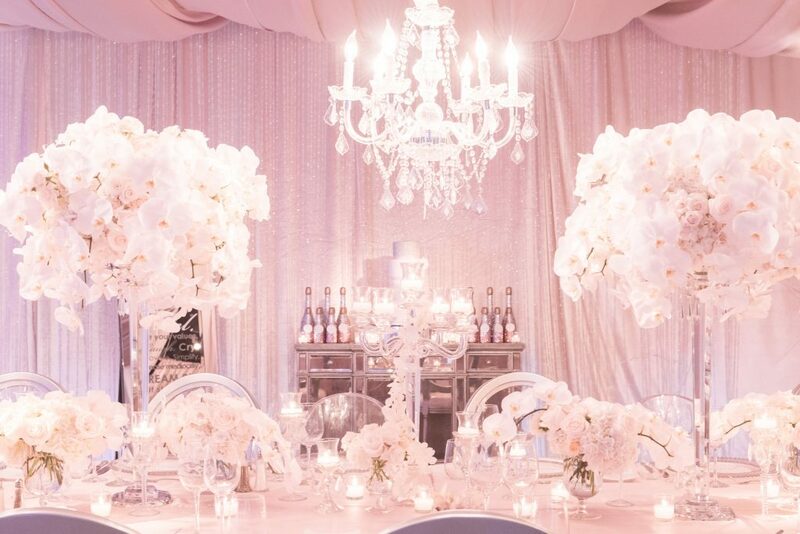 Eli was, of course, dressed in white, with her cascading bouquet of blue, white, and pink. 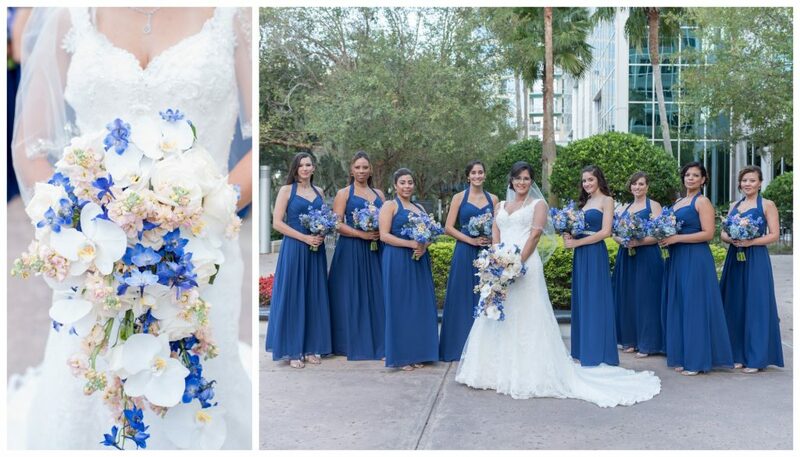 Both the bouquets and boutonnieres were arranged by Raining Roses Productions. 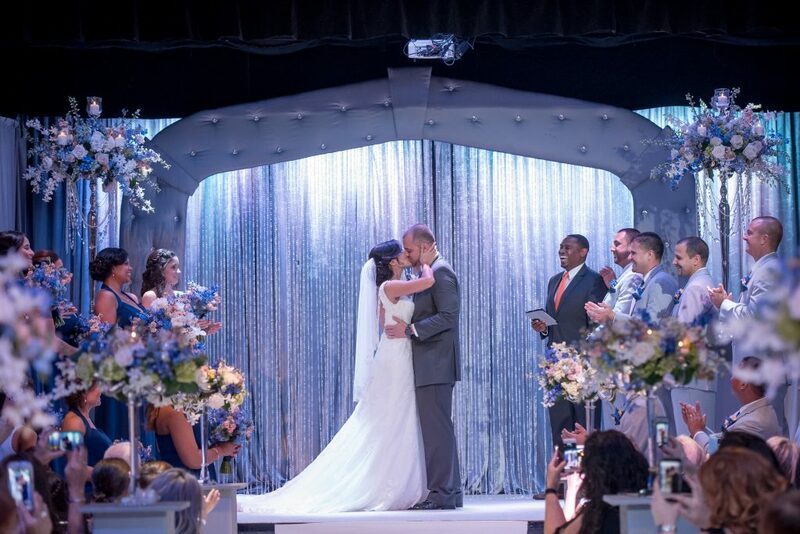 And at last, it was time for the ceremony! 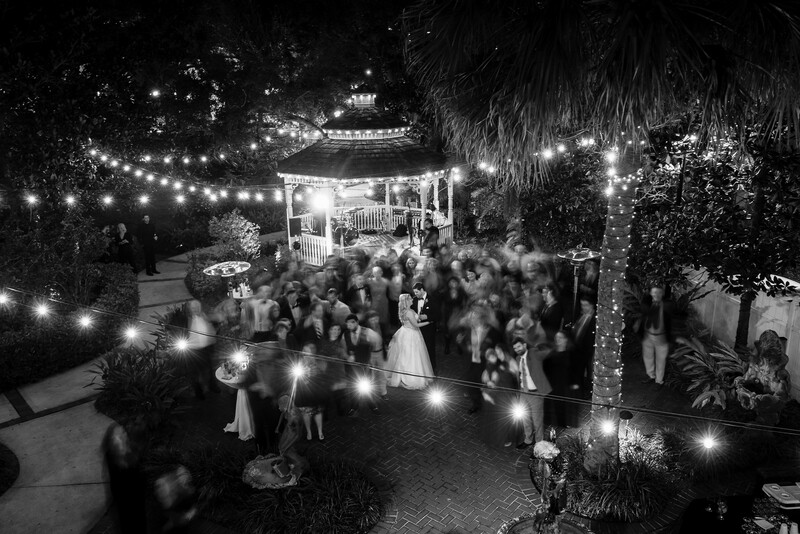 All of the wedding party made their way to The Abbey and prepared for the show to begin. 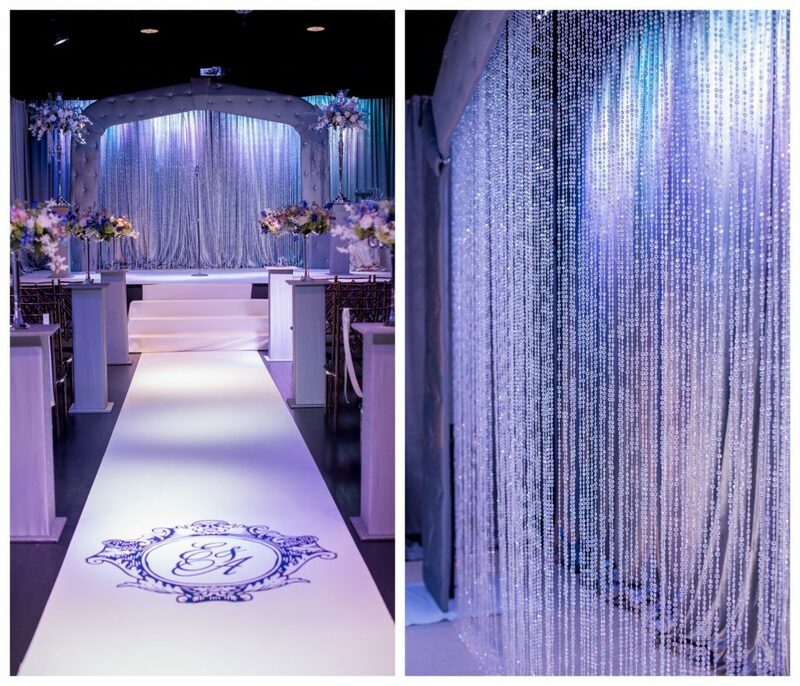 The Abbey was set up with with a sparkly beaded curtain at the back, with a runway-esque white aisle runner featuring the initials of the bride and groom. 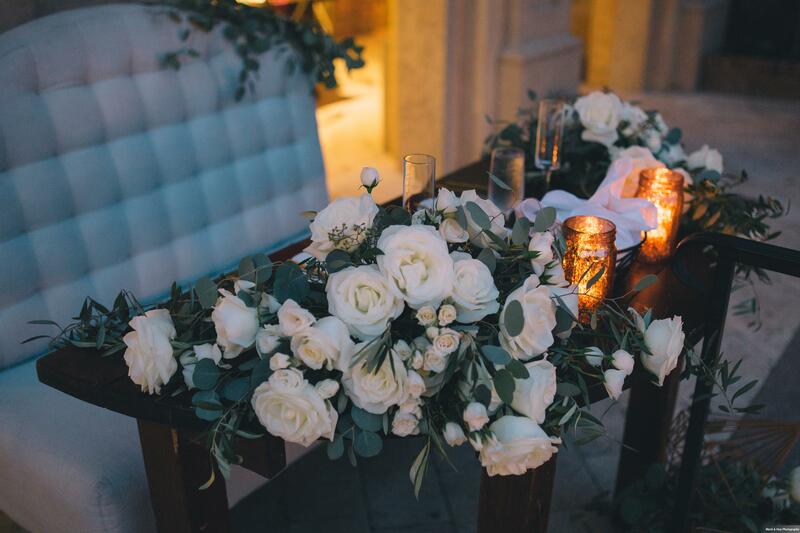 Alongside the aisle there were white pillars topped with floral arrangements by Raining Roses. 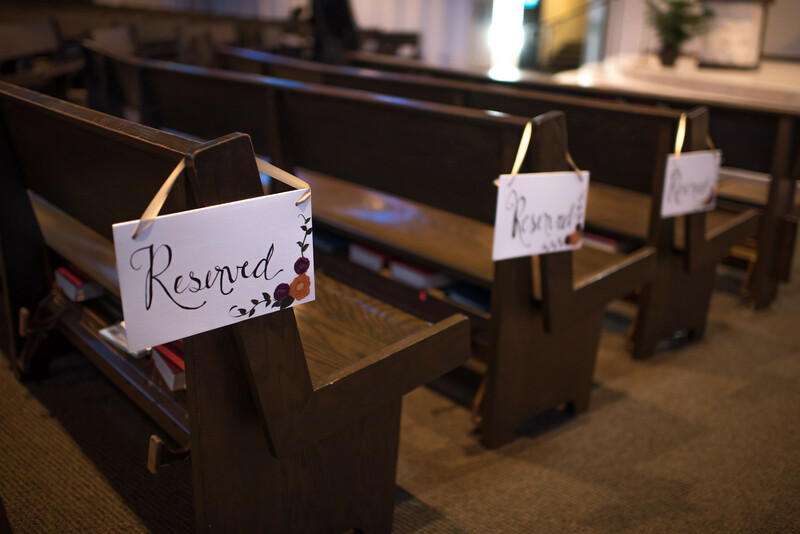 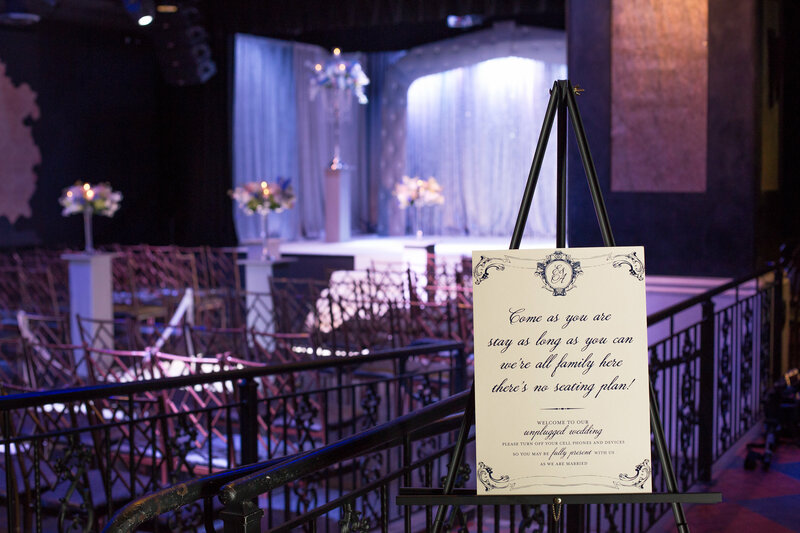 At the front of the ceremony space was a large sign welcoming the guests to Eli and Aaron’s wedding, and reminding them that it would be an unplugged ceremony, meaning they requested guests not to use phones or cameras during the ceremony. 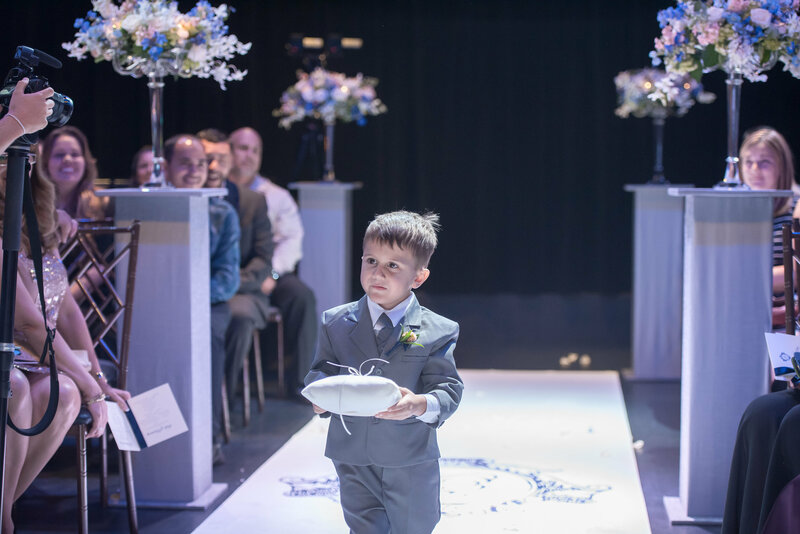 The ceremony was beautiful; after the groom, groomsmen, and bridesmaids took their places, there were two flower girls and a ring bearer, followed by Eli and her father. 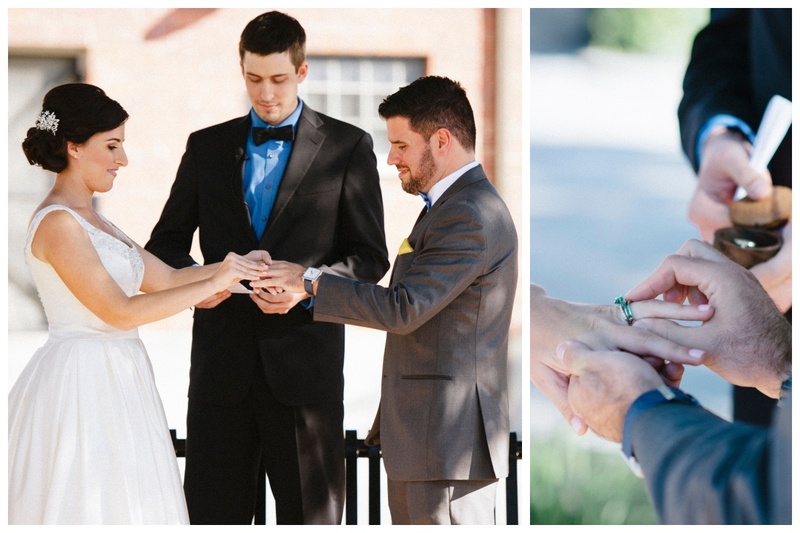 Eli and Aaron exchanged rings, said their vows, and were pronounced man and wife! 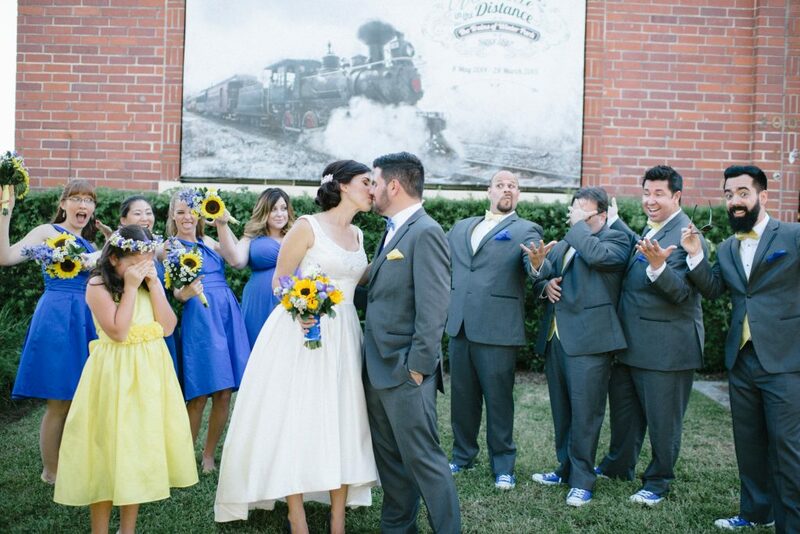 They kissed and exited The Abbey, and their many family members and members of the wedding party joined them outside for an epic group photo. 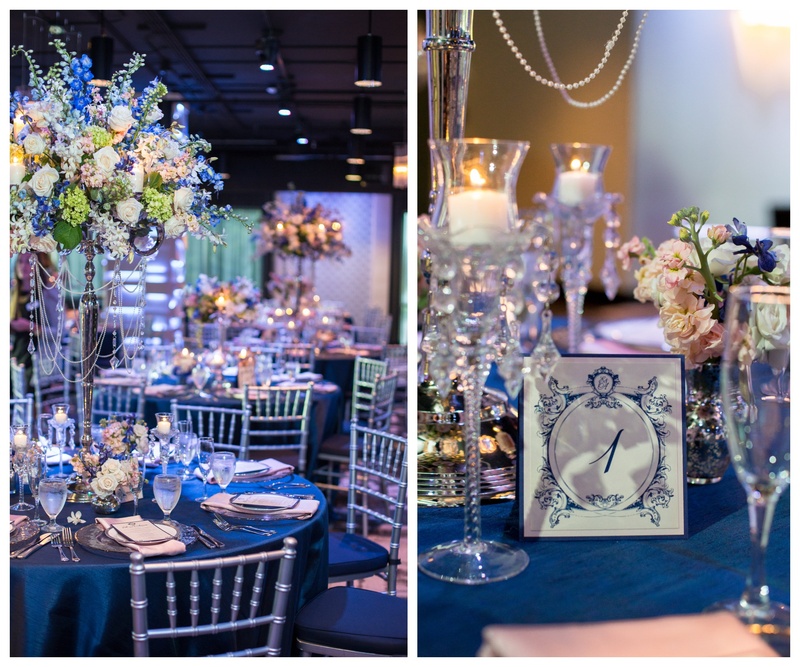 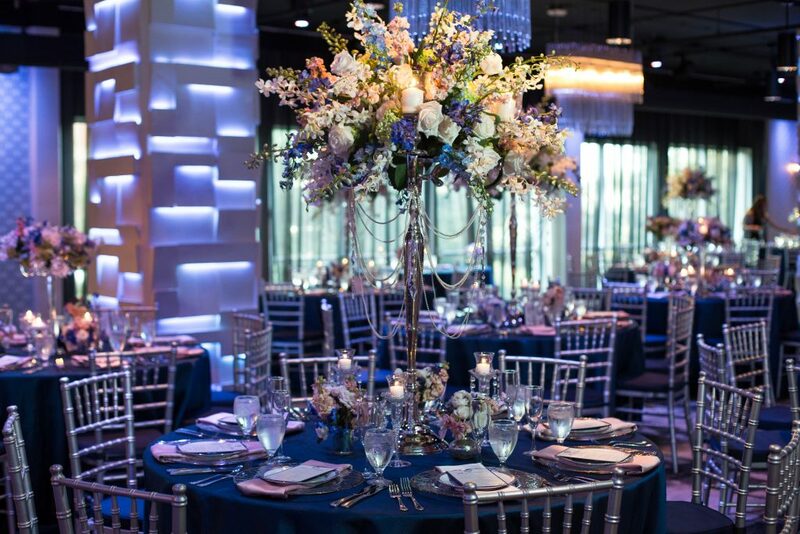 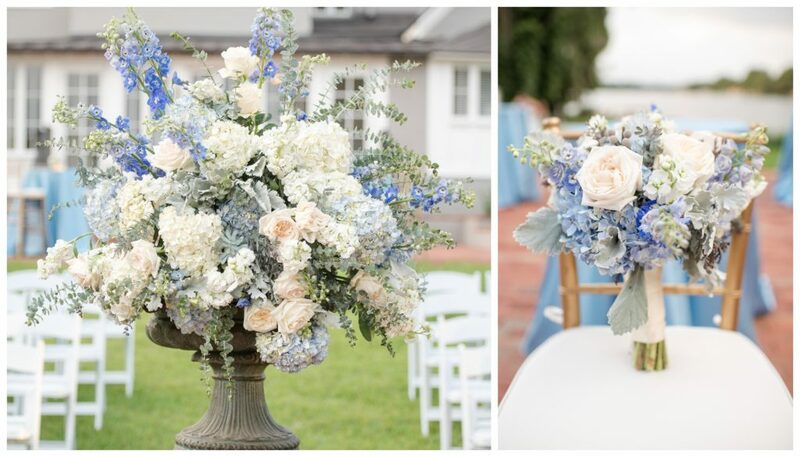 After a brief outdoor photo shoot, the bride and groom made their way next door to the reception venue: The Mezz, which was set up as a glamorous, elegant blue and white reception hall, full of chandeliers and grand floral arrangements by Raining Roses. 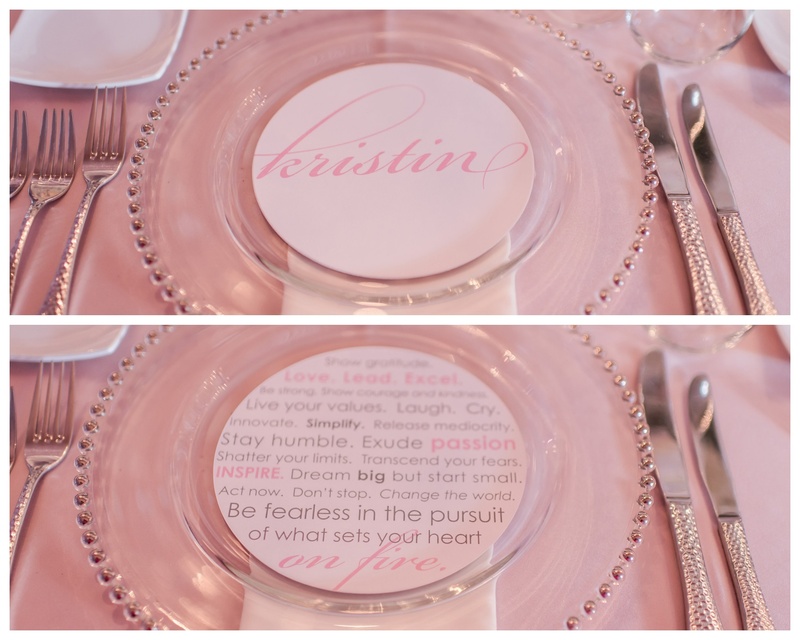 Guests found their table assignments on traditional seating cards. 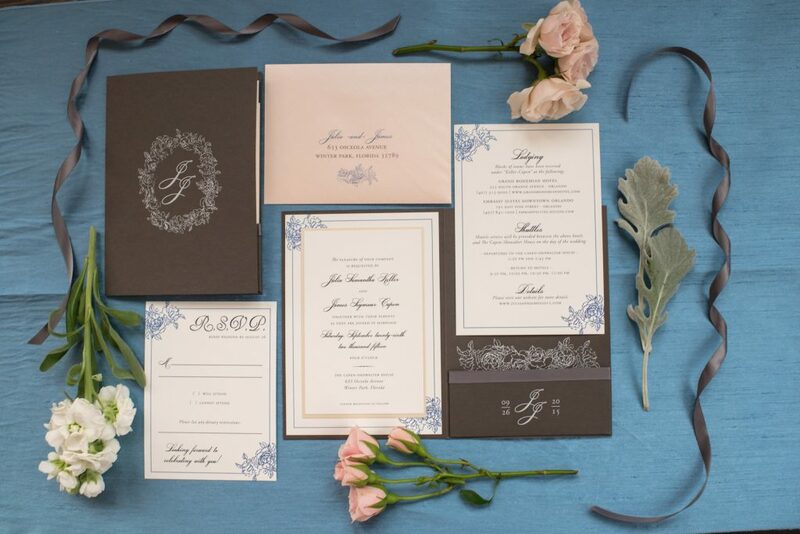 These and all of the paper goods were designed by Dogwood Blossom Stationery. 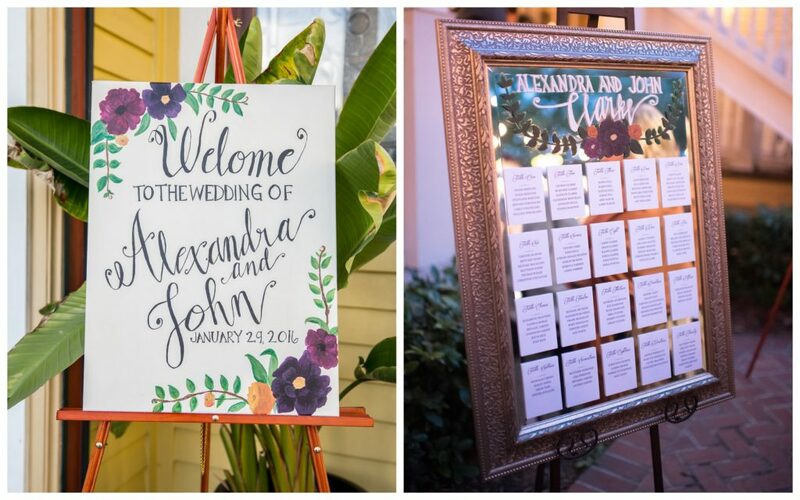 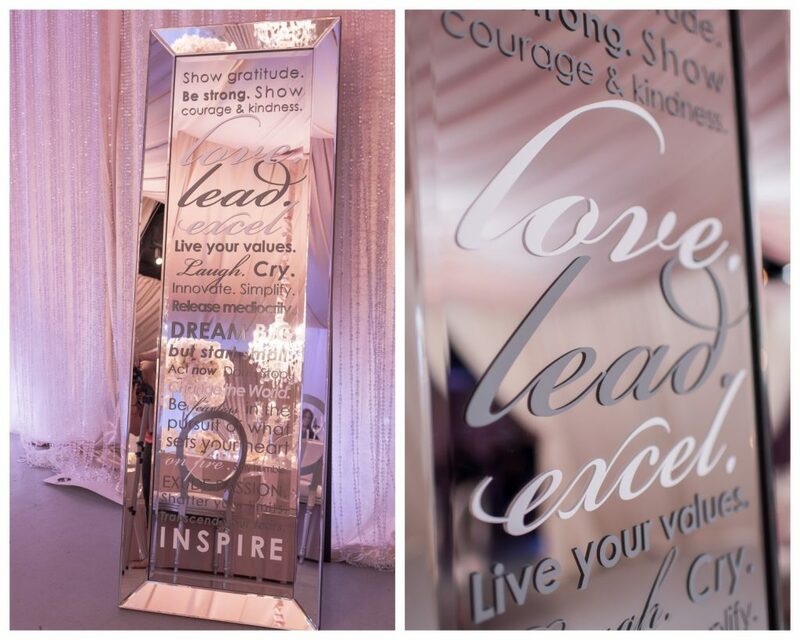 The reception was full of personalized details, everywhere you looked. 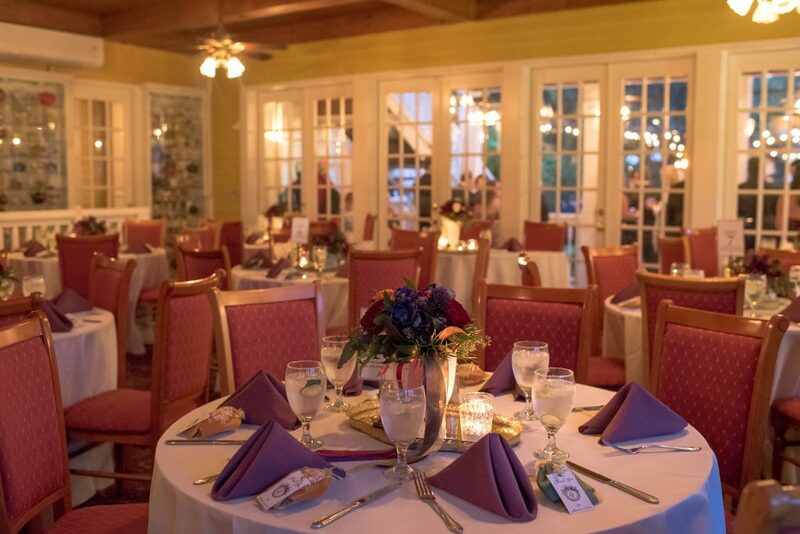 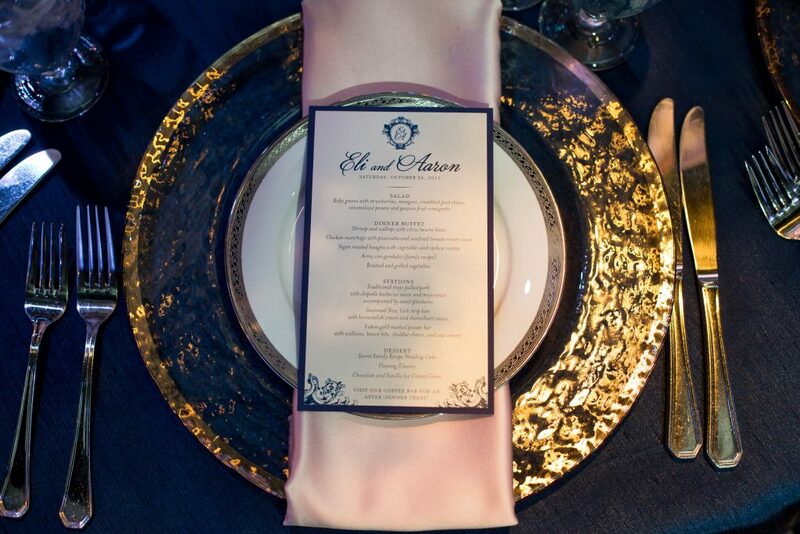 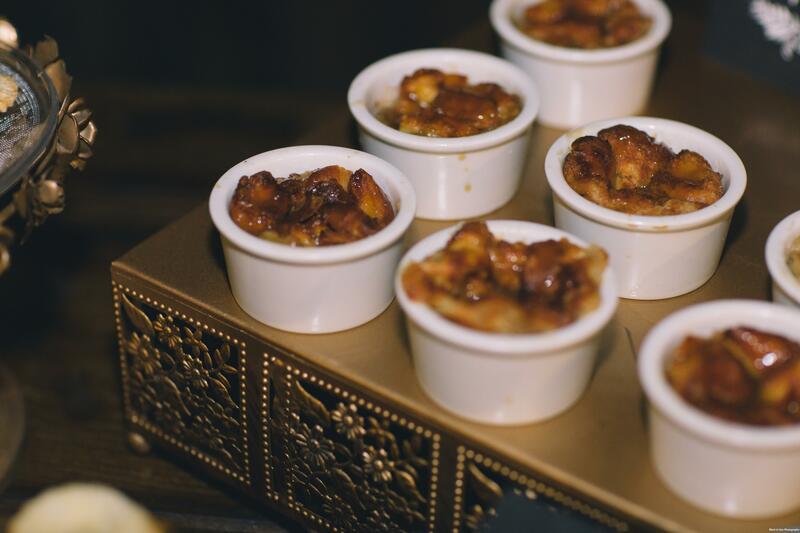 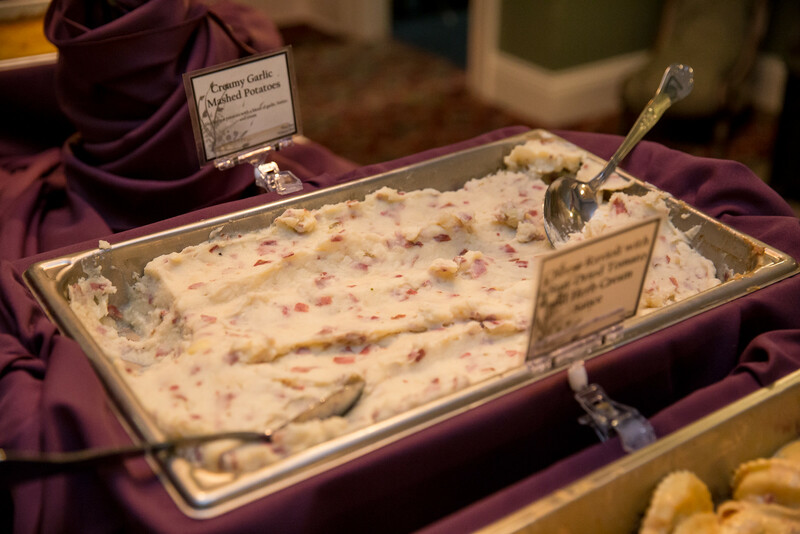 The menu, created by Arthur’s Catering, was curated to Eli and Aaron’s tastes. 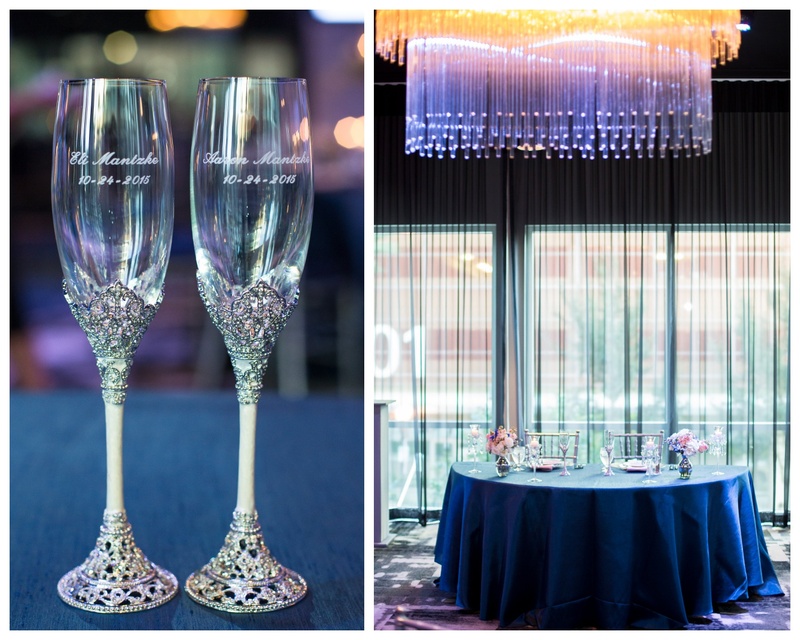 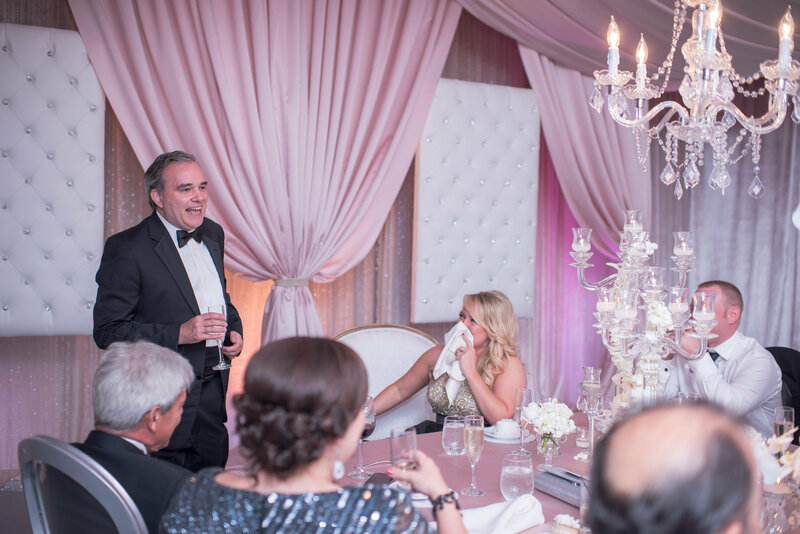 The newlywed’s names were etched onto their champagne glasses at their sweetheart table, itself positioned underneath a gorgeous chandelier. 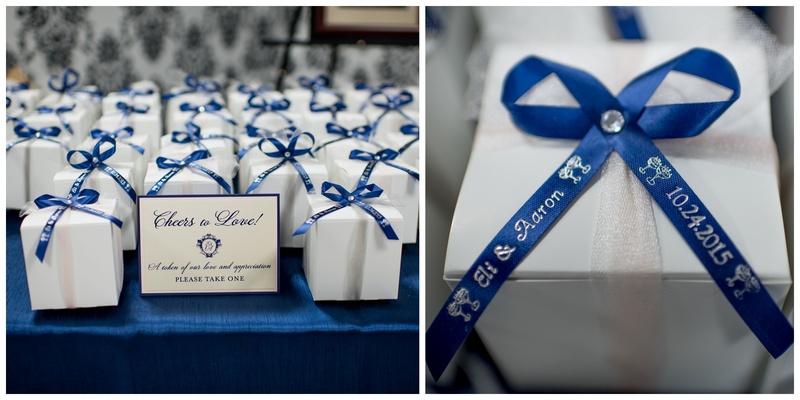 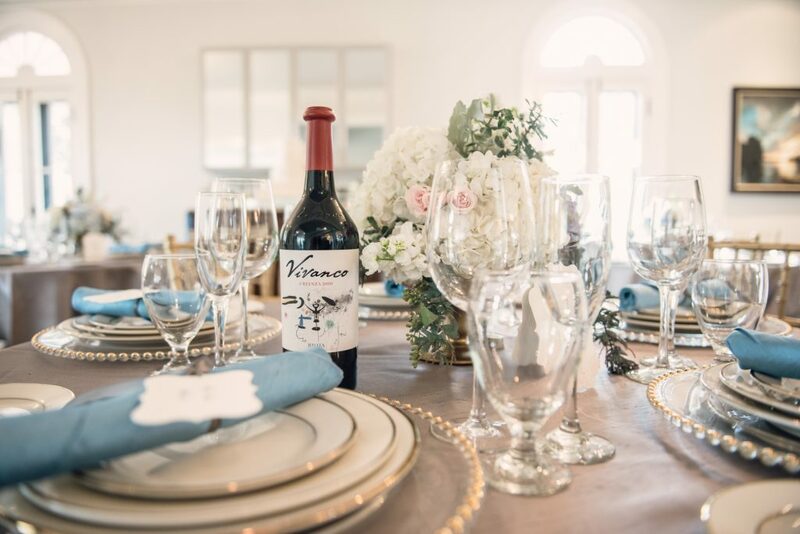 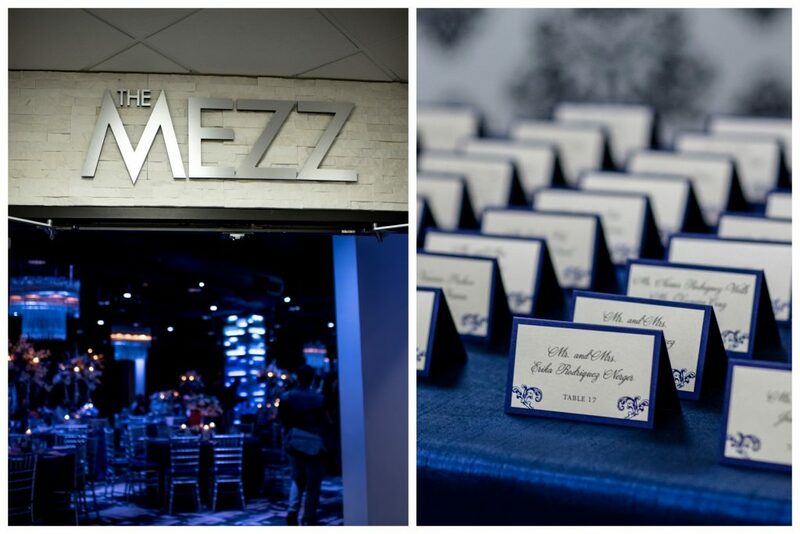 The favors, personalized wine glasses, were packaged in blue & white favor boxes. 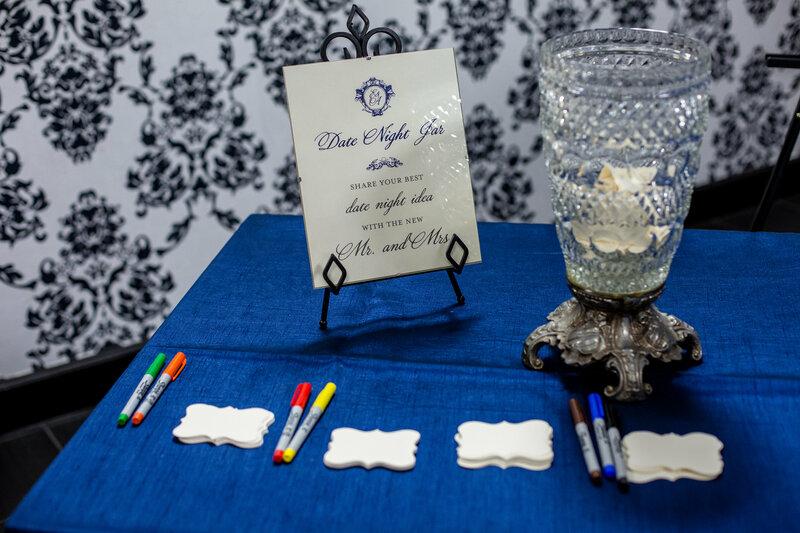 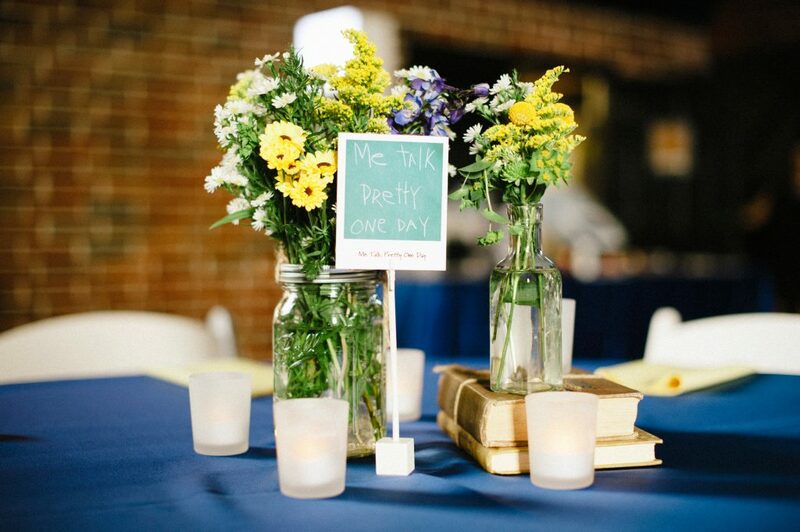 Last but not least, there was a very fun table set up with the “Date Night Jar”, in which they asked guests to place their written-down date night ideas for the newlyweds to use in the many married days to come. 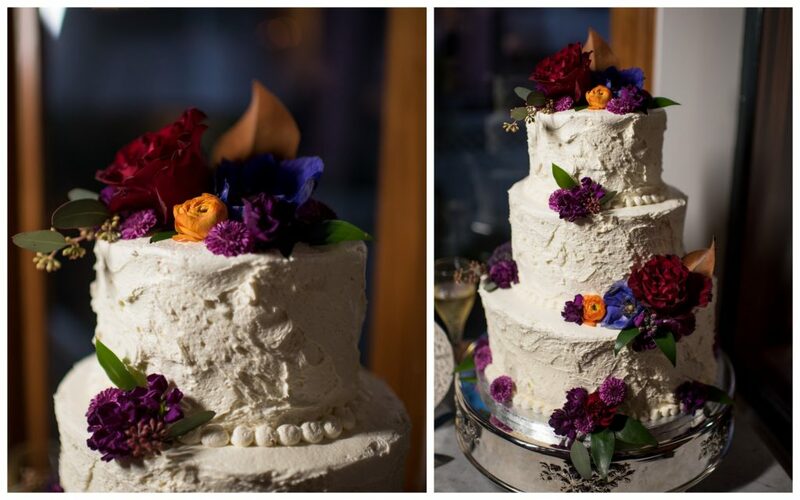 The personal touches continued with the cake. 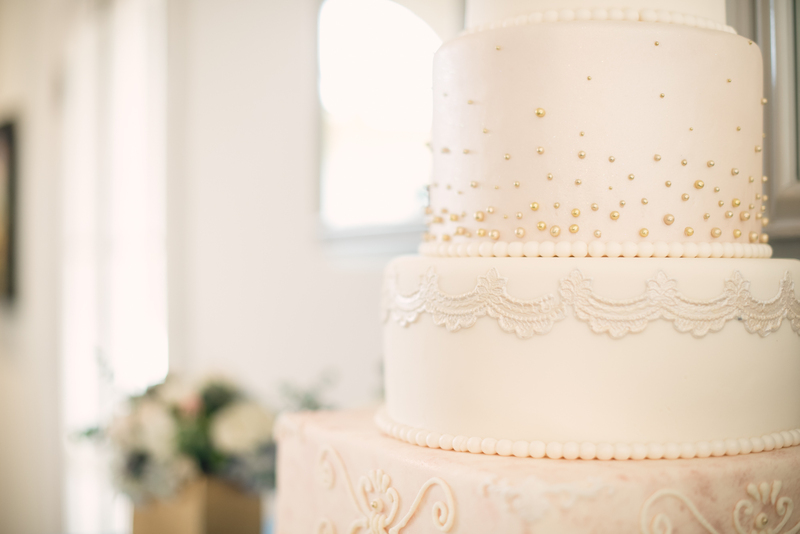 The multi-tiered masterpiece was lovingly made by the bride’s mother and grandmother, and rivaled any professionally-made wedding cake we’d seen. 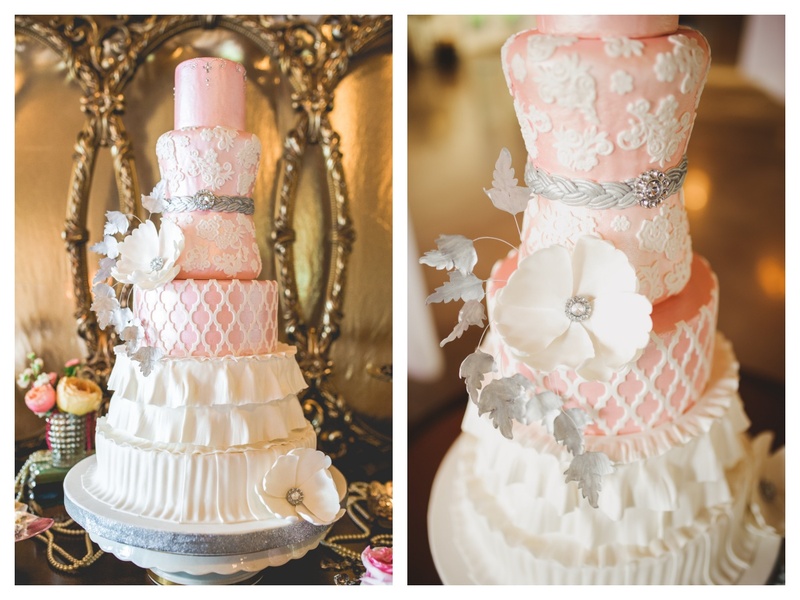 There were lace details and swirls of icing, all tastefully done. 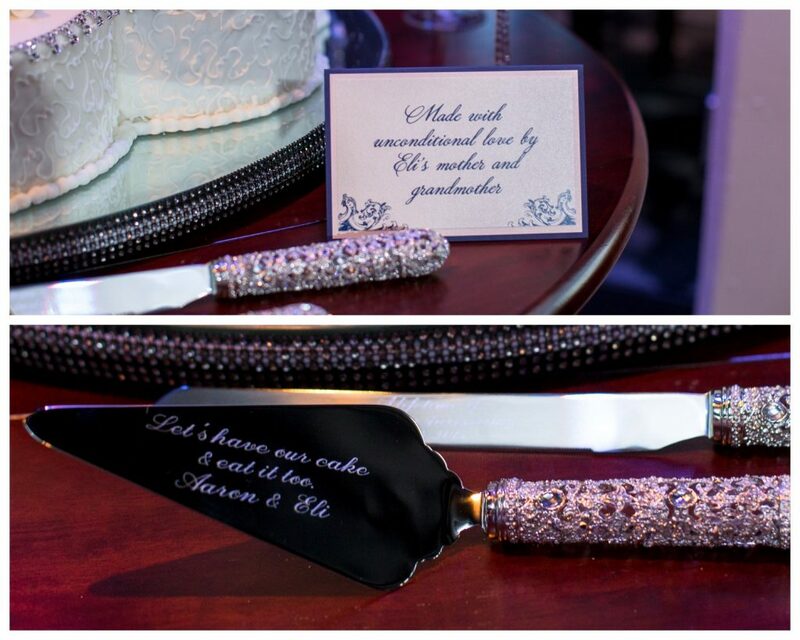 The cake cutter even featured a fun phrase: “Let’s having our cake and eat it too”. 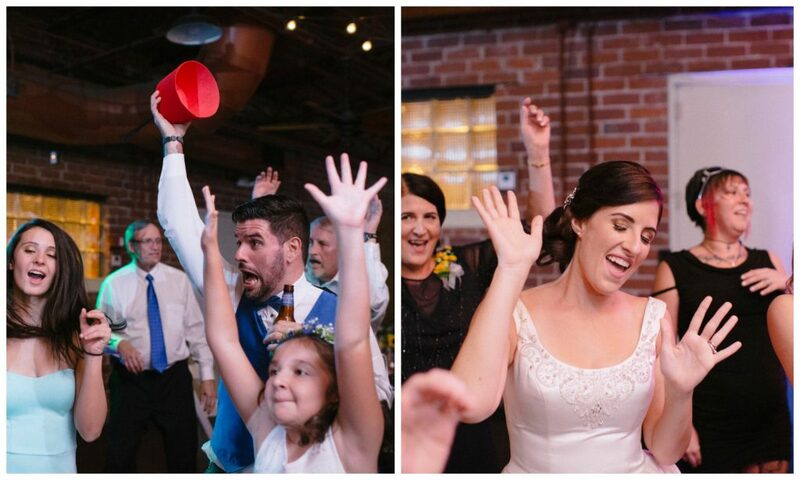 The reception was nonstop Eli and Aaron-style fun. 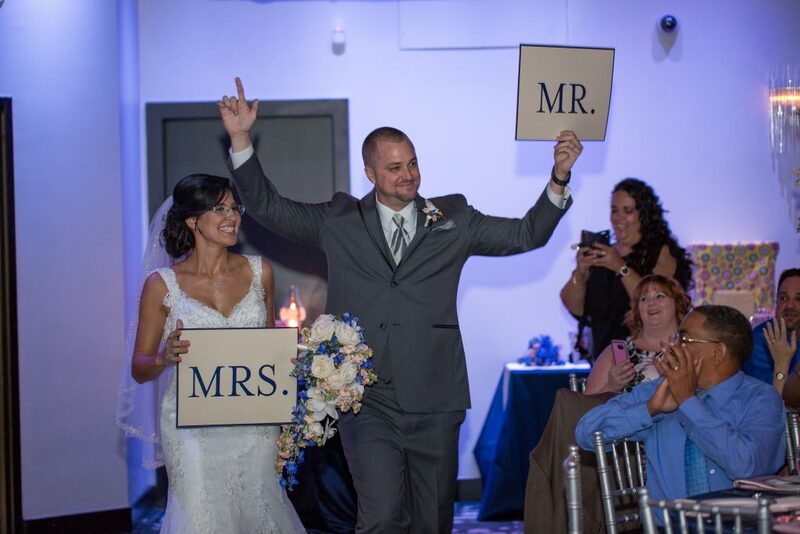 Their grand entrance into the reception hall had them holding up big “Mr” and “Mrs” signs, followed by their first dance together as husband and wife. 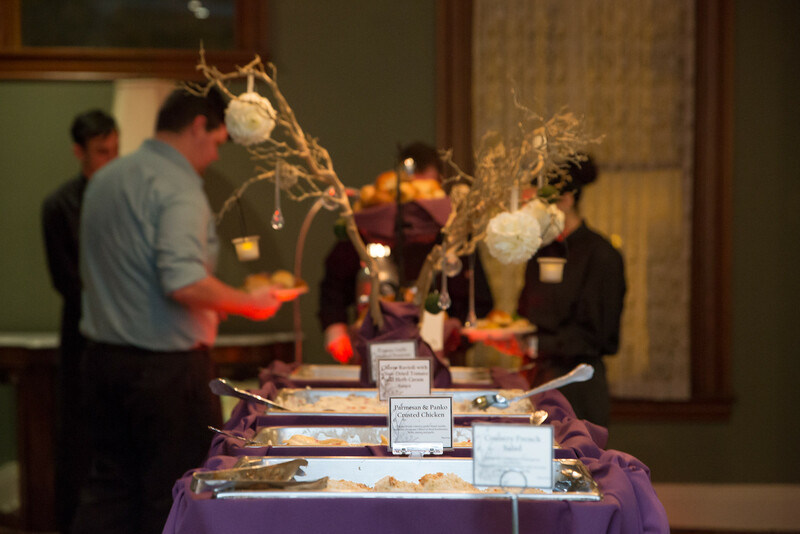 Next up was the dinner buffet, provided by Arthur’s Catering, and the parent dances. 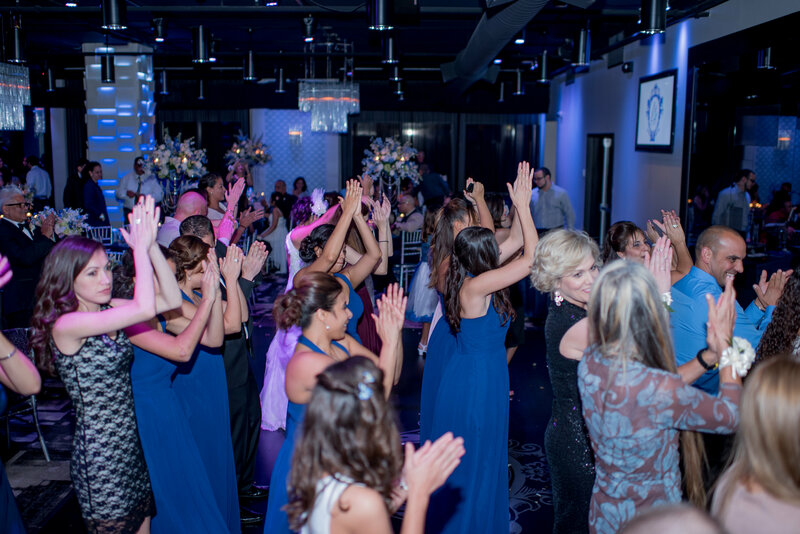 The guests were then welcome to join in open dancing on the floor led by DJ Anwhat, as well as check out the photo booth provided by Click! 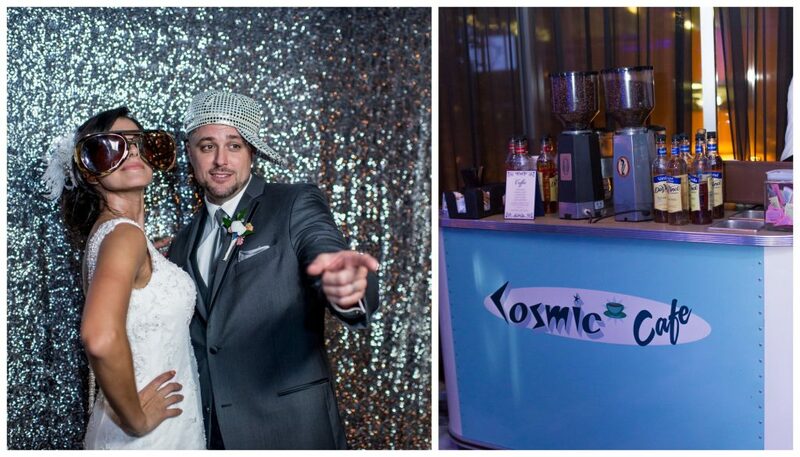 Photo Booth and the coffee station set up by Cosmic Cafe. 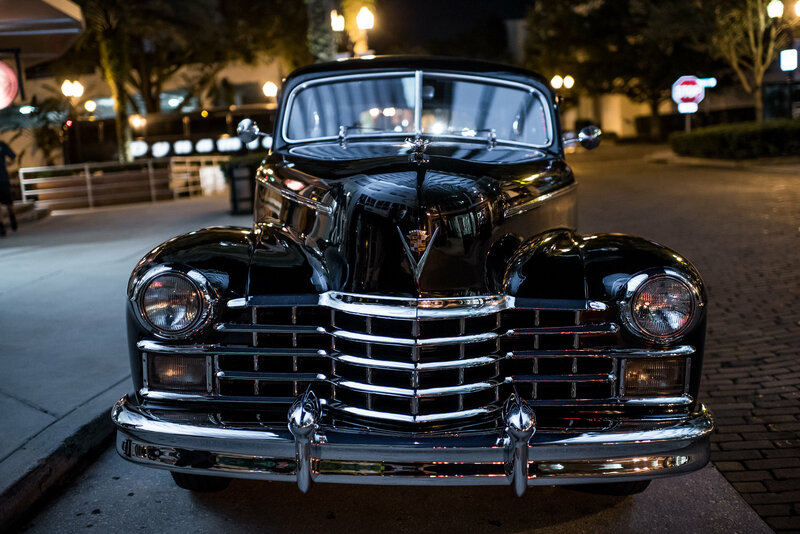 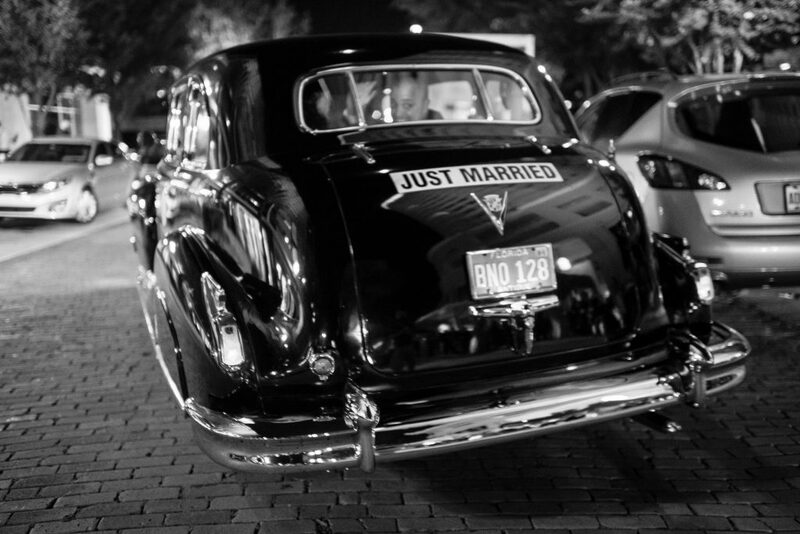 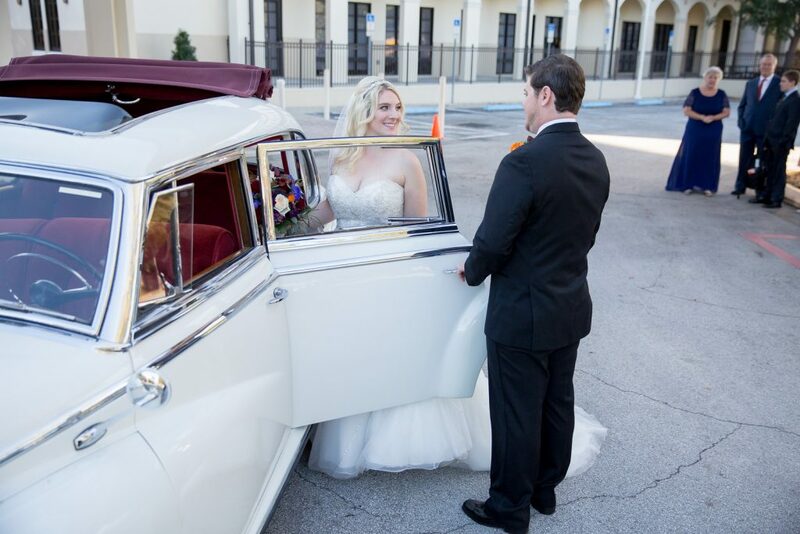 At the end of the night, the bride and groom escaped to their gorgeous classic getaway car, provided by Cole’s Classic Cars. 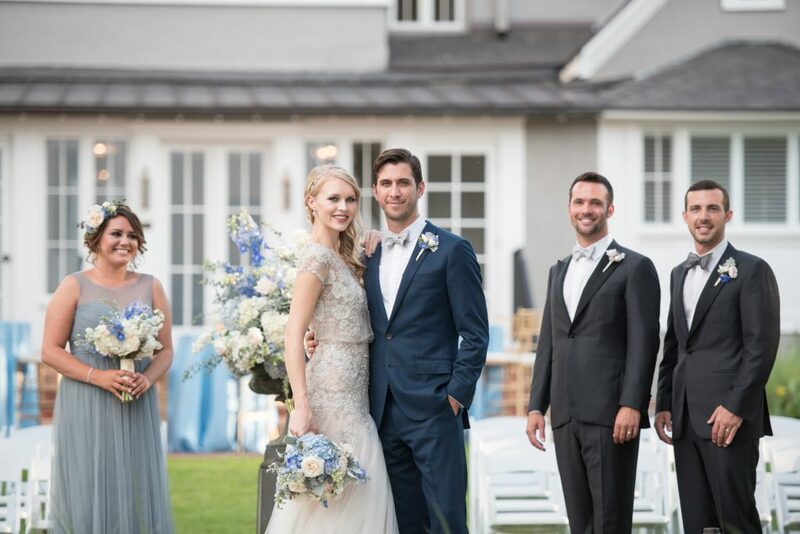 Thank you so much to Eli and Aaron for letting us be a part of their beautiful wedding, and to the venues and vendors that made this day such a success. 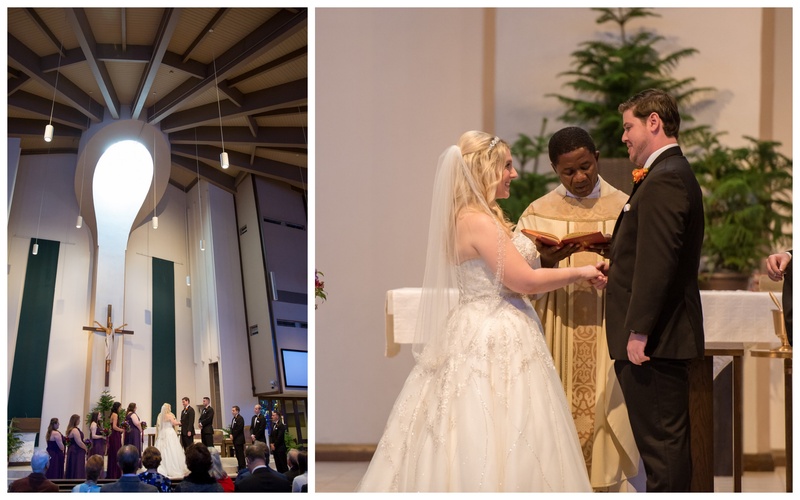 We all wish the happy couple a long and joyful marriage! 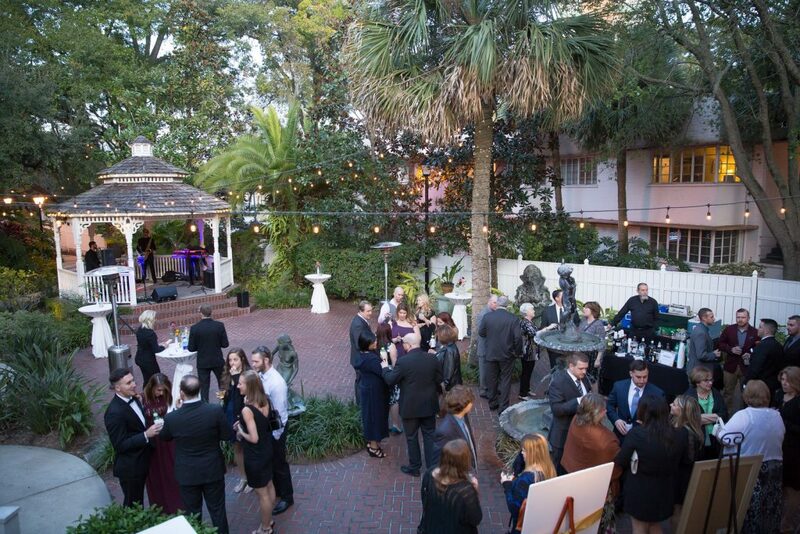 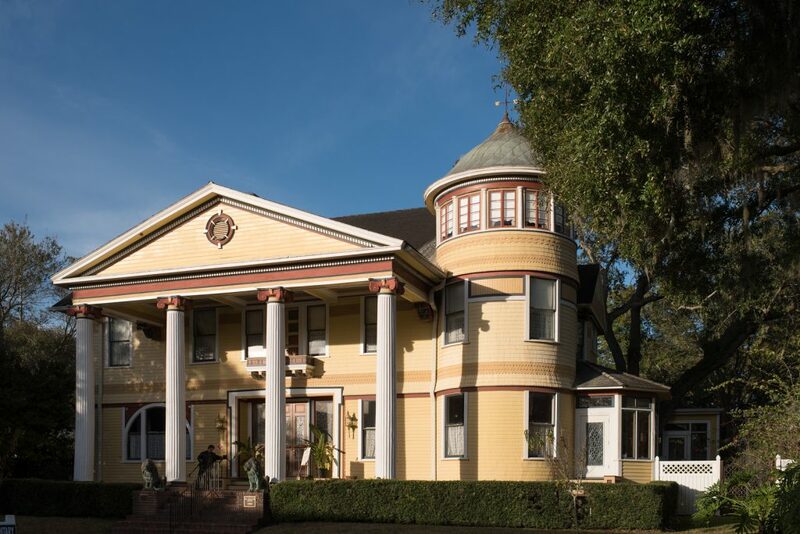 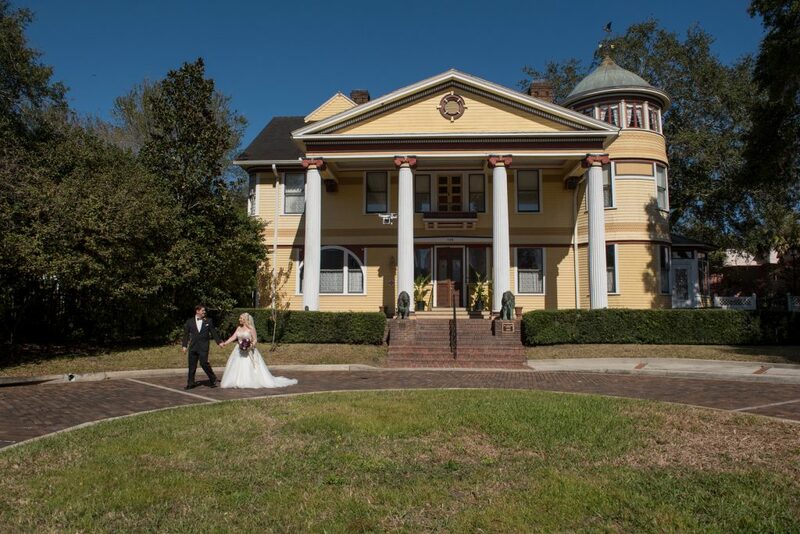 In 2015, the historic Capen House was brought to its new home next to the Polasek Museum. We were asked to put together a photo shoot with our fellow fabulous vendors to introduce it to future brides and grooms. We took inspiration from the home’s art and decor to create a look that was timeless and romantic, with a color scheme of serenity and rose quartz. 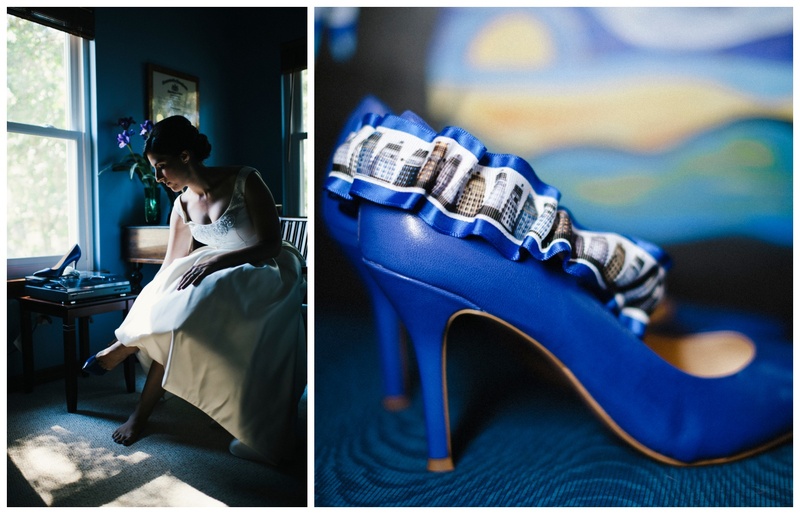 Interestingly, this color combination was actually chosen as the Pantone color of the year in 2016! 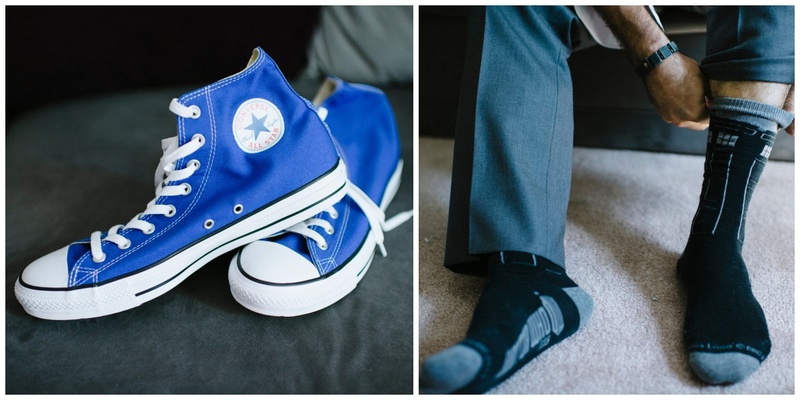 We’d like to think our styled wedding had something to do with that, or at the very least, we have very advanced taste in color. 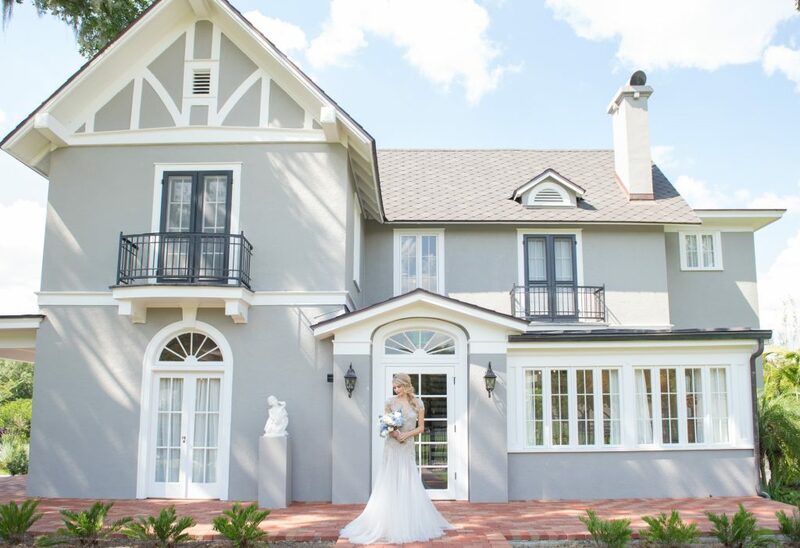 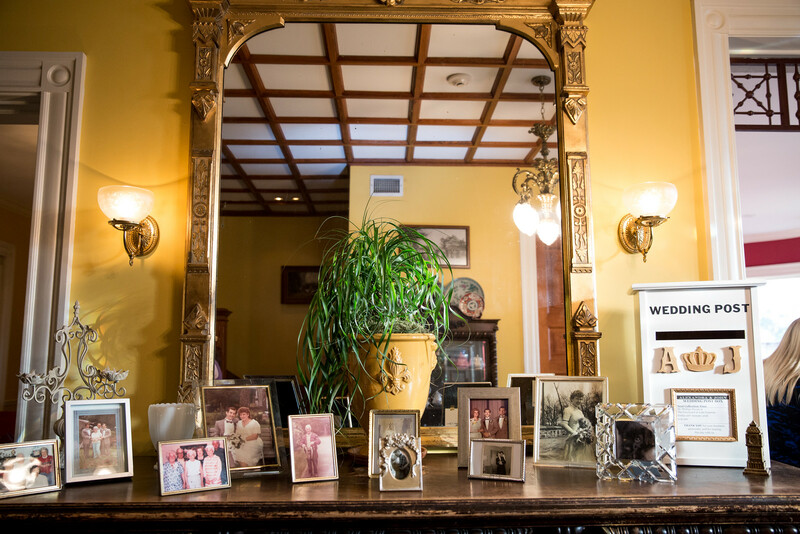 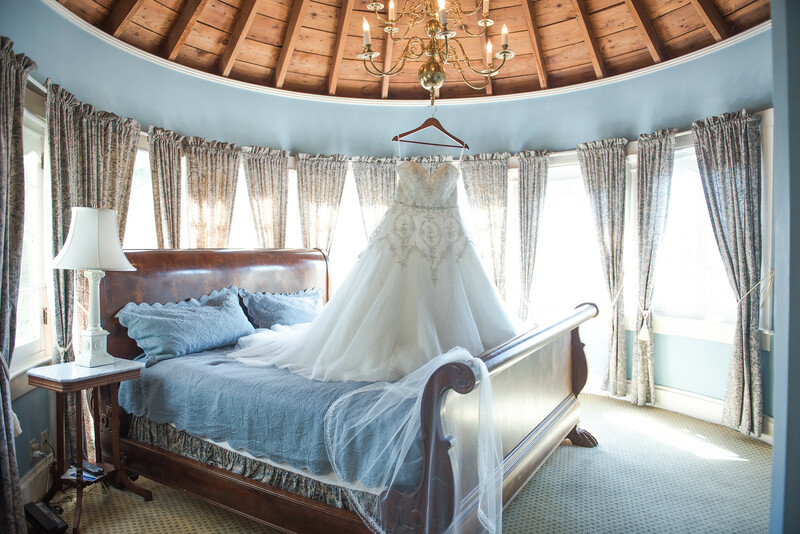 The photos below tell the story of a beautiful day of re-introducing The Capen House, and we’ve been honored to plan a number of weddings with them since this day. 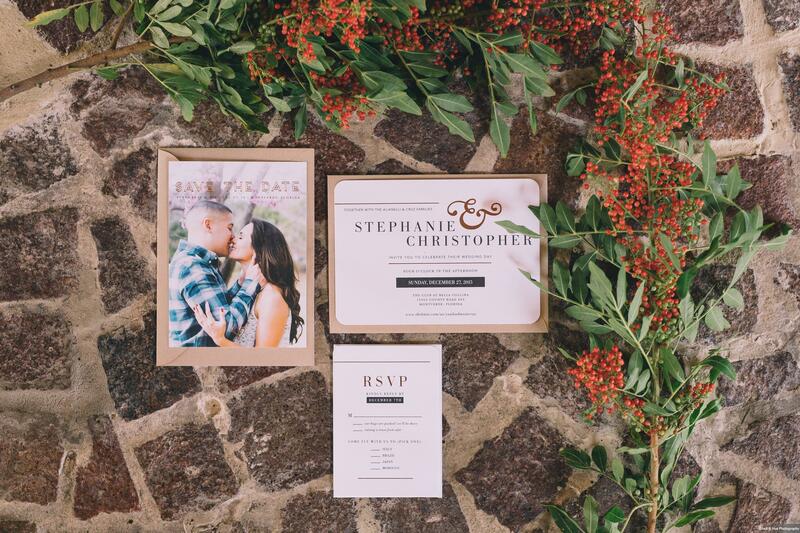 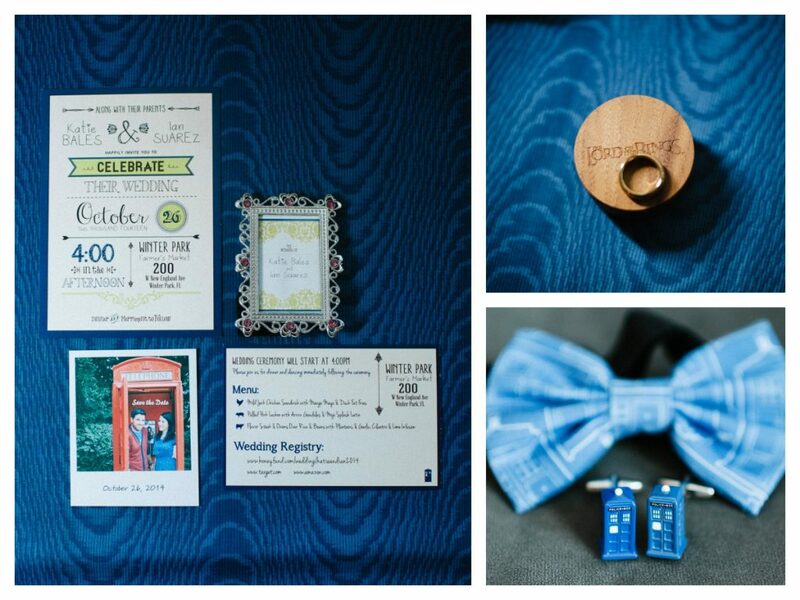 The above photo shows the lovely invitations and Save the Date designed by Dogwood Blossom Stationery. All photos are courtesy of Kathy Thomas Photography. 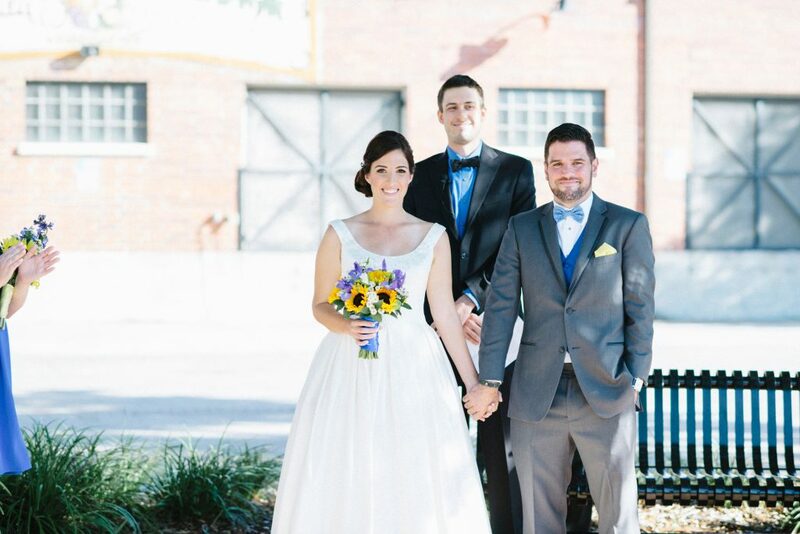 We began by photographing our beautiful bride. Her gown was a masterpiece of lace and flower details from The Collection Bridal. 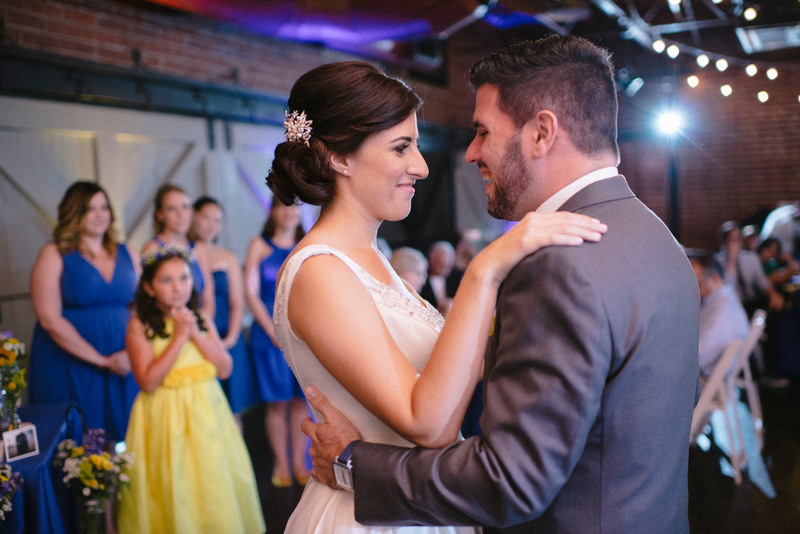 The sparkly and simple jewelry she wore was courtesy of Maria Elena Headpieces. 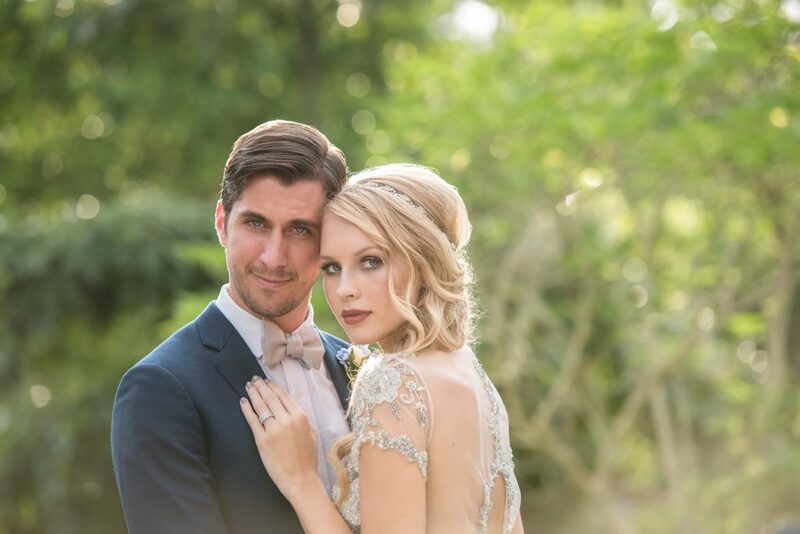 Her hair and make-up were done by True Love Bridal Beauty. 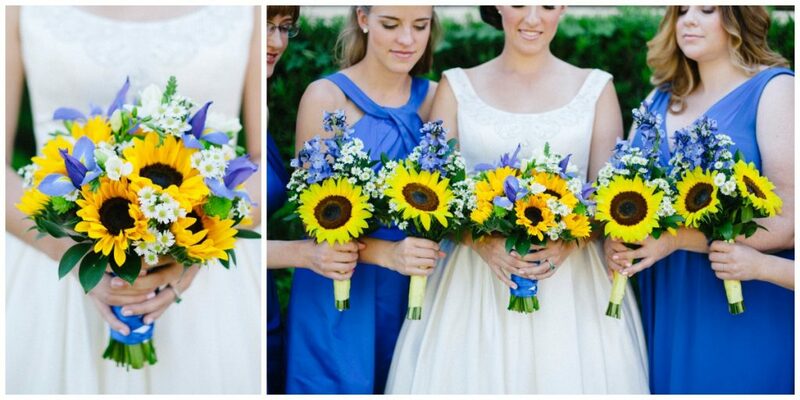 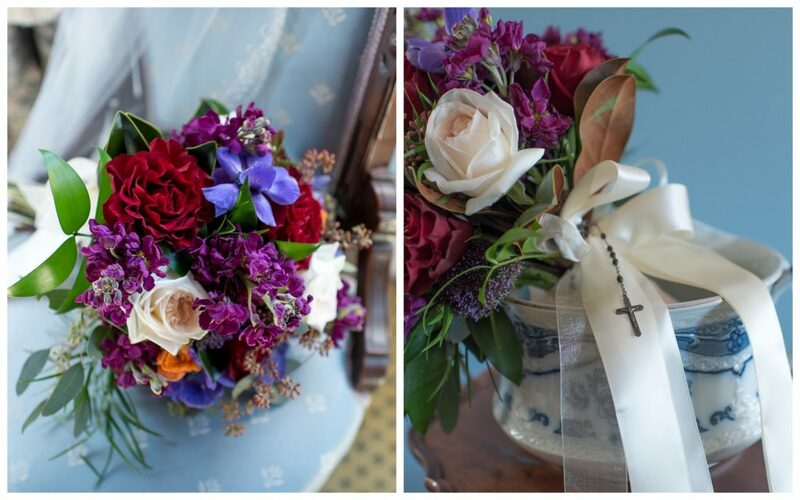 Finally, the gorgeous bouquet was composed by our floral designer for the day, Bluegrass Chic. 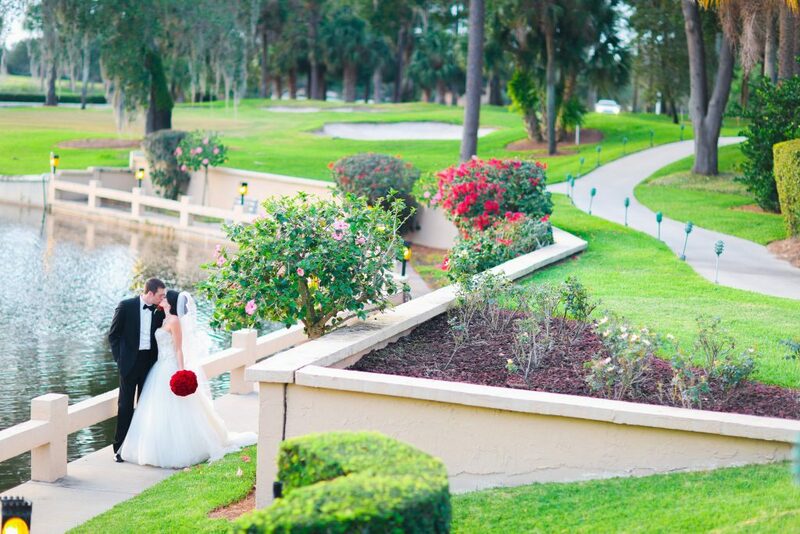 We next ventured outside to explore the outdoor ceremony space, a lovely grassy area with a view of the lake. 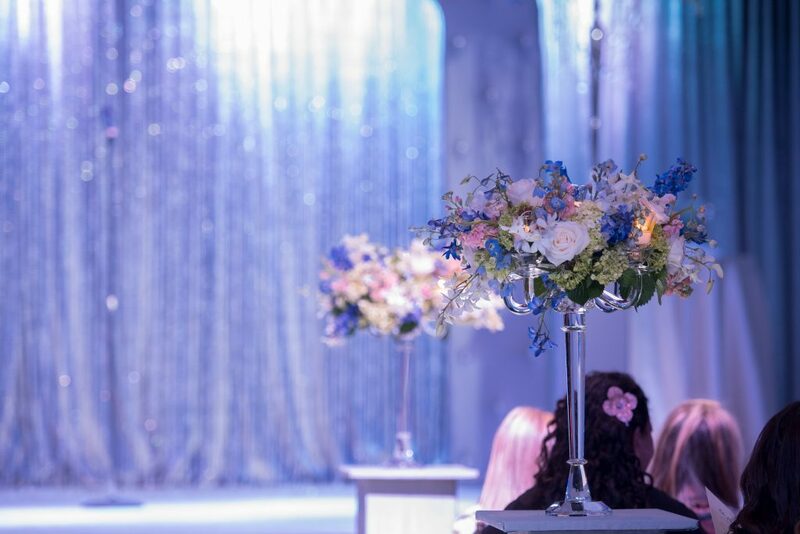 Rows of seating were set up by Orlando Wedding and Party Rentals, with a huge display of flowers by Bluegrass Chic set up on a pedestal at the end. 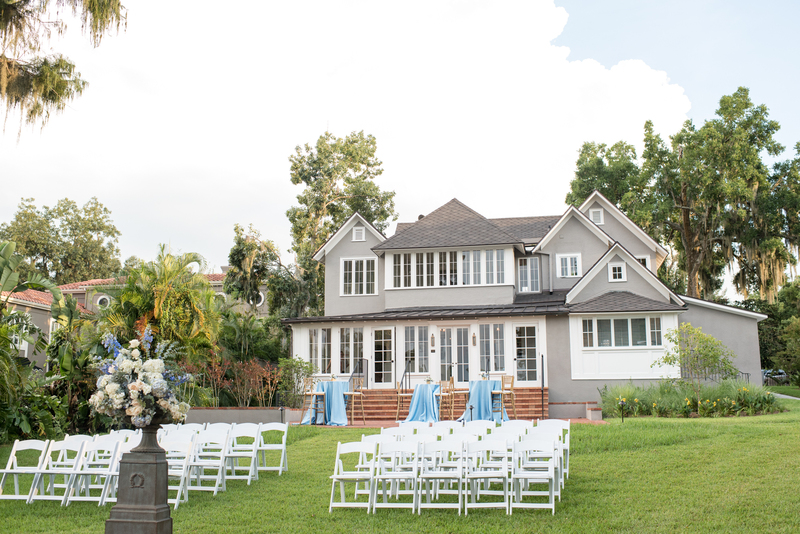 Between the ceremony space and the house, the cocktail hour was set up, with serenity blue tablecloths on tables and more floral arrangements from Bluegrass Chic. 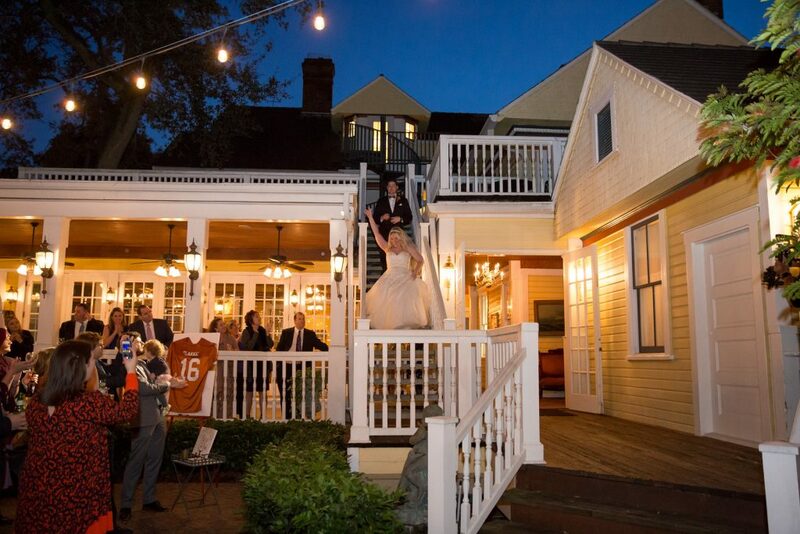 The proximity to the lake and dock allowed for some lovely photos of the bride & groom outside, providing future couples with an idea of what photo opportunities they would have at The Capen House. 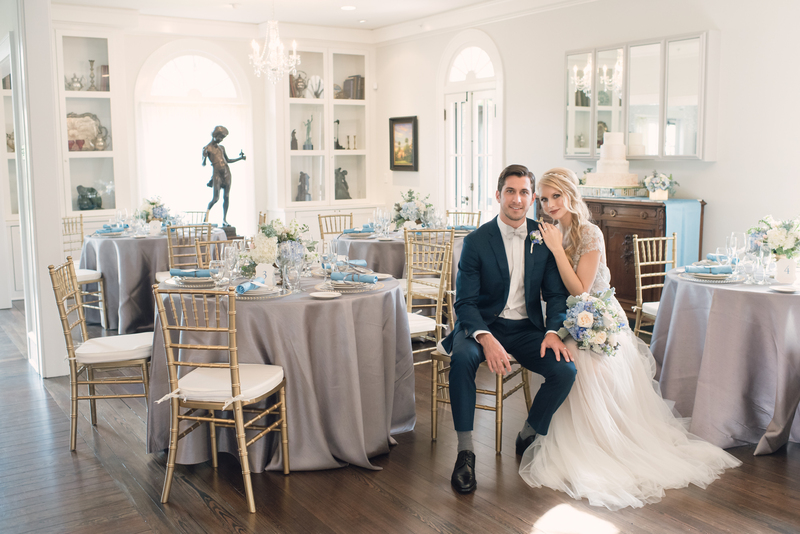 We then moved inside to get an idea of what interior shots would be available, finding a cozy and romantic room that reflected the color scheme. 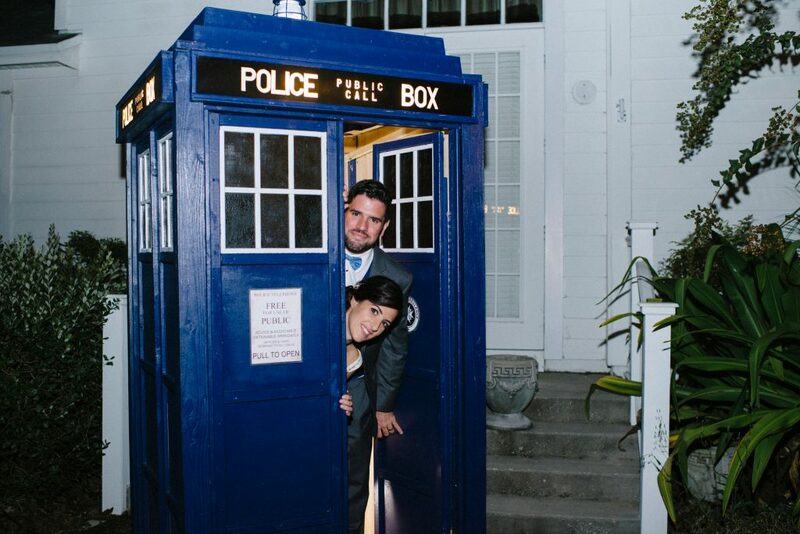 At last, it was time to move onto the reception. 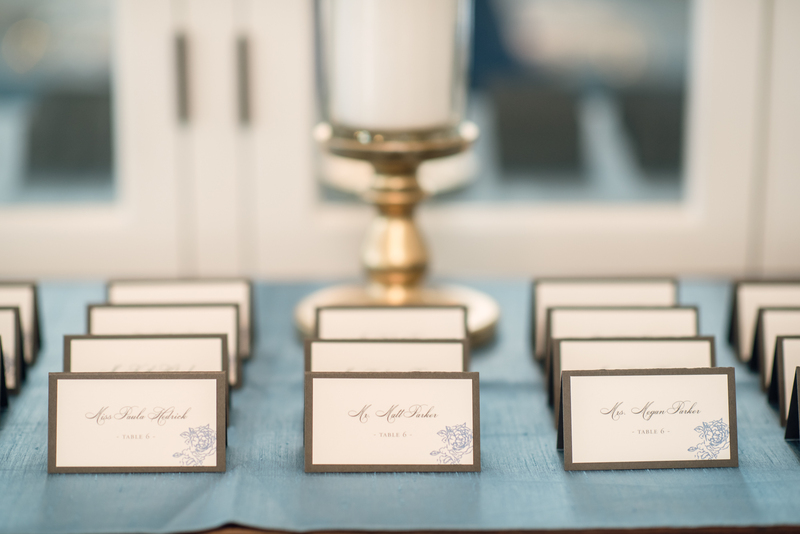 Our journey began with gorgeous and simple table assignment cards, designed by Dogwood Blossom Stationery. 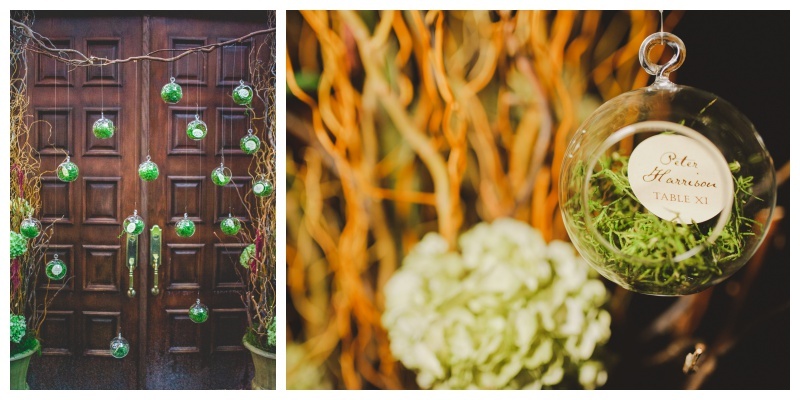 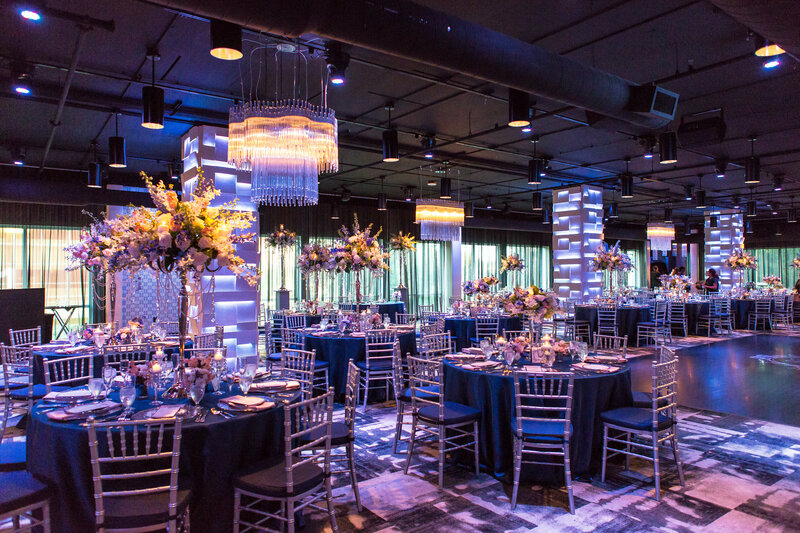 The reception was set up in a gorgeous white room, surrounded by art, sculpture, and glowing chandeliers. 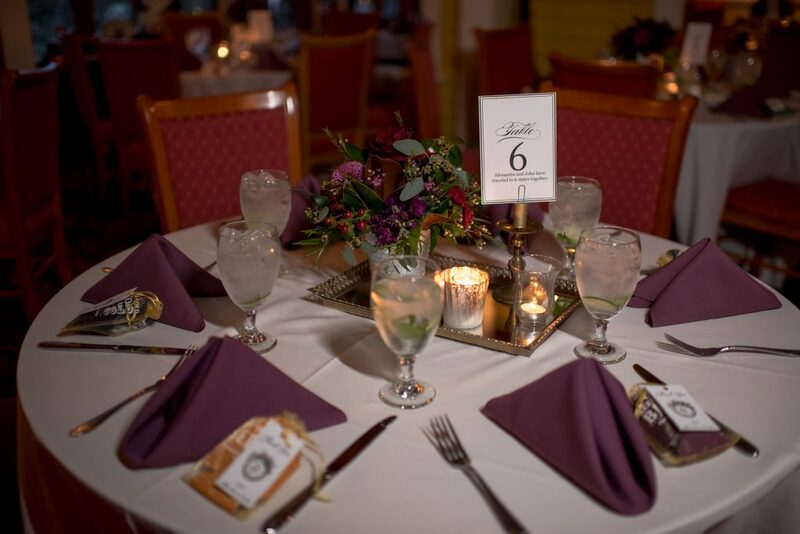 Orlando Wedding and Party Rentals provided chairs and tables, and the lovely classic table numbers and menus were made by Dogwood Blossom Stationery, with food provided by Arthur’s Catering. 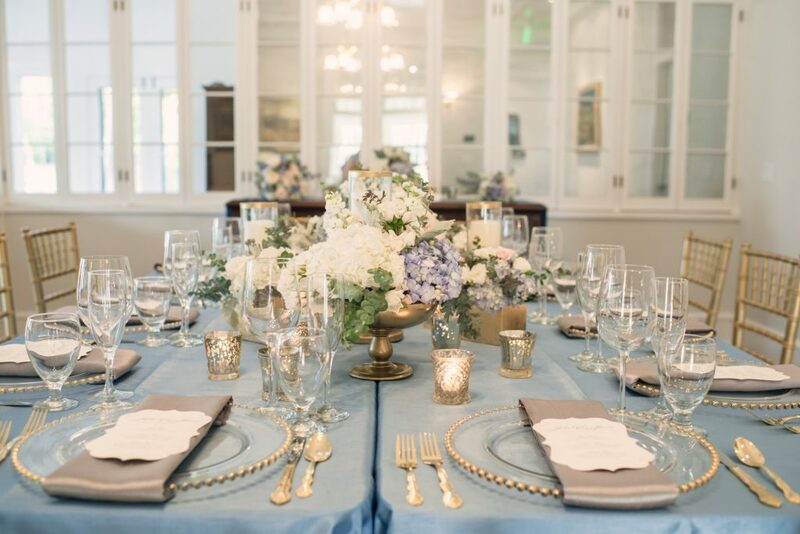 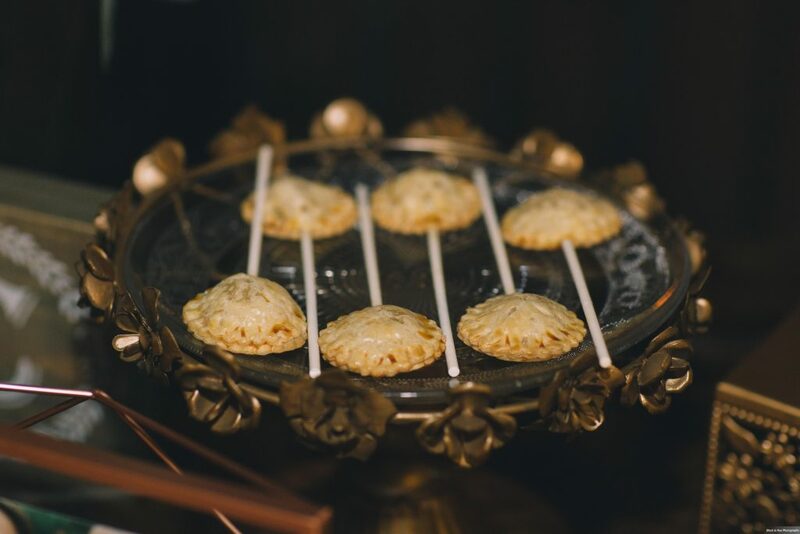 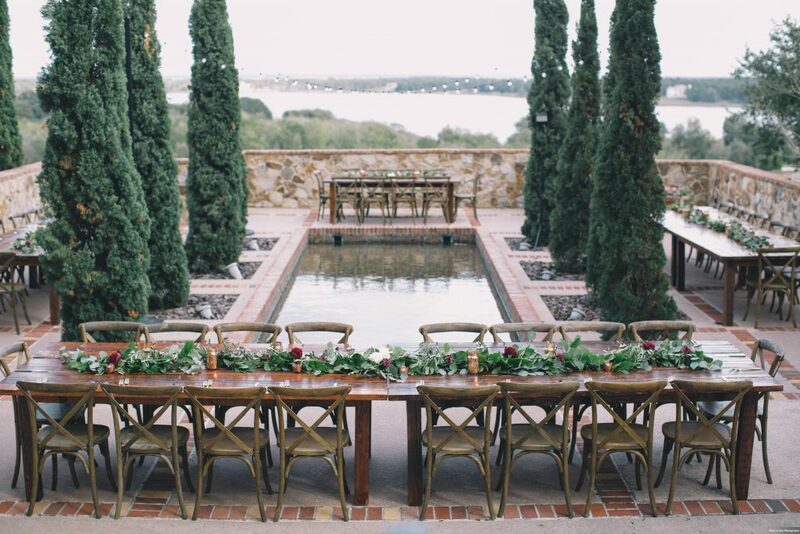 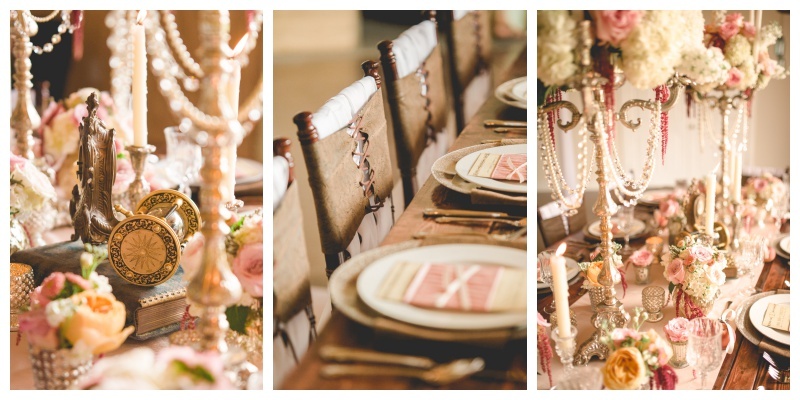 Accents of gold came in the form of the chargers and silverware, as well as gold-toned Chiavari chairs. 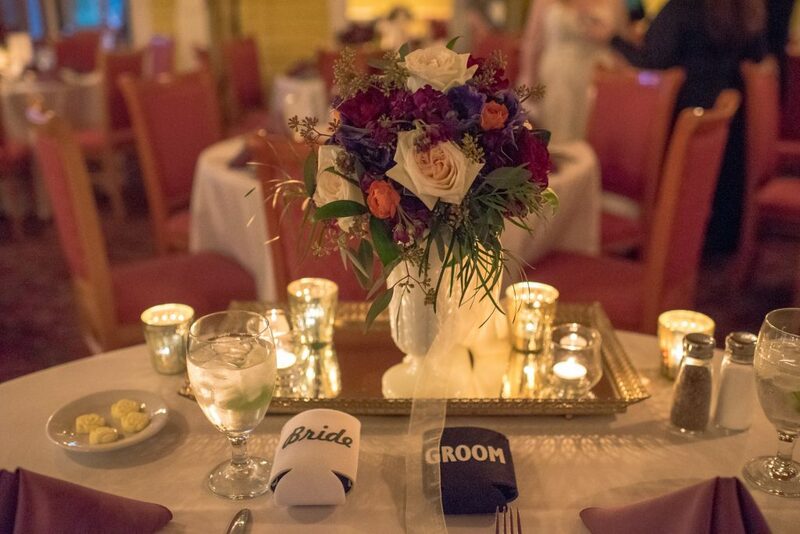 One final classy detail came in the form of a wine bottle placed at each table. 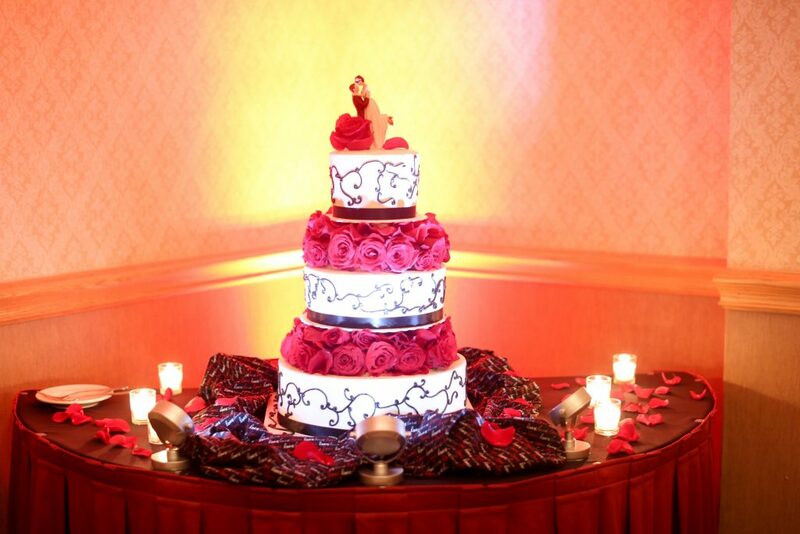 Last but most definitely not least, we have the gorgeous, intricately-detailed cake, made by Cut the Cake. 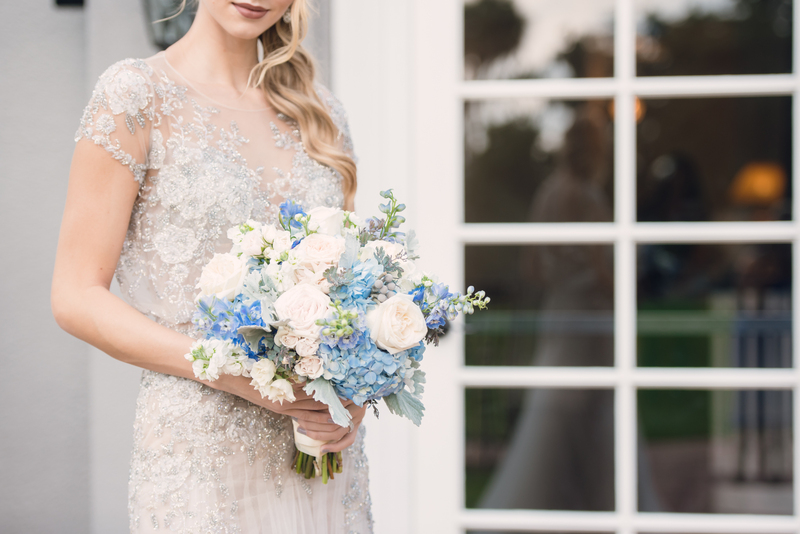 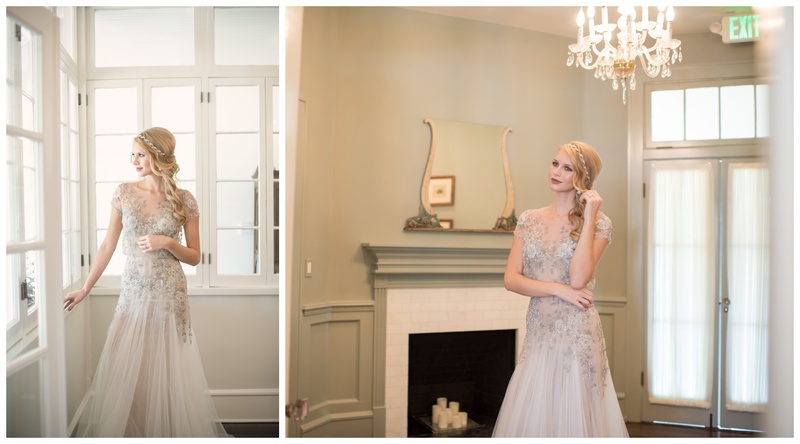 From tiny sugar beads to incredible lace detail, this lovely creation brought together all the elements of classiness, romance, and timeless beauty we were seeking to create in this photo shoot. 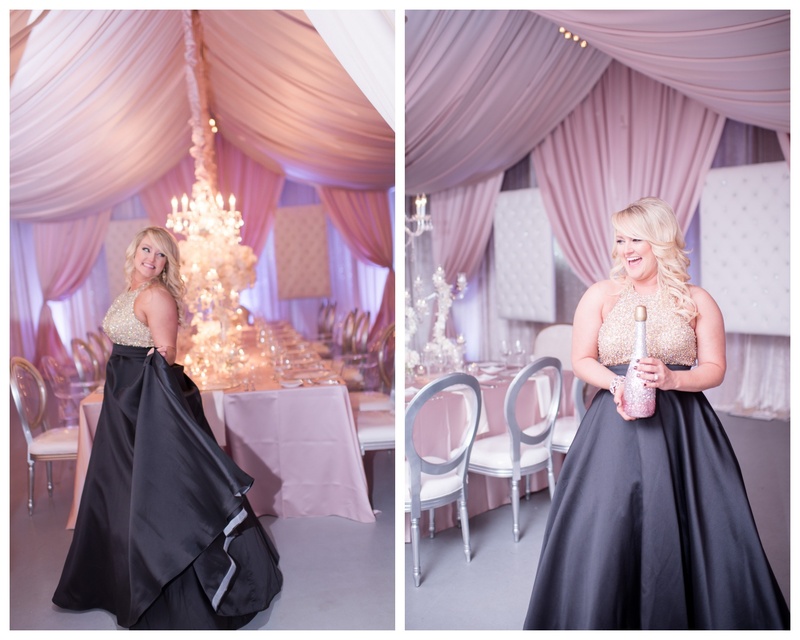 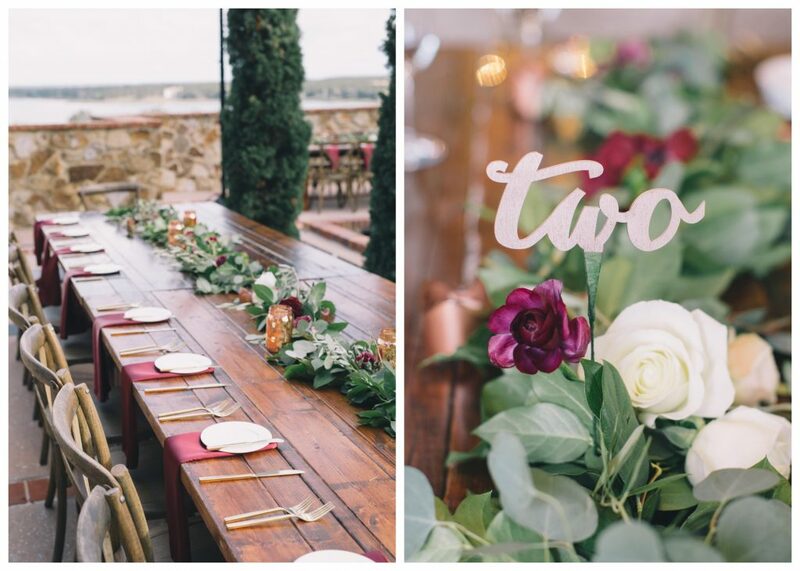 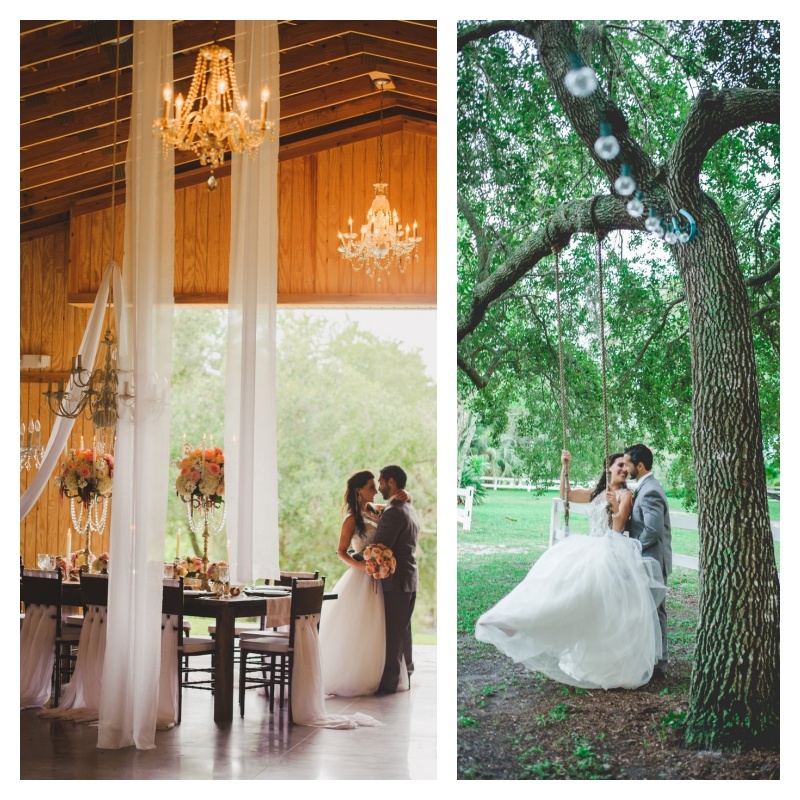 Much thanks to the venue and vendors we worked with on this beautiful shoot, we had a wonderful time with all! 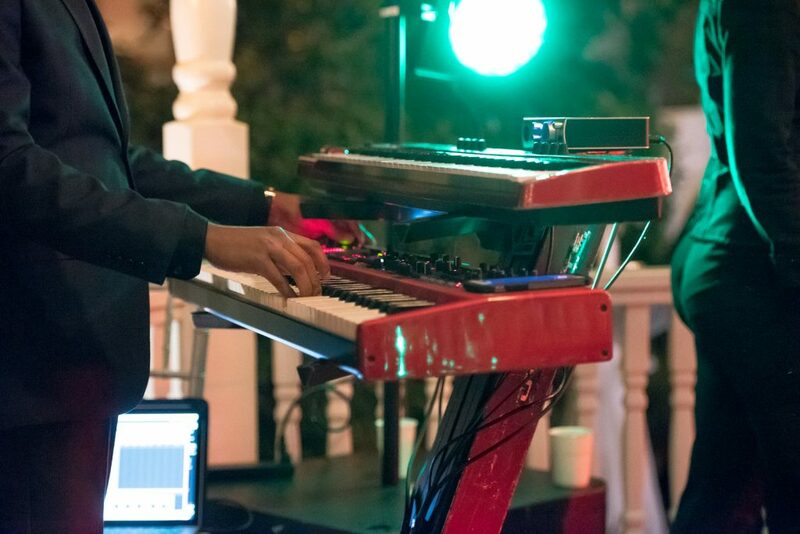 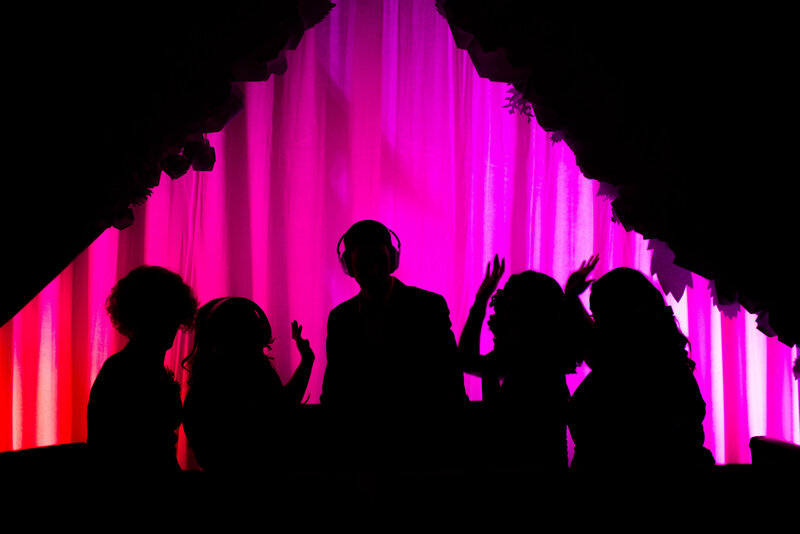 Back in 2015, we were lucky enough to be a part of a 5-year anniversary celebration for Our DJ Rocks, Orlando’s only all-female DJ company, and one of our favorites. 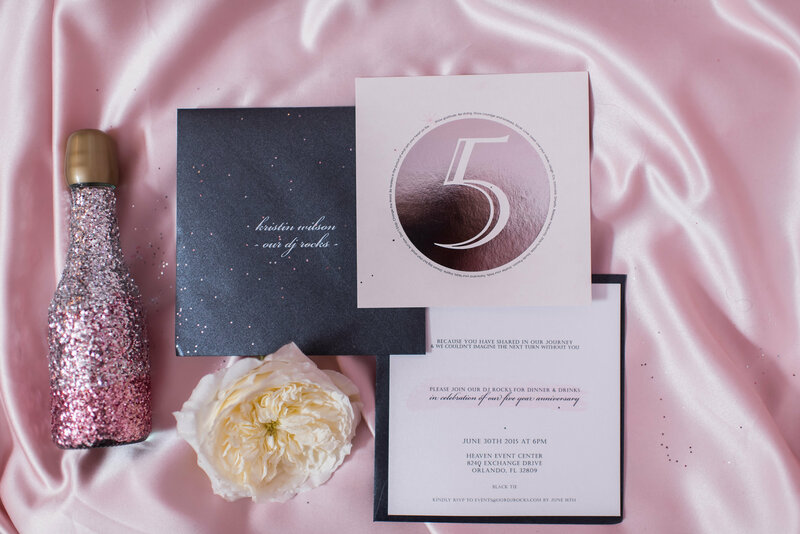 The lovely invitations sent out for the event are pictured above, designed by Little Miss Mrs and printed by Dogwood Blossom Stationery. 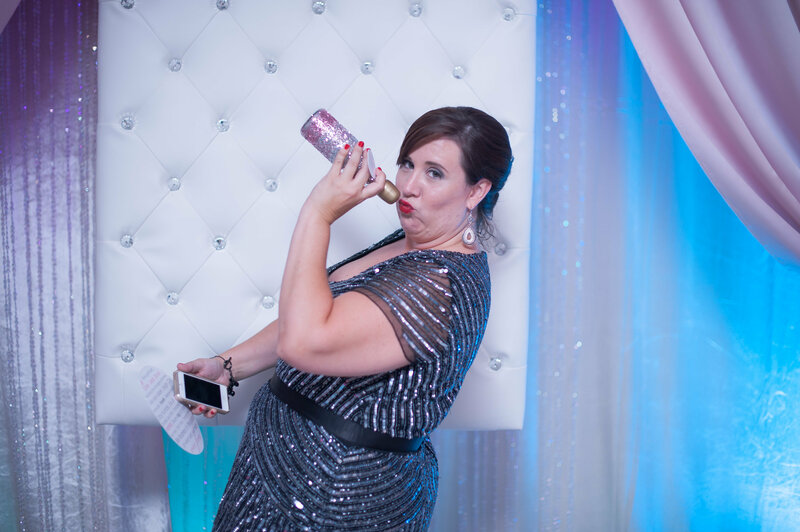 Kristin at Our DJ Rocks gathered some of her closest friends and co-workers for a night of celebration, looking back on all the accomplishments she and the company had reached five years in. 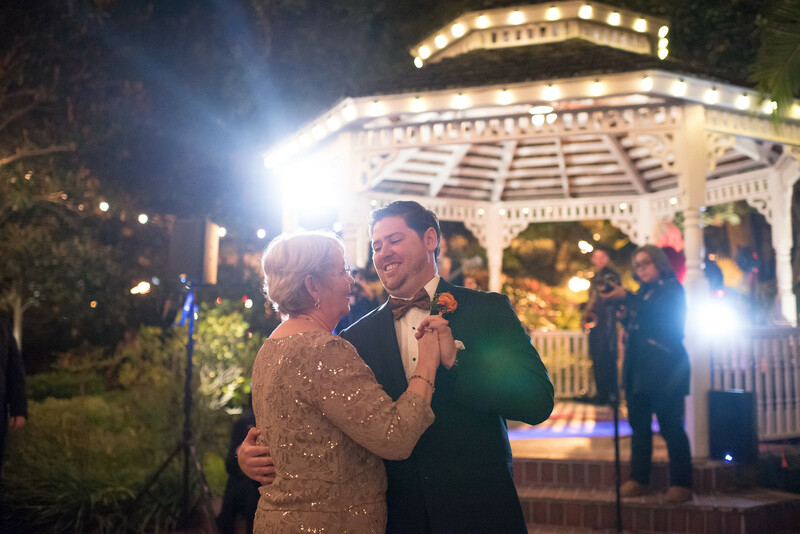 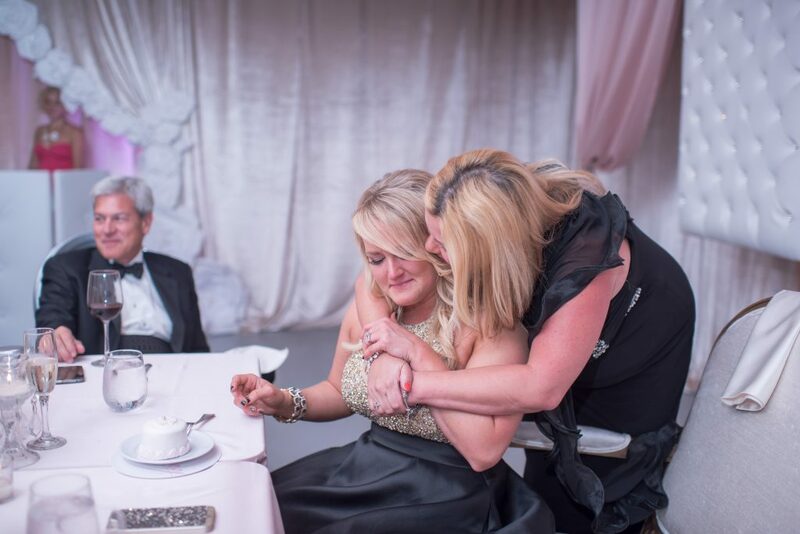 Now, almost another five years down the road, we’d love to revisit that night and all the fun we had planning it, with beautiful photographs provided by Kathy Thomas Photography. 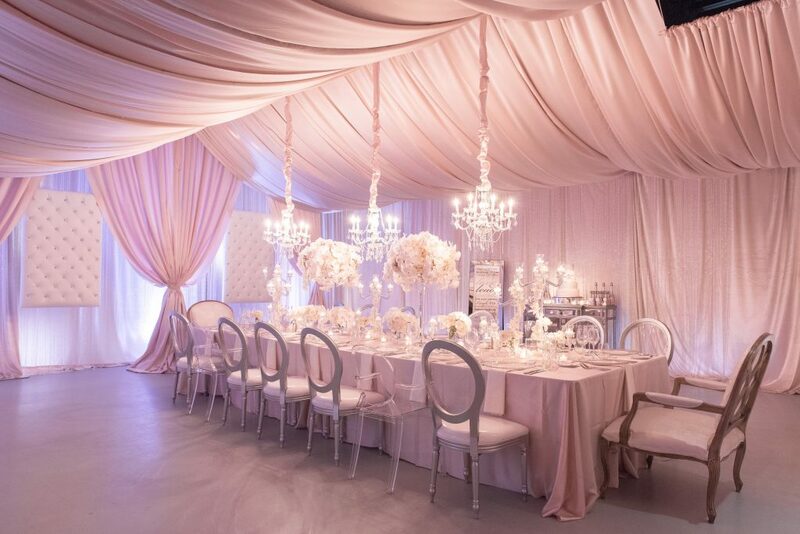 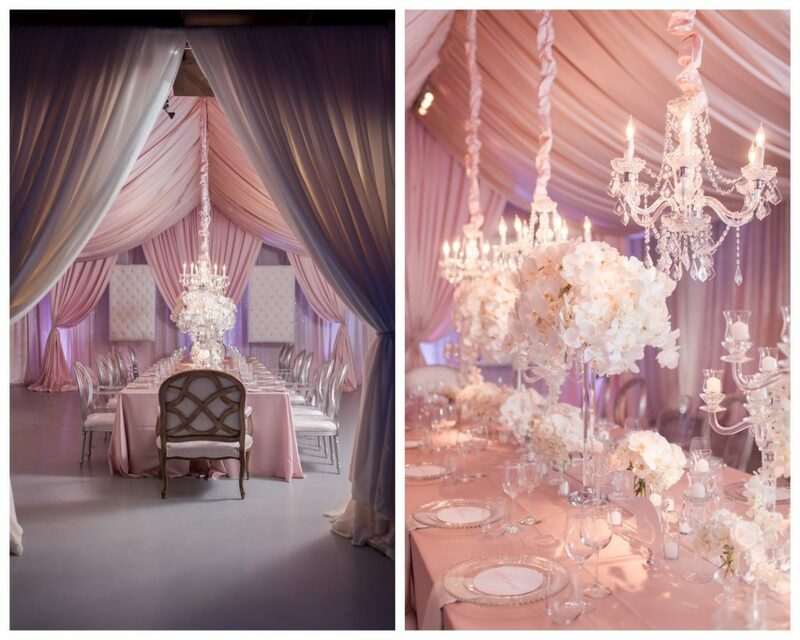 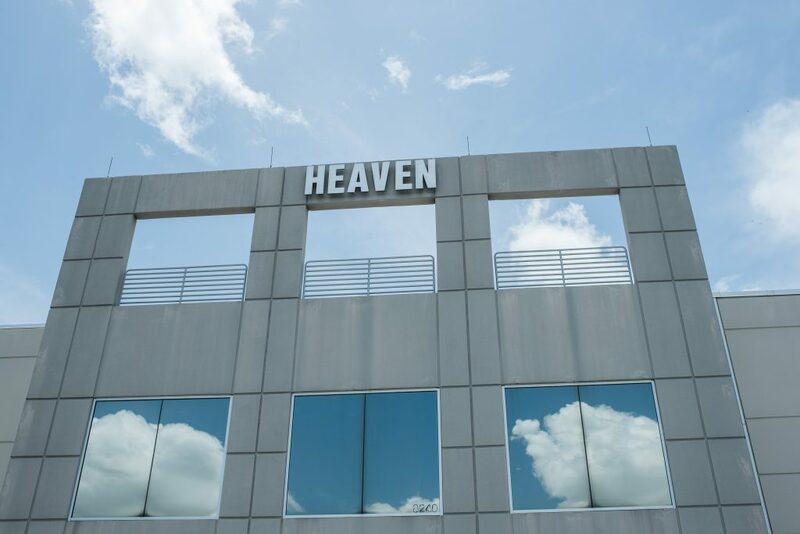 The venue, Heaven Event Center, was transformed into an ethereal space, decked in drapery and chandeliers. 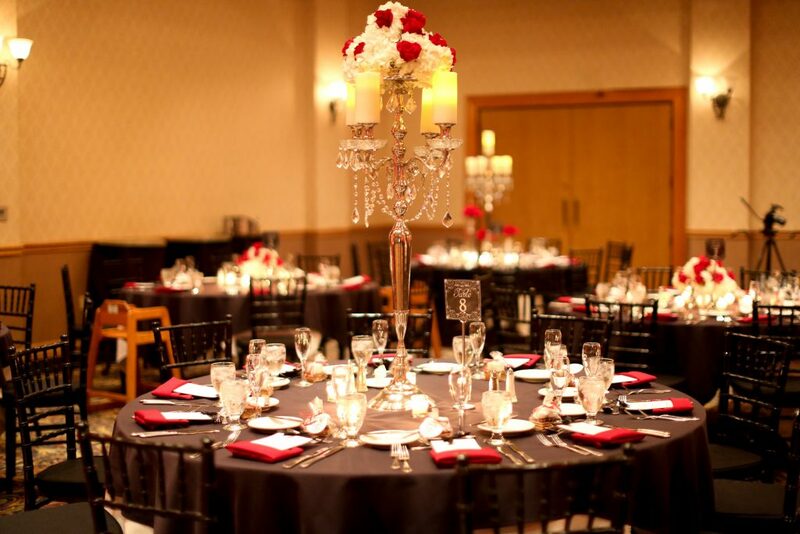 The rental linens were provided by Over the Top Rental Linens, draping was provided by Swag Decor, ghost chairs were provided by AFR Furniture Rental, the King Louis chairs and specialty chairs were provided by Raining Roses, and all other rentals were provided by A Chair Affair, Inc. 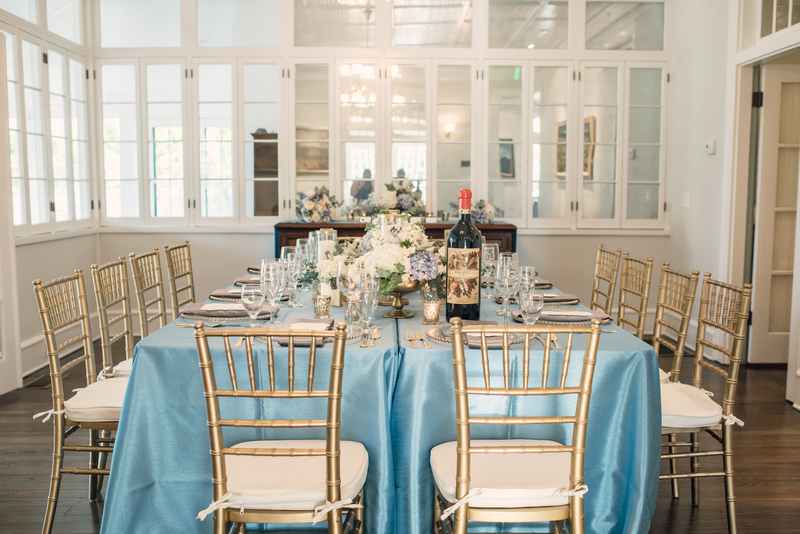 The combination of ghost chairs, King Loius chairs, and specialty chairs at the head of the table created an eclectic and whimsical appearance. 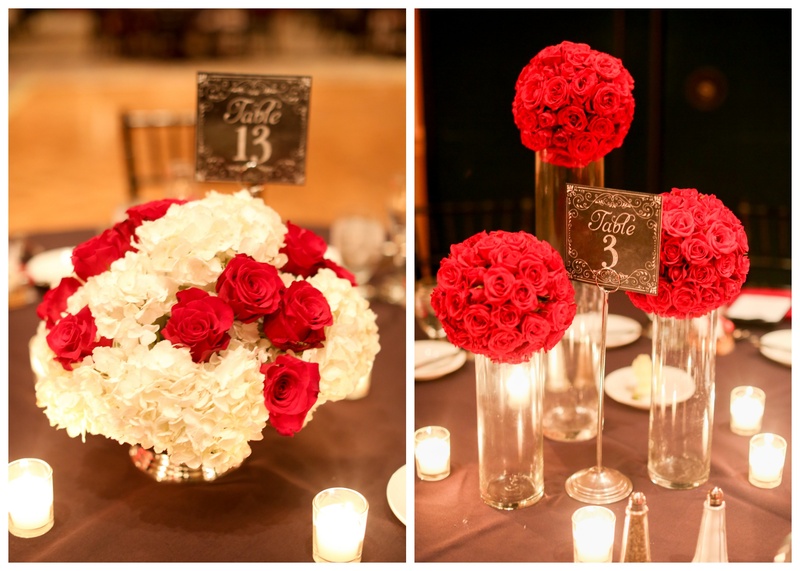 The gorgeous white florals were done by Raining Roses Productions, Inc. 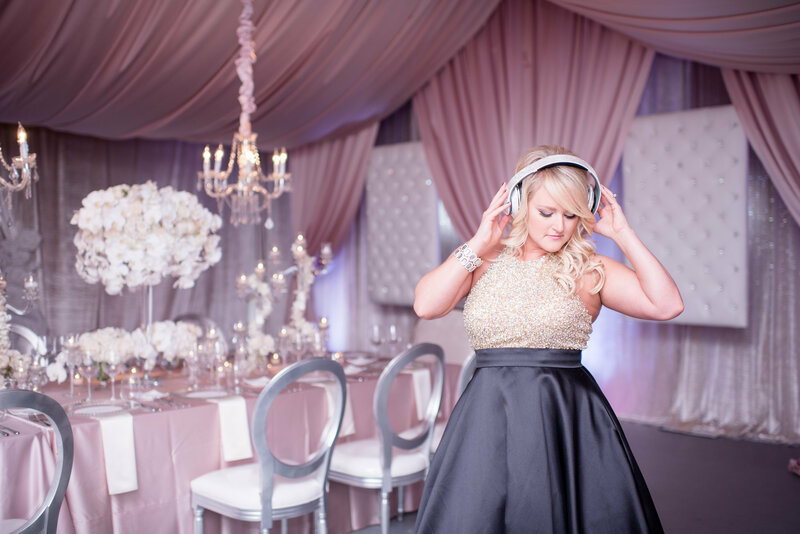 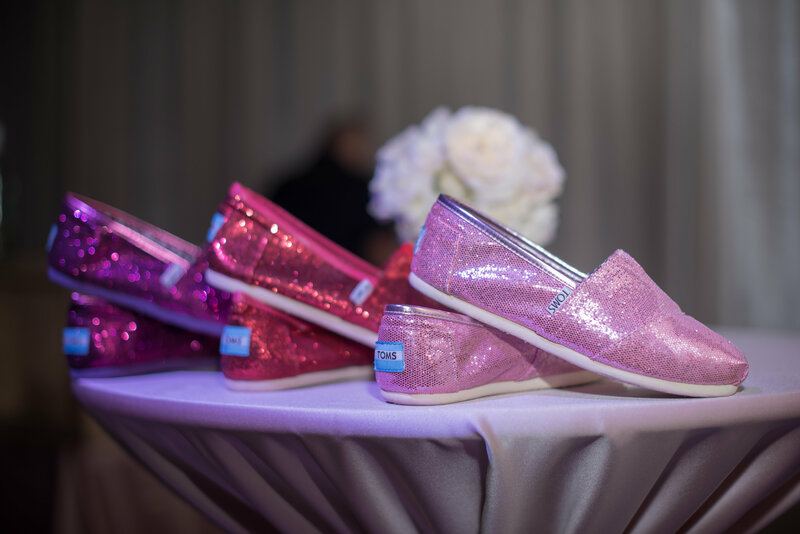 The ladies of Our DJ Rocks paired gorgeous formal gowns with sparkly red & pink Toms, as pictured above. 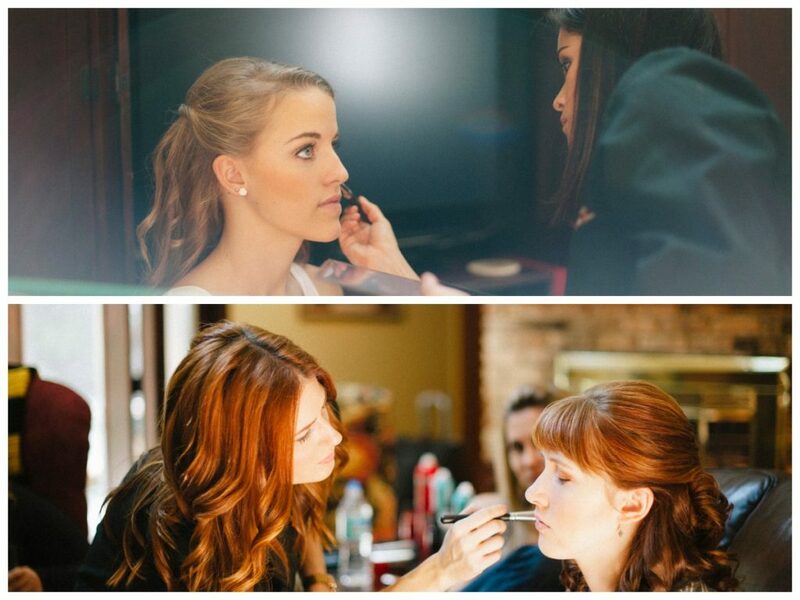 Hair and make-up was done masterfully by Cristi Miranda. 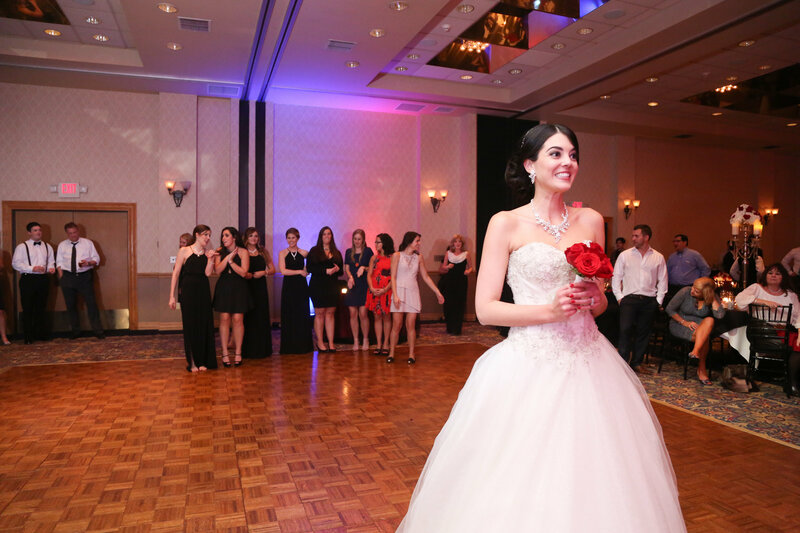 On a night of sparkles and bright whites, no one shone brighter than the lady of the hour, Kristin. 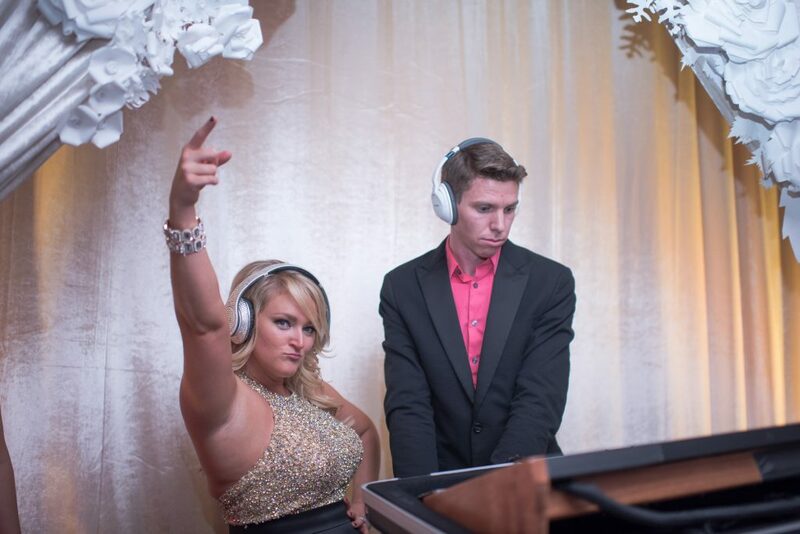 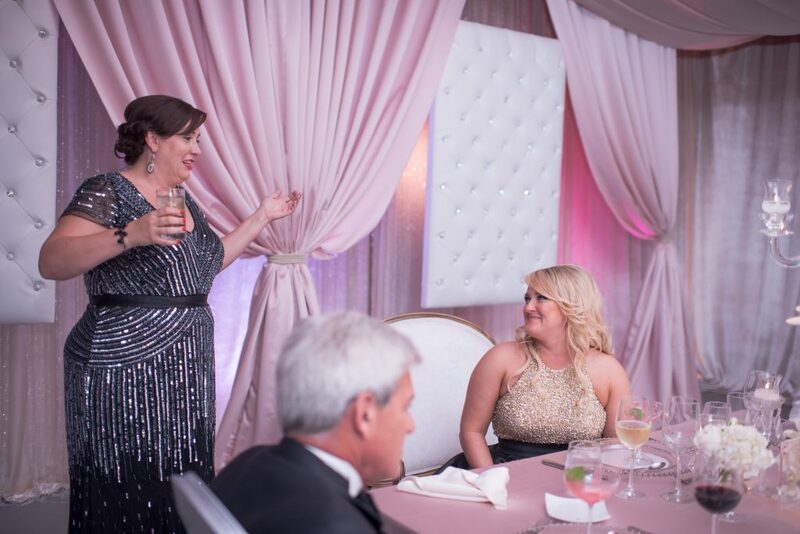 The guests began to arrive and were thrilled to celebrate Kristin and Our DJ Rocks’ many accomplishments! Everyone gathered first for a dinner catered by Arthur’s Catering and Events, followed by gorgeous sparkly and shiny cakes prepared by Cut the Cake. 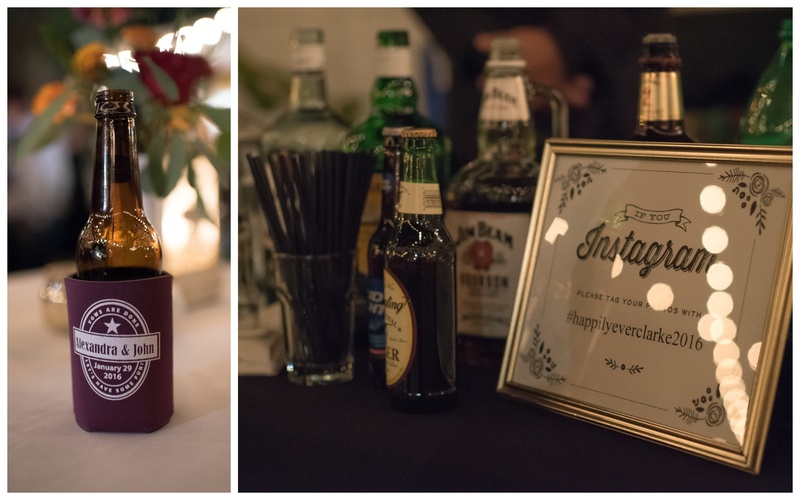 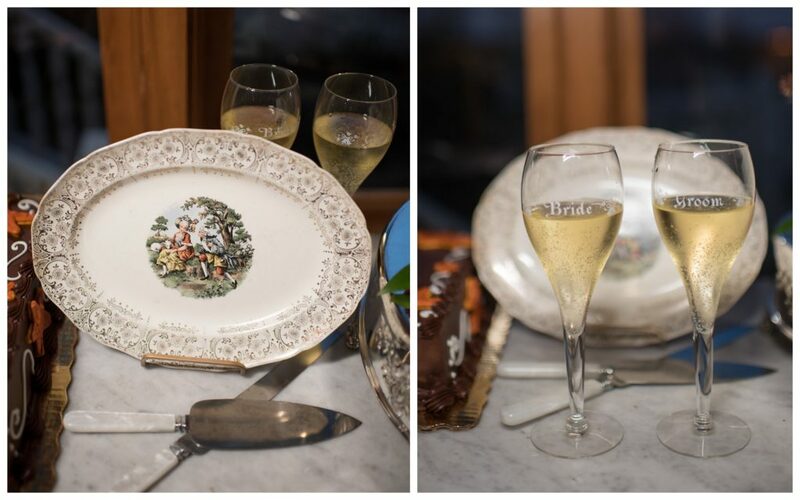 As the guests enjoyed their beautiful cakes, co-workers and friends of Kristin led the room in a series of toasts. 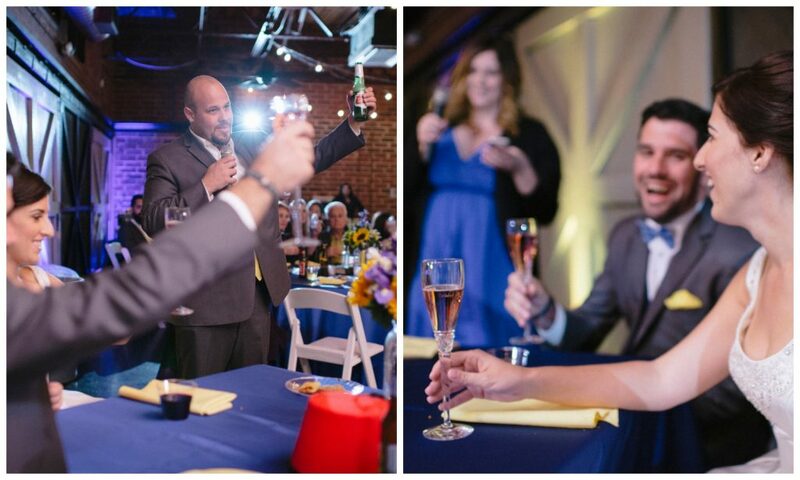 It was clear to see how much these toasts meant to Kristin and all those that love her; there were not many dry eyes left in the house by the end. 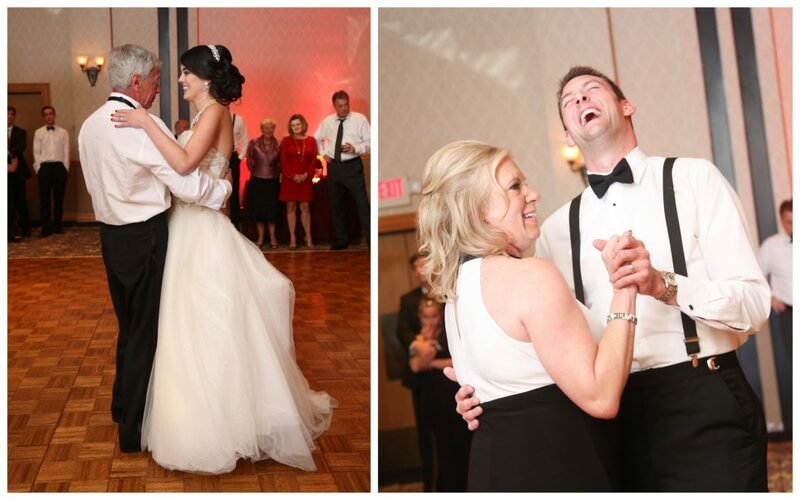 At last it was time for the most fun part of the night: dancing! 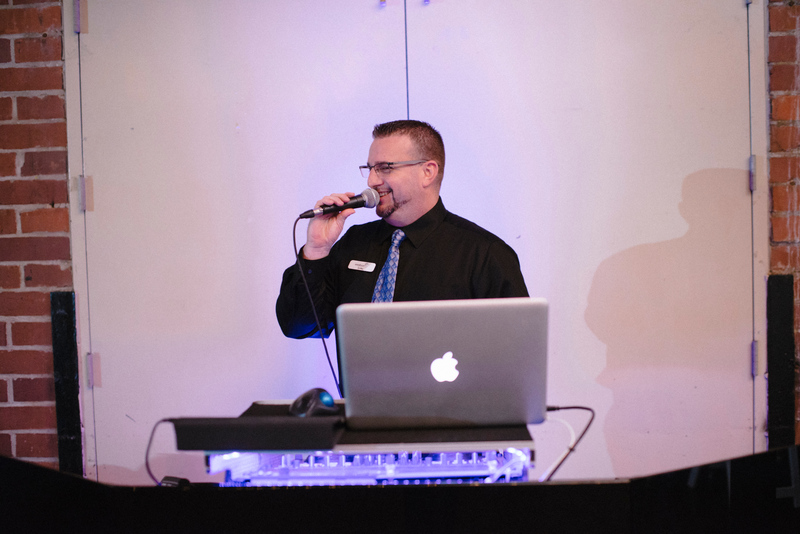 The DJ entertainment was provided by DJ Jacob Towe, who led the fun-loving group in moving and grooving the night away. 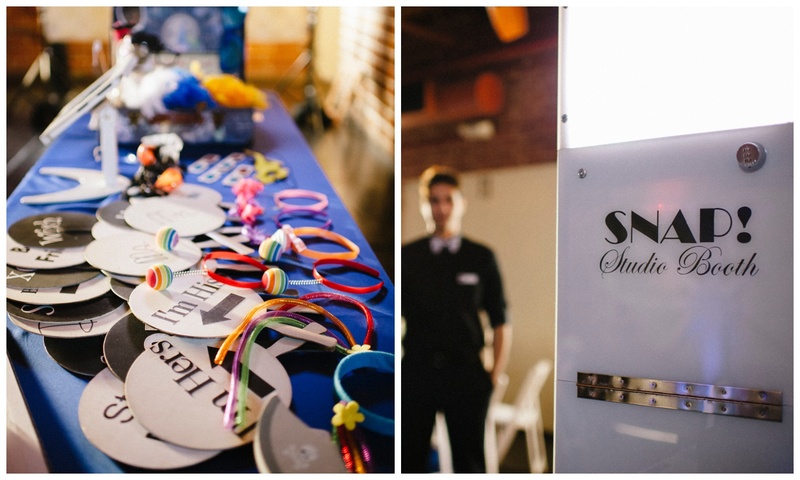 Between dances, the guests also enjoyed the photo booth provided by Photobooth Rocks. 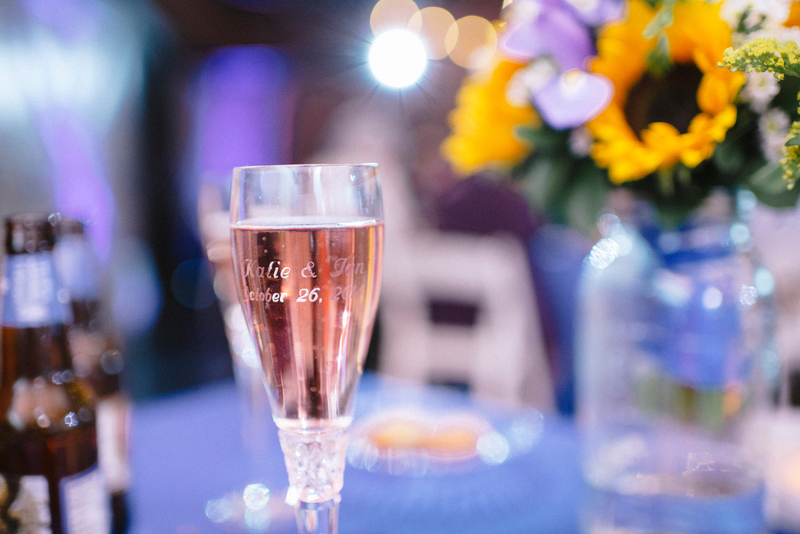 The adorable favors of sparkly champagne bottles were provided by Dogwood Blossom Stationery. 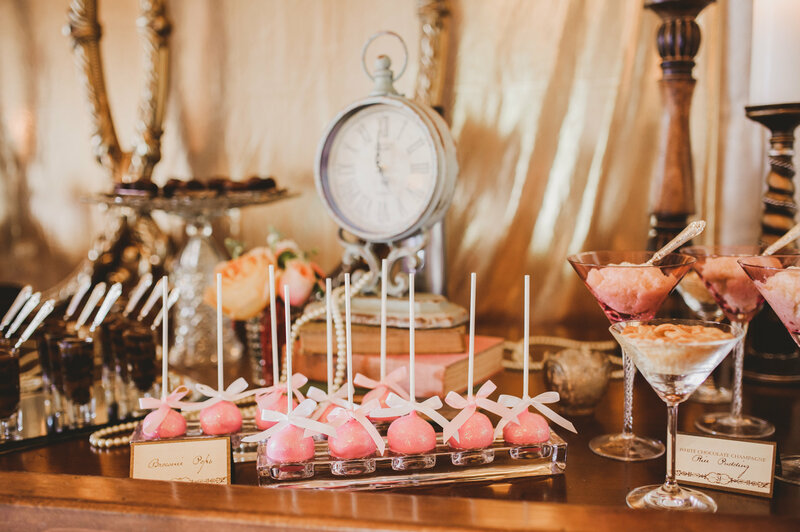 For our next blog post, we went back in time to revisit a gorgeous photo shoot we had the joy of designing: a Labryinth-inspired wedding at Up the Creek Farms. 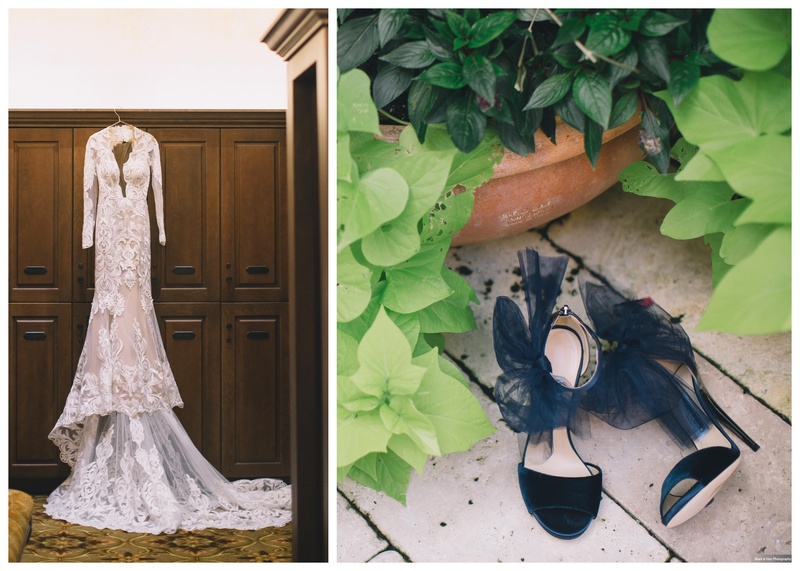 This shoot had a special place in our hearts, and even caught the attention of the wedding blog Every Last Detail, who wrote a feature on it. 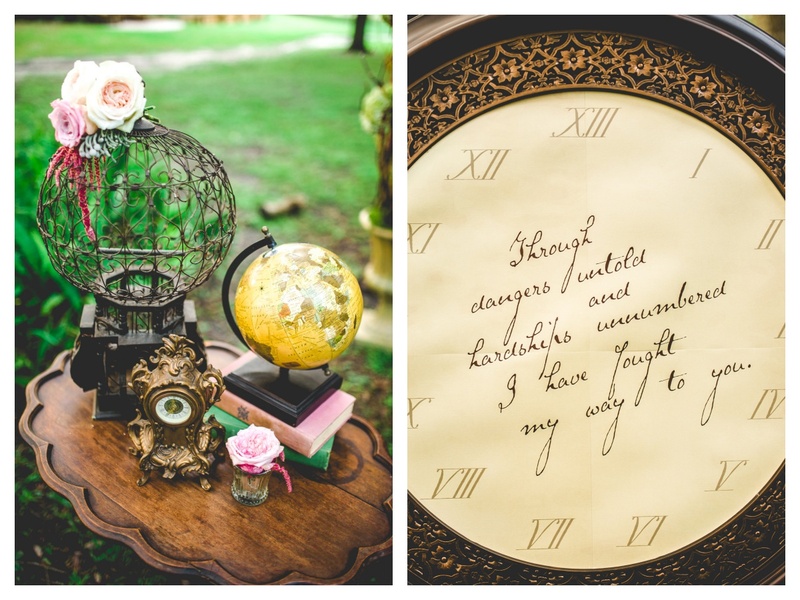 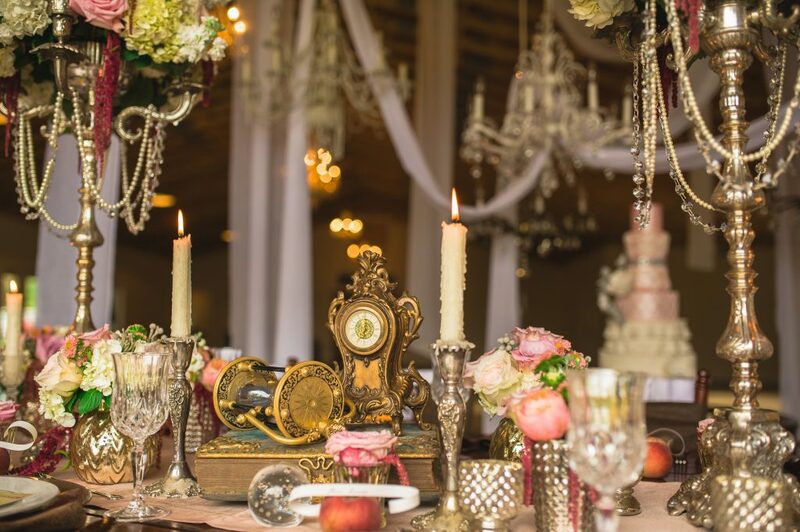 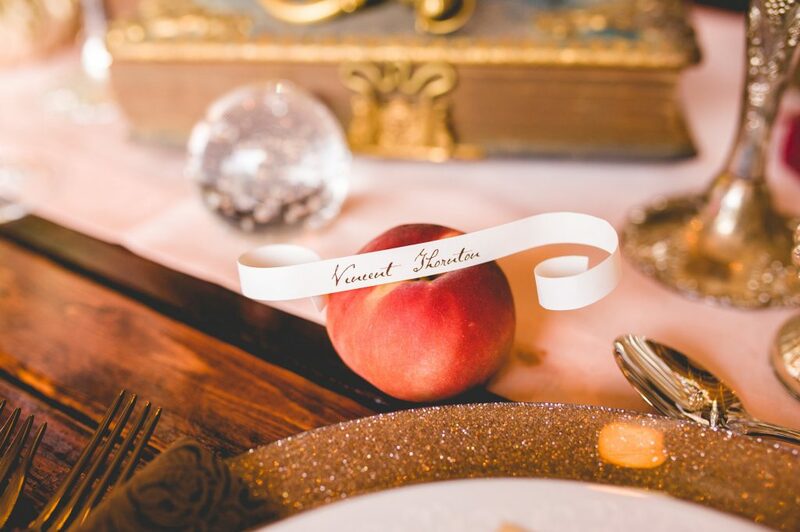 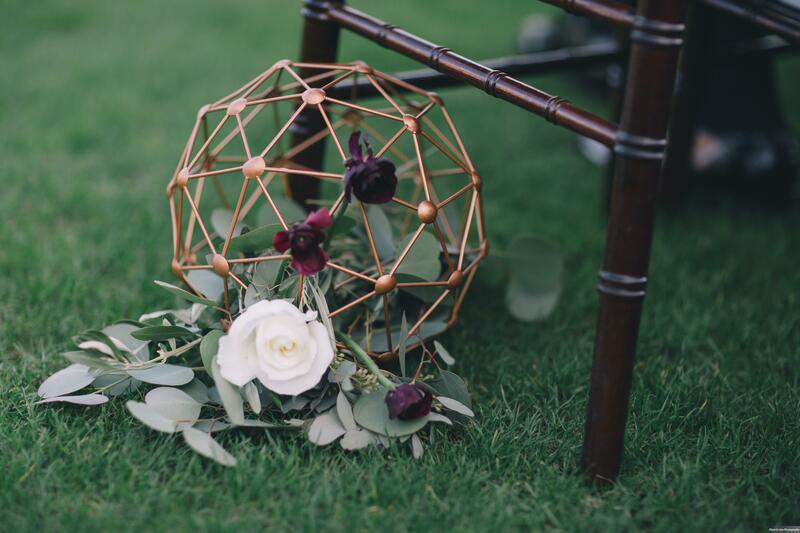 Conceived by Denise at Dogwood Blossom Stationary, the photo shoot was specifically inspired by the ballroom scene in Labyrinth, with details ranging from the thirteen-hour clock to the bride’s hair modeled after Jennifer Connolly’s in the film. 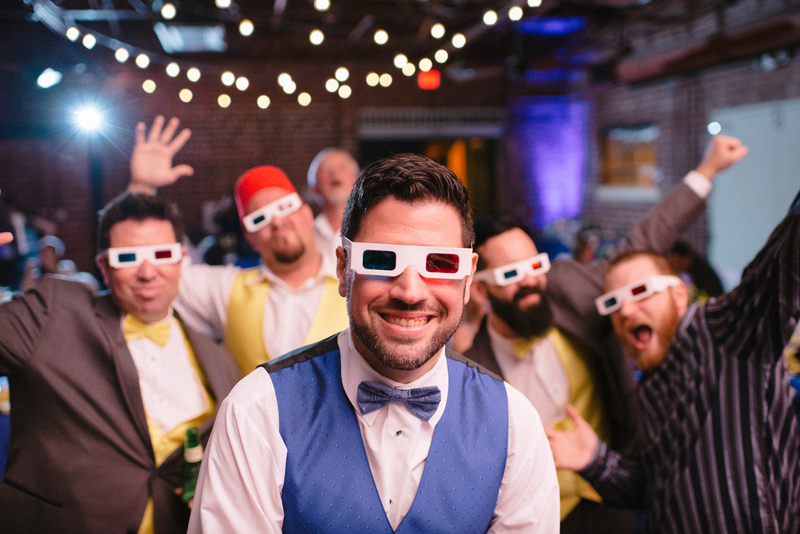 We all had a blast getting together and watching the movie for inspiration, then turning that into a real-life whimsical experience. 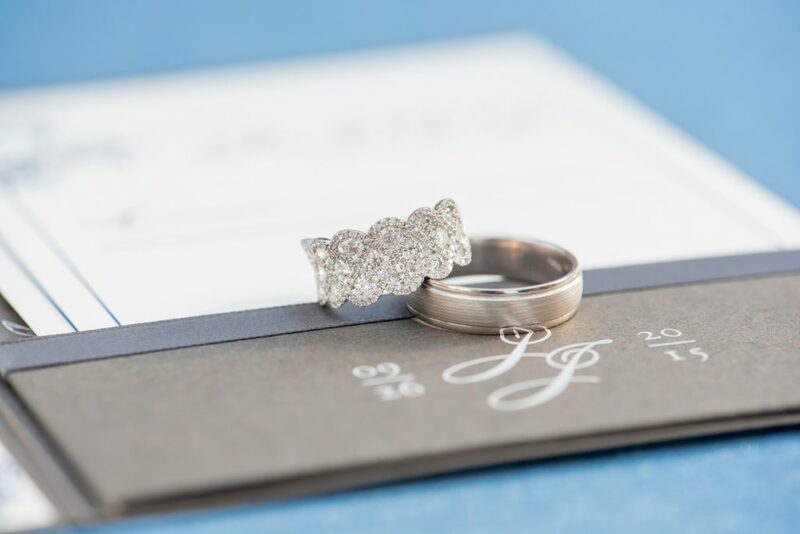 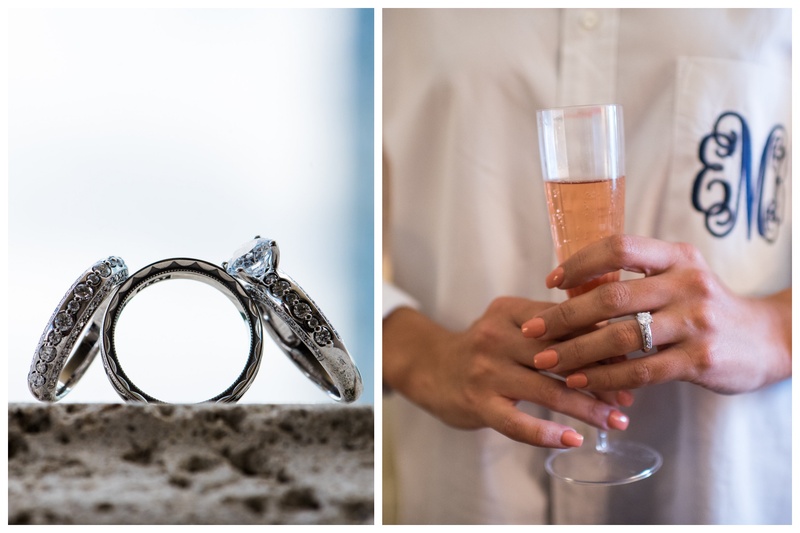 Thanks to That First Moment Photography, we are able to share these incredible details with you! 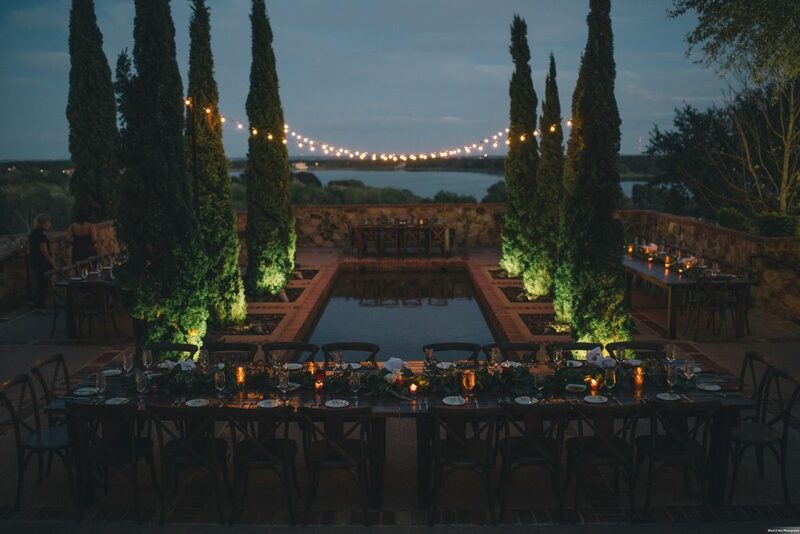 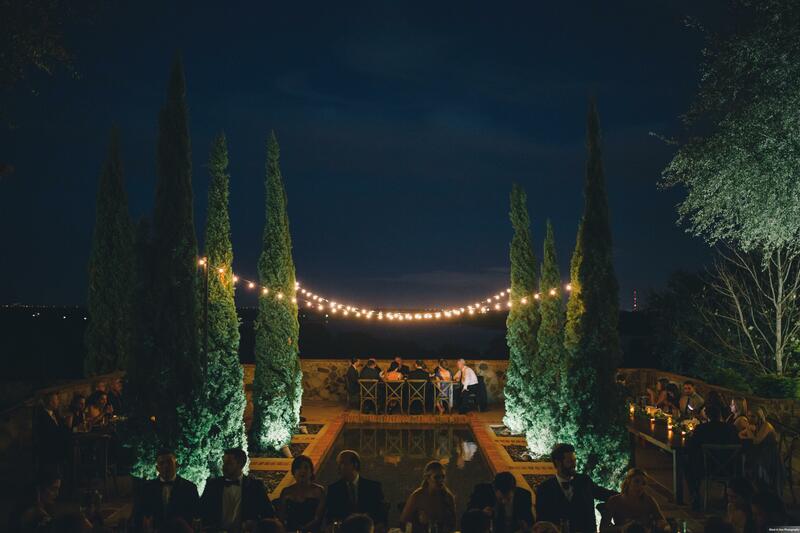 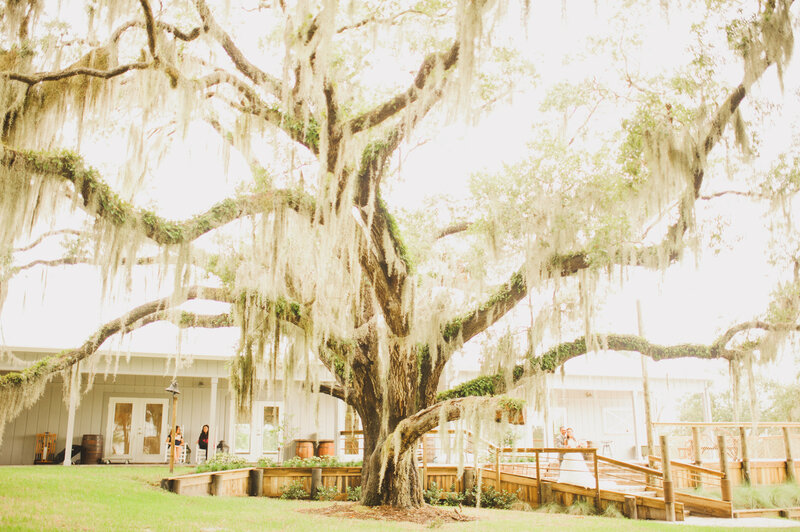 Up the Creek Farms served as the perfect setting for our ethereal theme, beginning in the gorgeous outdoor field featuring Spanish moss hanging from the trees. The bride and groom were dressed and made up to look like the two stars of the film: the bride’s gown, designed by LA Bridal Boutique, and hair, done by Marigold Scott Hair & Makeup, were made to resemble Sarah’s in the ballroom scene of the film. 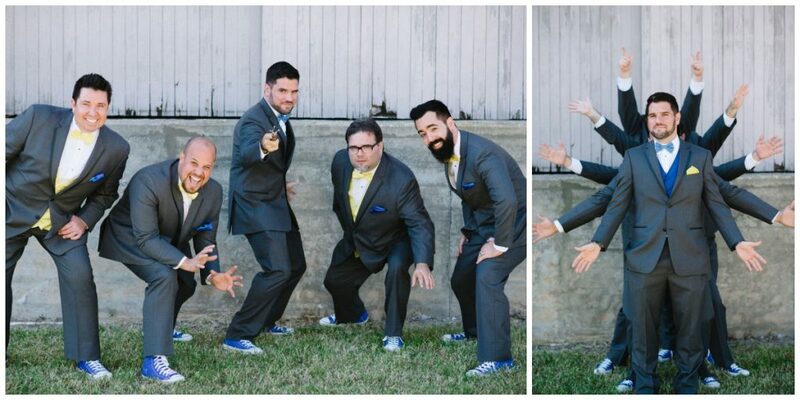 The groom was dressed in a gorgeous tux by Absolutely Fitting. 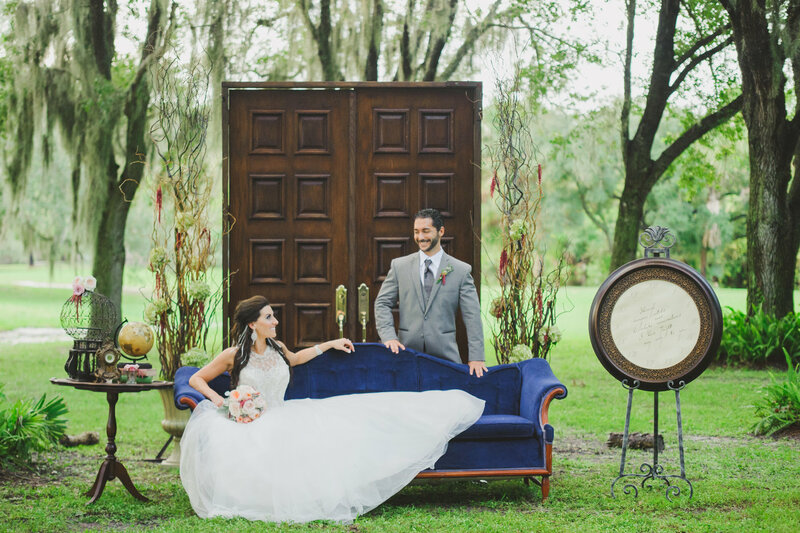 The decorative details began outside, with a velvety blue couch set up in front of a pair of doors. 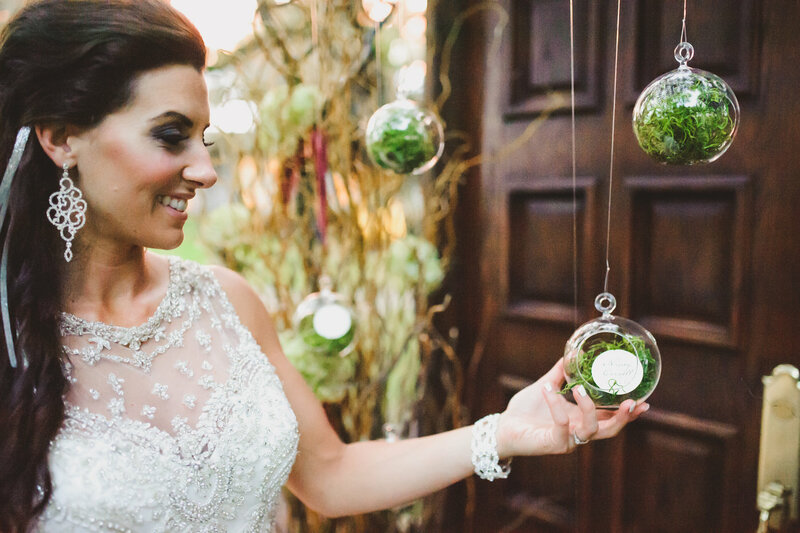 On one side was a 13-hour clock, which read a slightly-edited quote from the film: “Through dangers untold and hardships unnumbered, I have fought my way to you.” Another fun detail came in the form of table assignments held in small “crystal” balls, ornaments hanging in front of the pair of doors. 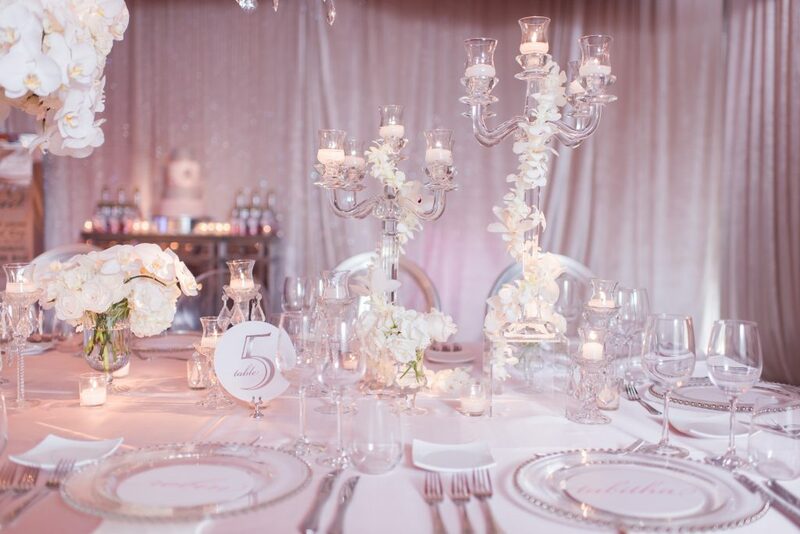 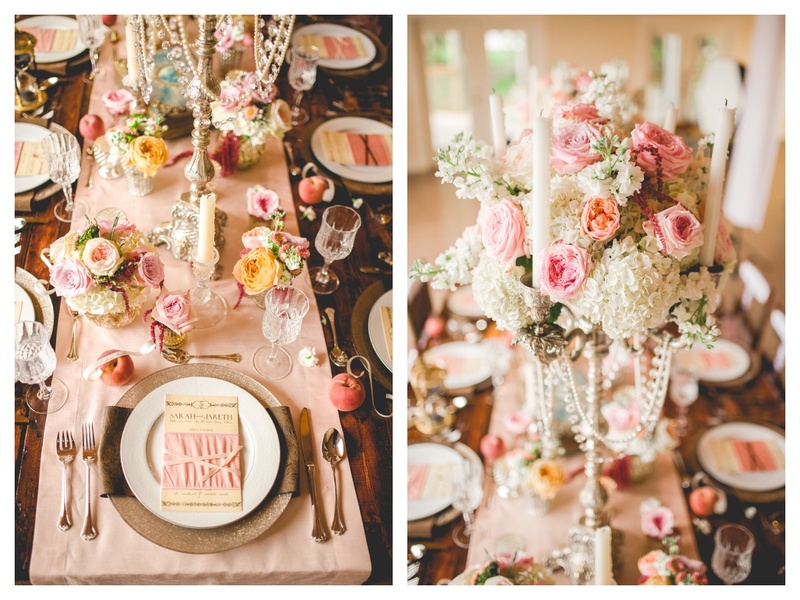 The florals done by Flowers by Lesley evoked the perfect balance of mystery and whimsy, utilizing the color scheme of pink and white. One fun accent was the boutonniere worn by the groom, which featured a small watch face. 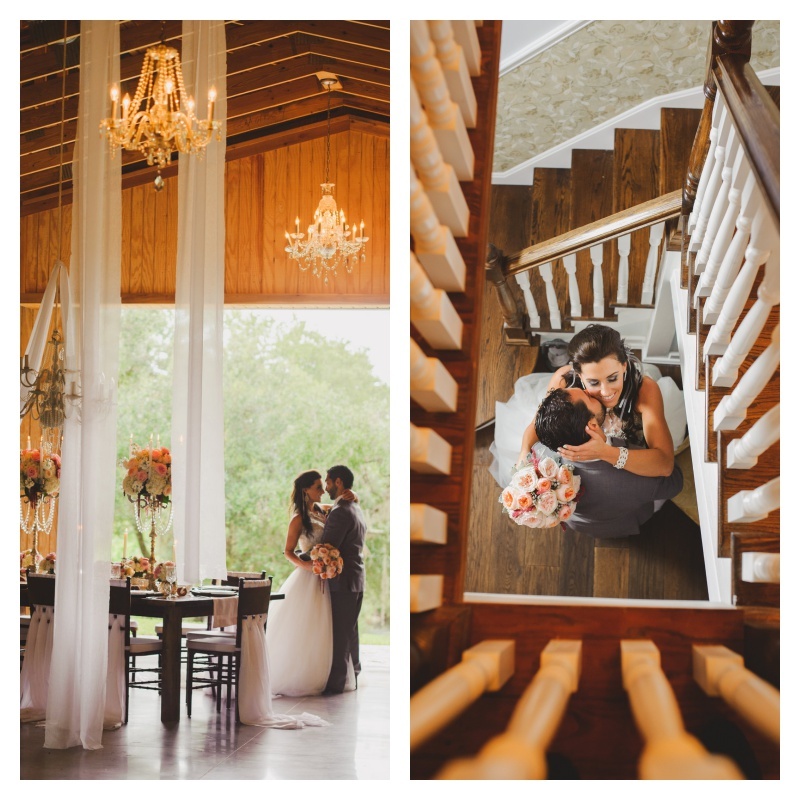 Moving inside, this venue offered us more than enough locations to evoke the mystery and beauty we were looking for, from the barn reception hall to the winding staircase. 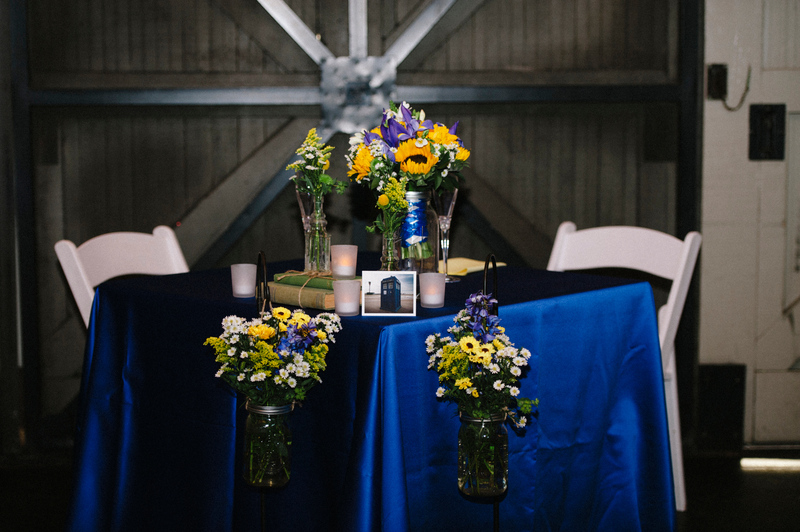 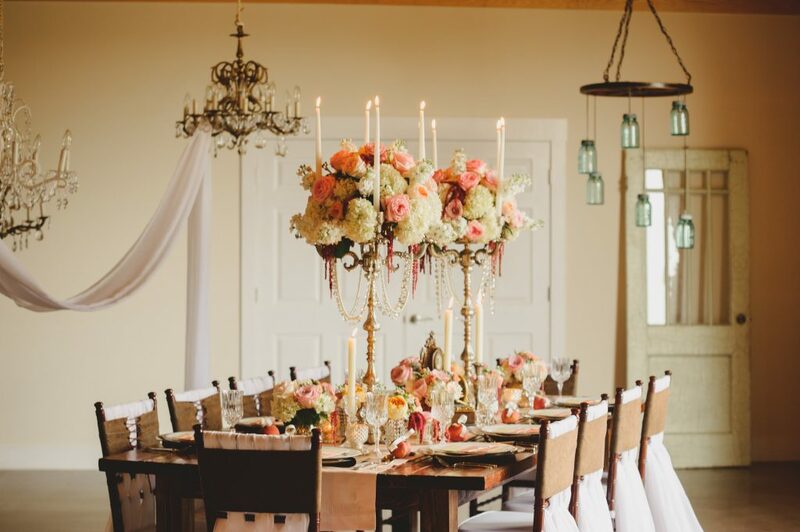 The interior of the barn was decked out in lavish decor, all influenced by moments from the film: the chairs, which were modeled after one of David Bowie’s many costumes; the table centerpieces; the chandeliers; and of course more gorgeous floral arrangements by Flowers by Lesley. 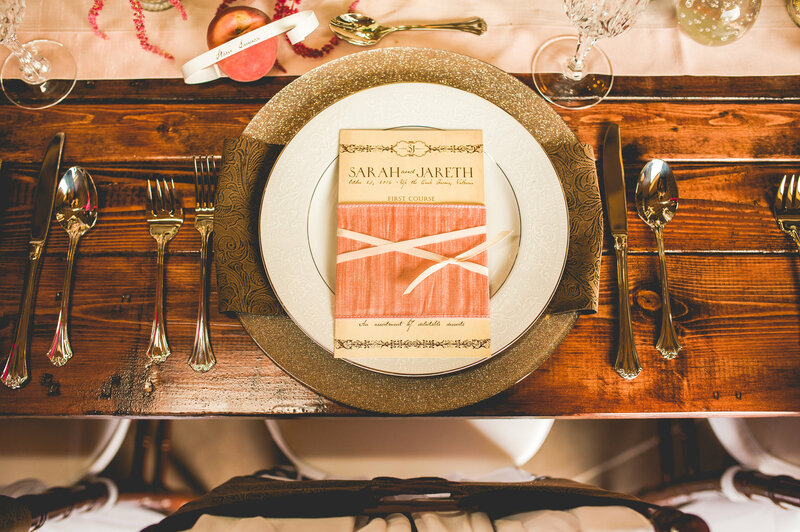 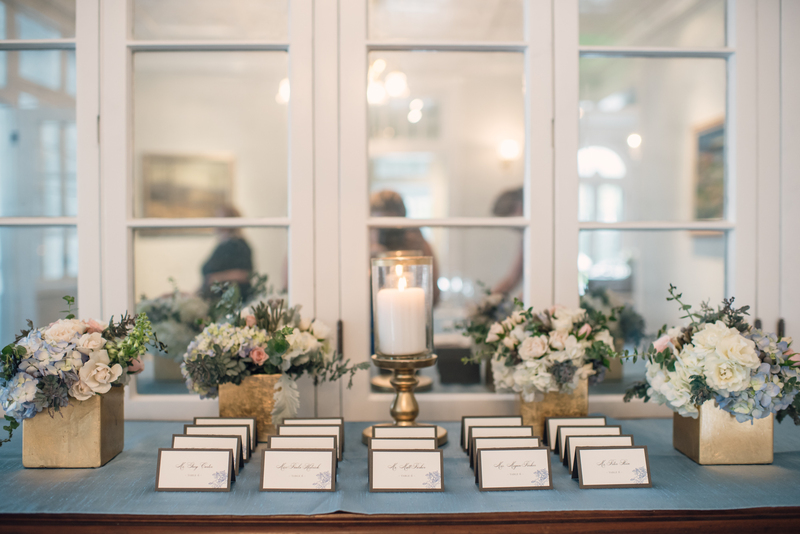 The rentals were provided by A Chair Affair, and the lovely paper goods, such as the menu, were created by Dogwood Blossom Stationary. 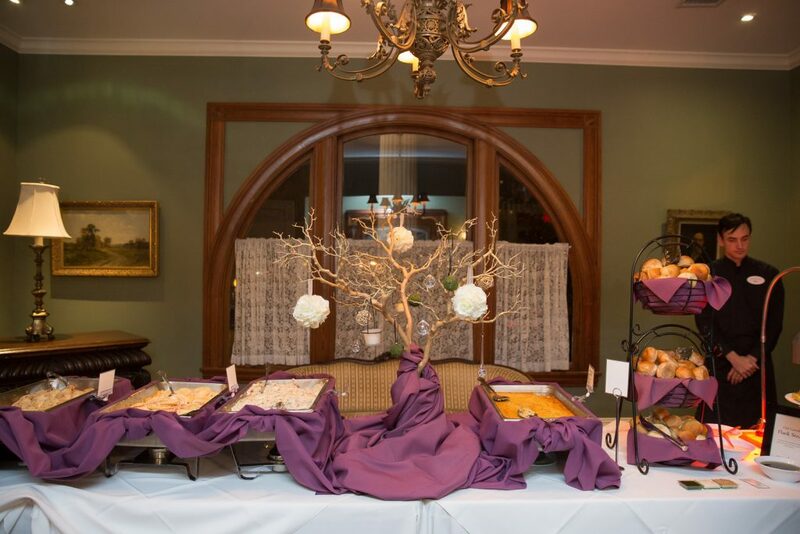 At last, the food! 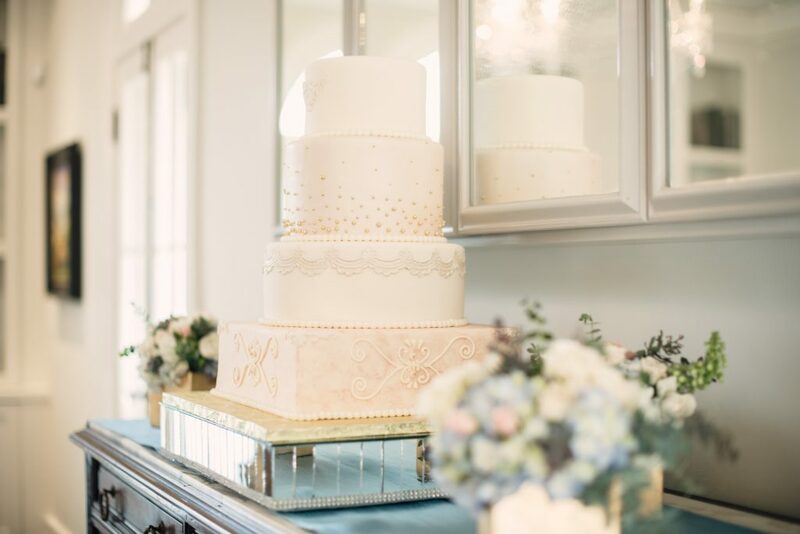 The amazing cake featuring delicate lace and handmade sugar flowers was made by Everything Cake, and the gorgeous array of desserts and snacks were prepared by Two Sweets Bake Shop. 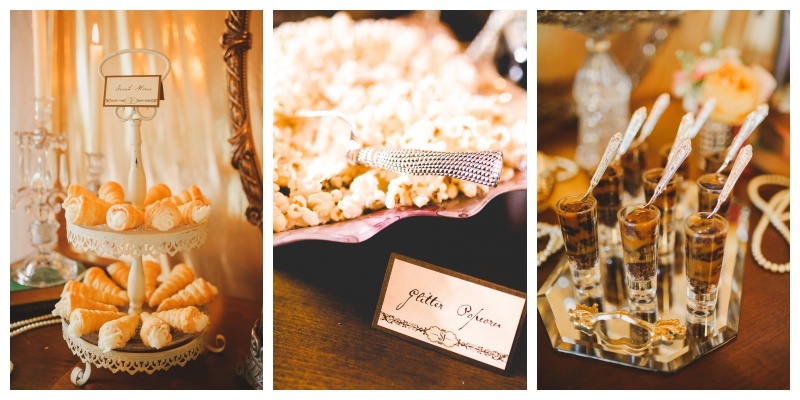 The variety included brownie pops, French horns, and glitter popcorn. 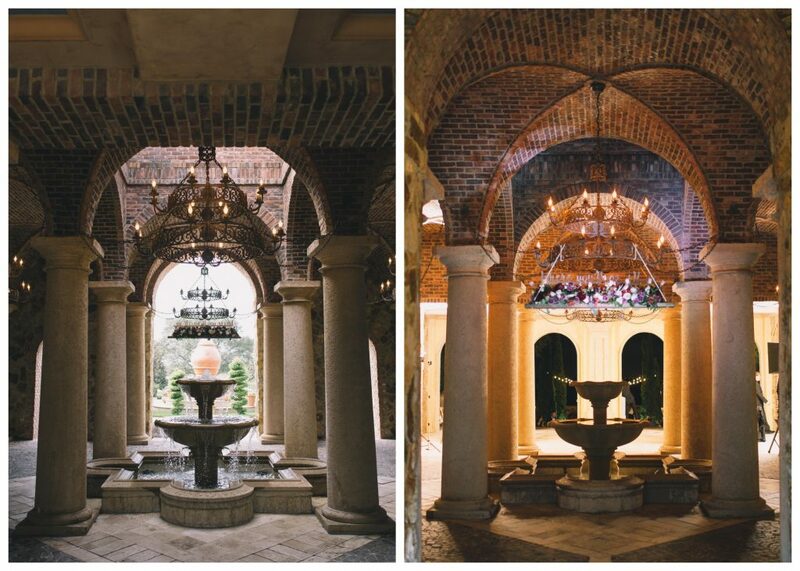 Each detailed accent added to the stunning appearance of this photo shoot, and we were delighted to be a part of it. Much thanks to the venue and all the vendors below for making this day possible!